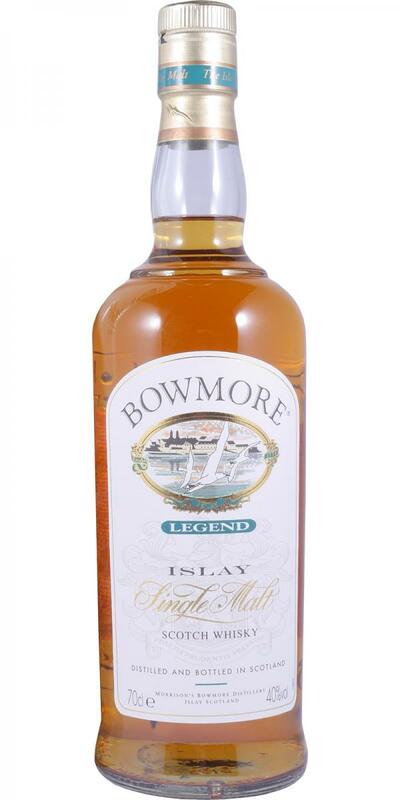 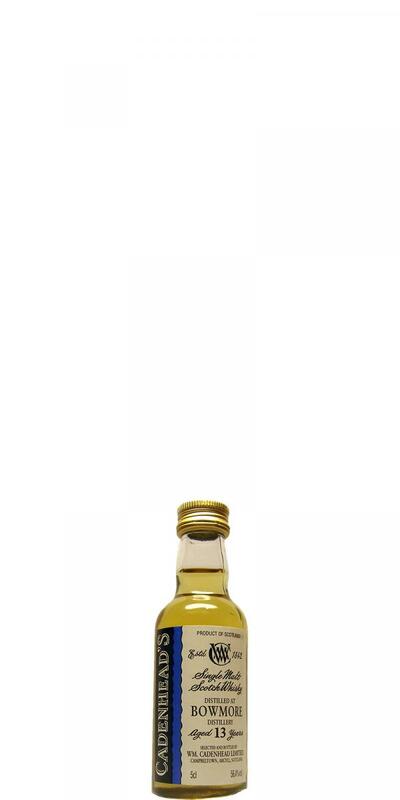 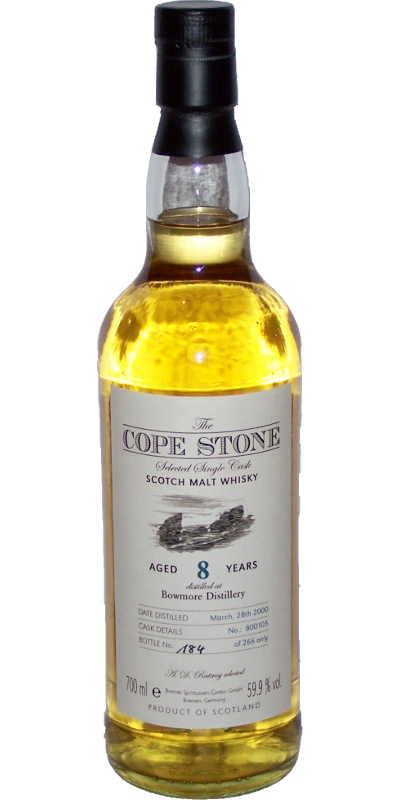 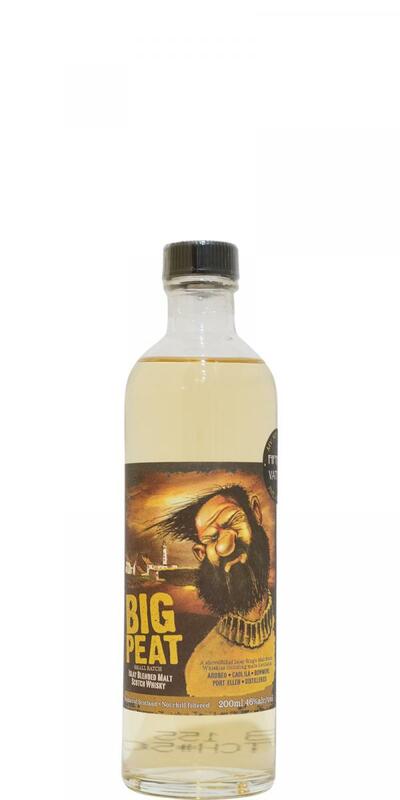 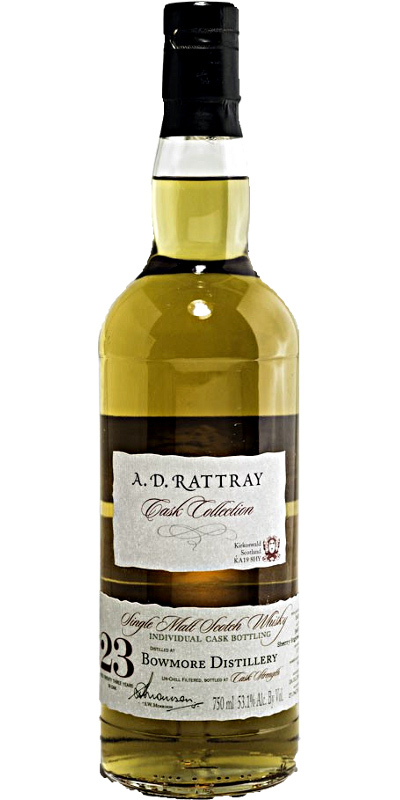 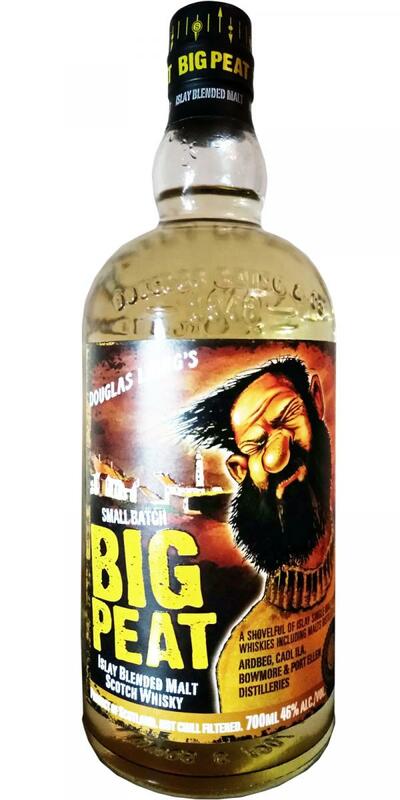 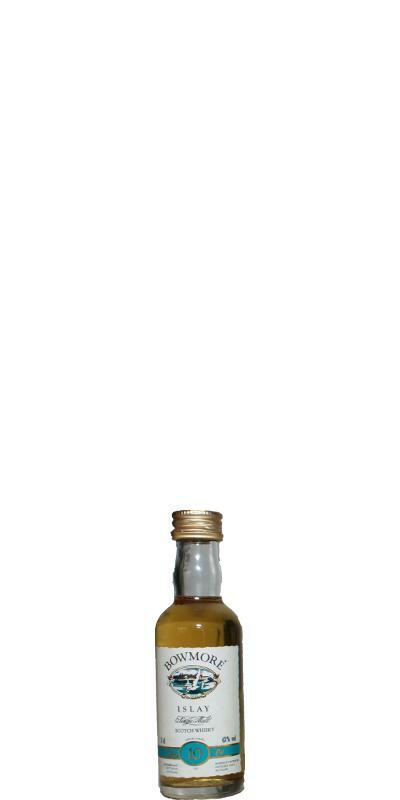 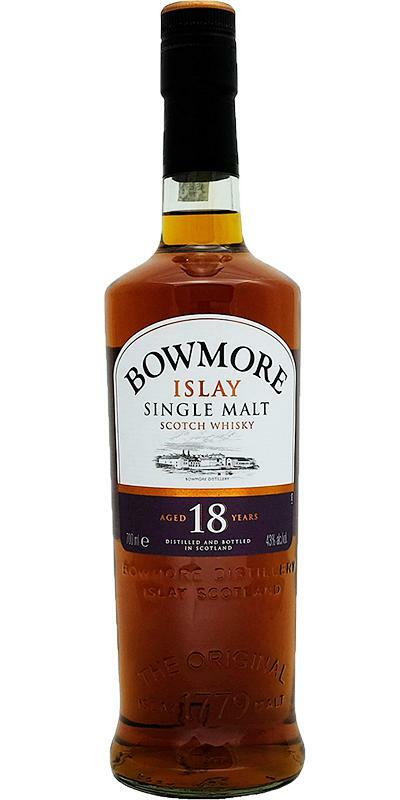 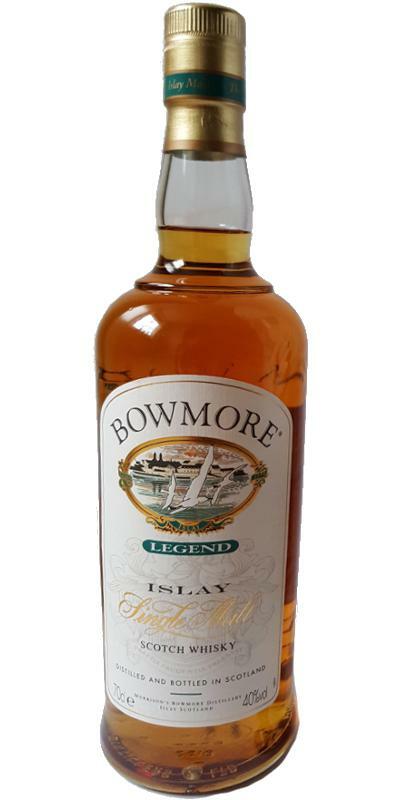 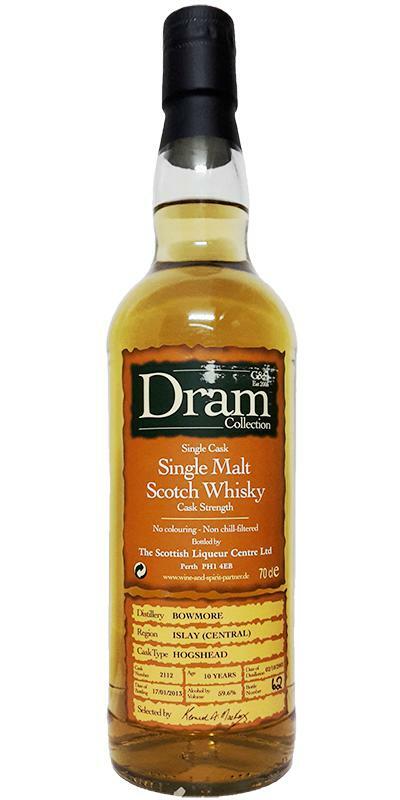 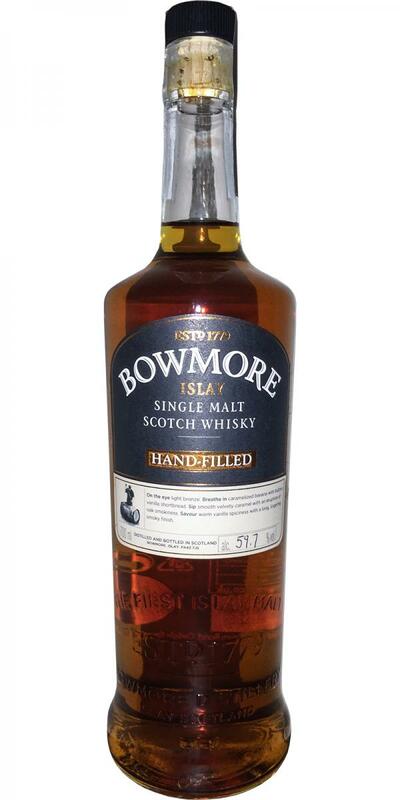 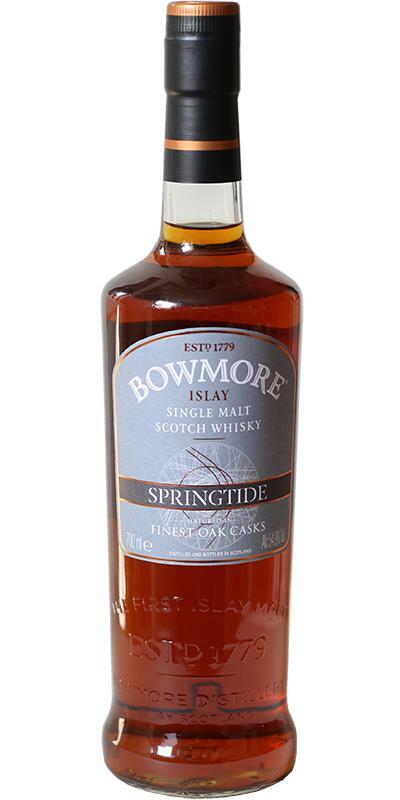 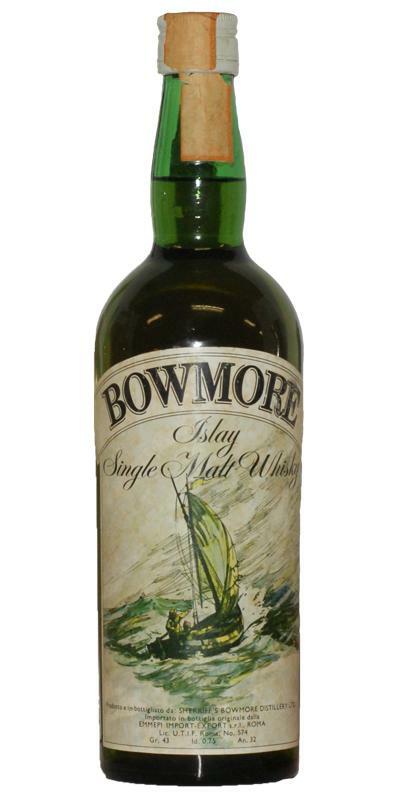 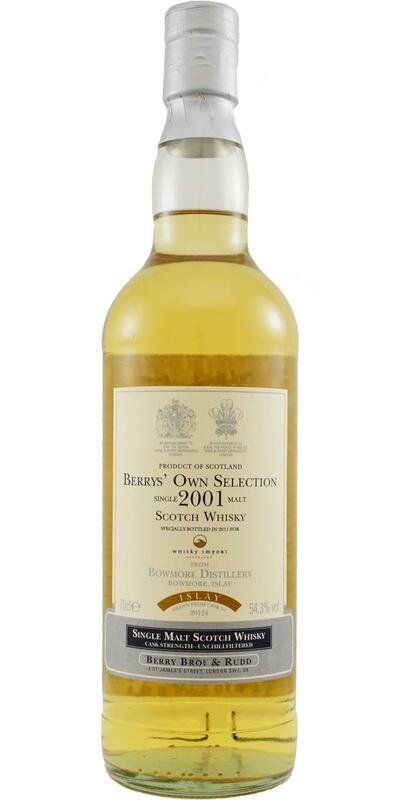 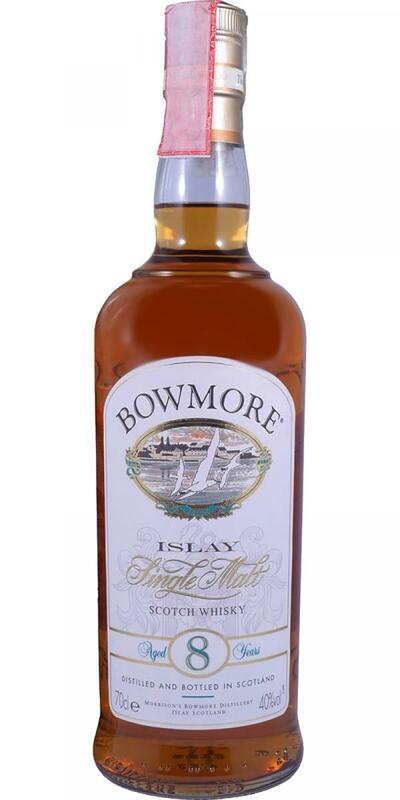 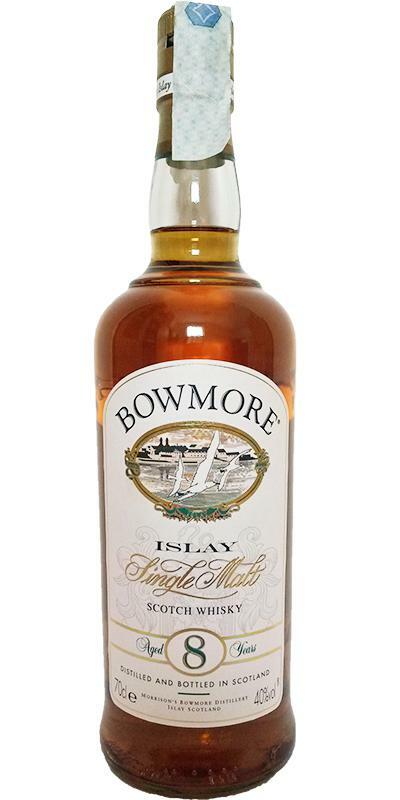 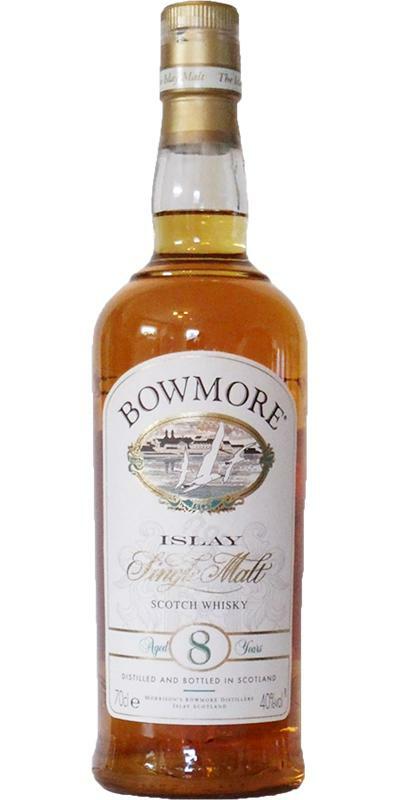 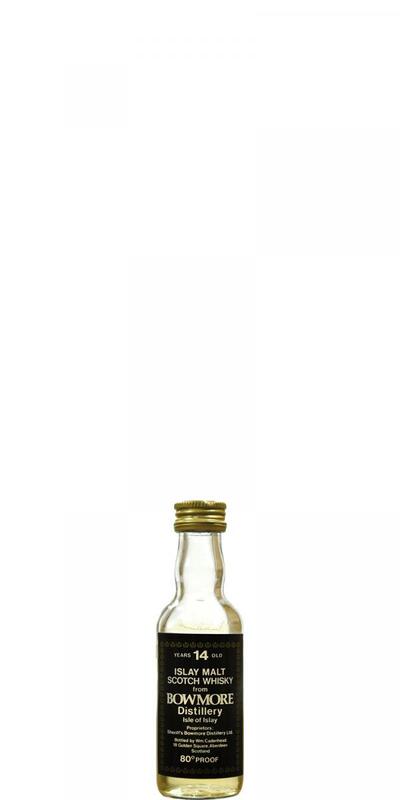 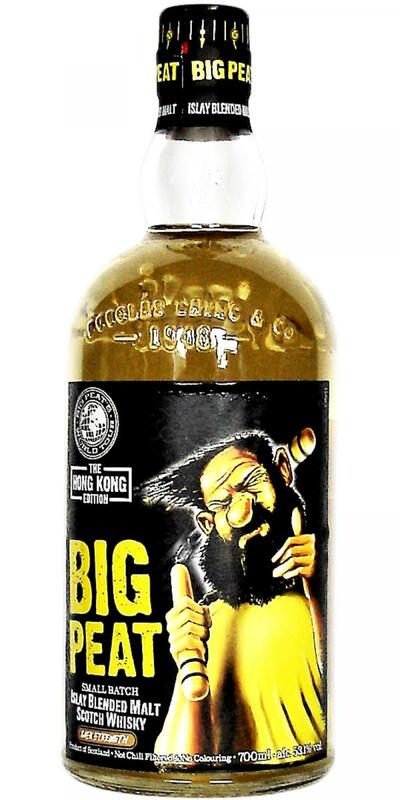 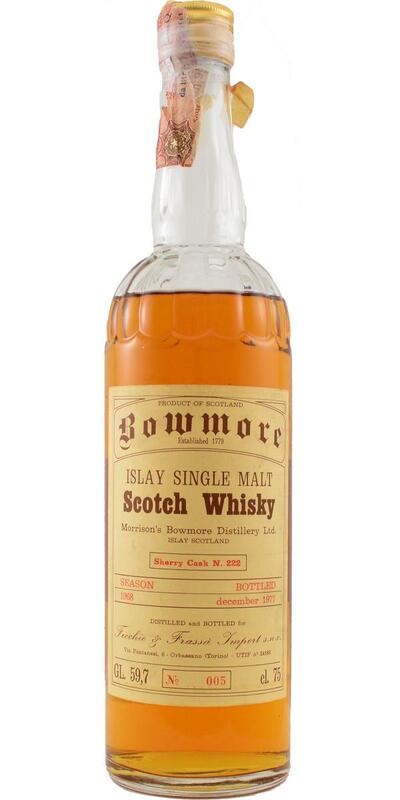 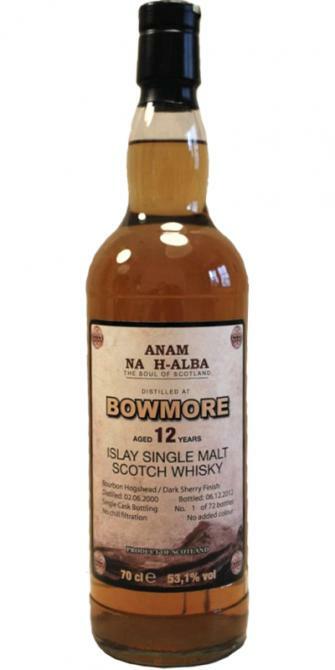 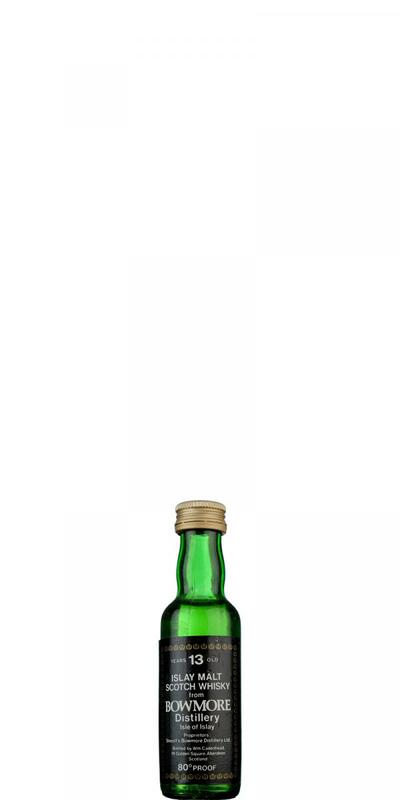 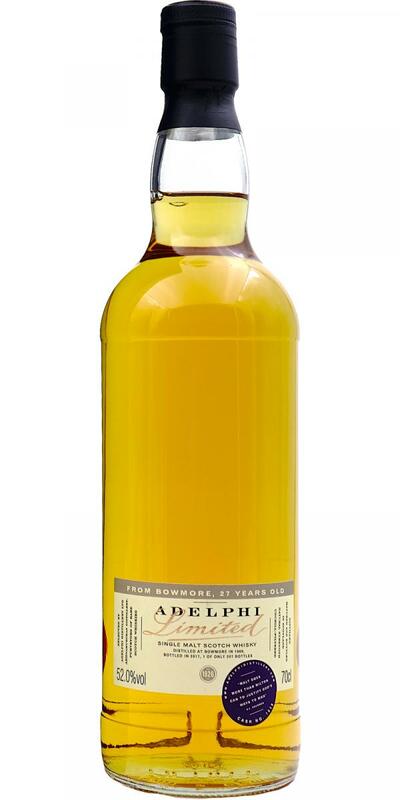 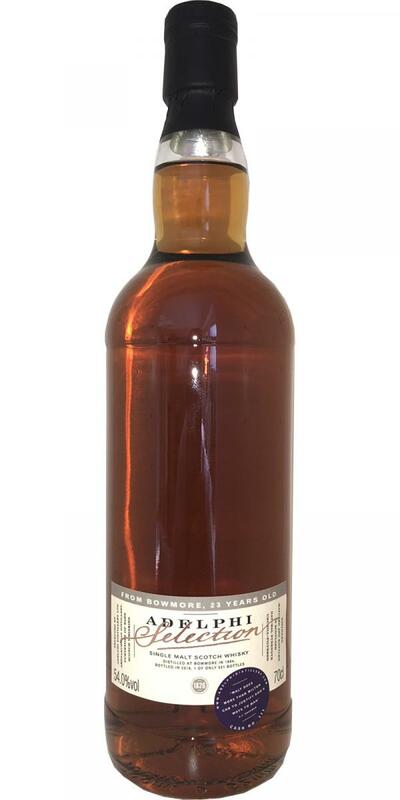 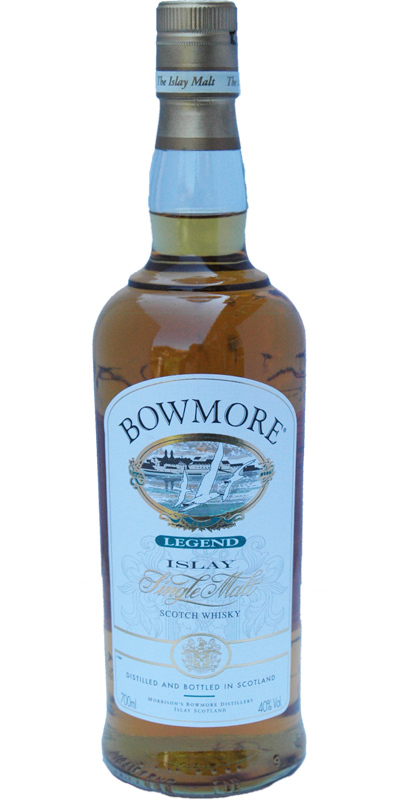 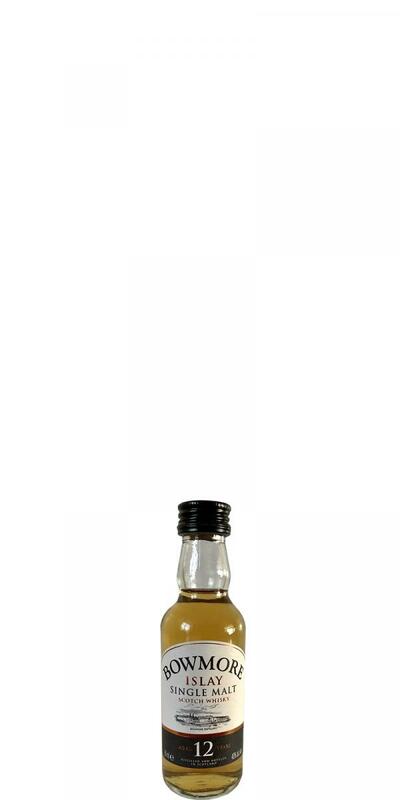 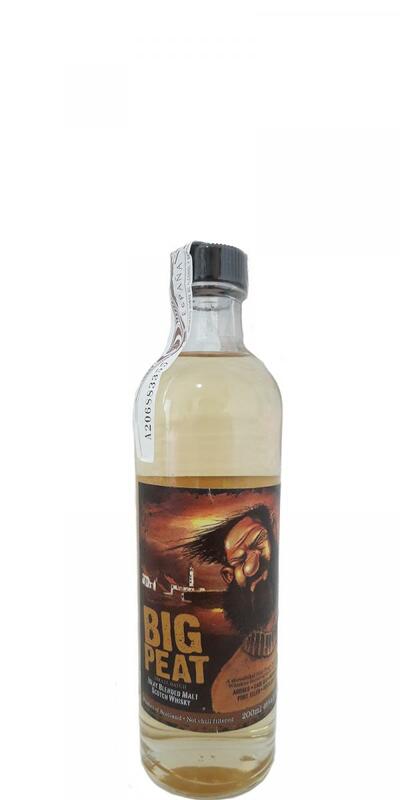 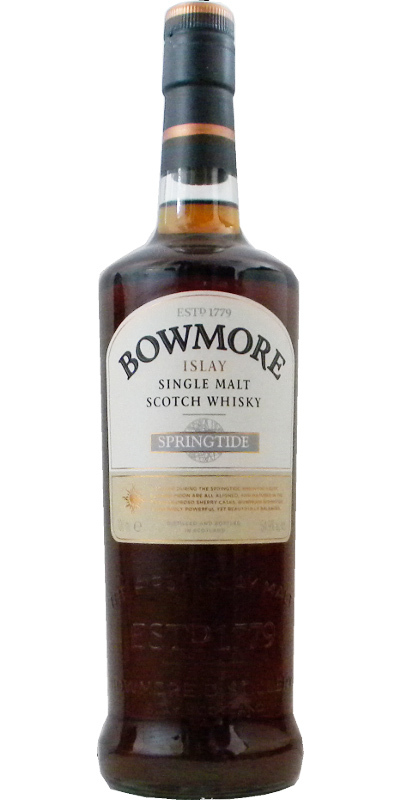 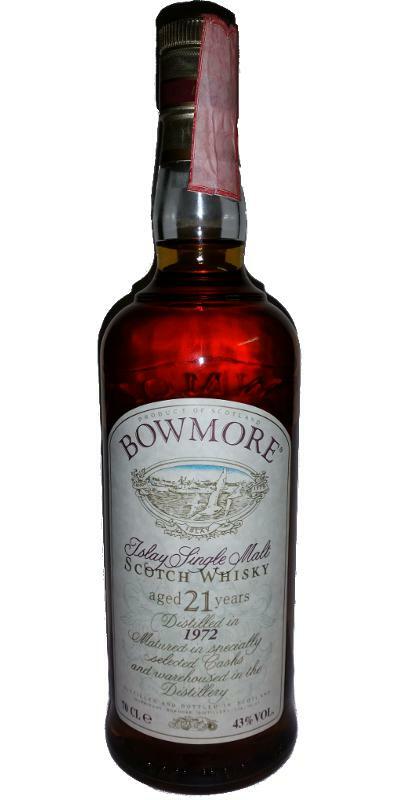 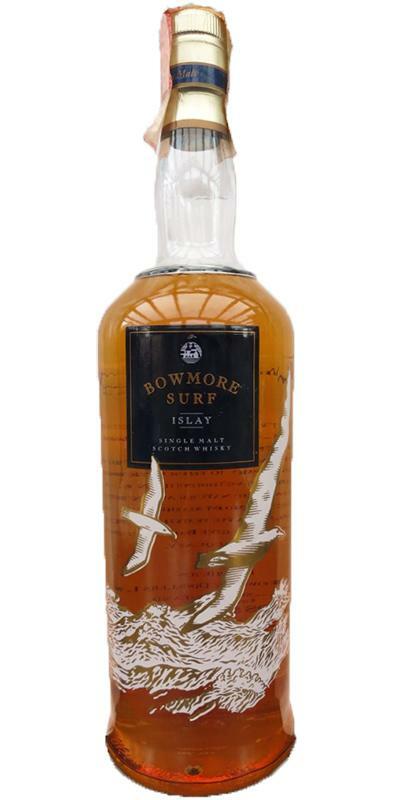 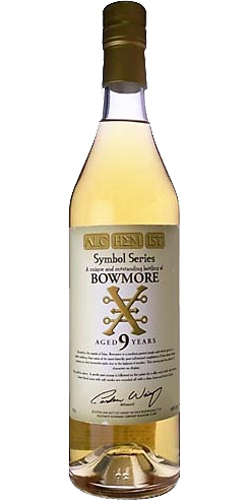 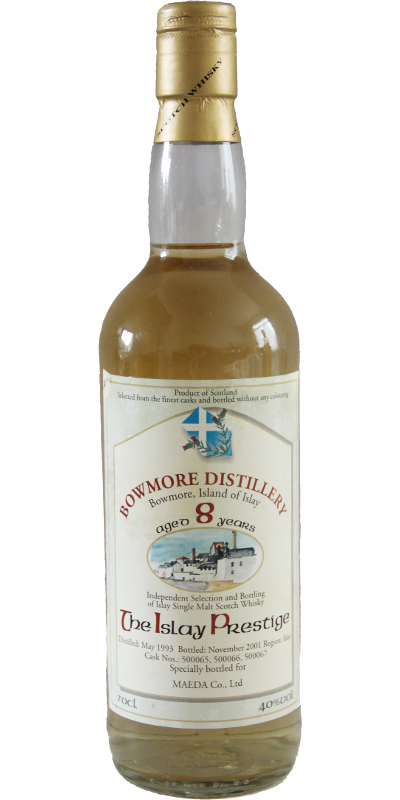 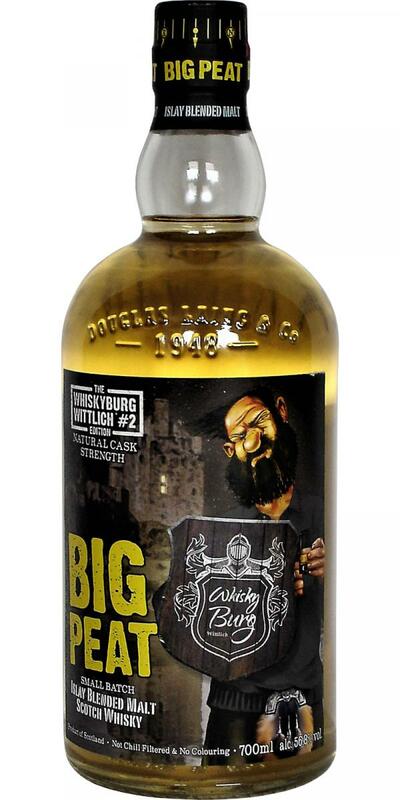 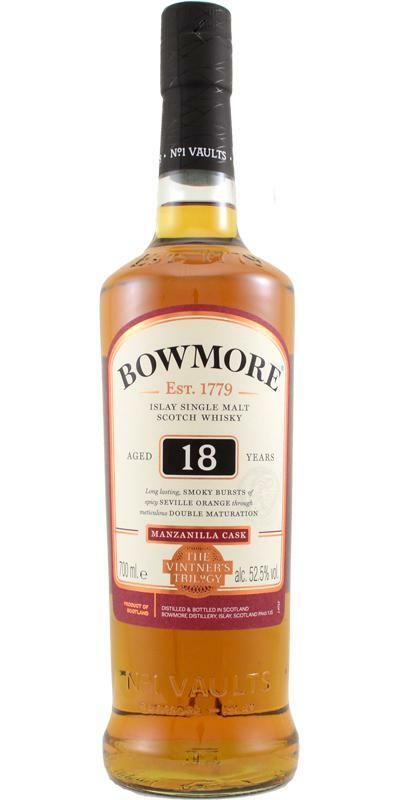 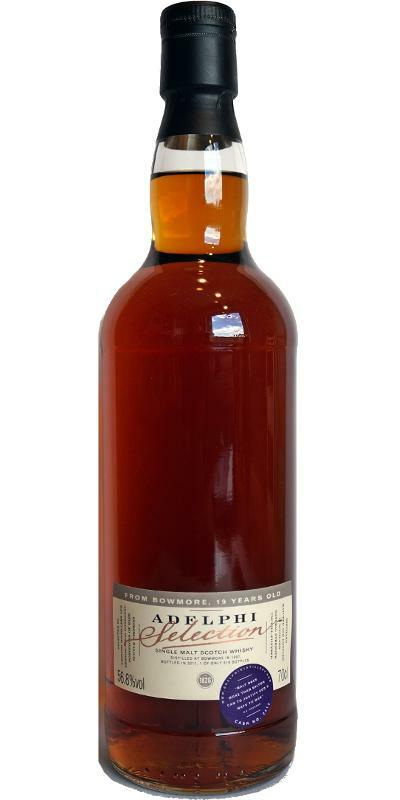 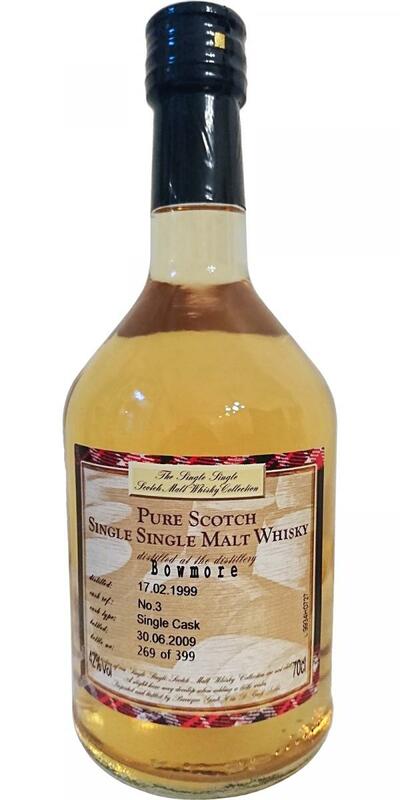 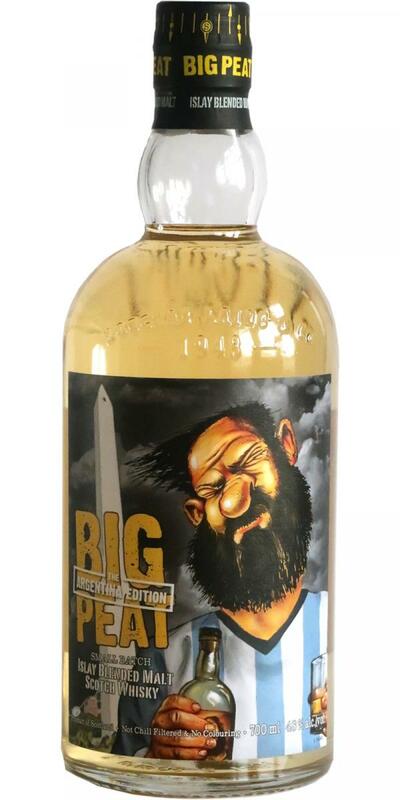 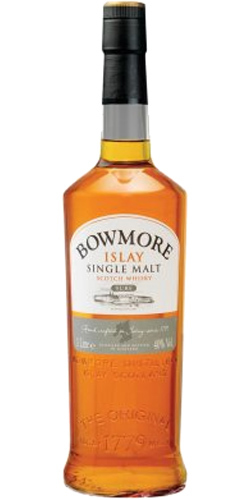 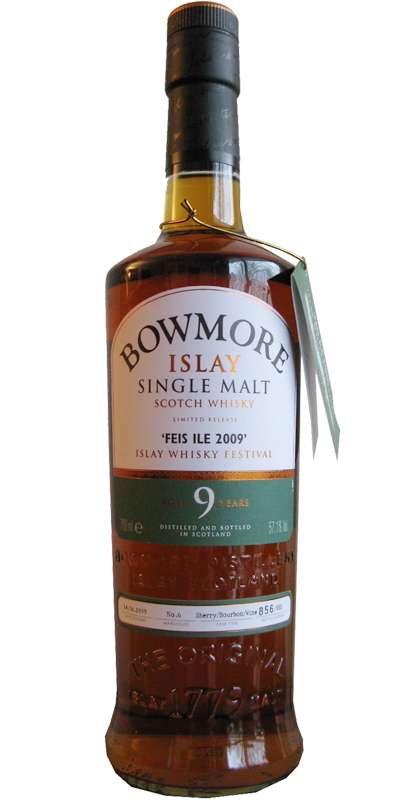 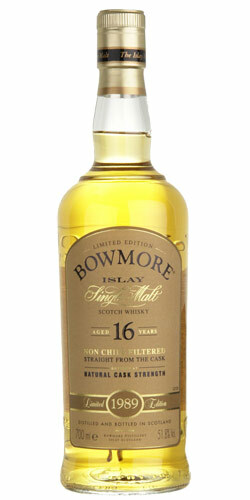 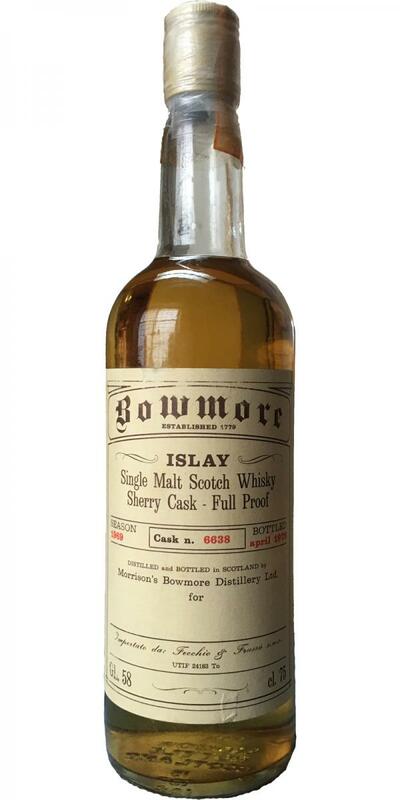 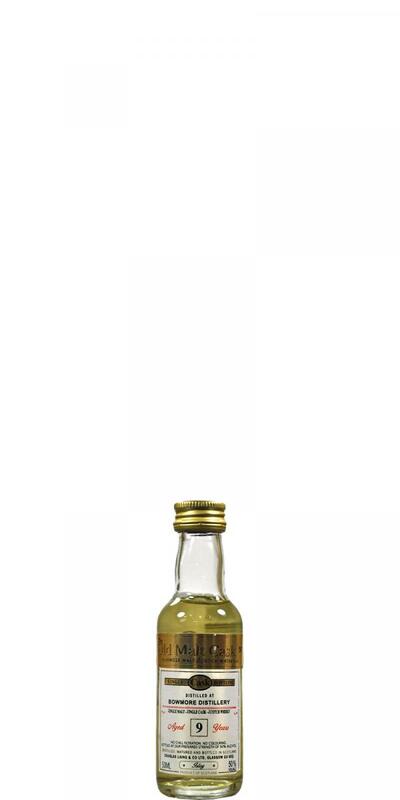 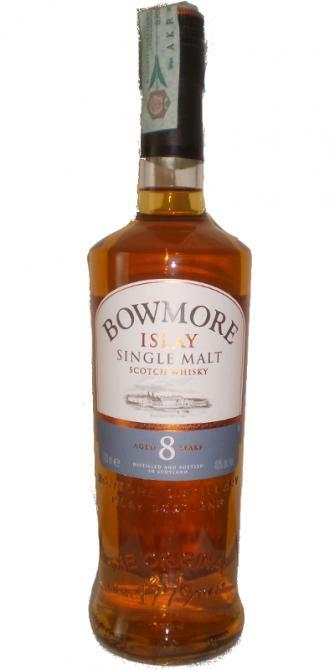 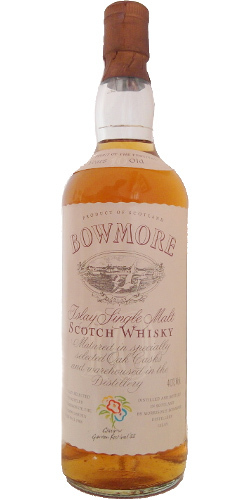 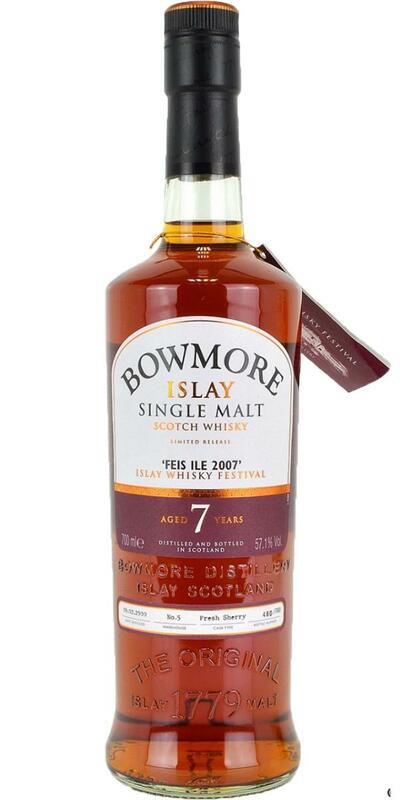 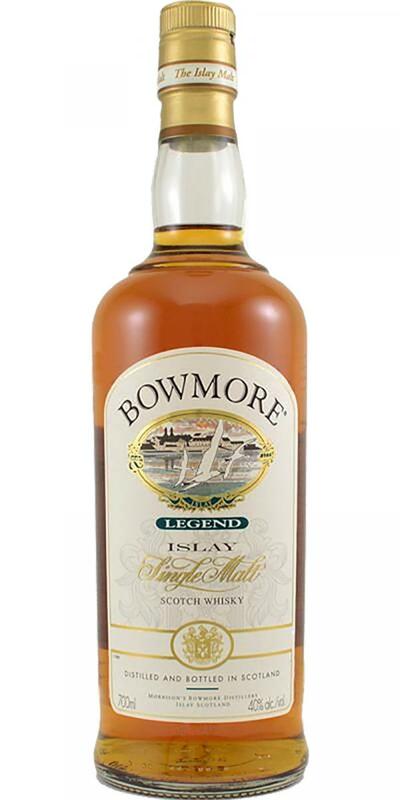 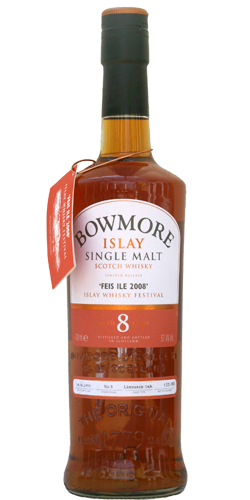 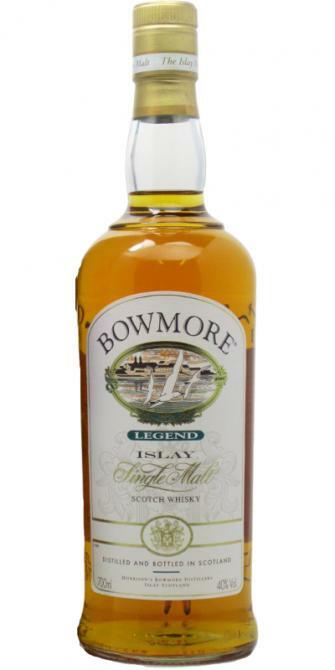 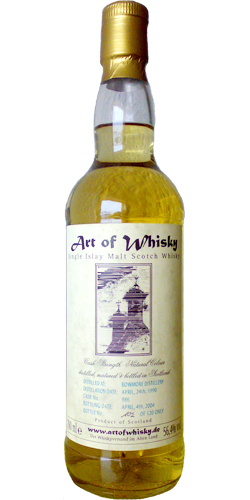 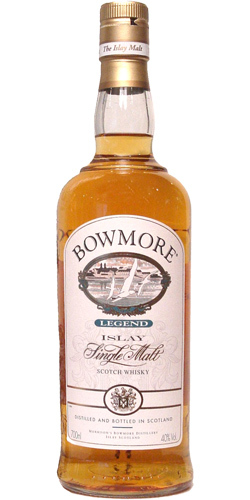 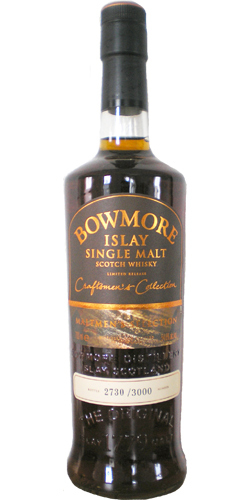 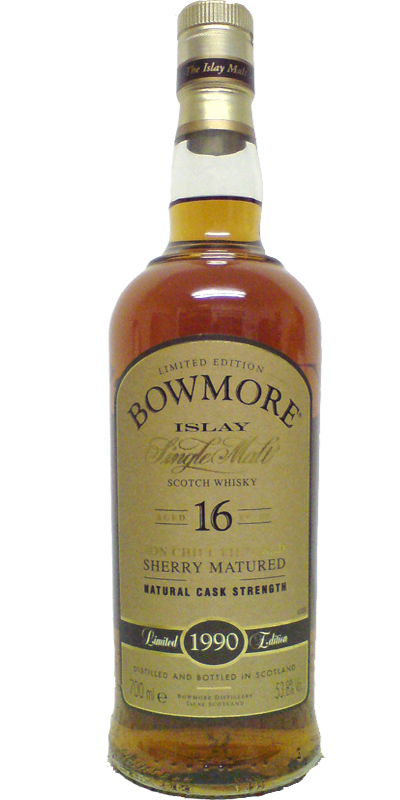 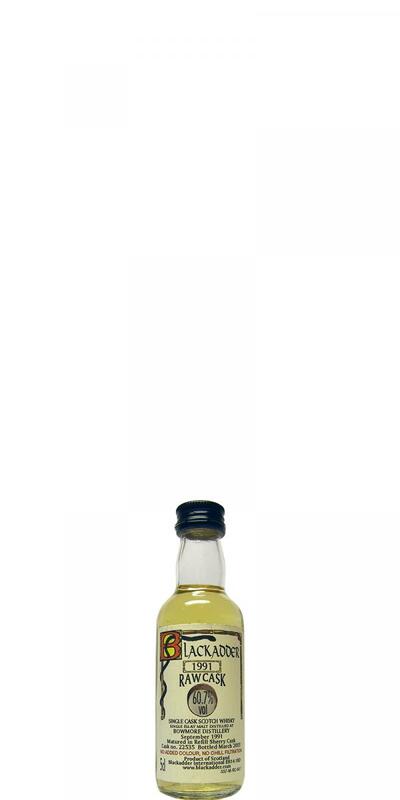 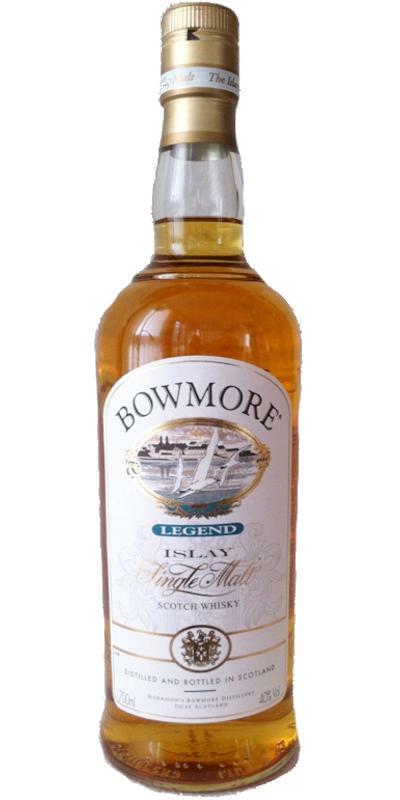 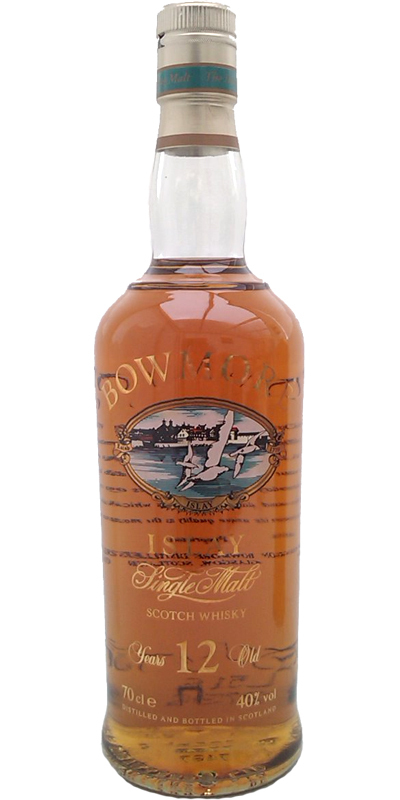 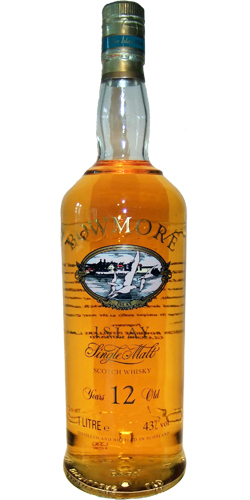 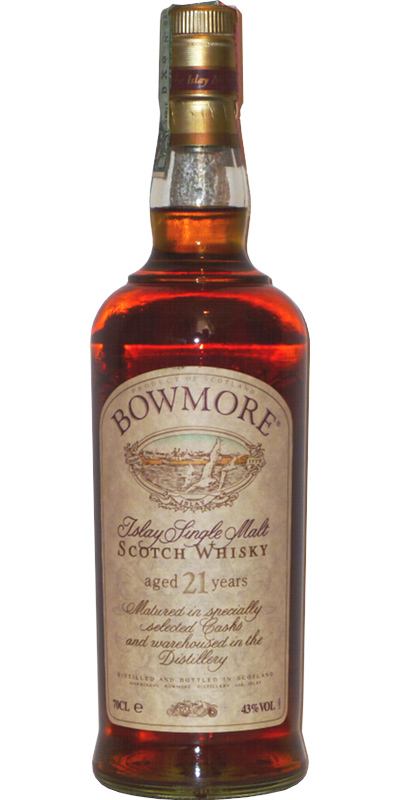 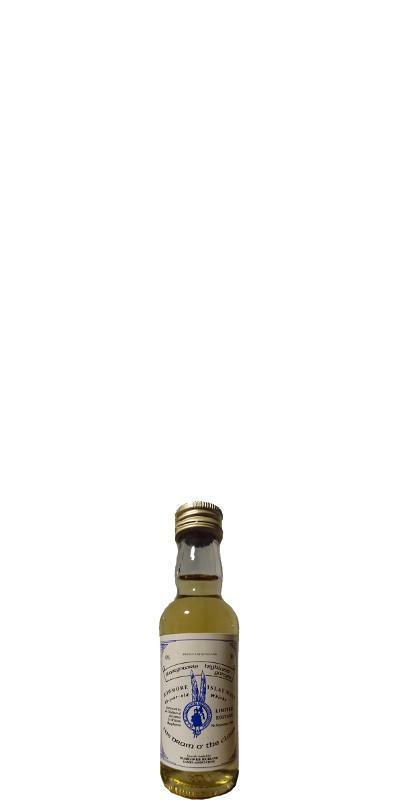 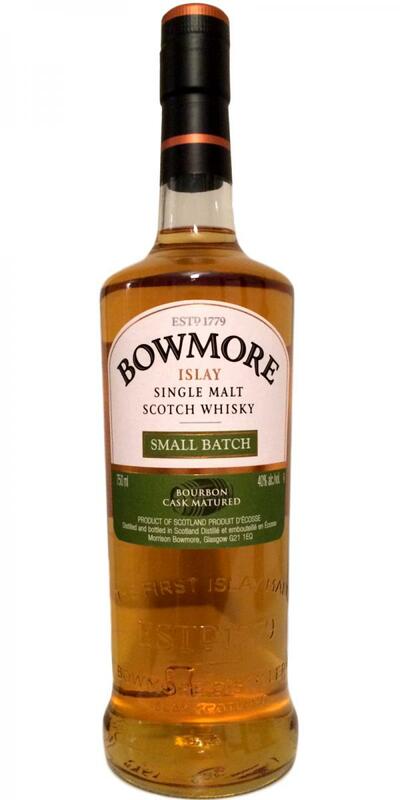 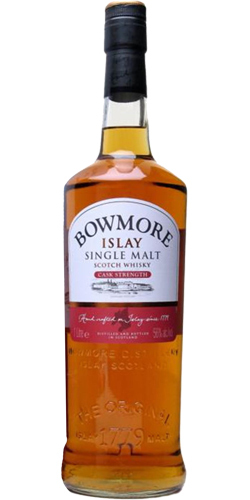 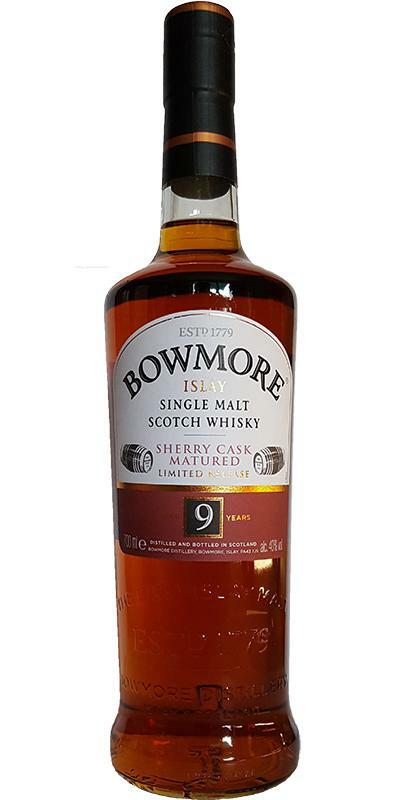 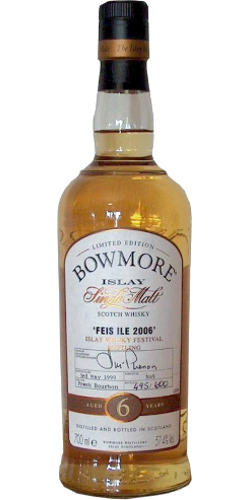 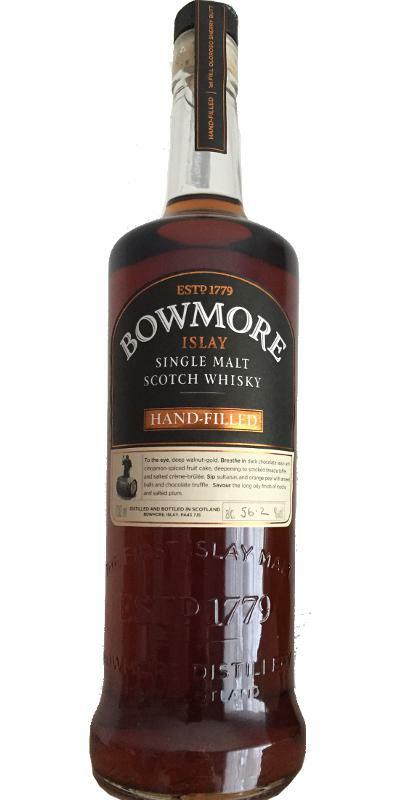 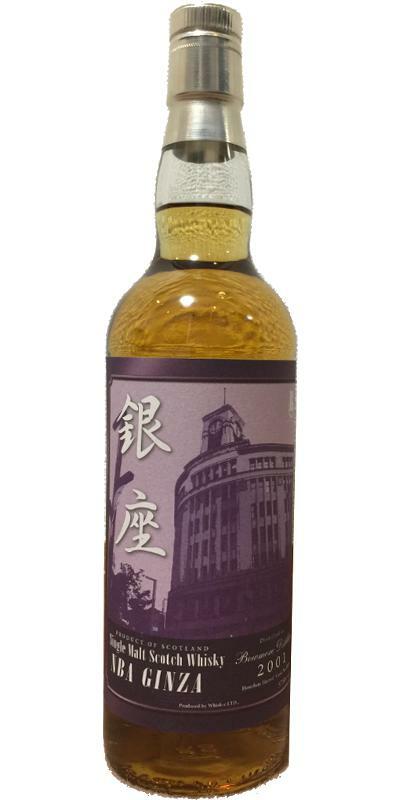 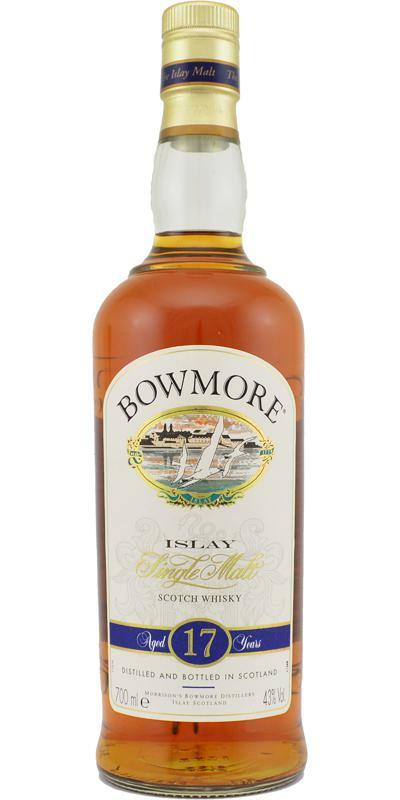 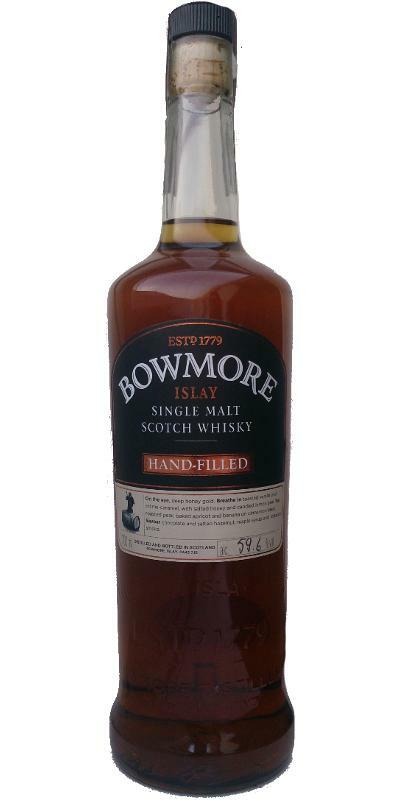 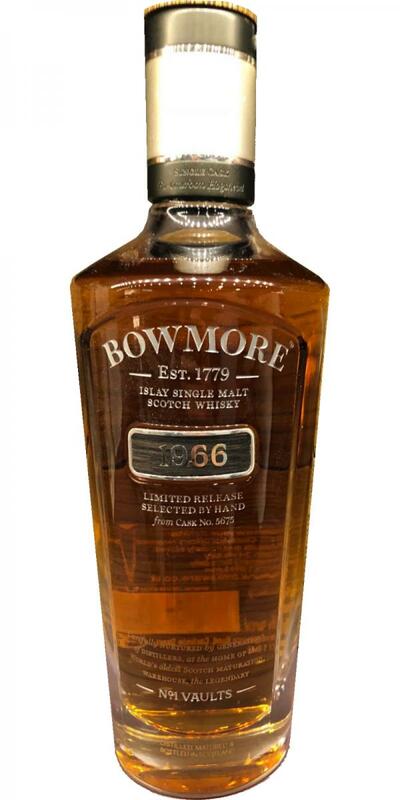 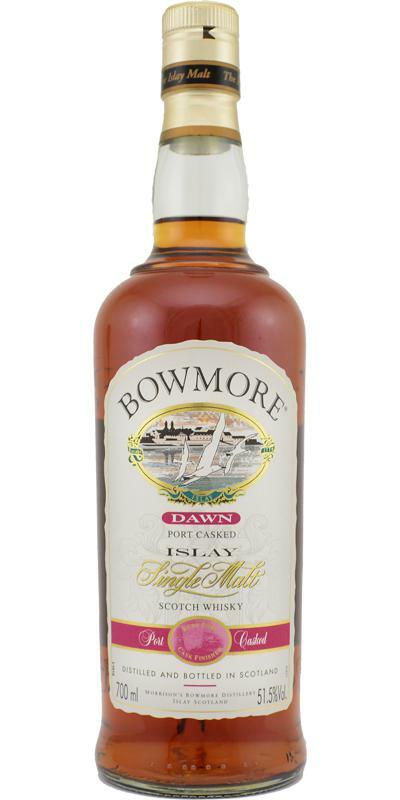 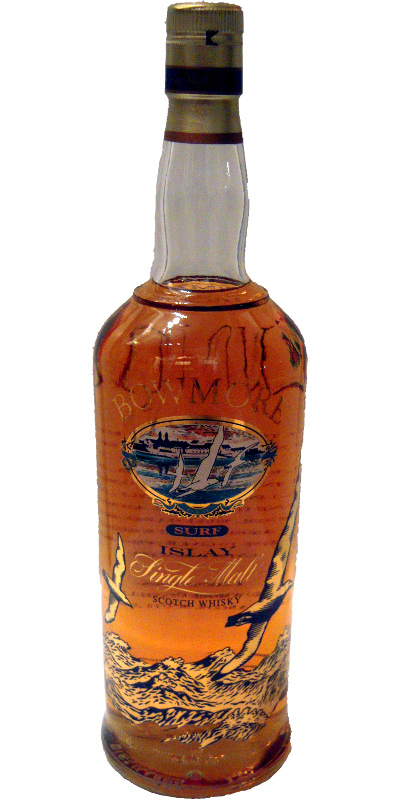 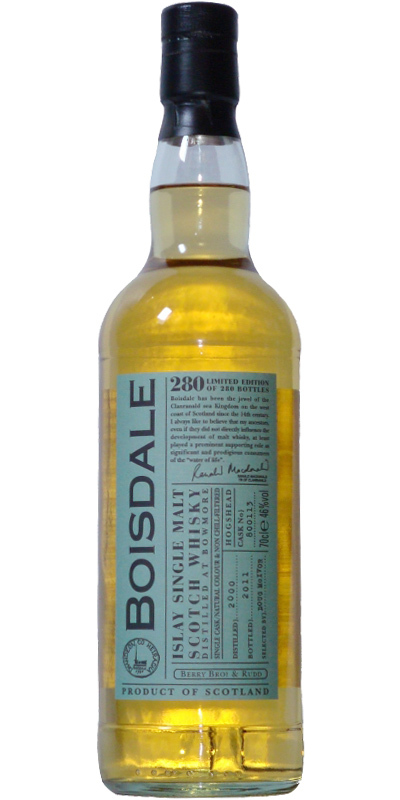 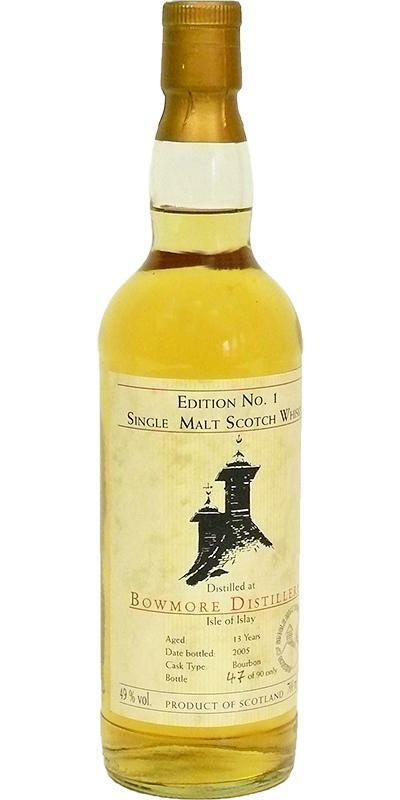 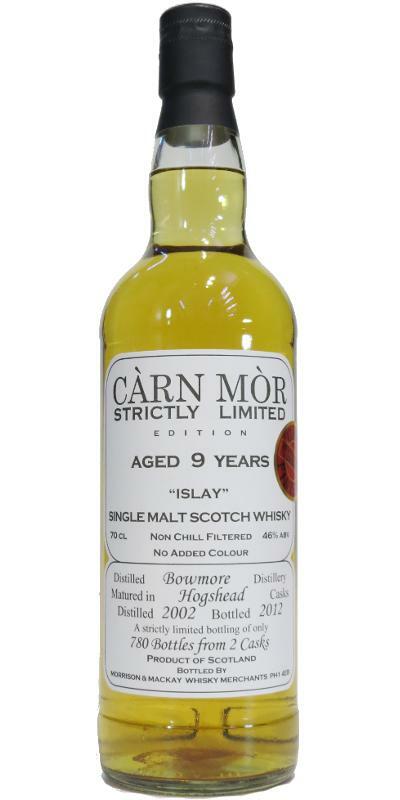 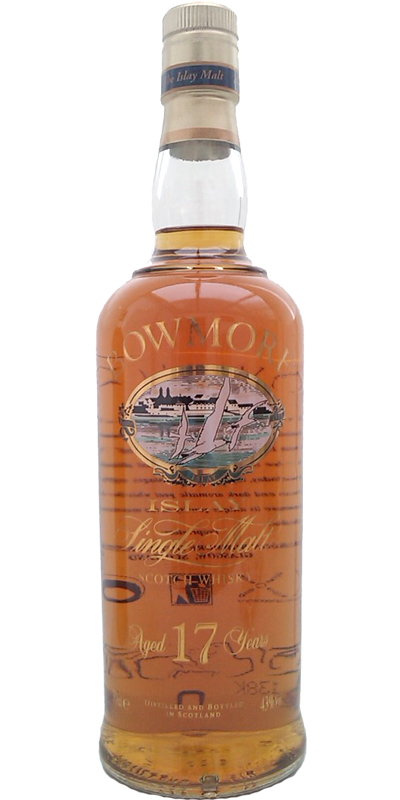 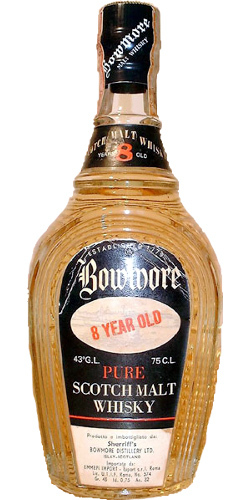 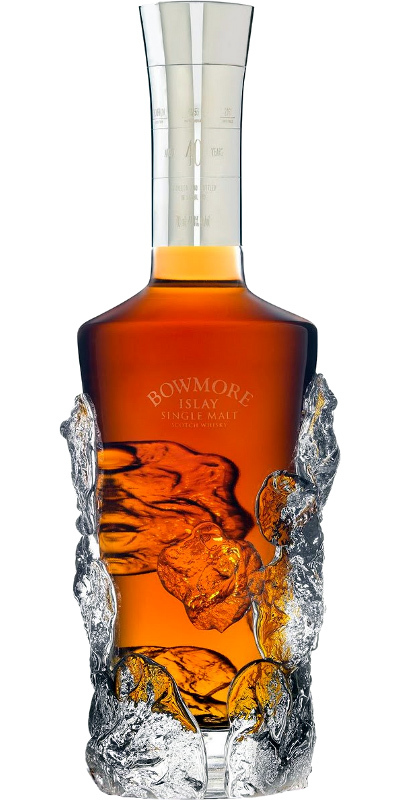 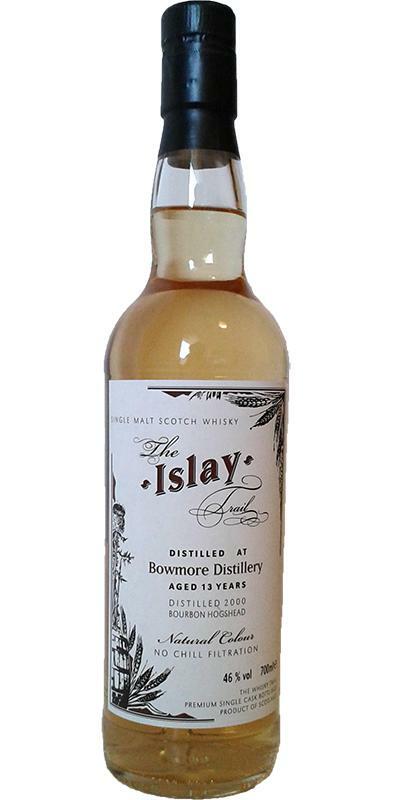 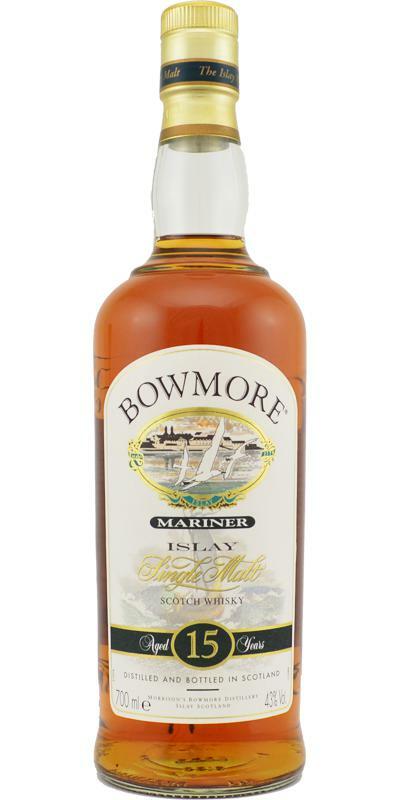 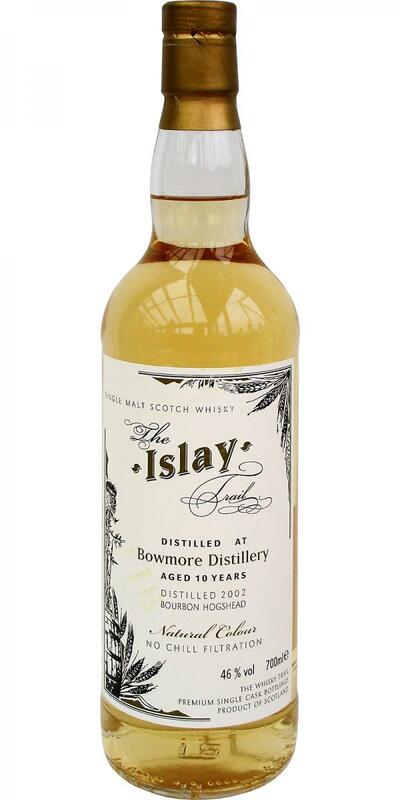 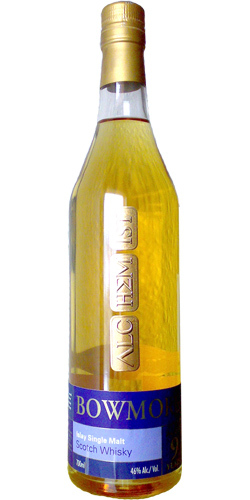 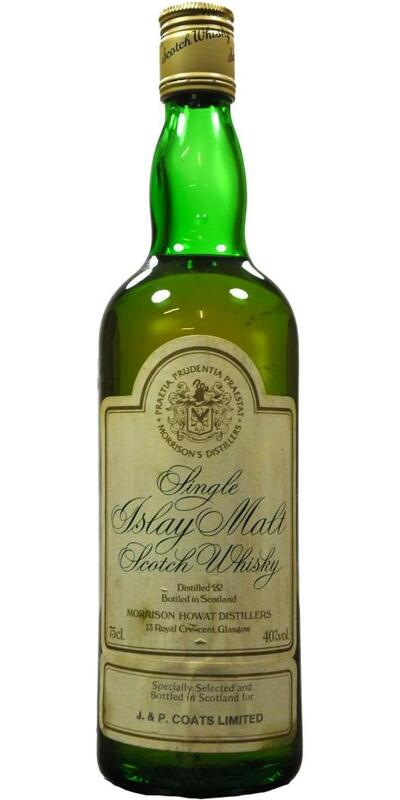 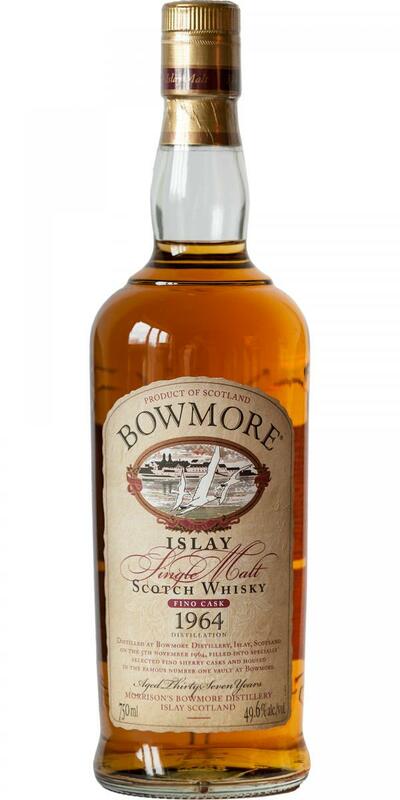 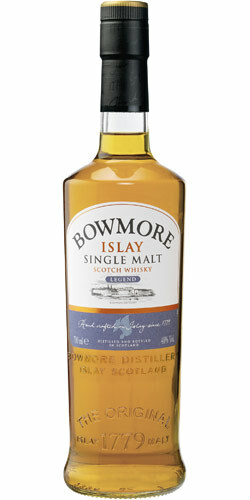 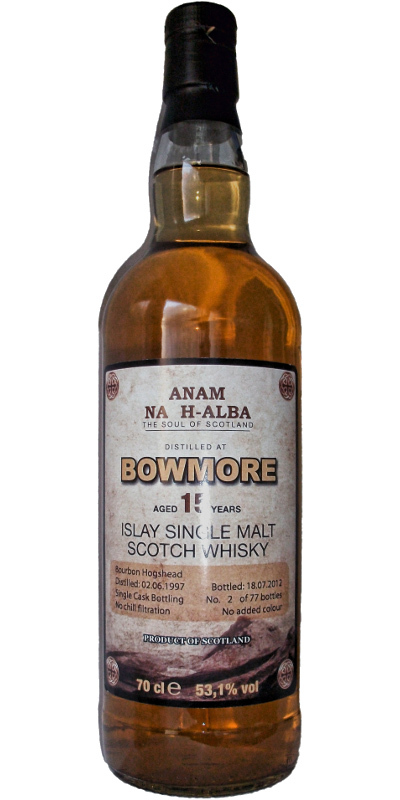 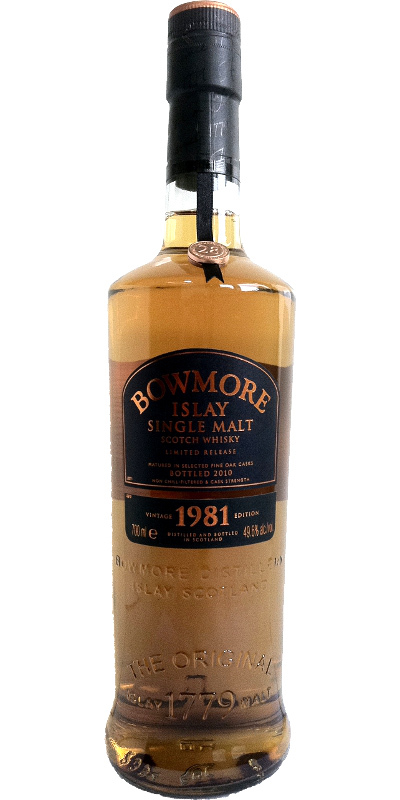 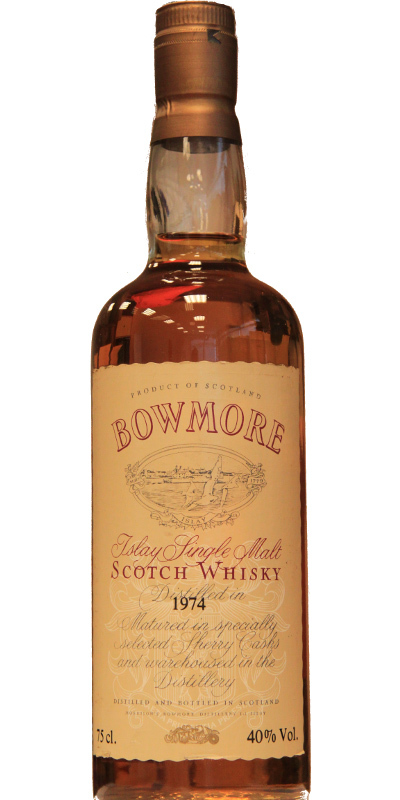 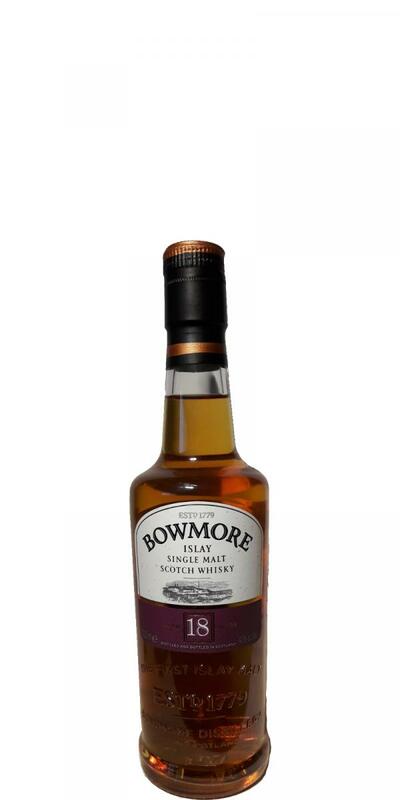 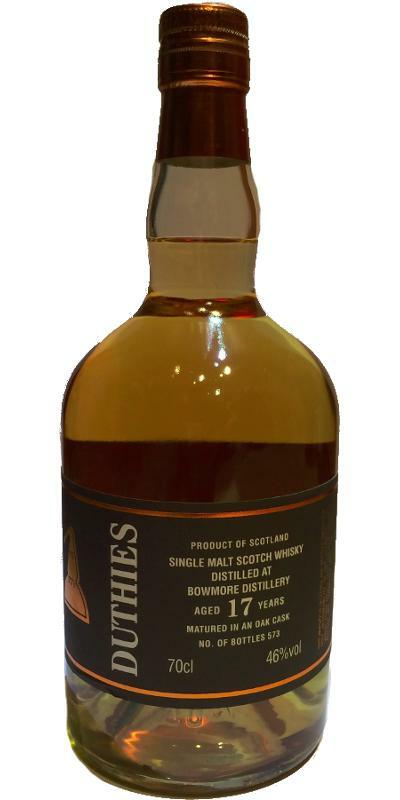 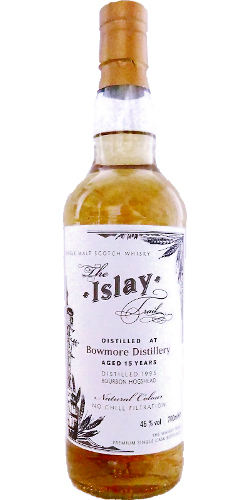 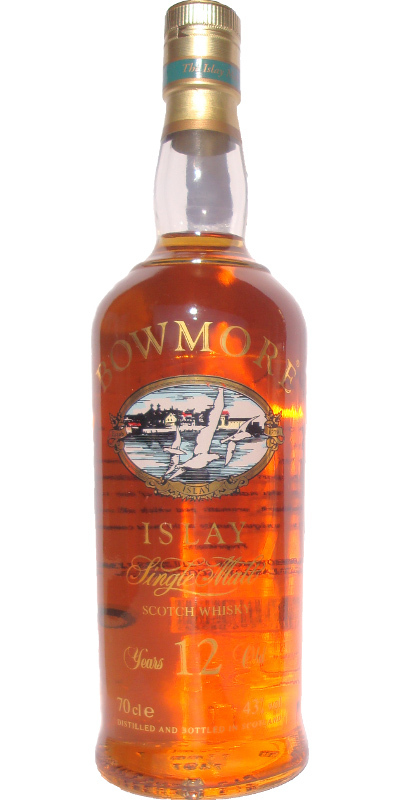 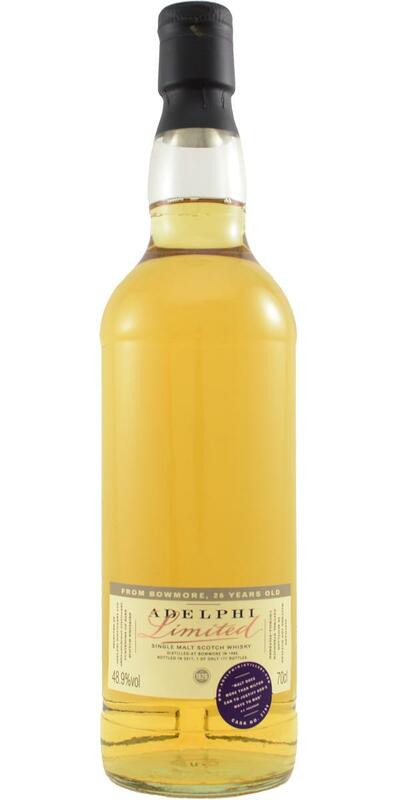 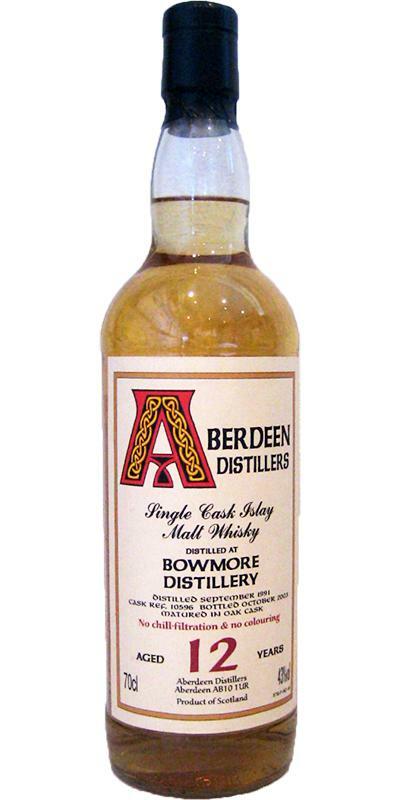 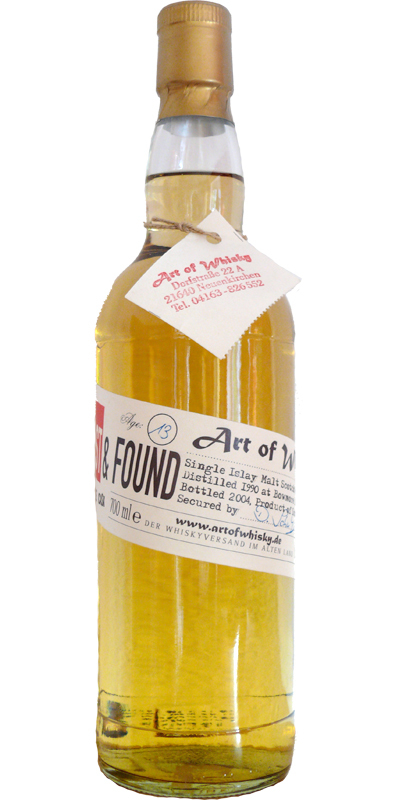 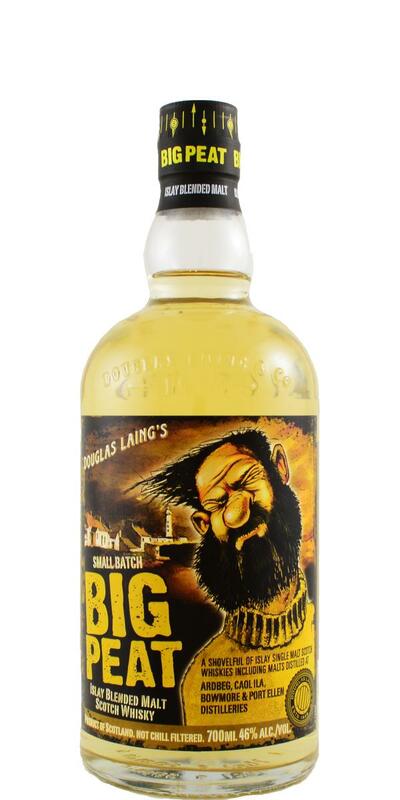 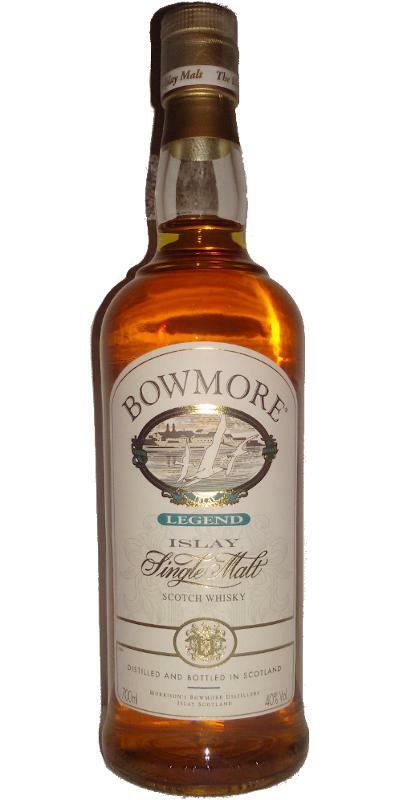 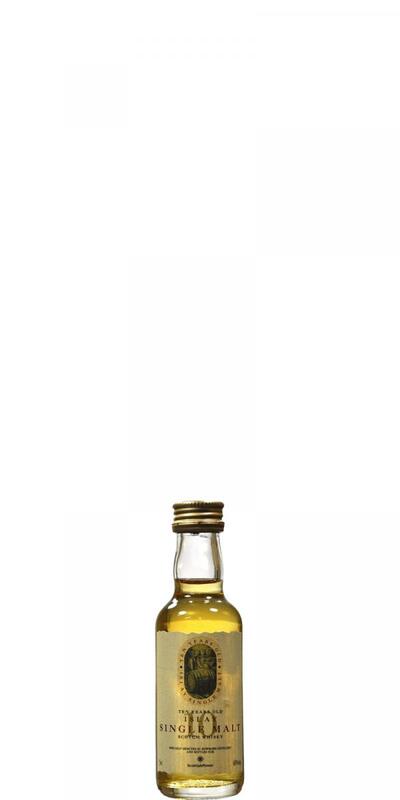 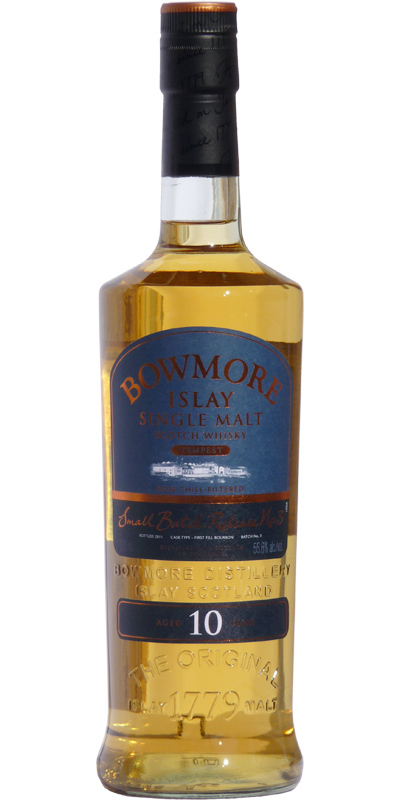 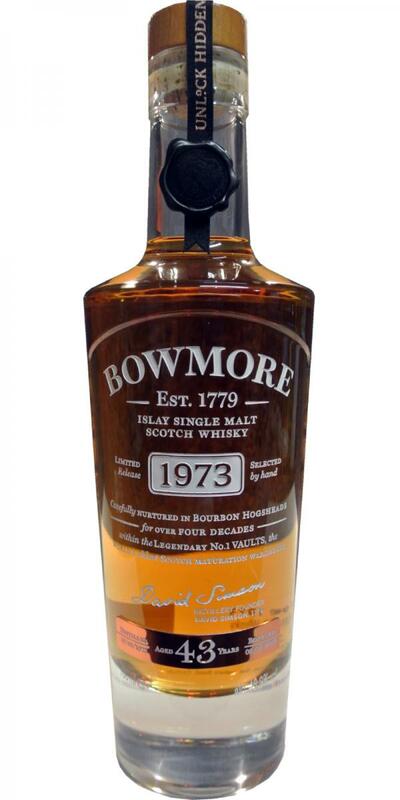 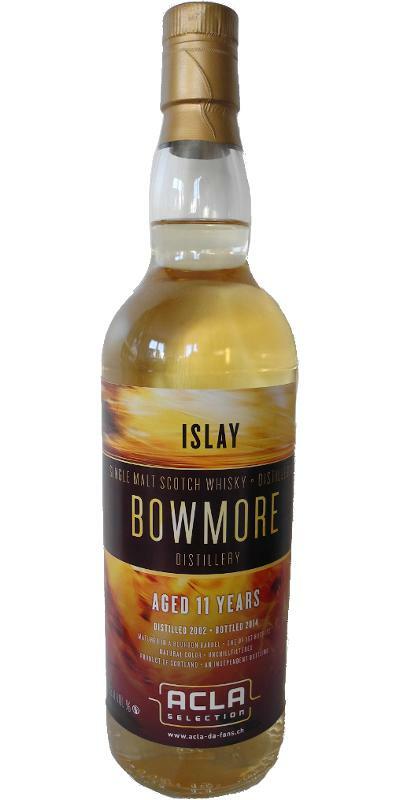 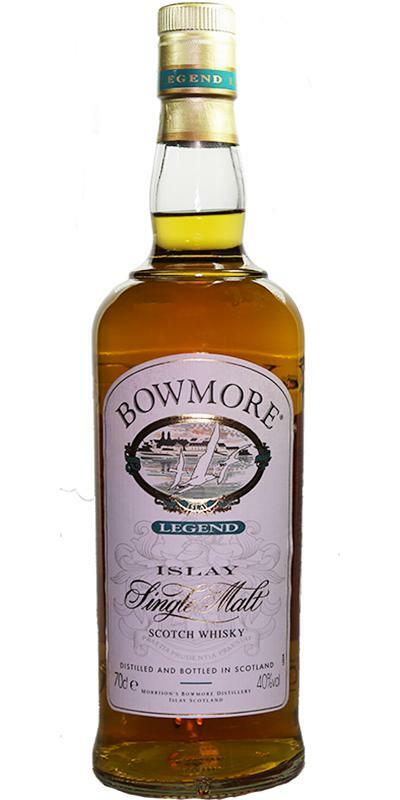 Bowmore 08-year-old Islay Single Malt Scotch Whisky 08 46.0 % Vol. 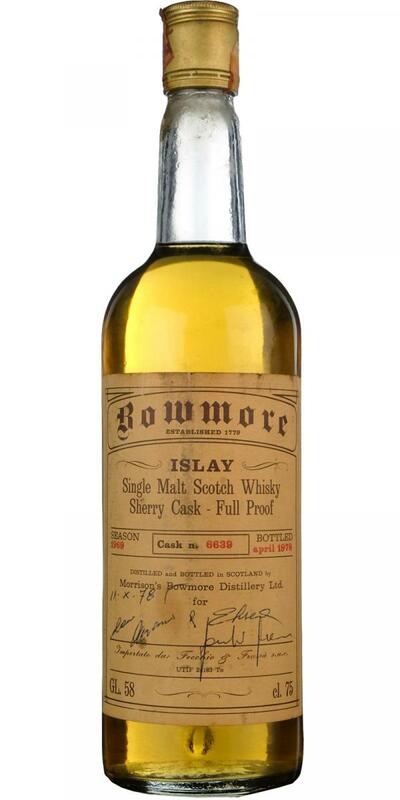 Bowmore 10-year-old 10 43.0 % Vol. 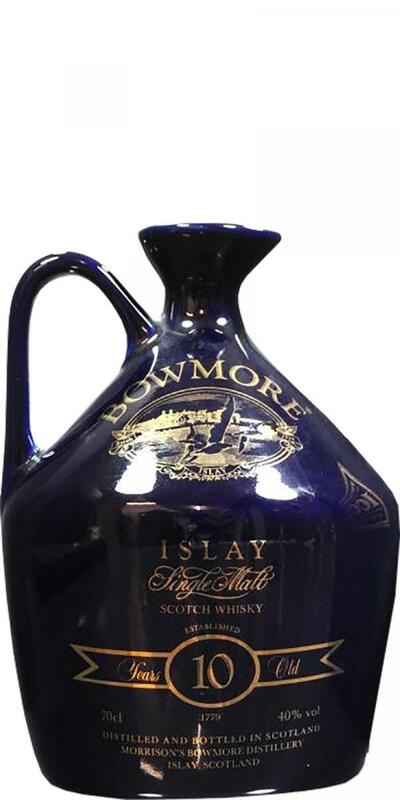 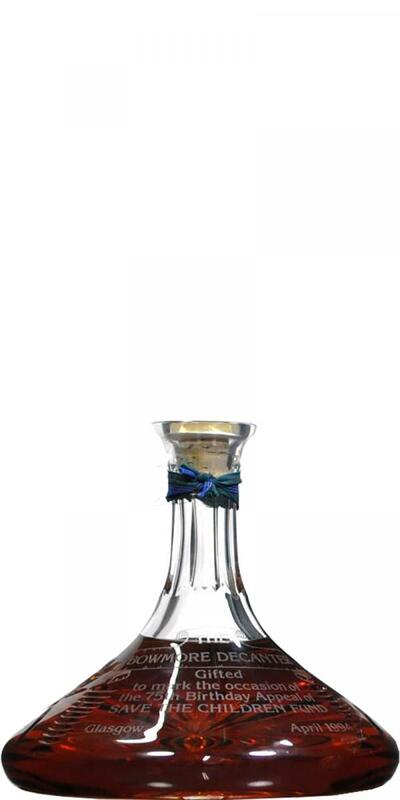 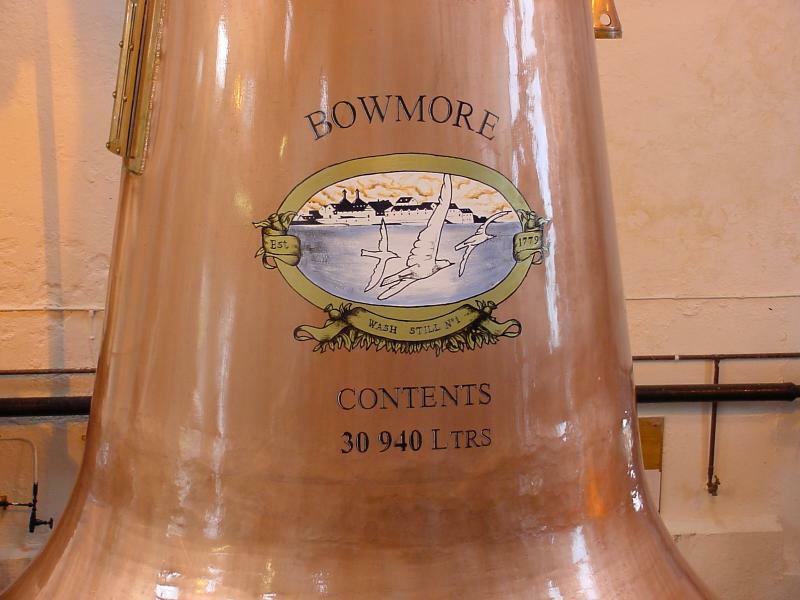 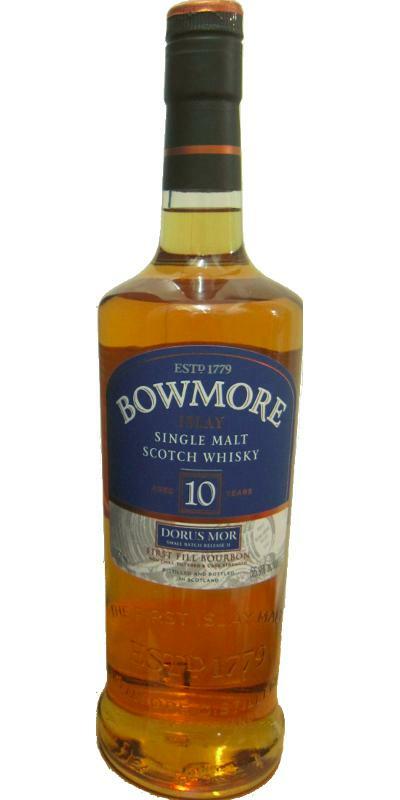 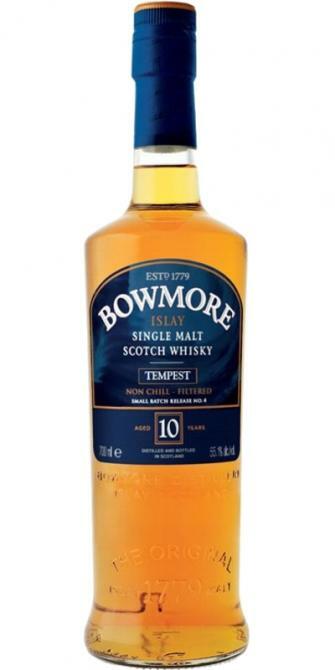 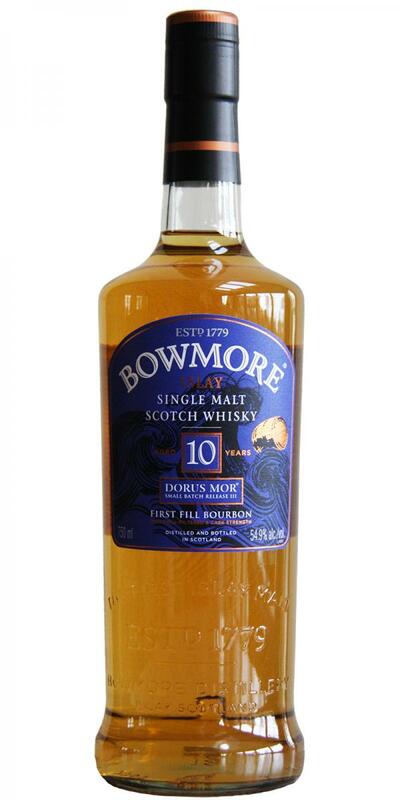 Bowmore 10-year-old Blue Ceramic Jug 10 40.0 % Vol. 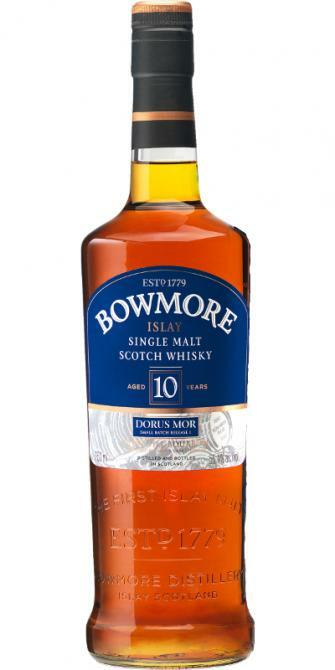 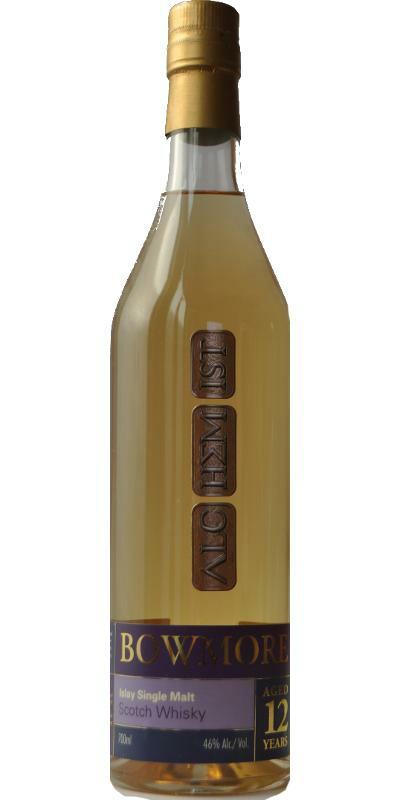 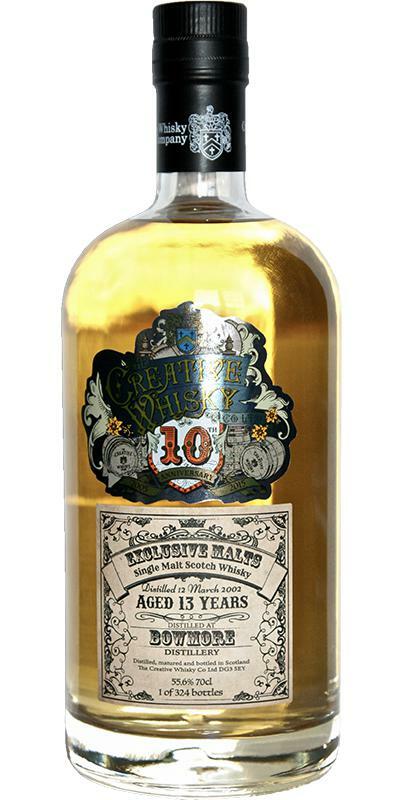 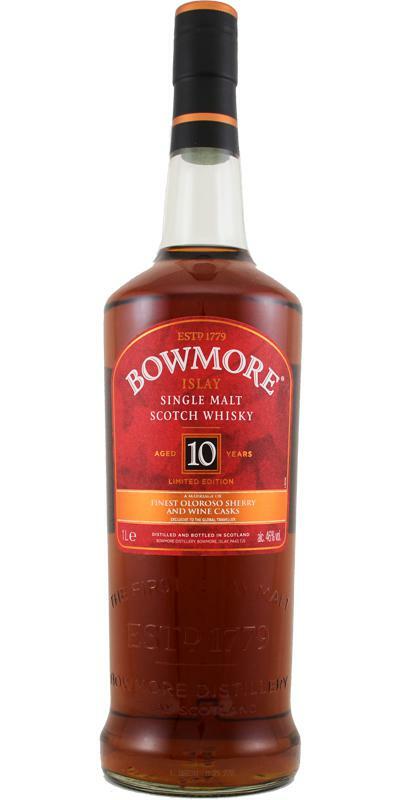 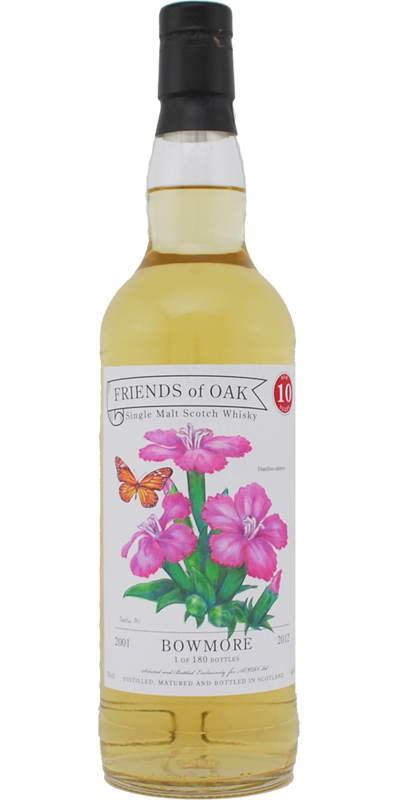 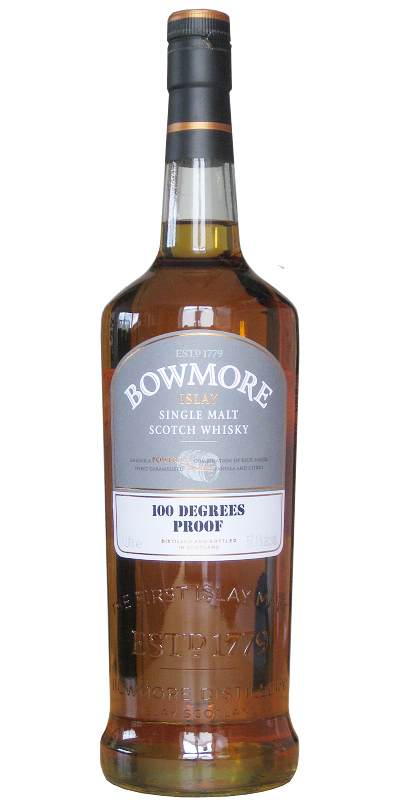 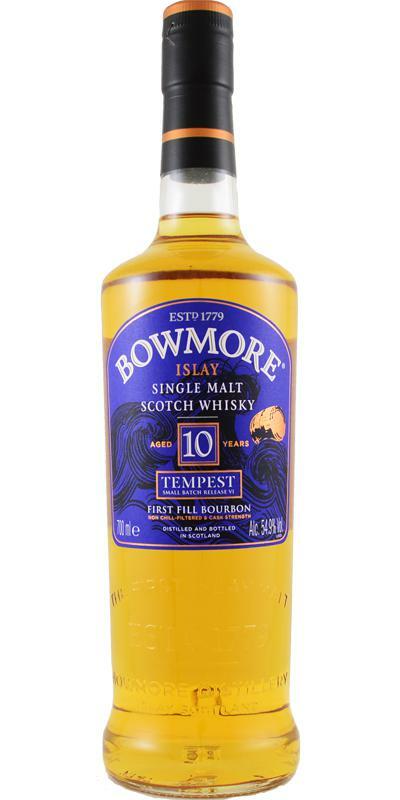 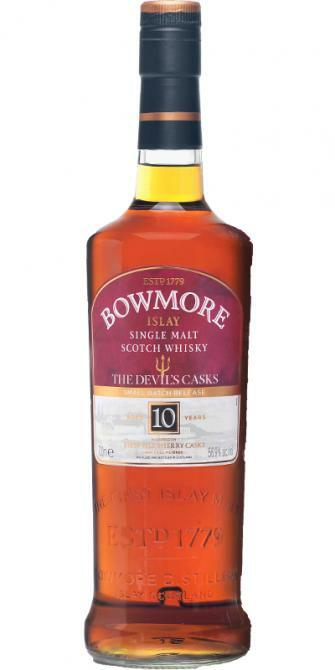 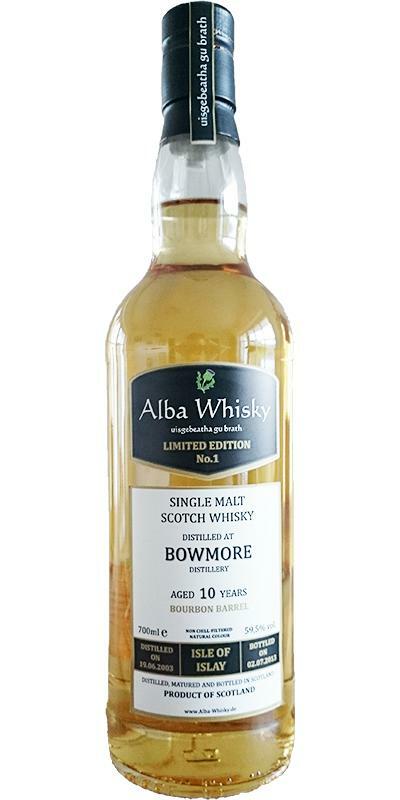 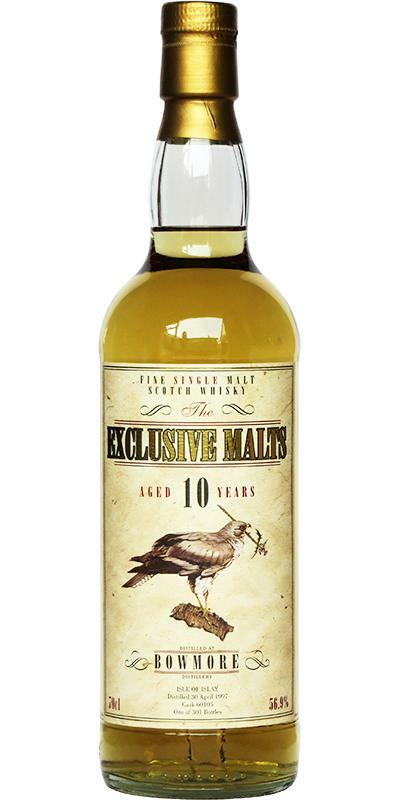 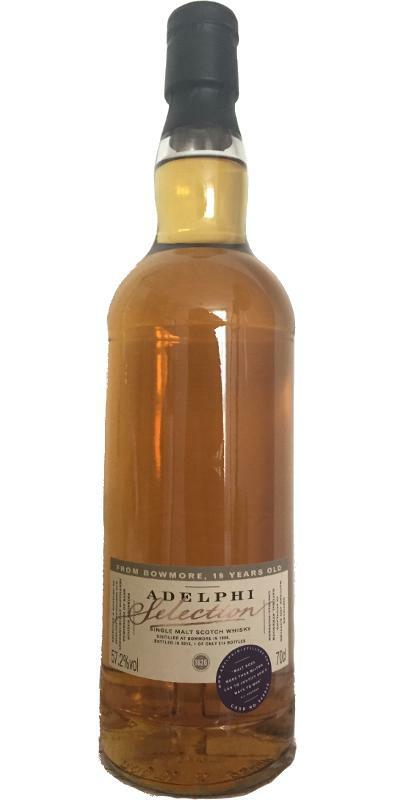 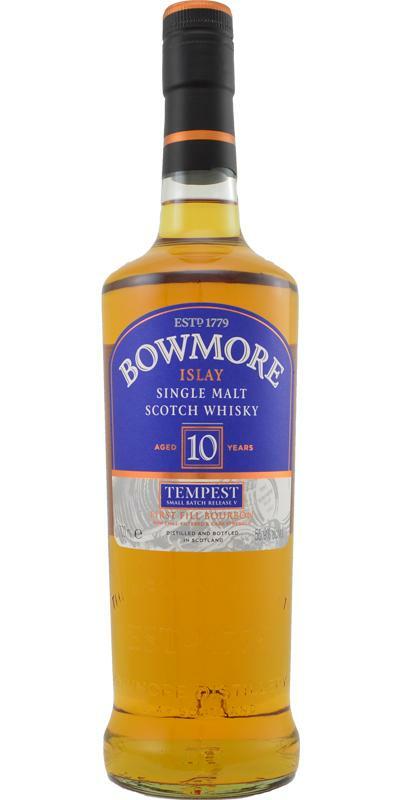 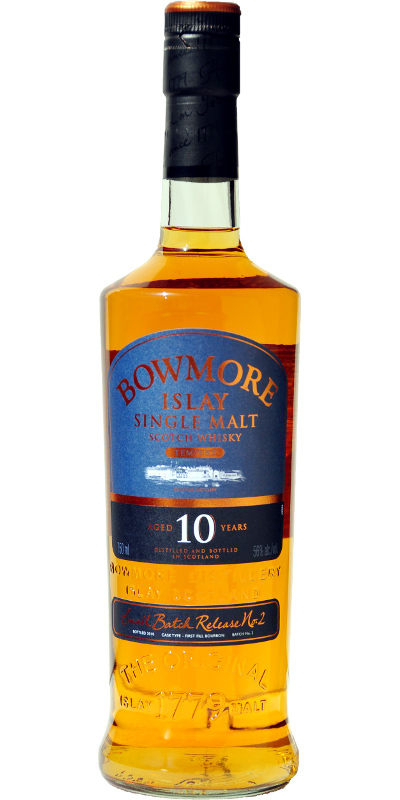 Bowmore 10-year-old Islay Single Malt Scotch Whisky 10 40.0 % Vol. 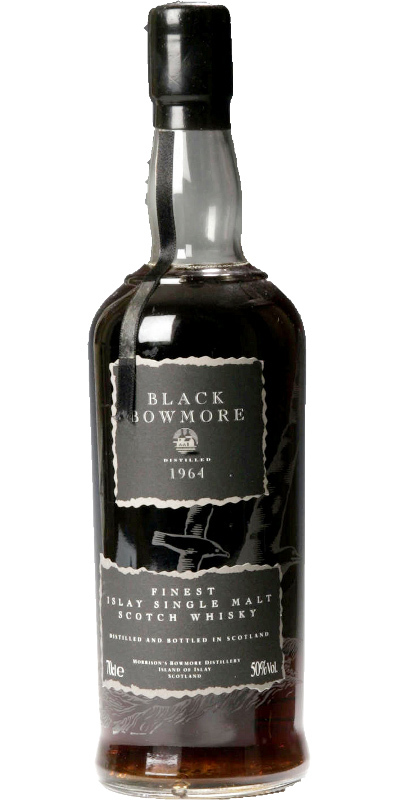 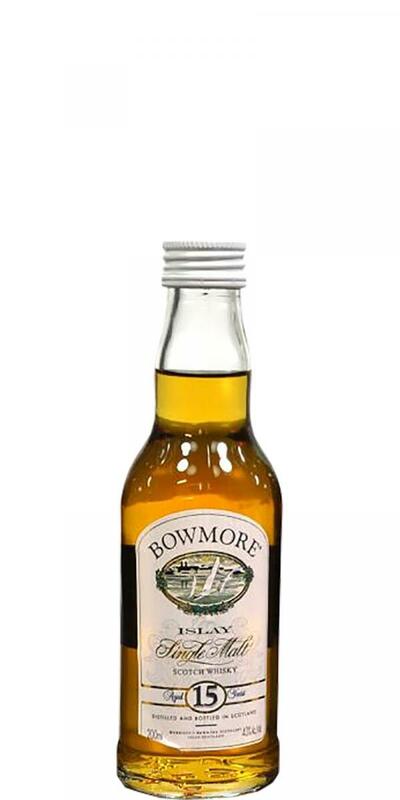 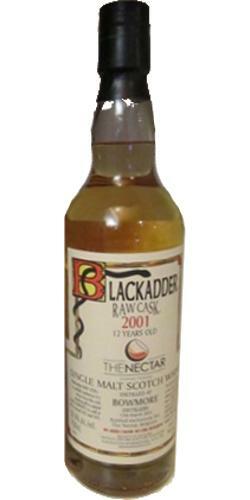 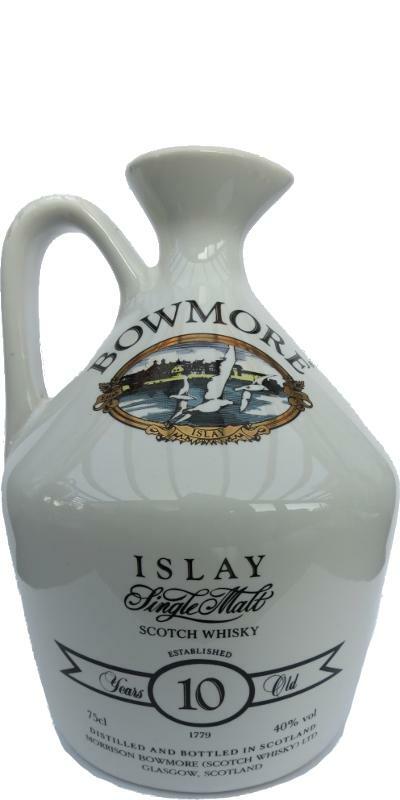 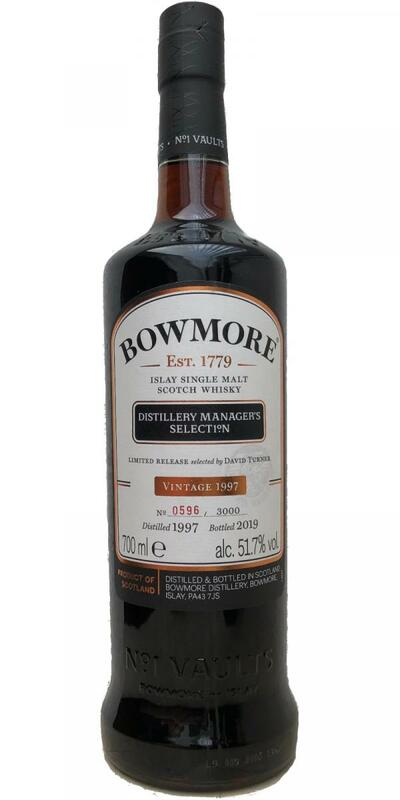 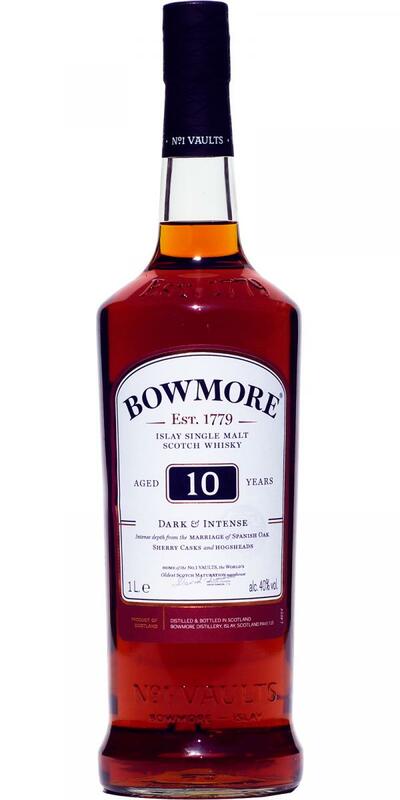 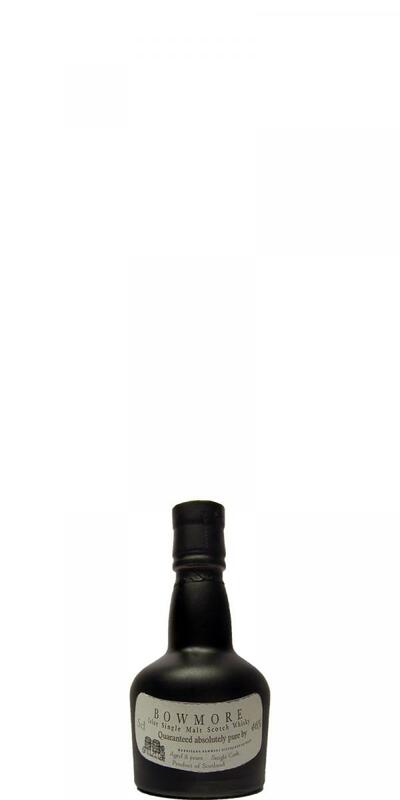 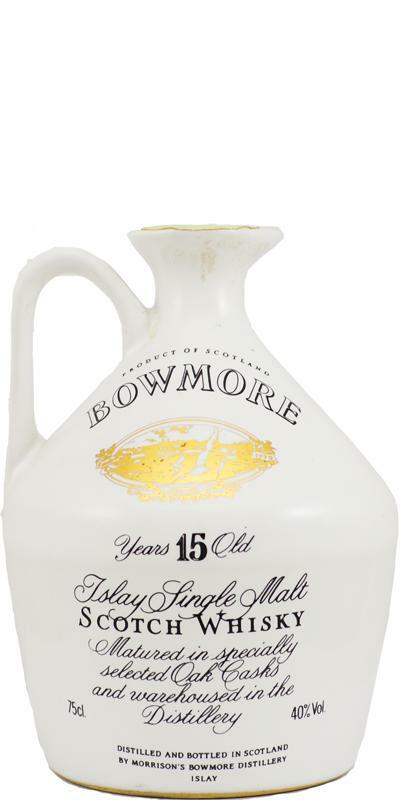 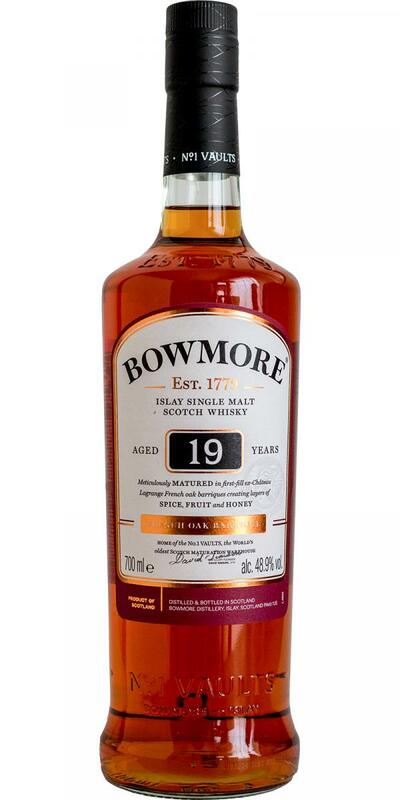 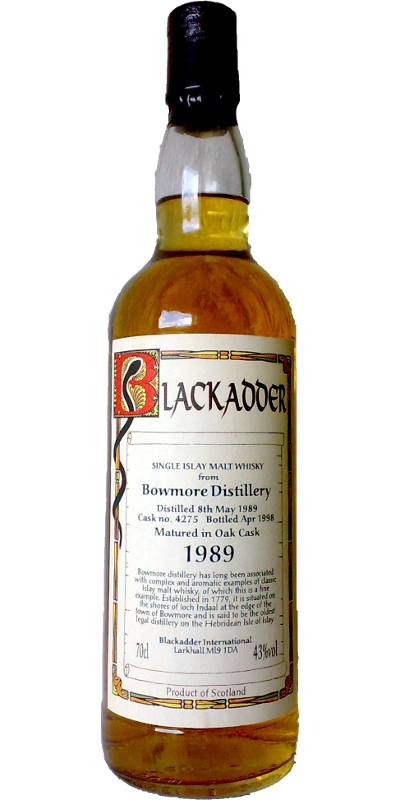 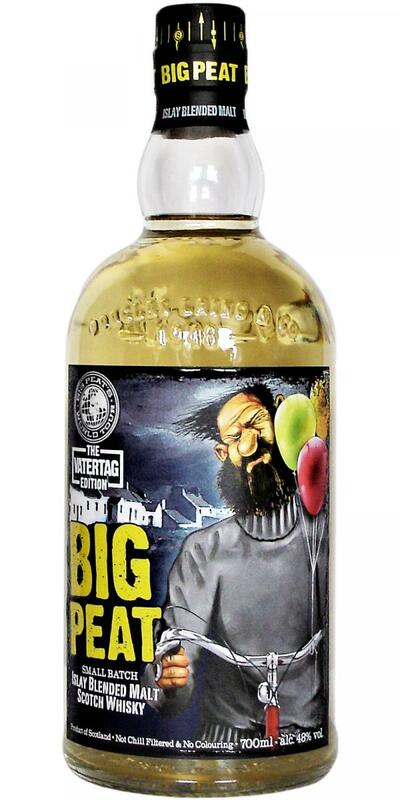 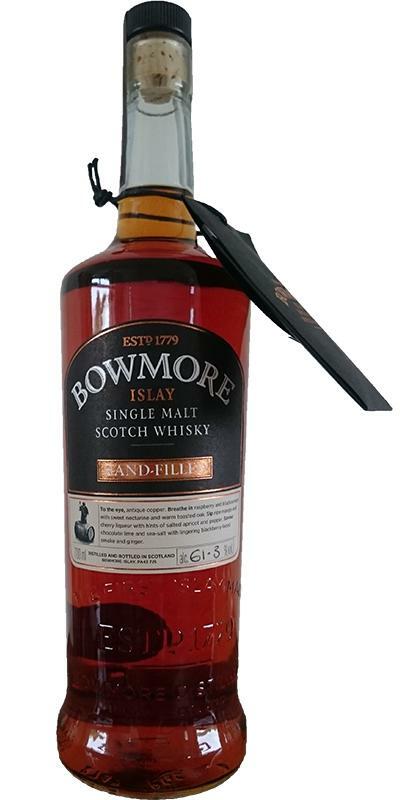 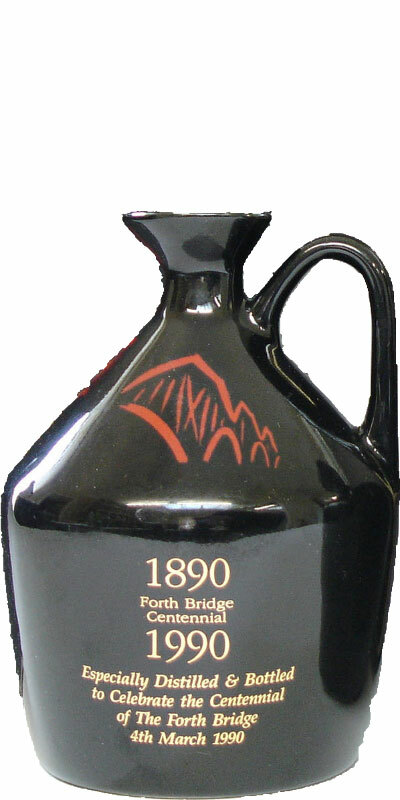 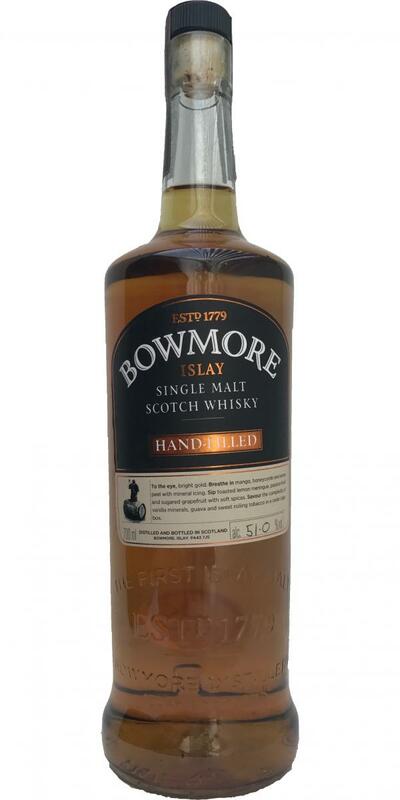 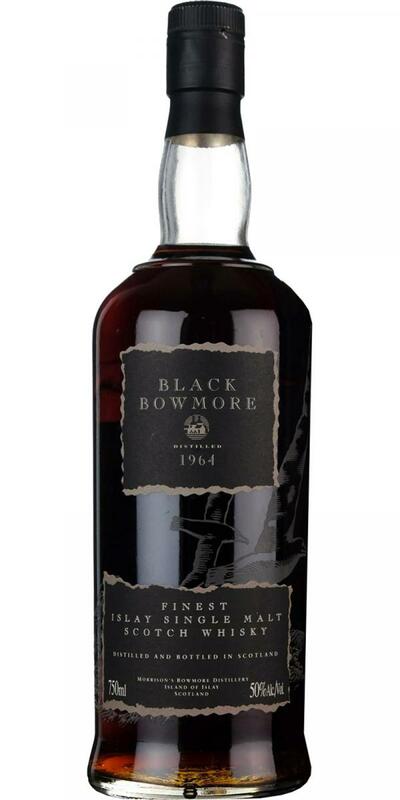 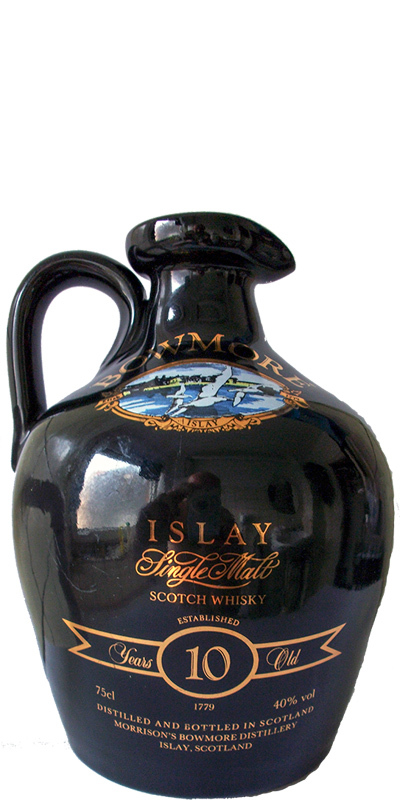 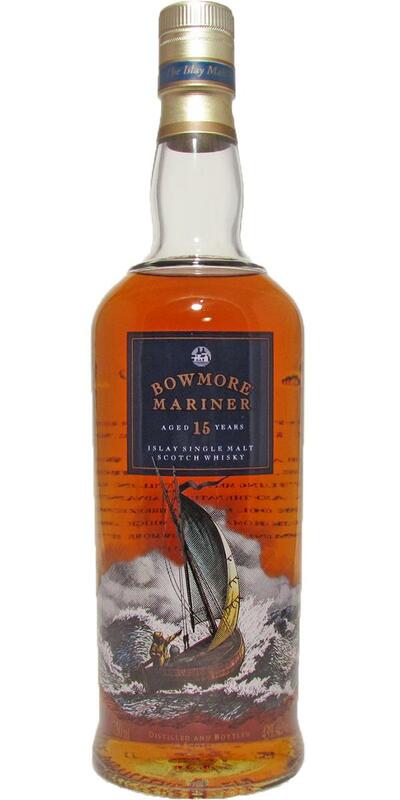 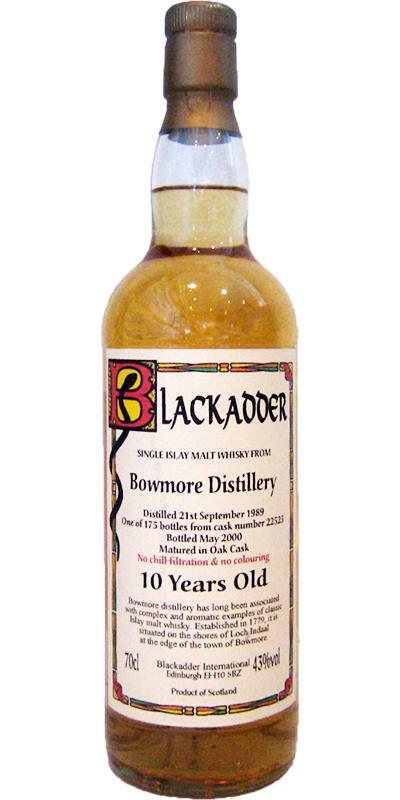 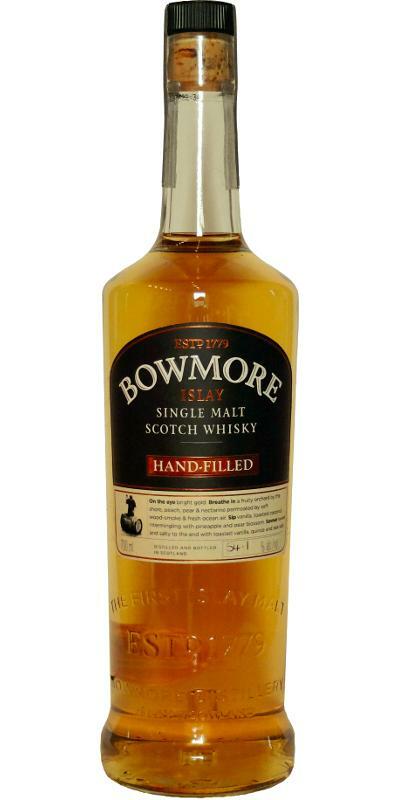 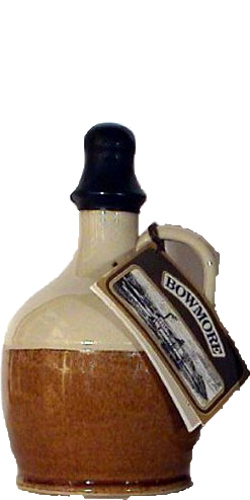 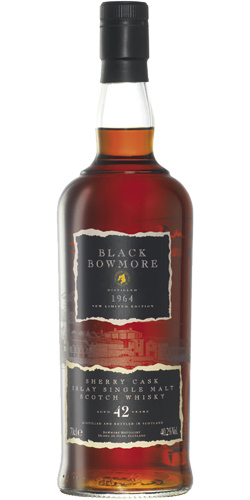 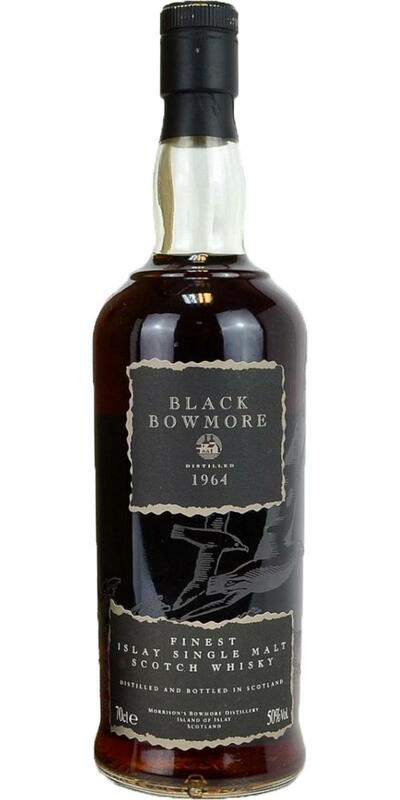 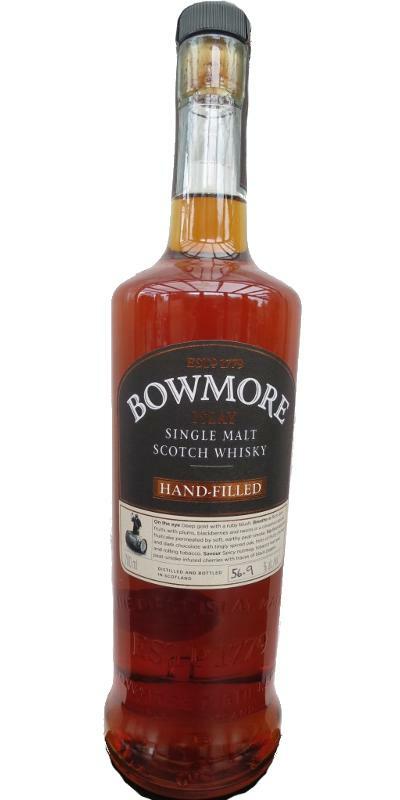 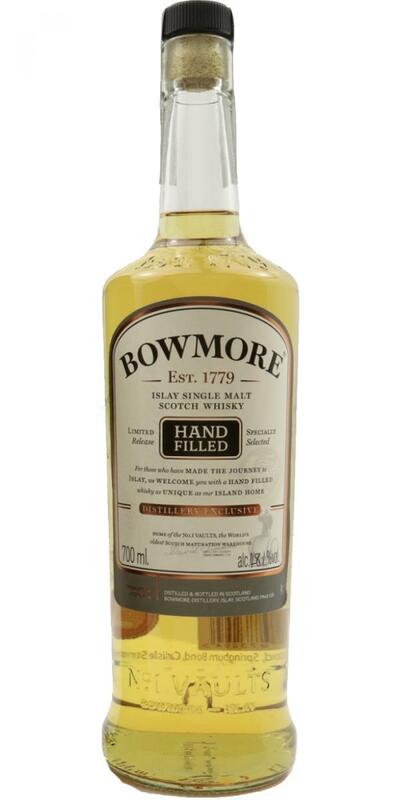 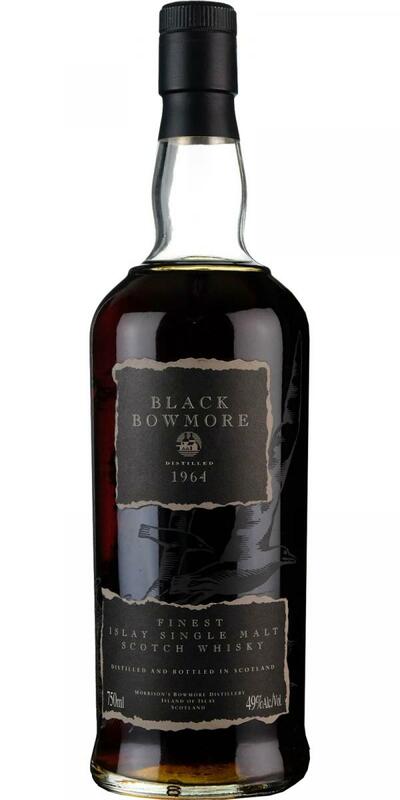 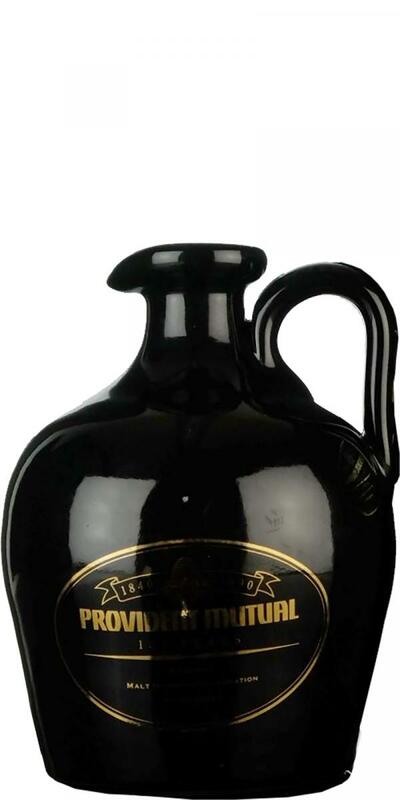 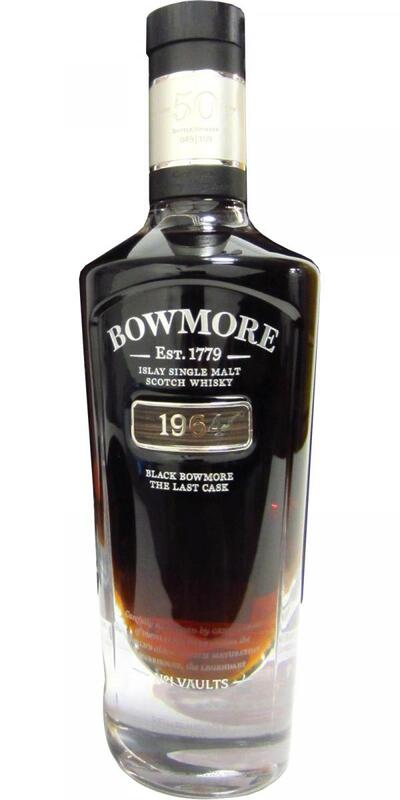 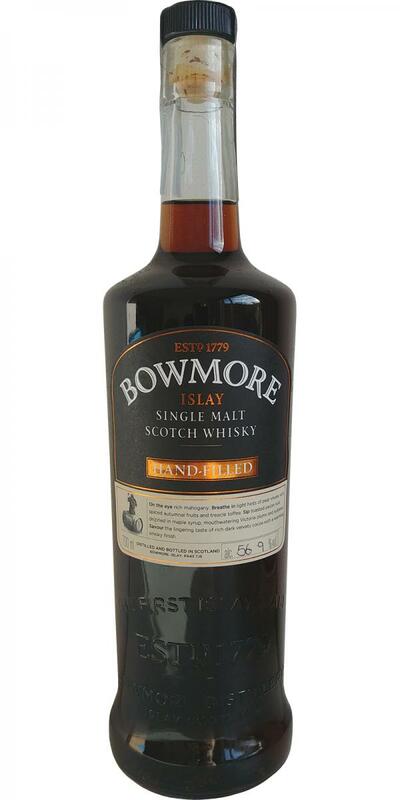 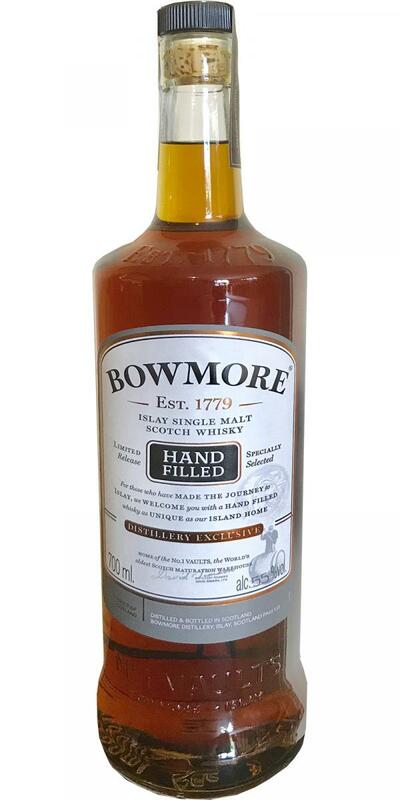 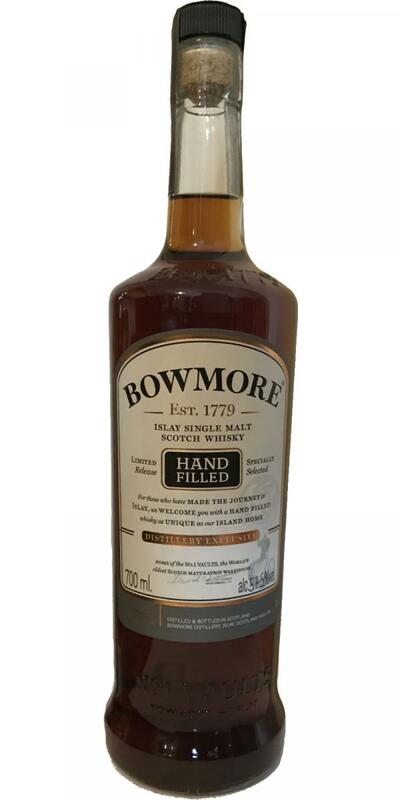 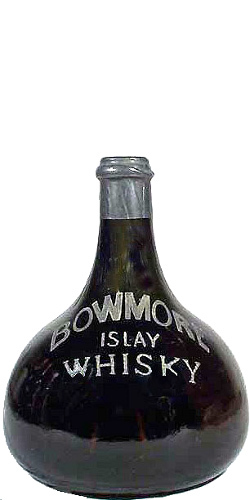 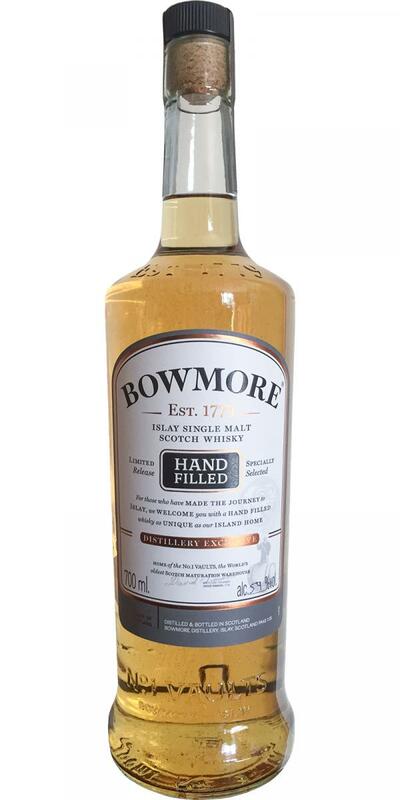 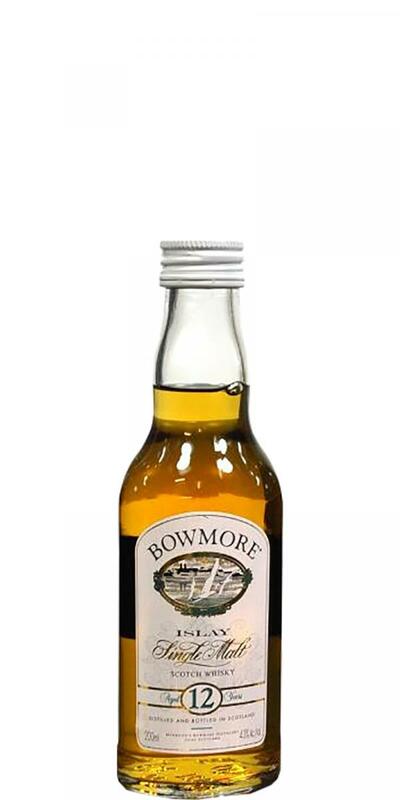 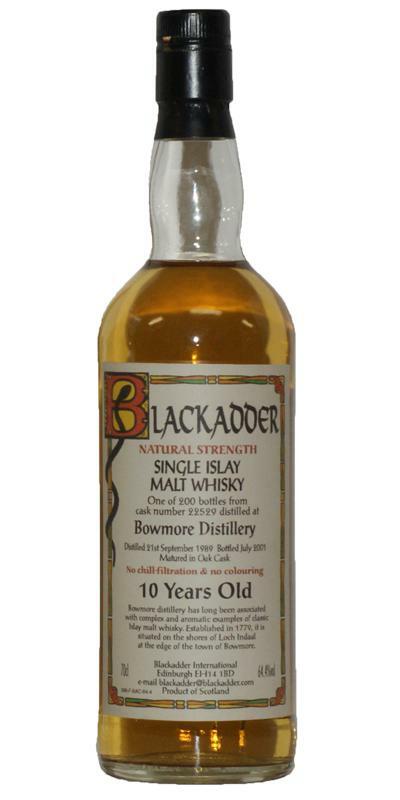 Bowmore 10-year-old Black Ceramic Jug 10 43.0 % Vol. 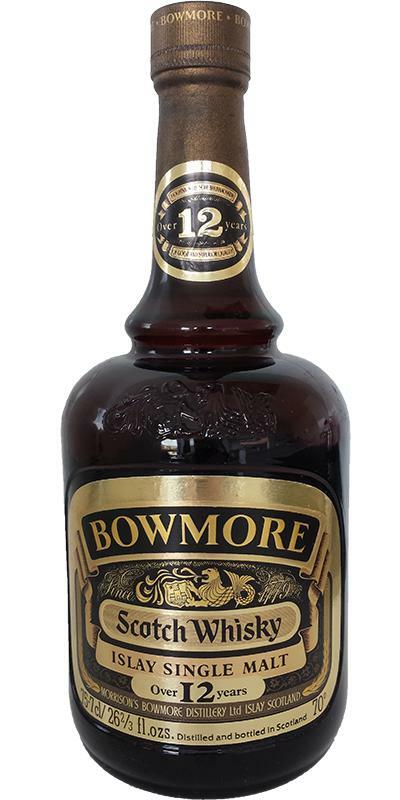 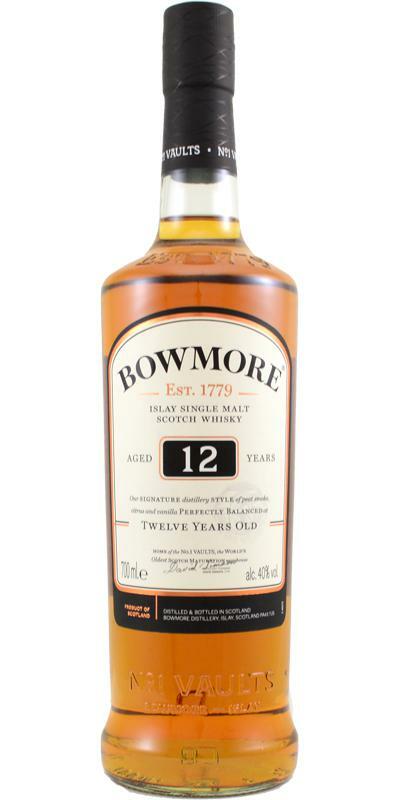 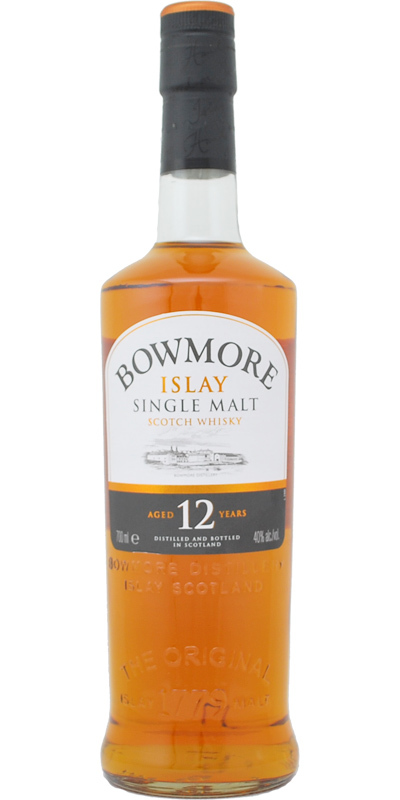 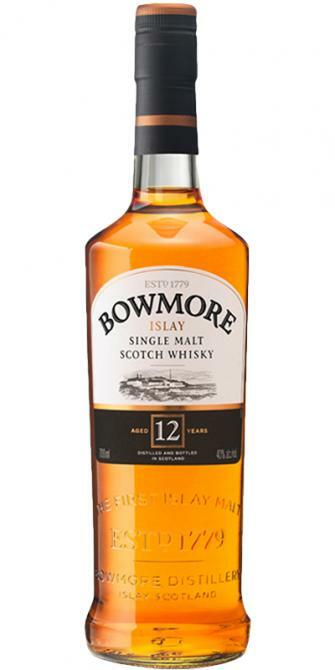 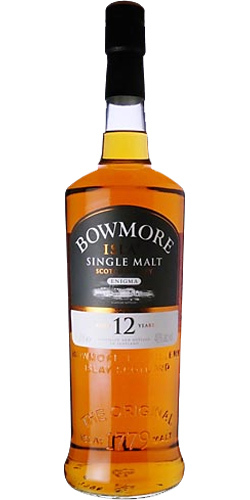 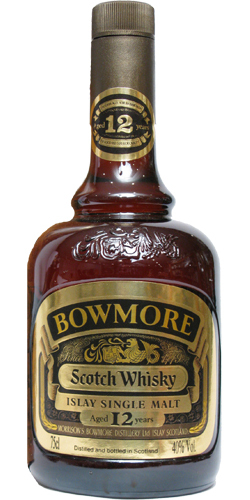 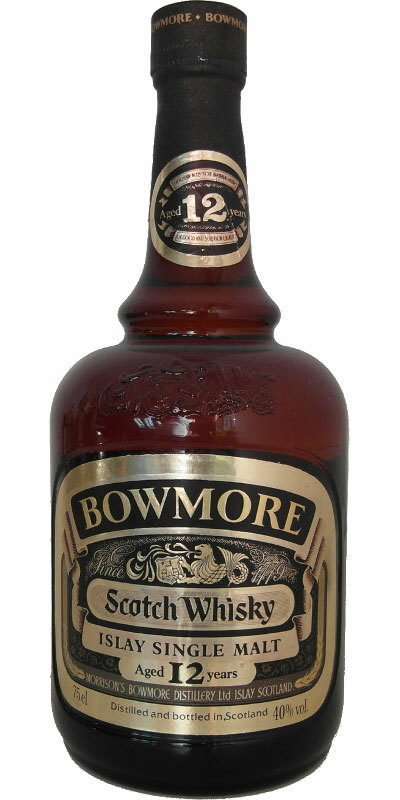 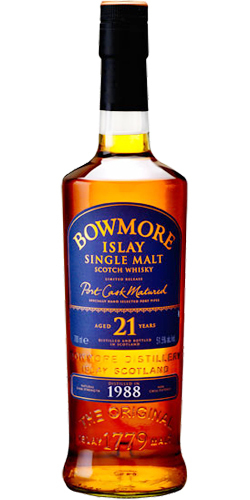 Bowmore 12-year-old 12 43.0 % Vol. 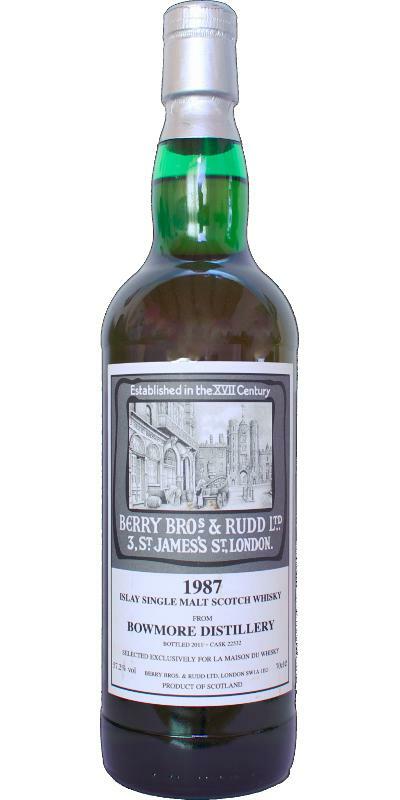 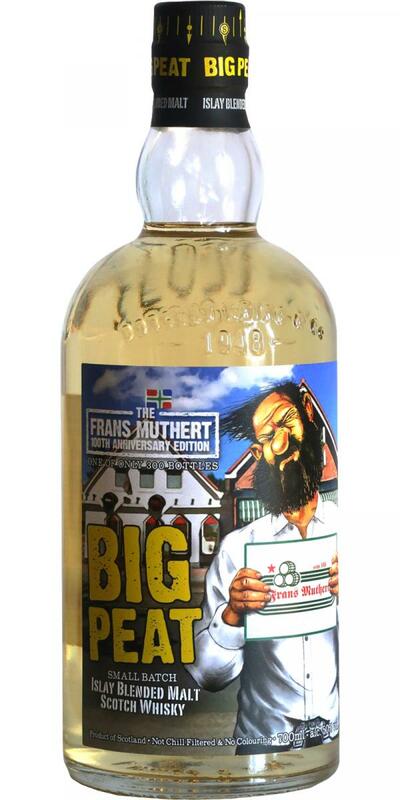 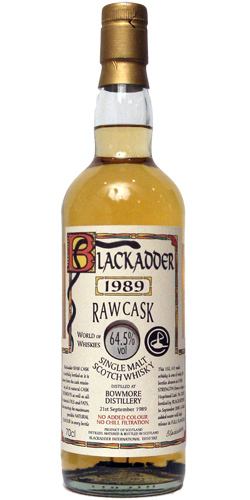 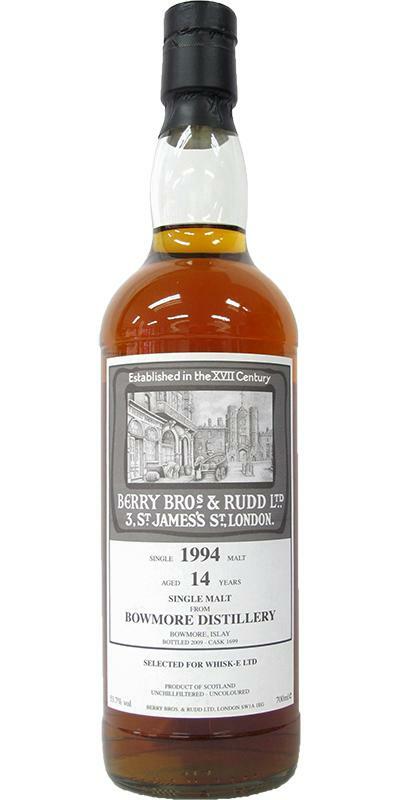 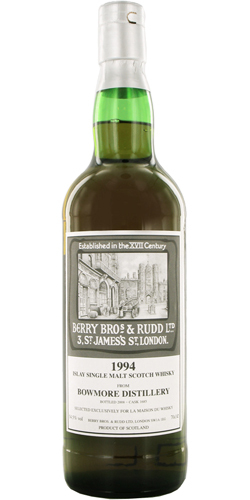 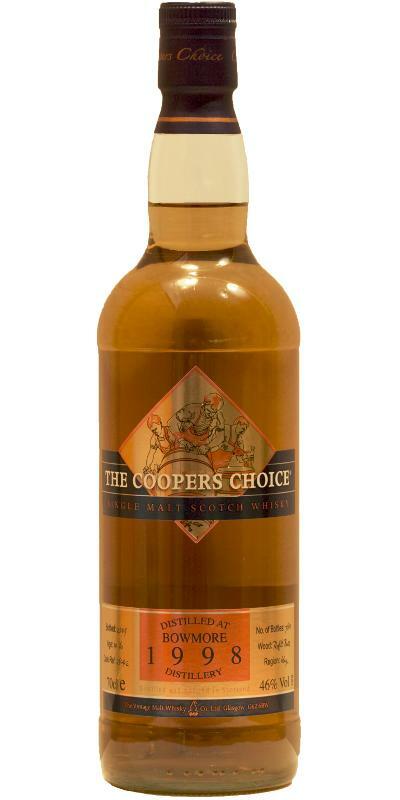 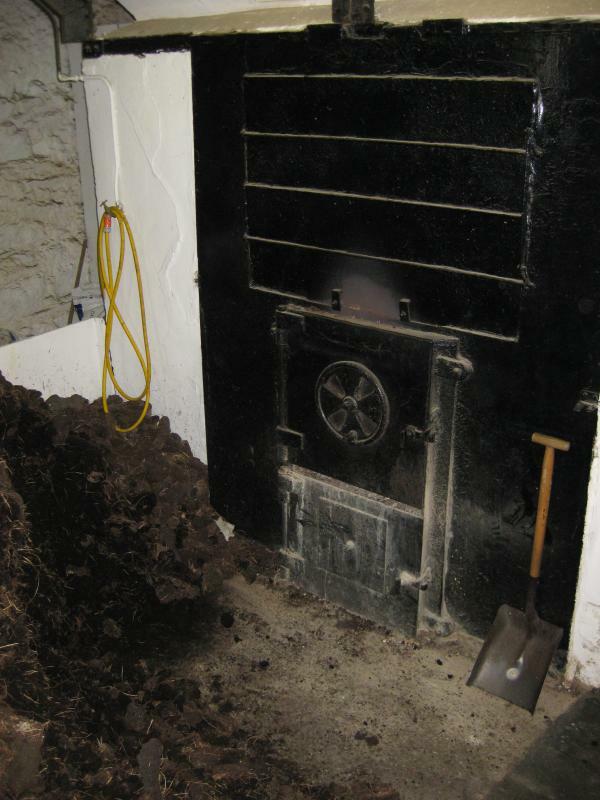 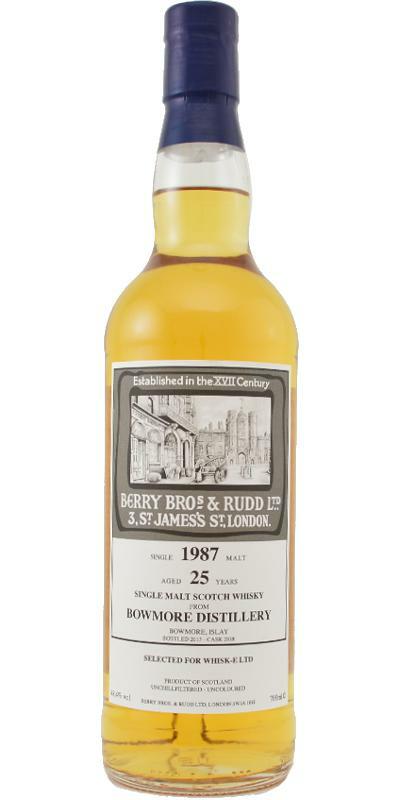 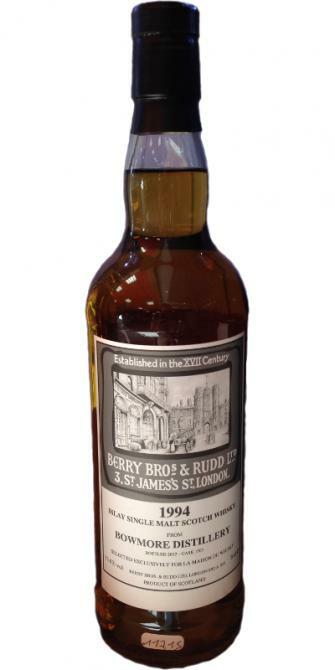 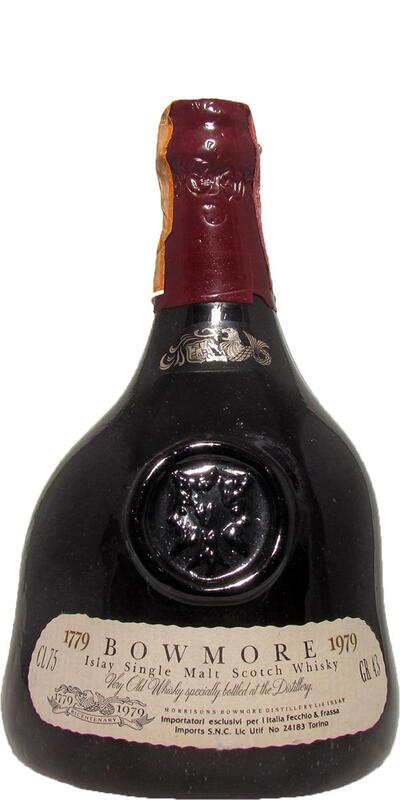 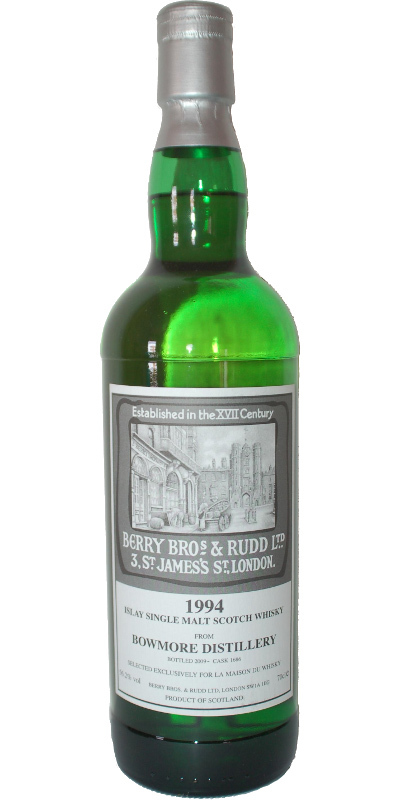 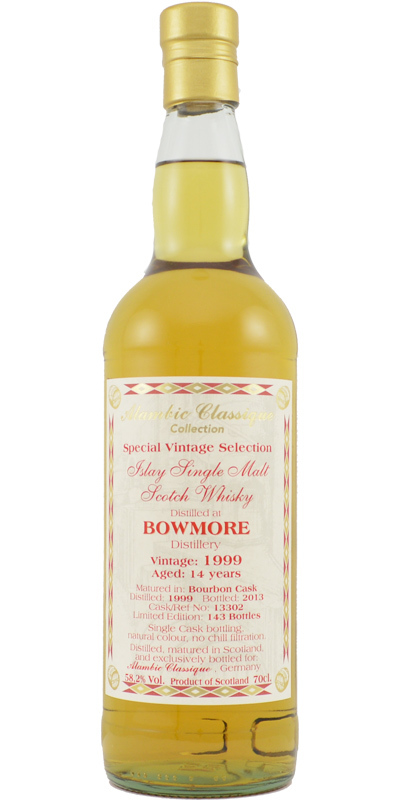 Bowmore 1890 W & J Mutters for James 1890 0.0 % Vol. 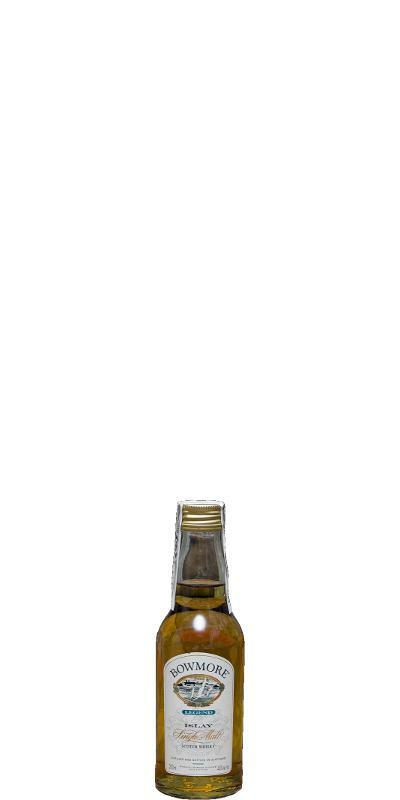 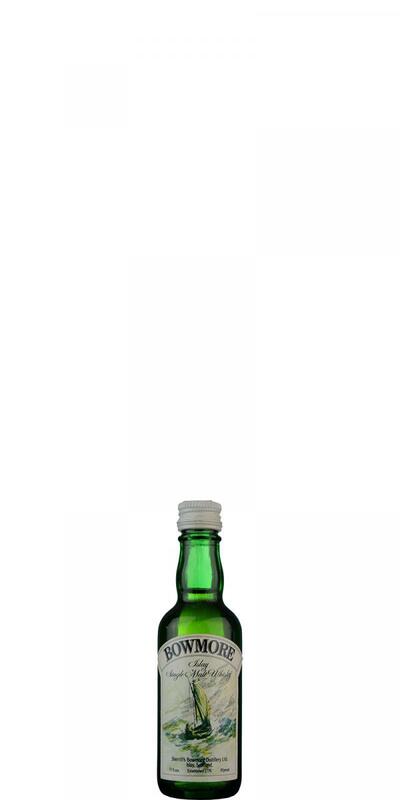 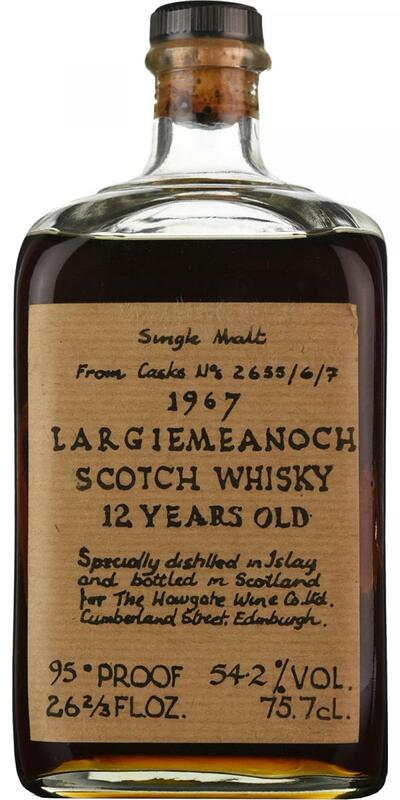 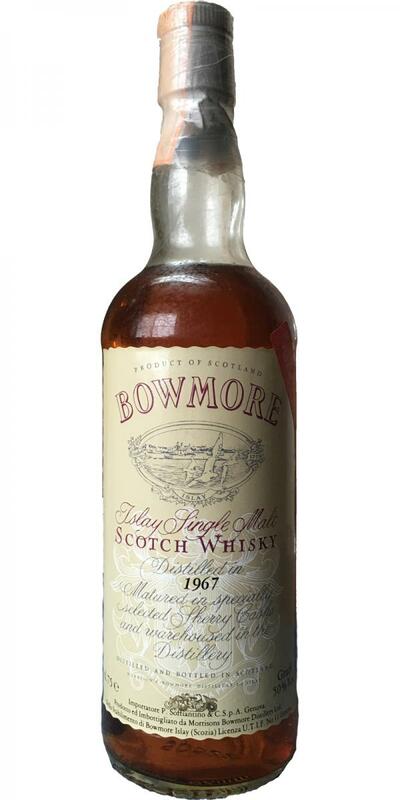 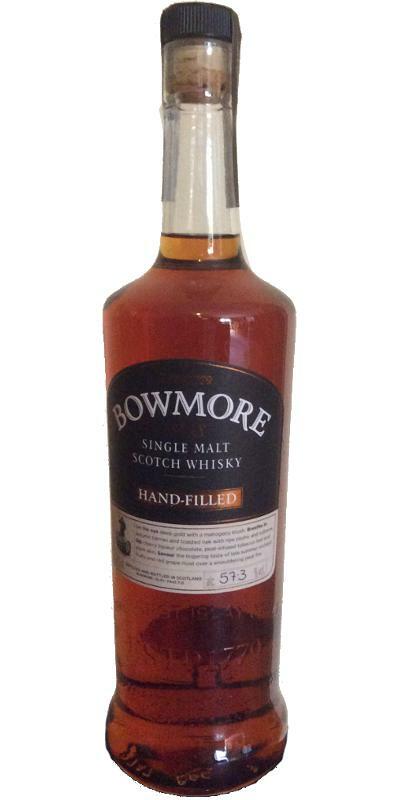 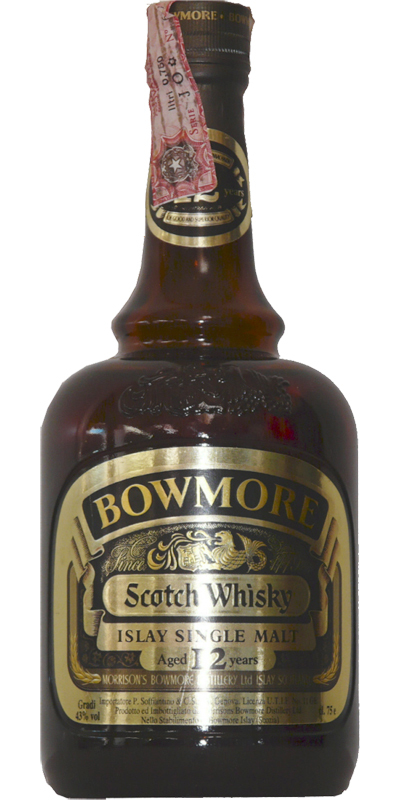 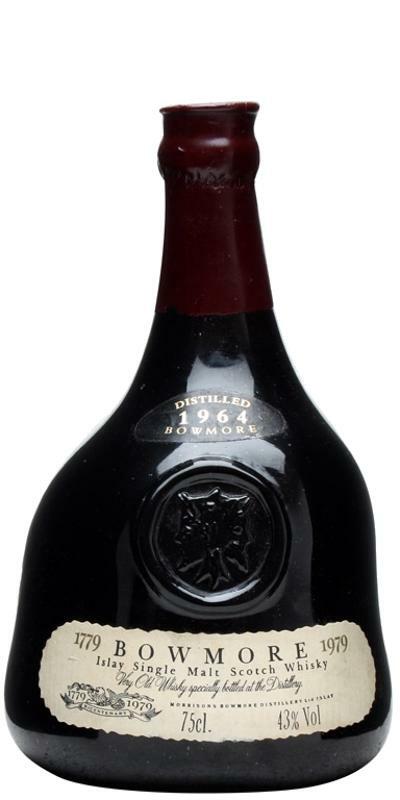 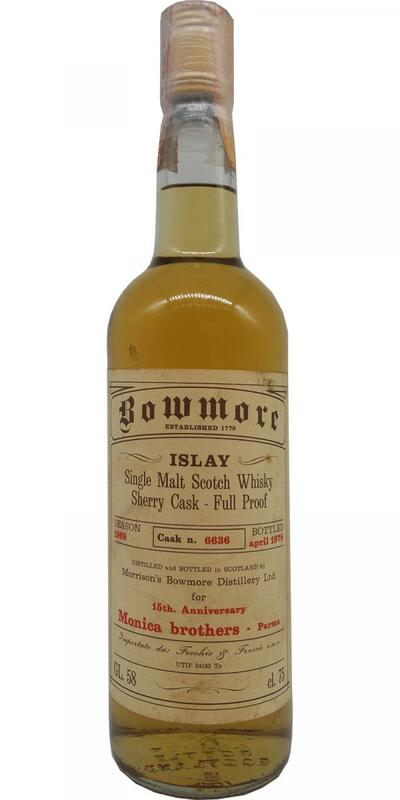 Bowmore 1964 48 41.2 % Vol. 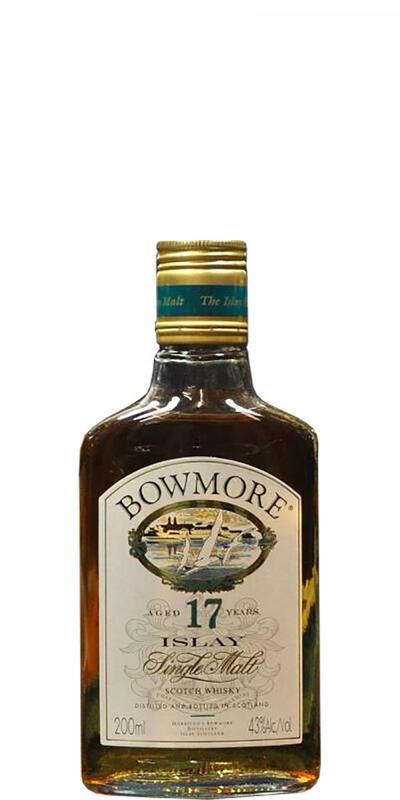 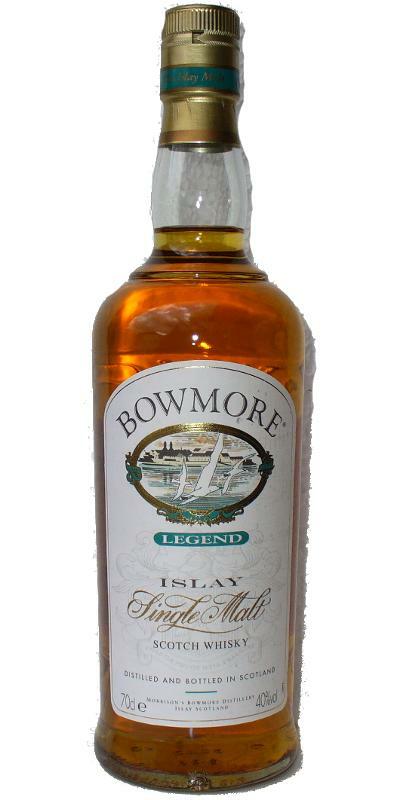 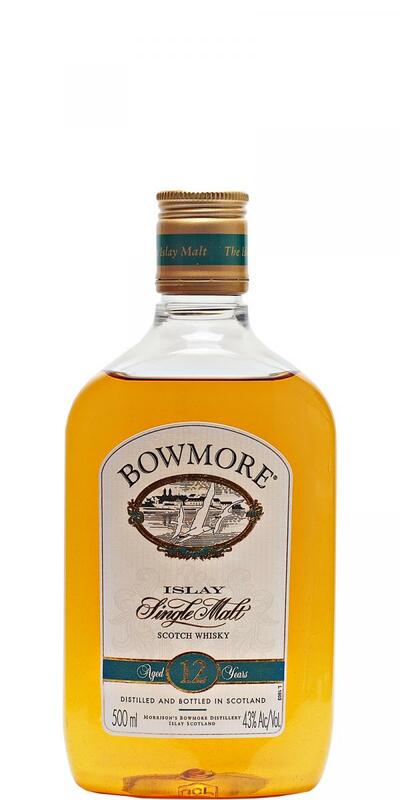 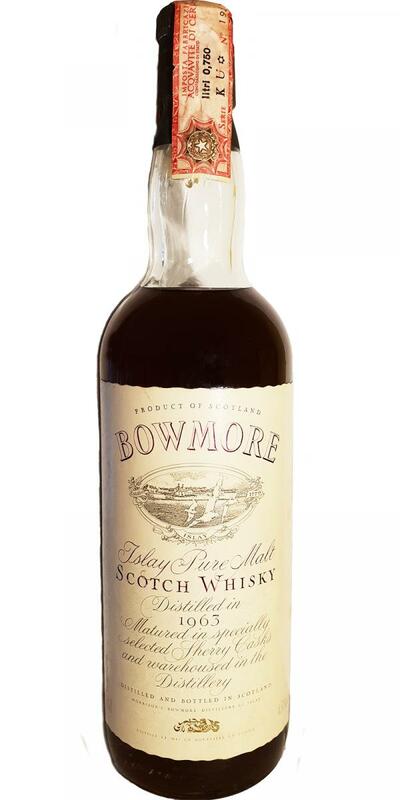 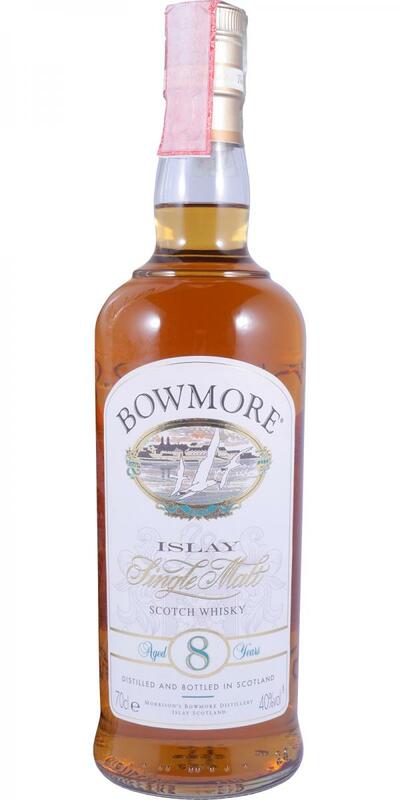 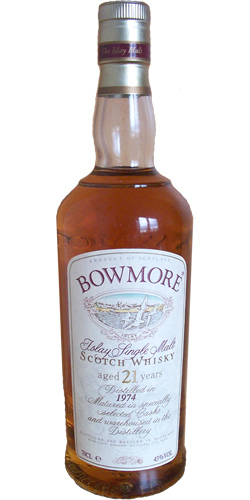 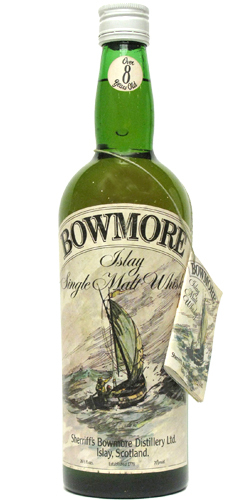 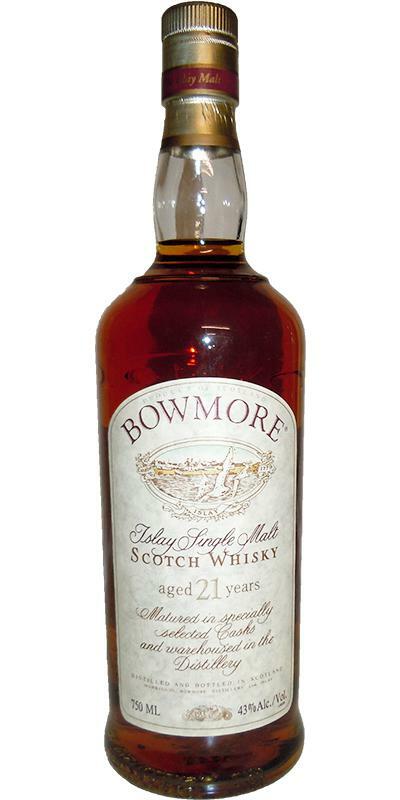 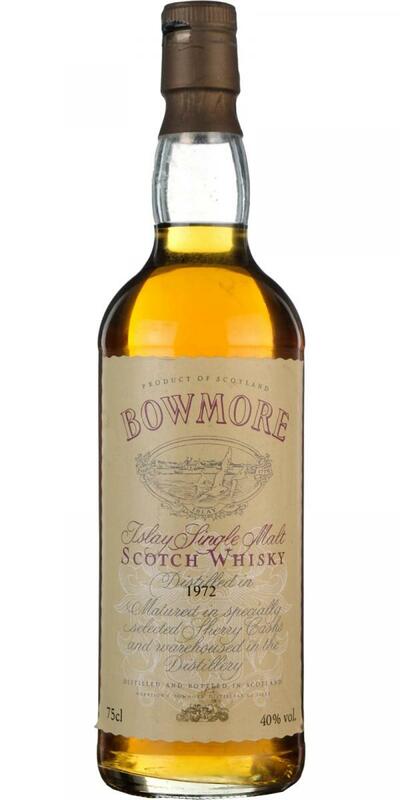 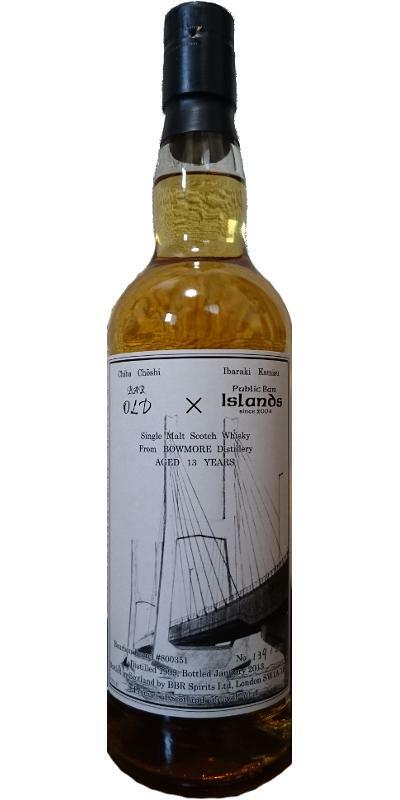 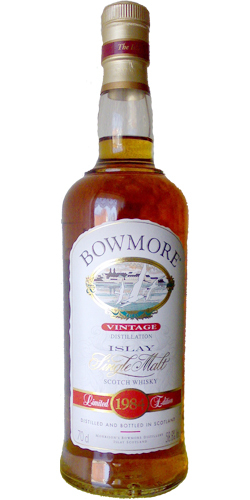 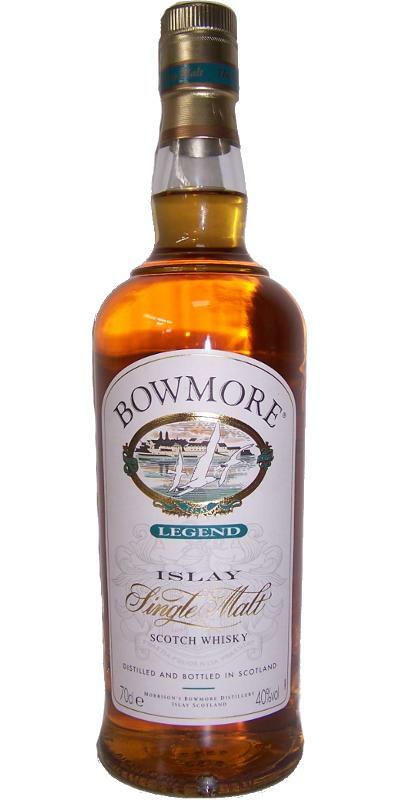 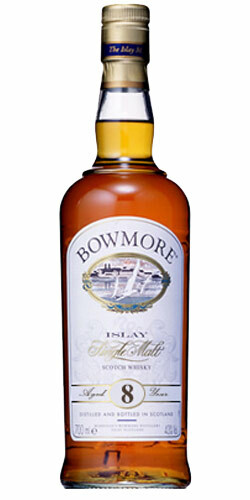 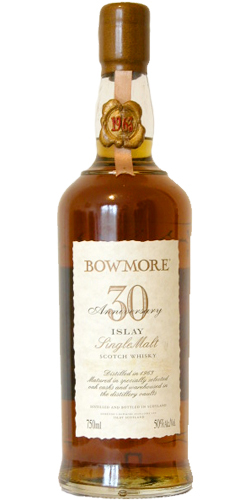 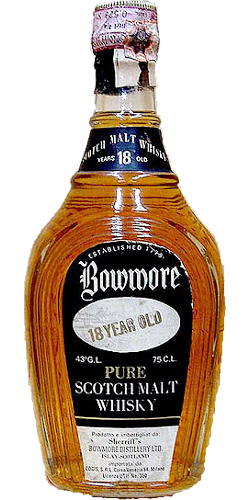 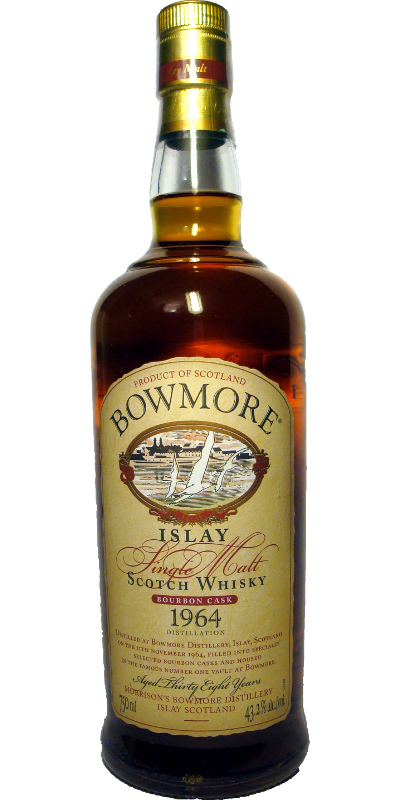 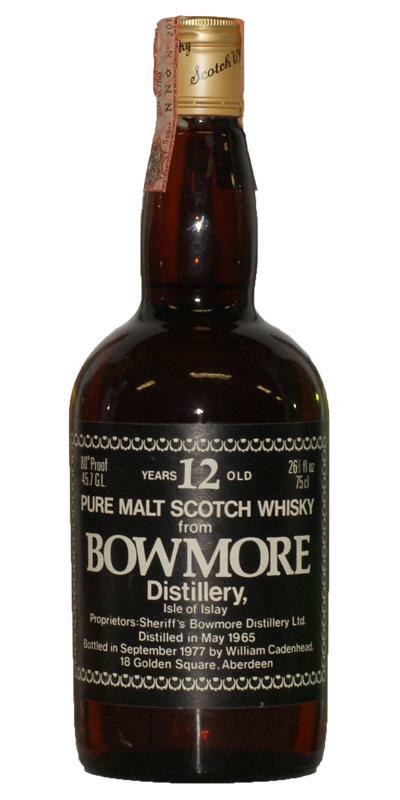 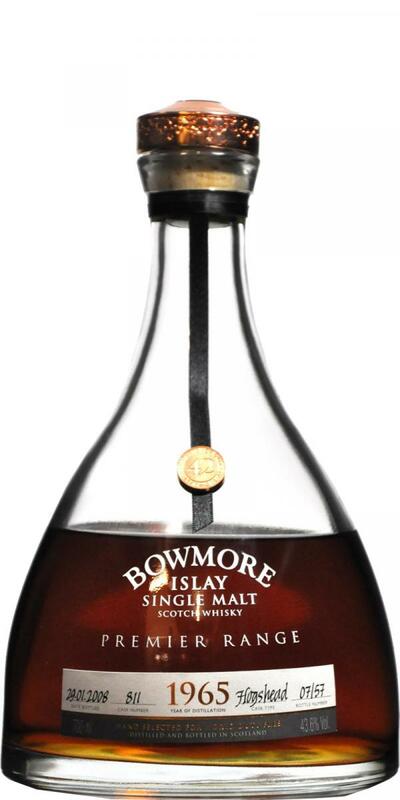 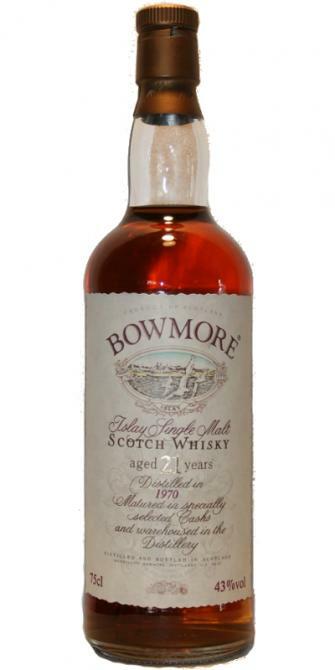 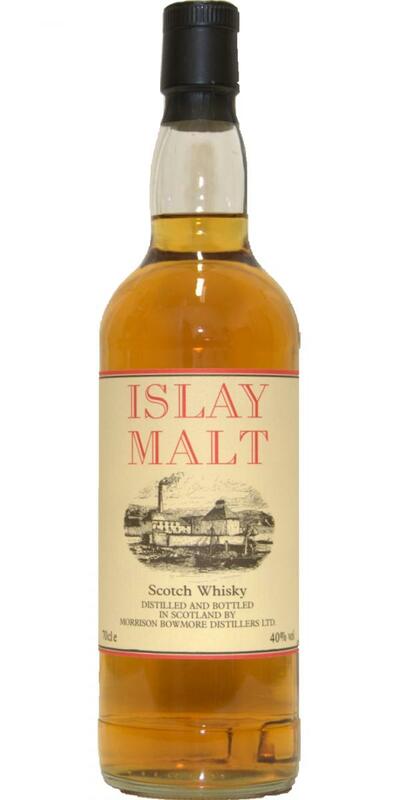 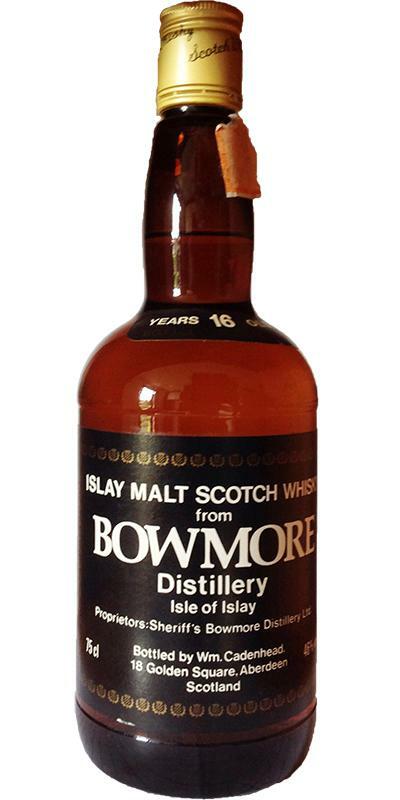 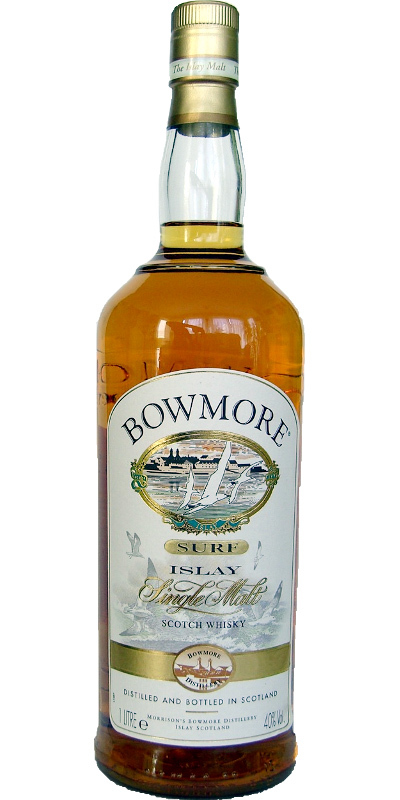 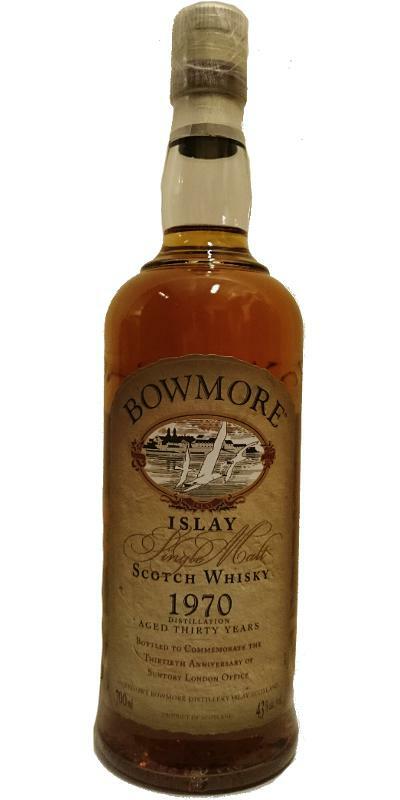 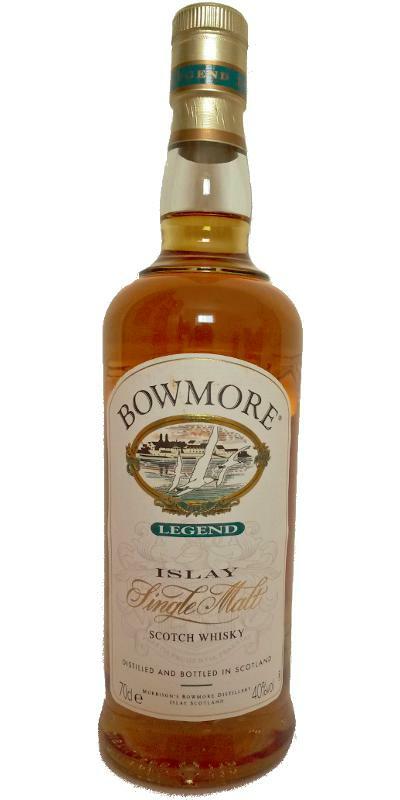 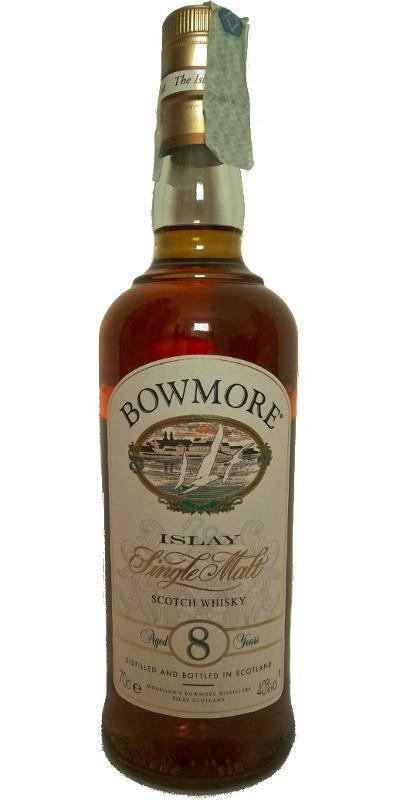 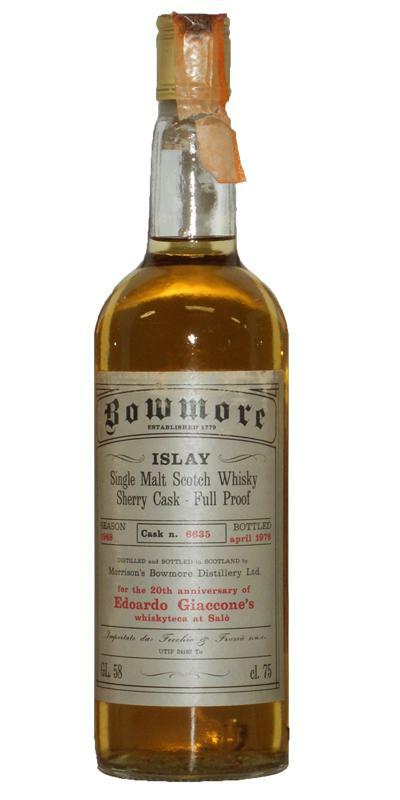 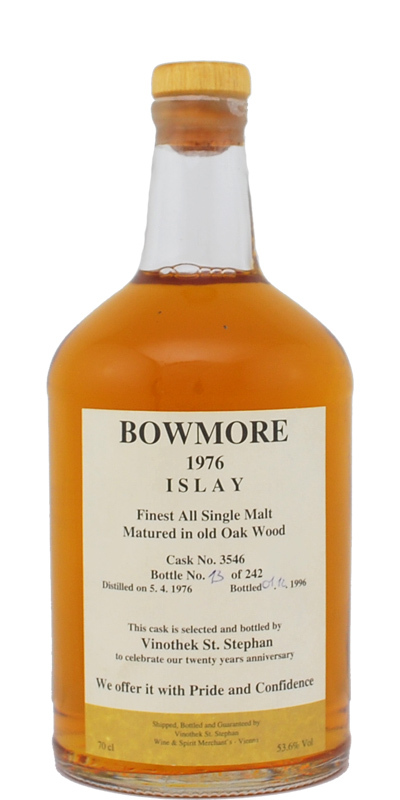 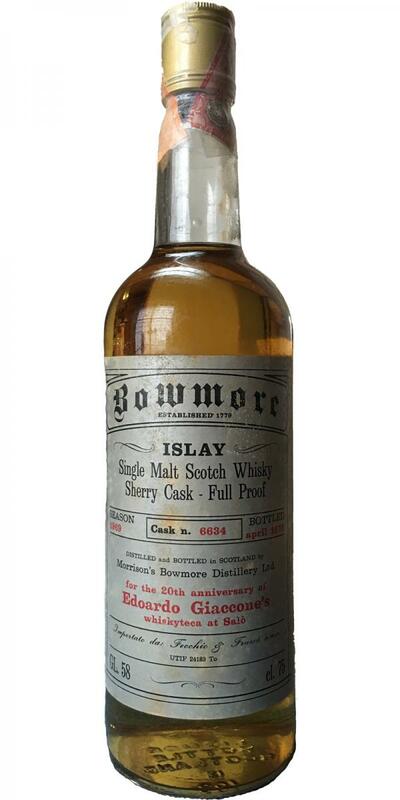 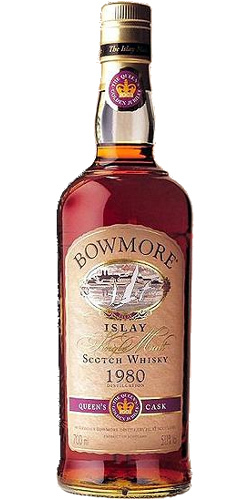 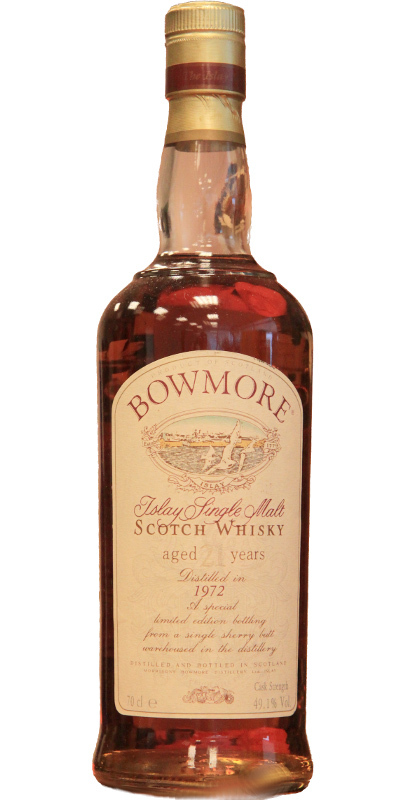 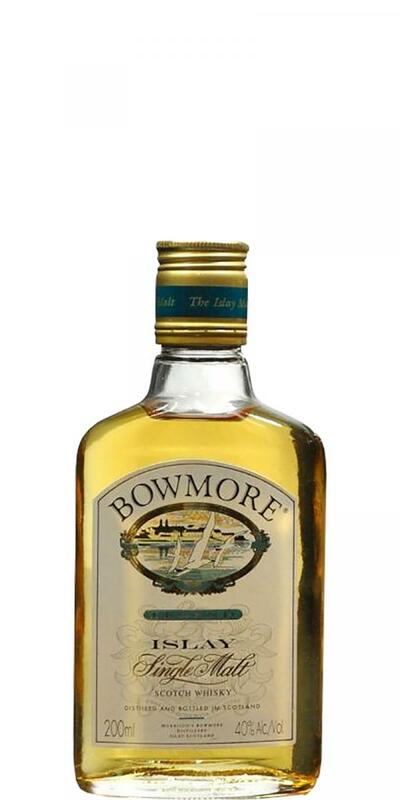 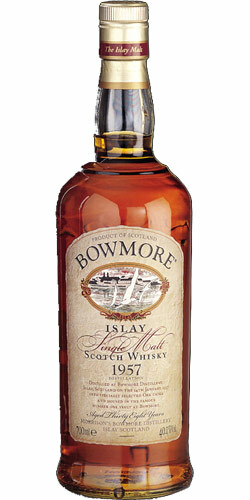 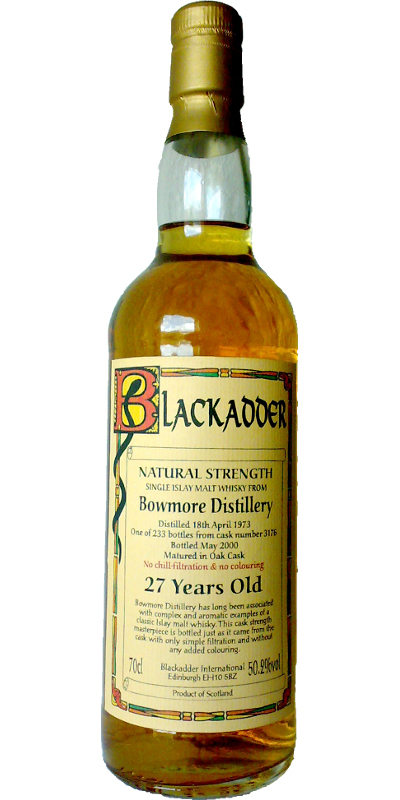 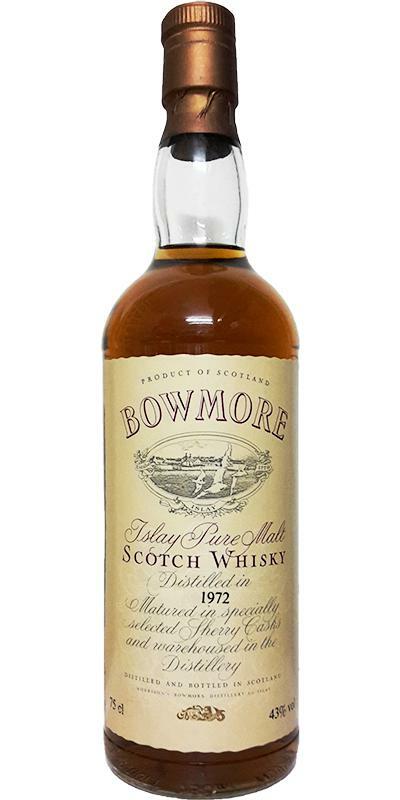 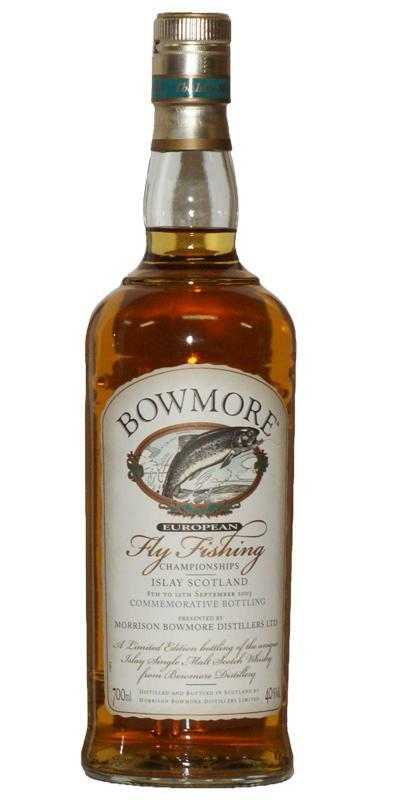 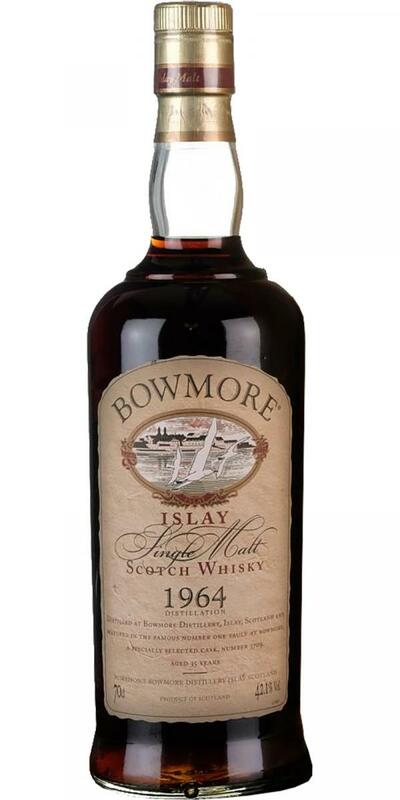 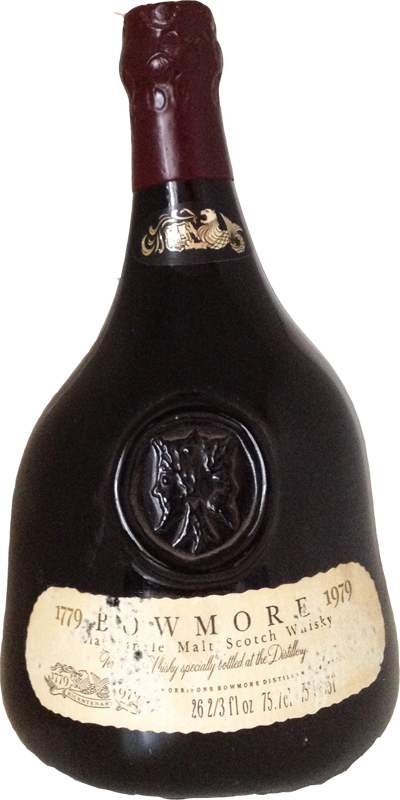 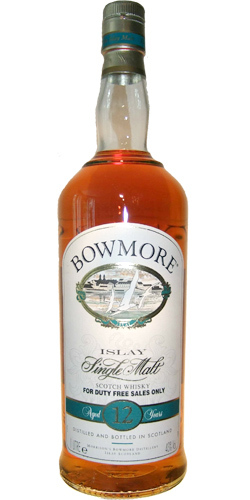 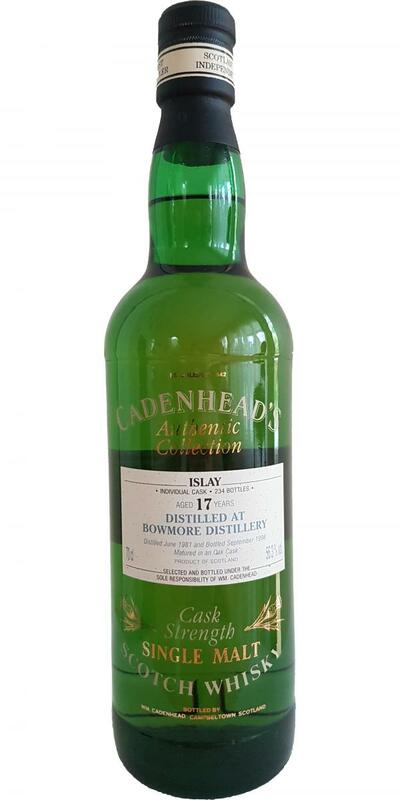 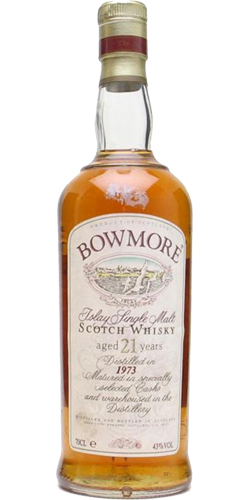 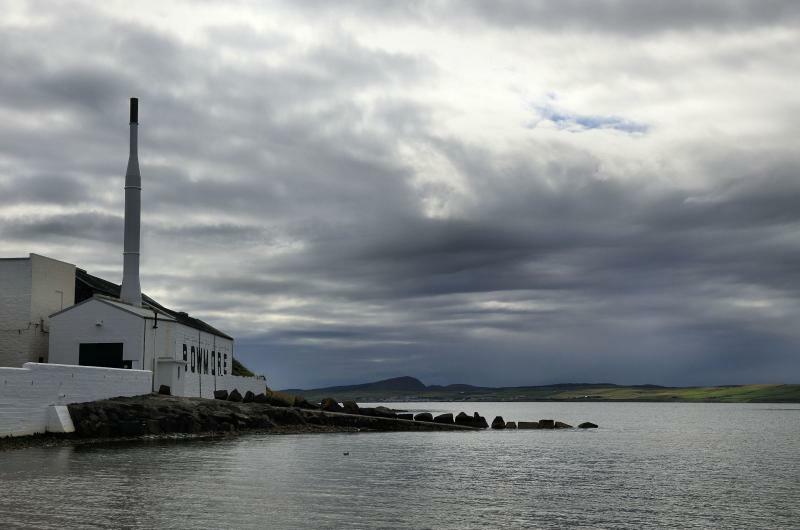 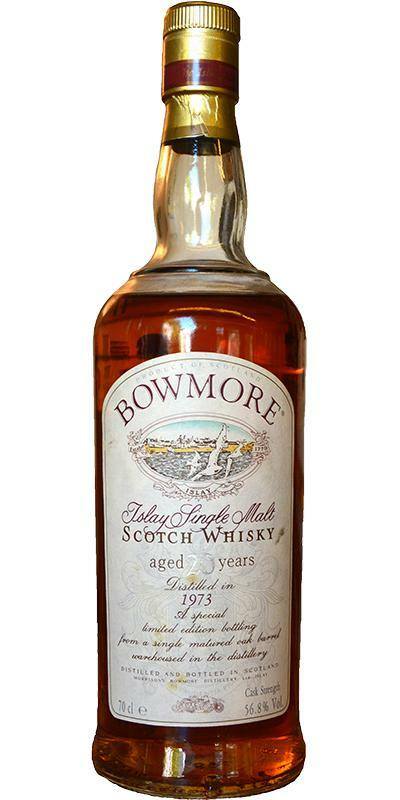 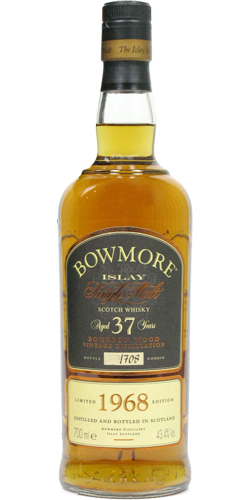 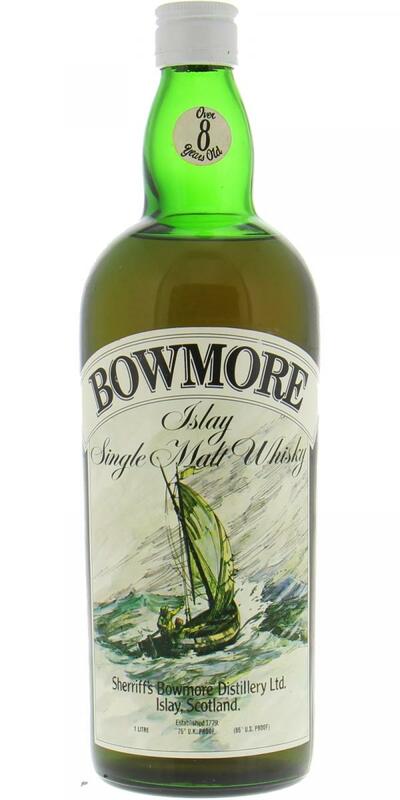 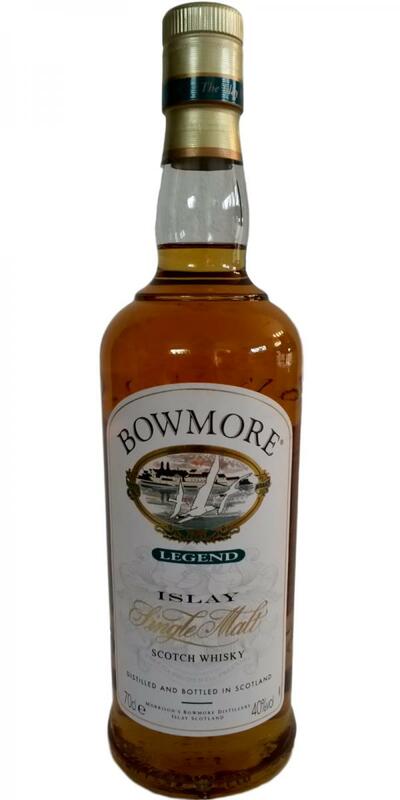 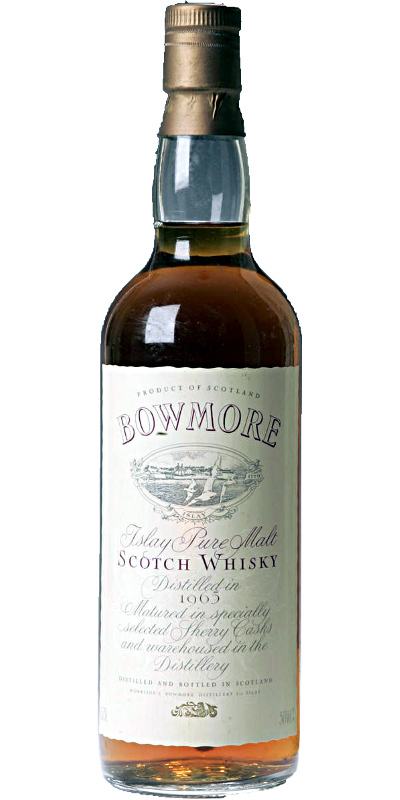 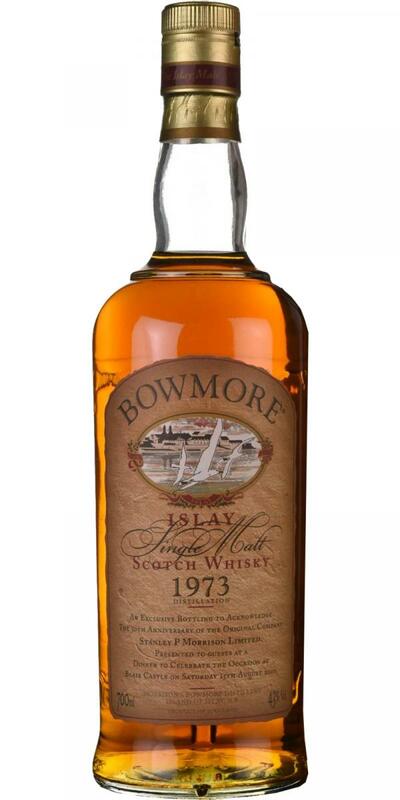 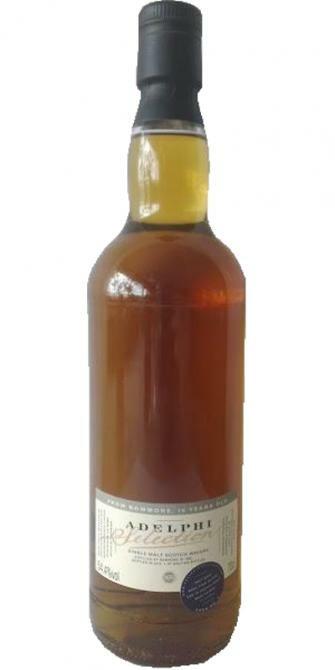 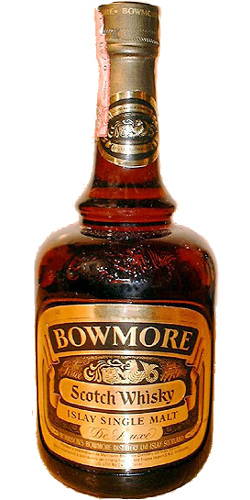 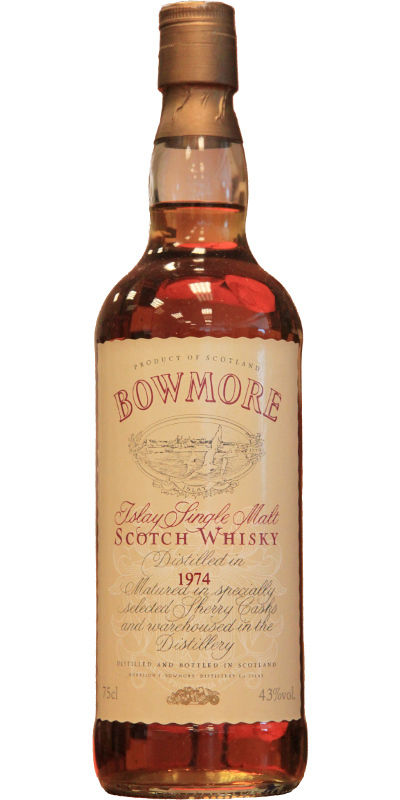 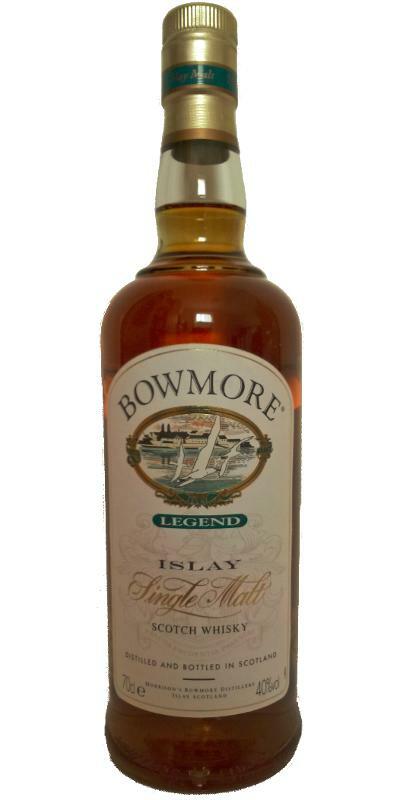 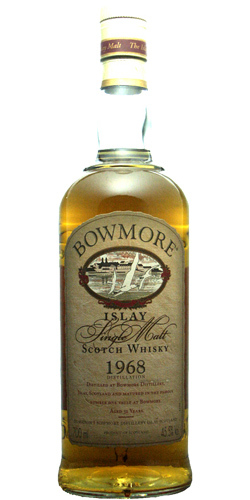 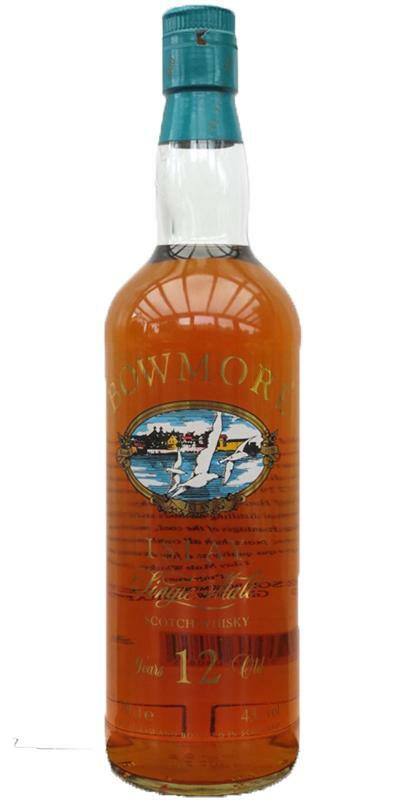 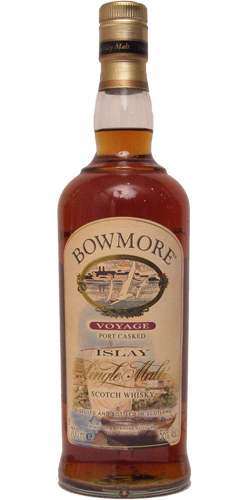 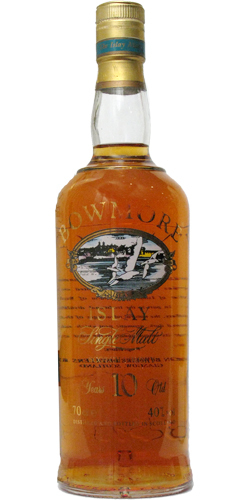 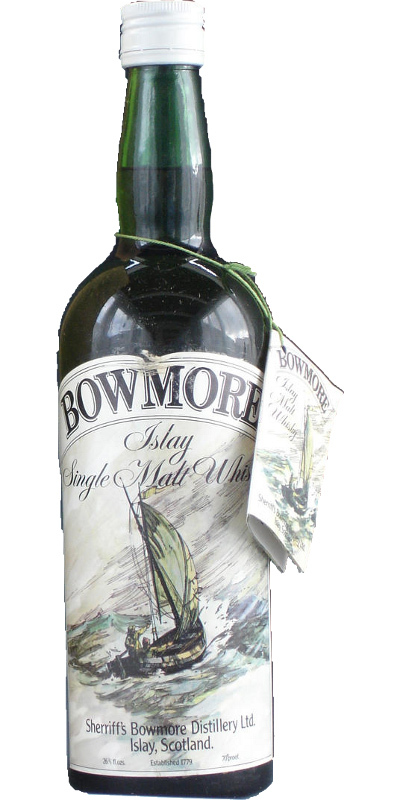 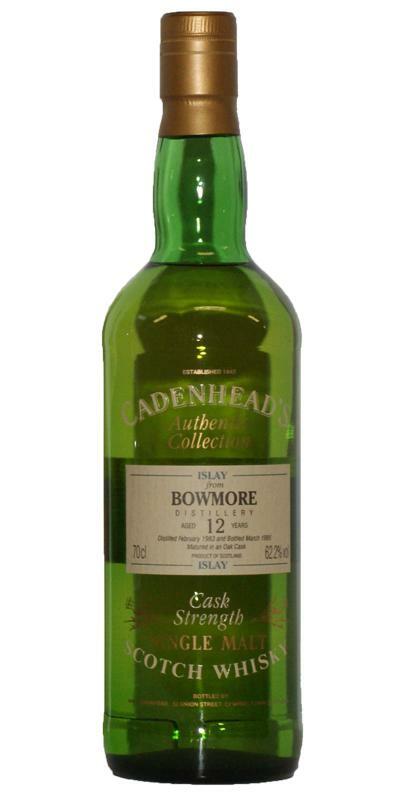 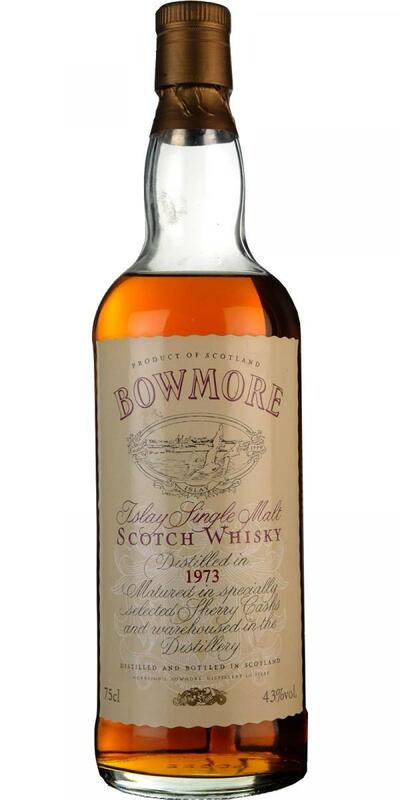 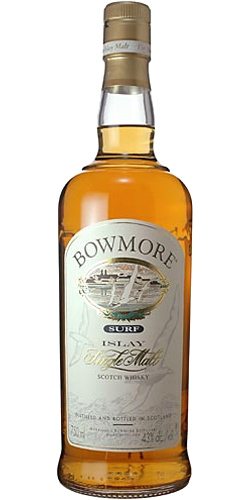 Bowmore 1971 Islay Pure Malt 40.0 % Vol. 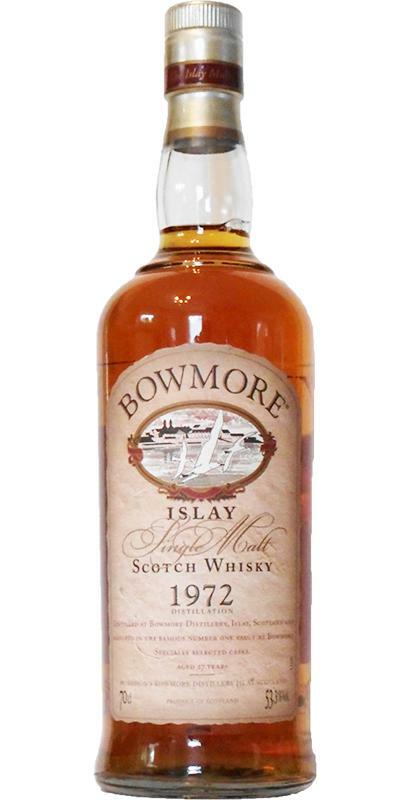 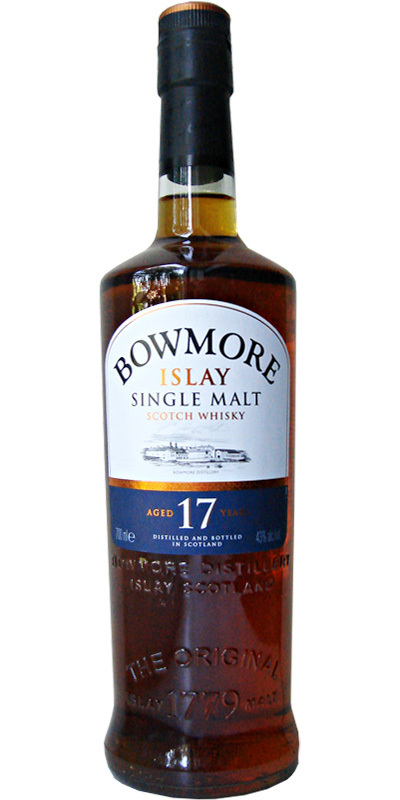 Bowmore 1972 Islay Single Malt 40.0 % Vol. 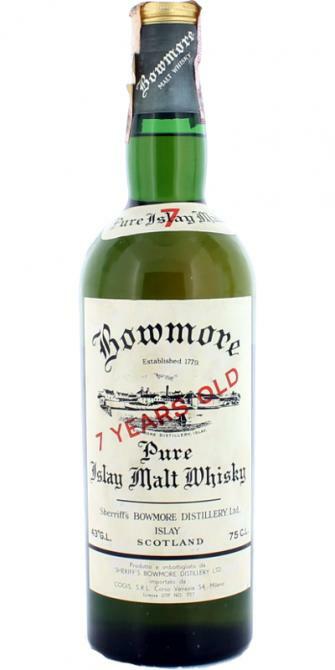 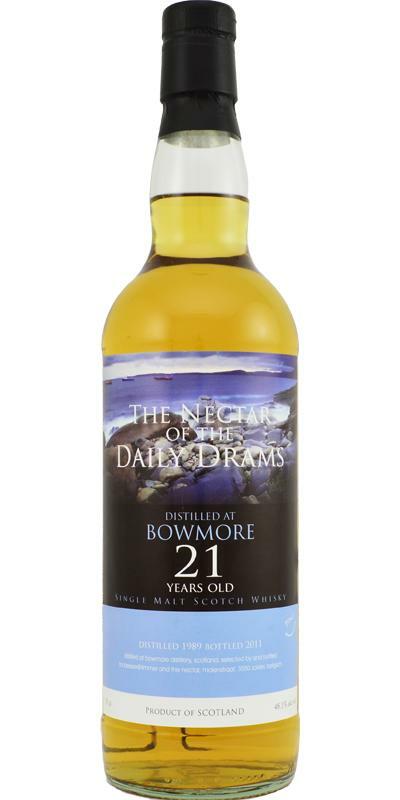 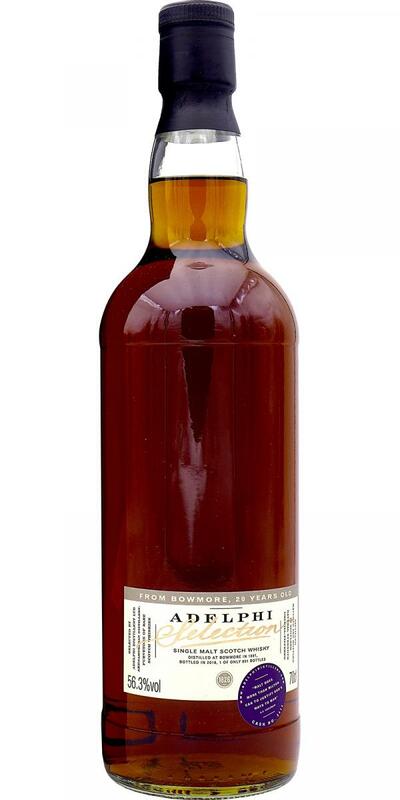 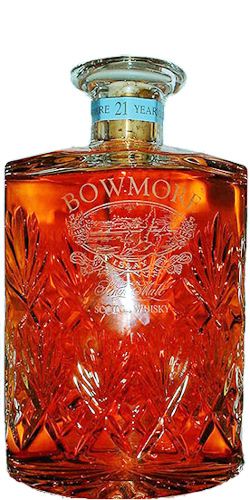 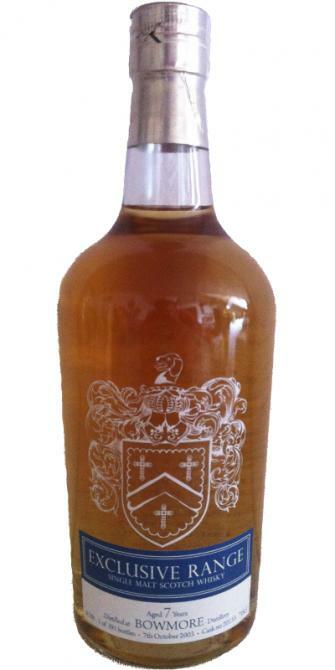 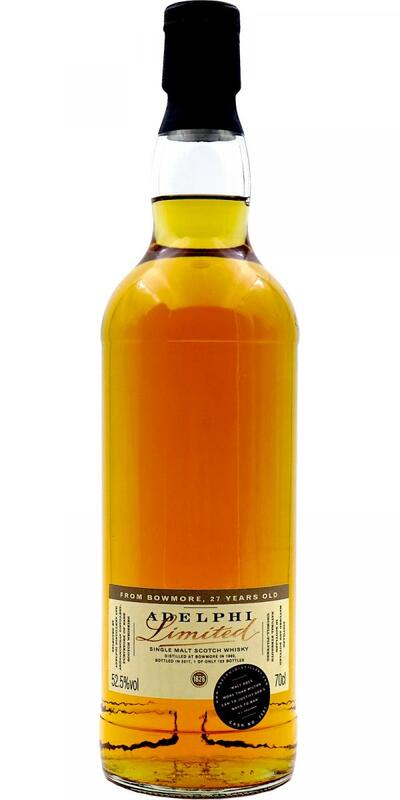 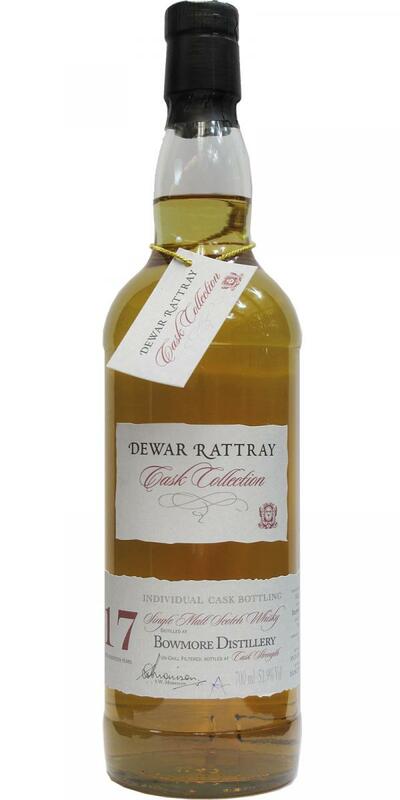 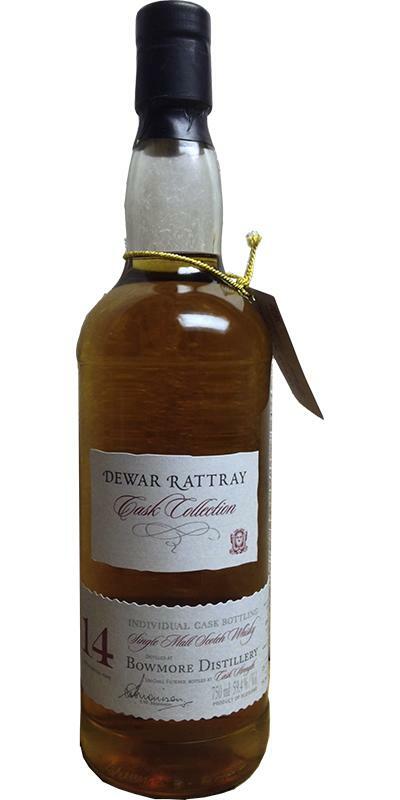 Bowmore 21-year-old Crystal Decanter 21 43.0 % Vol. 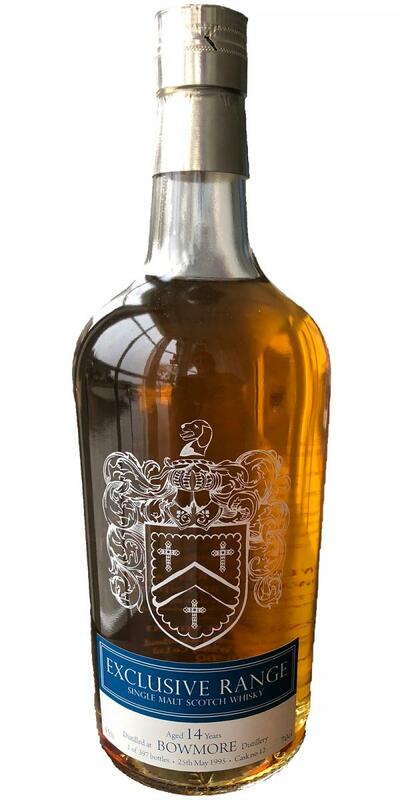 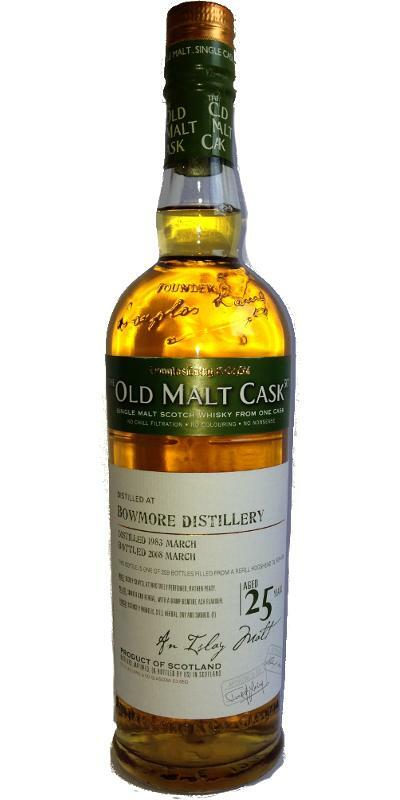 Bowmore 25-year-old The Bowmore Family Gift Pack 25 43.0 % Vol. 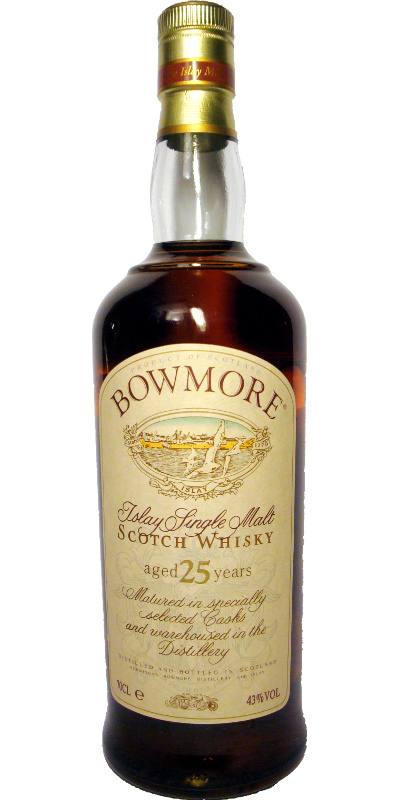 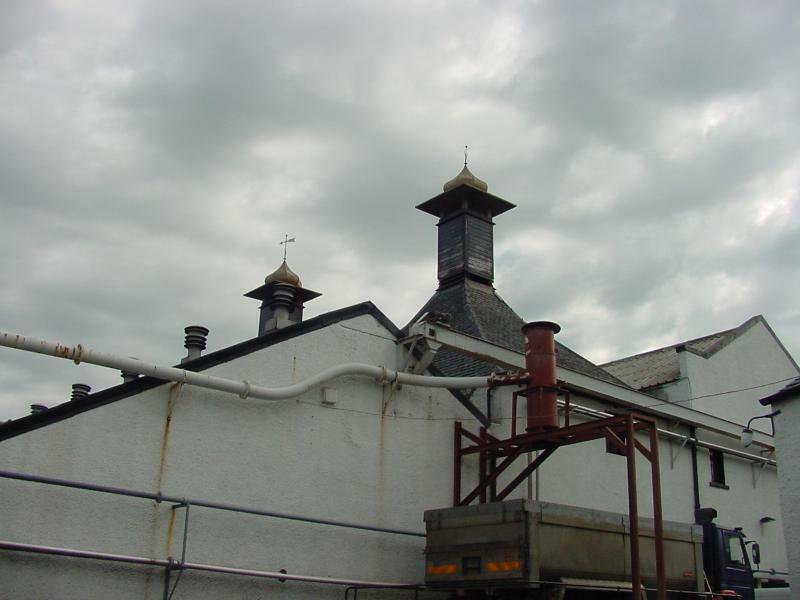 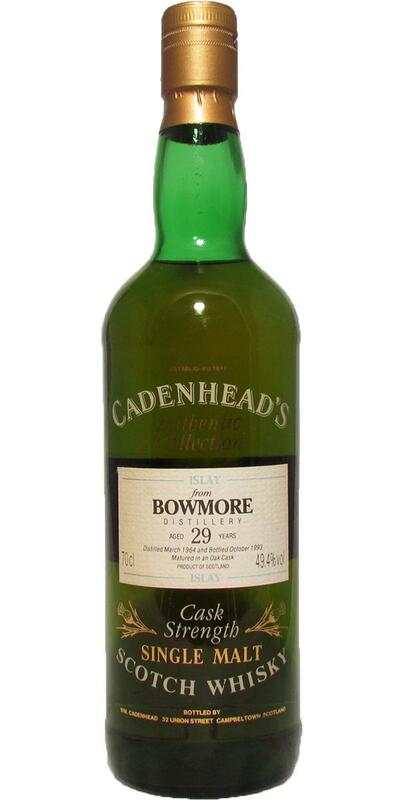 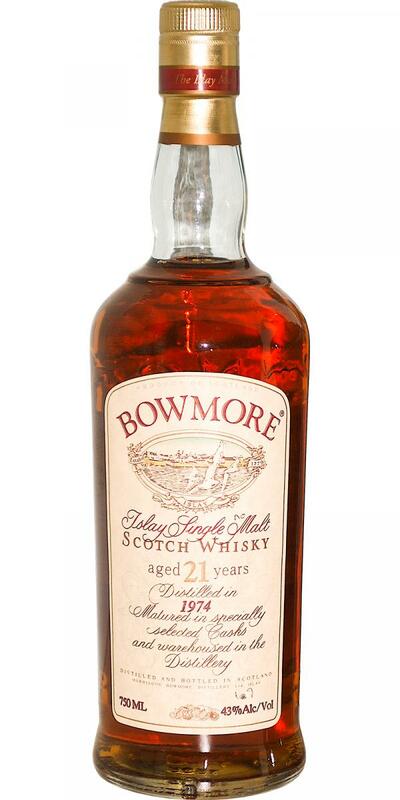 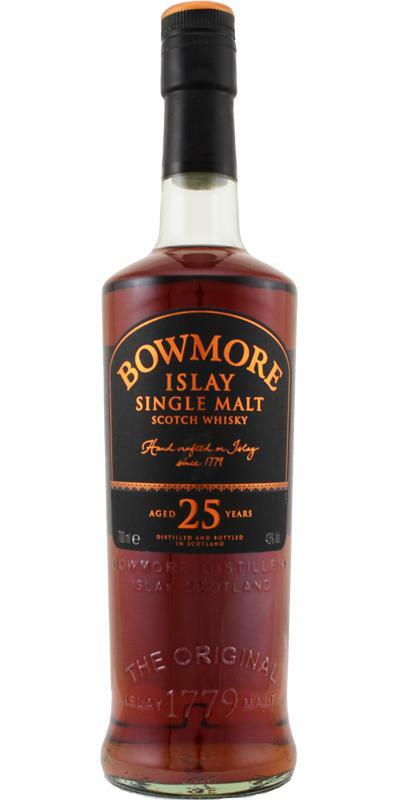 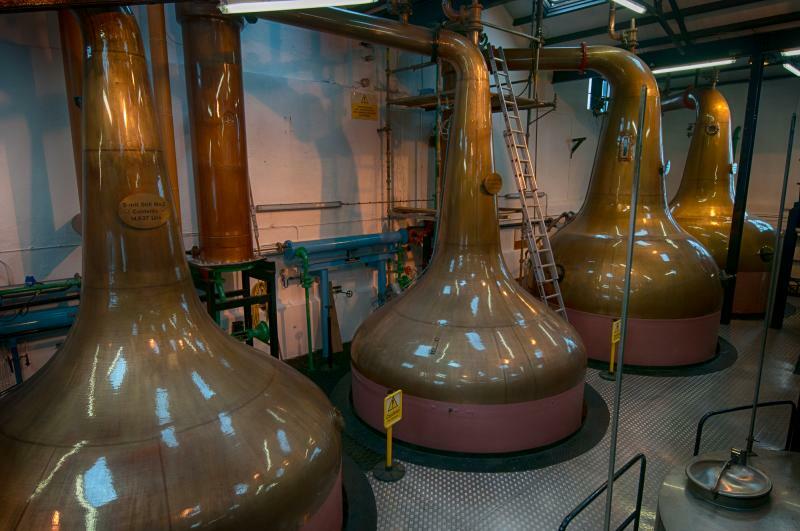 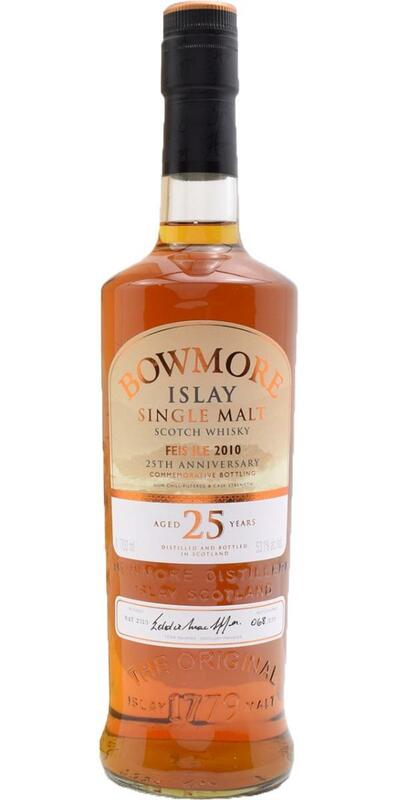 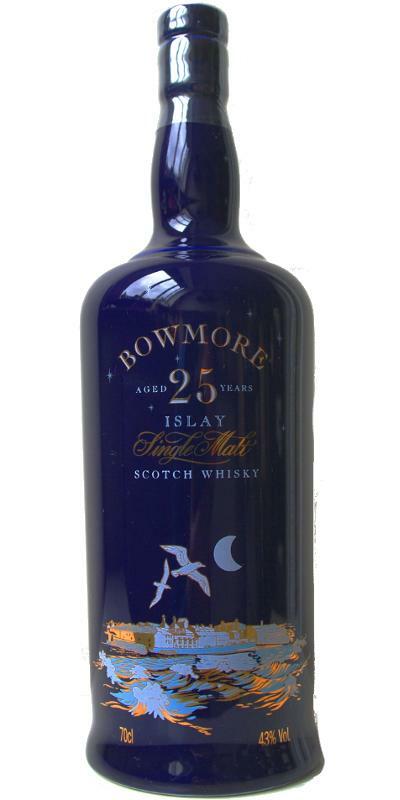 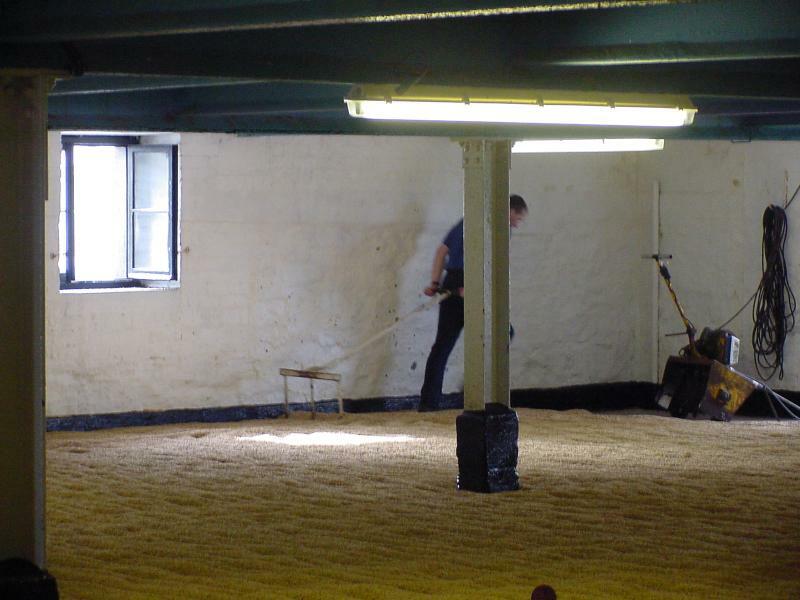 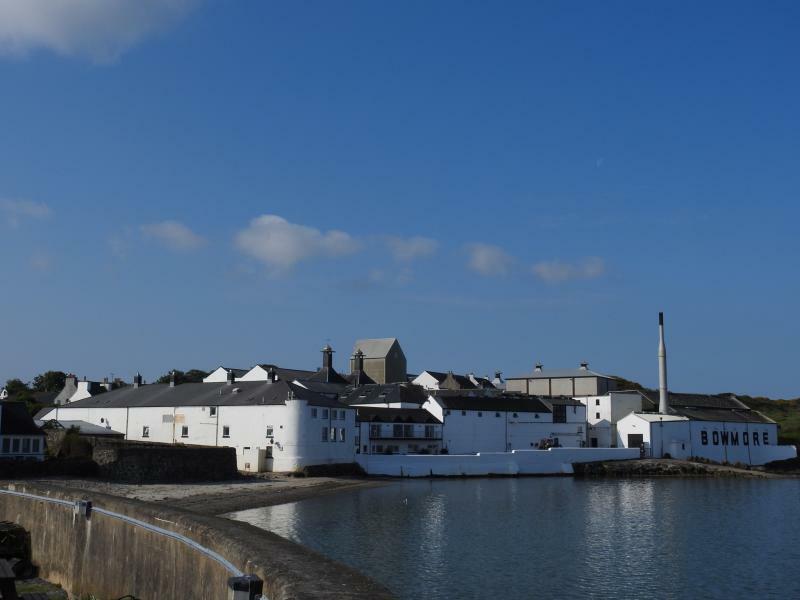 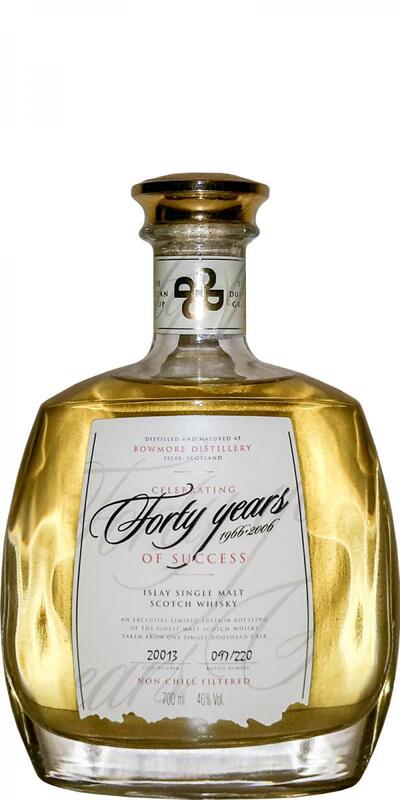 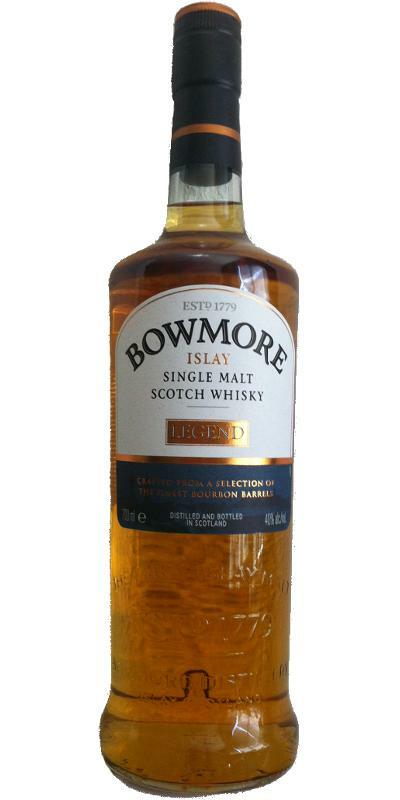 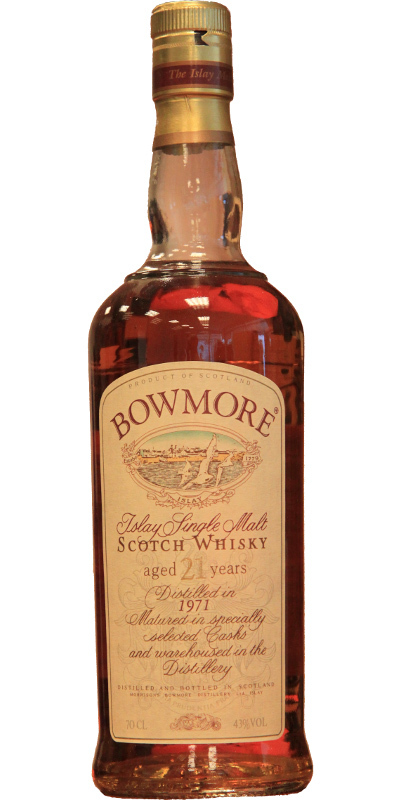 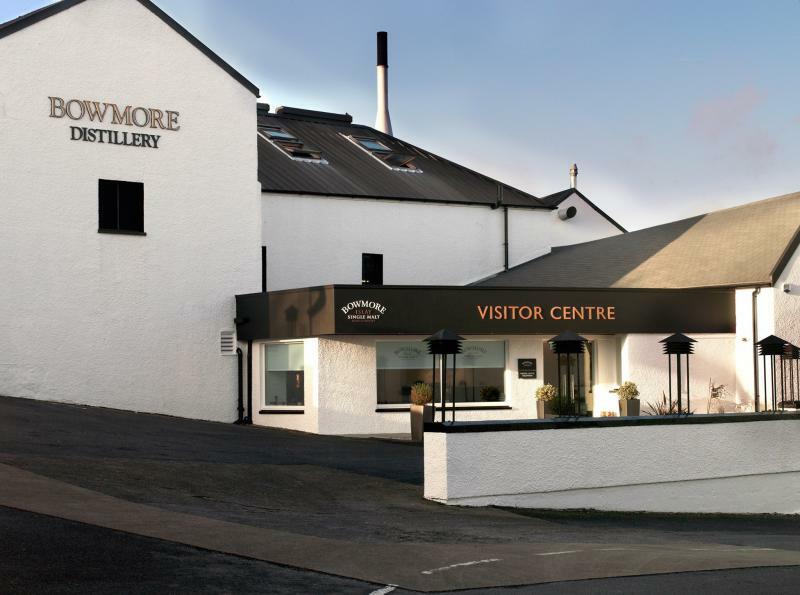 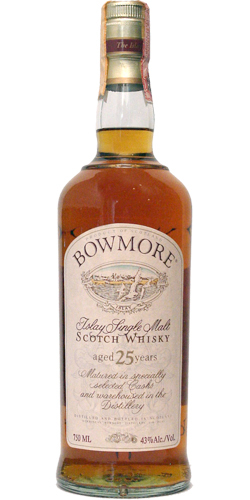 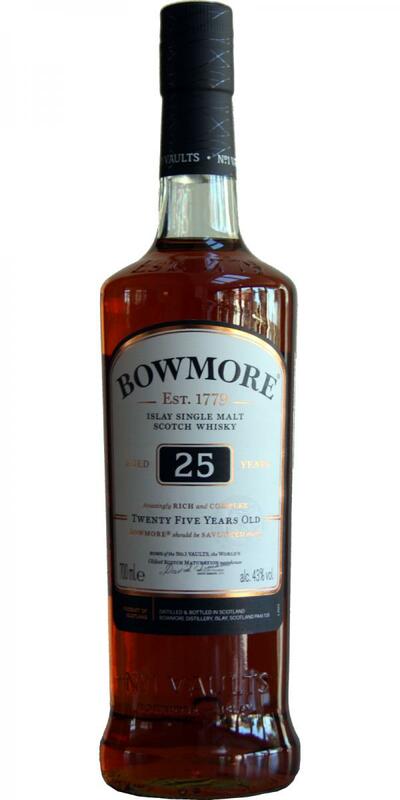 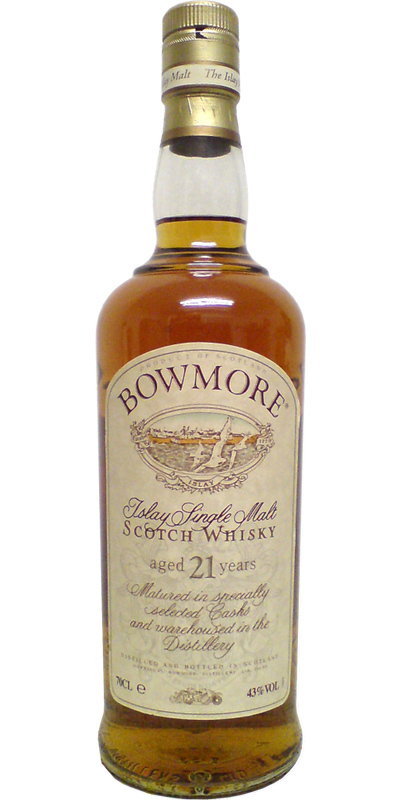 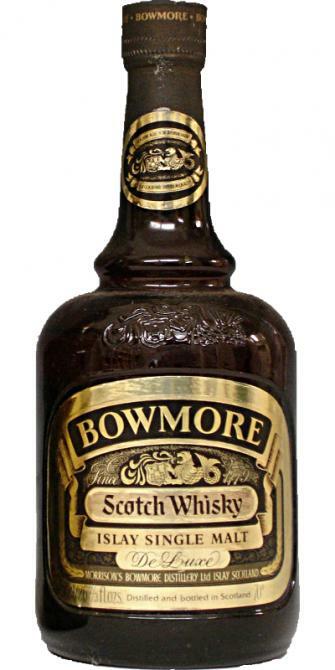 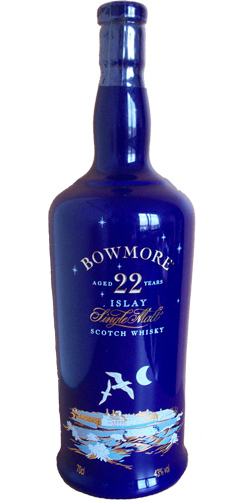 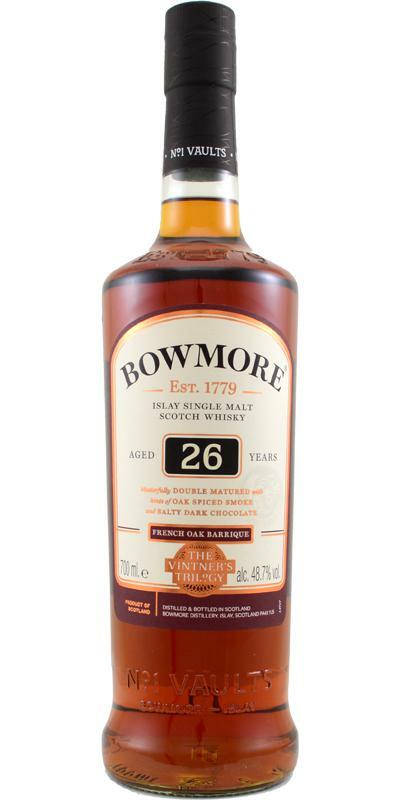 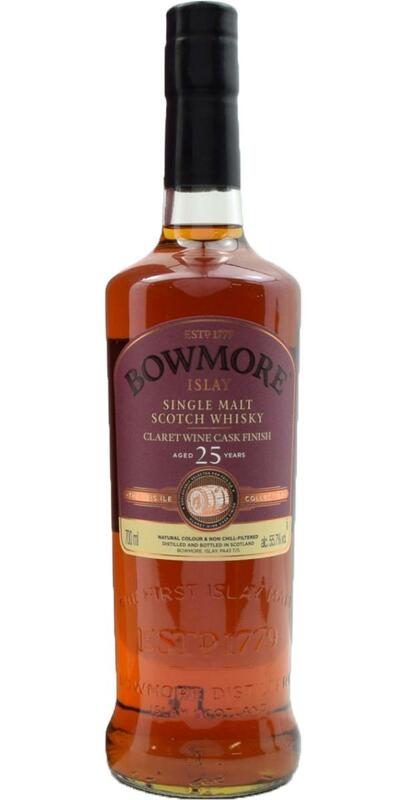 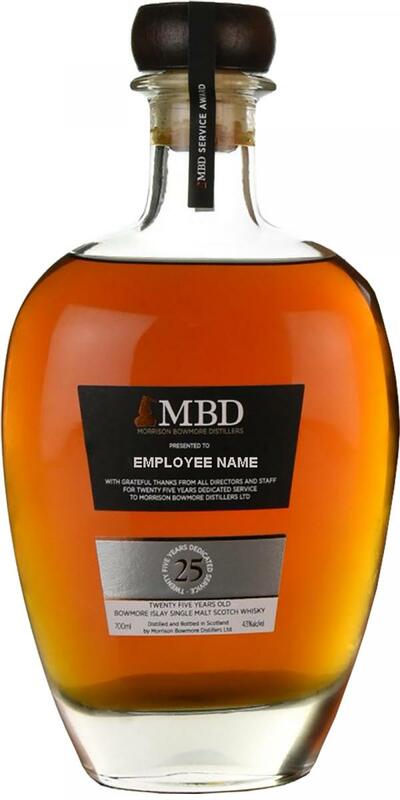 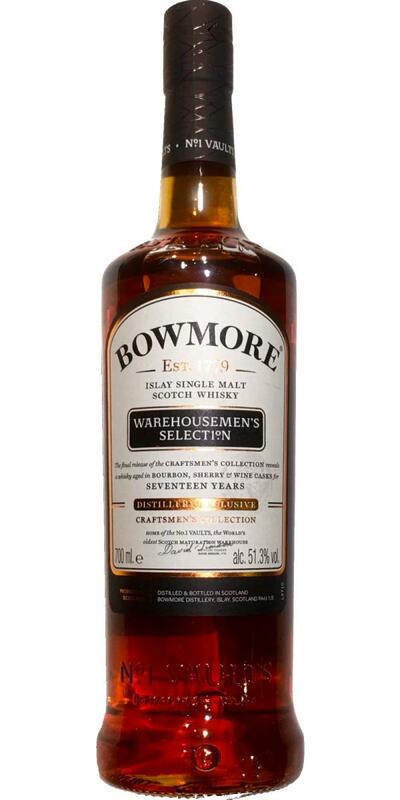 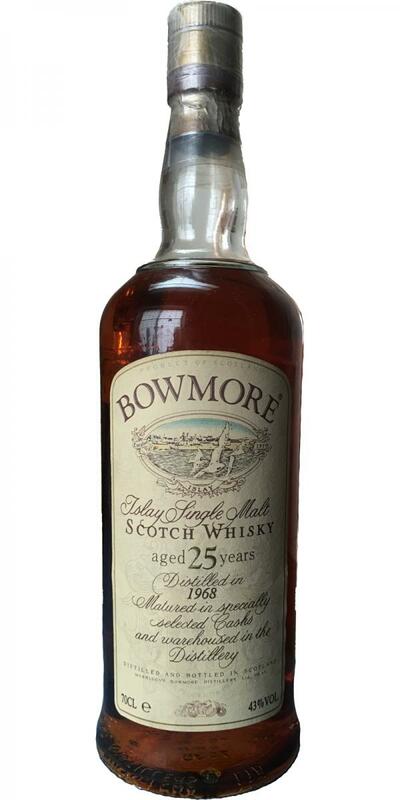 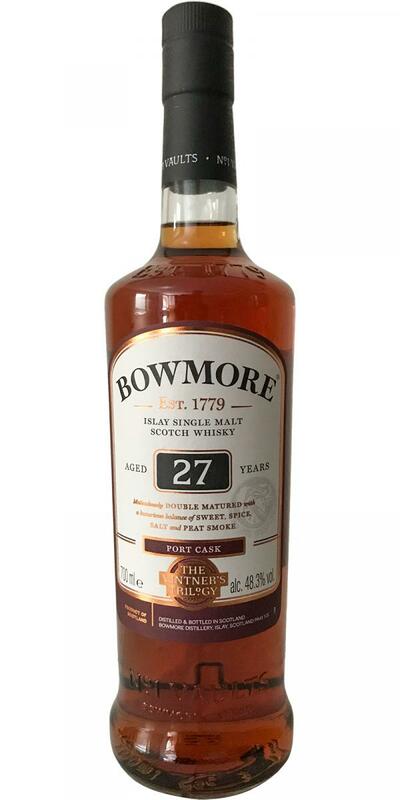 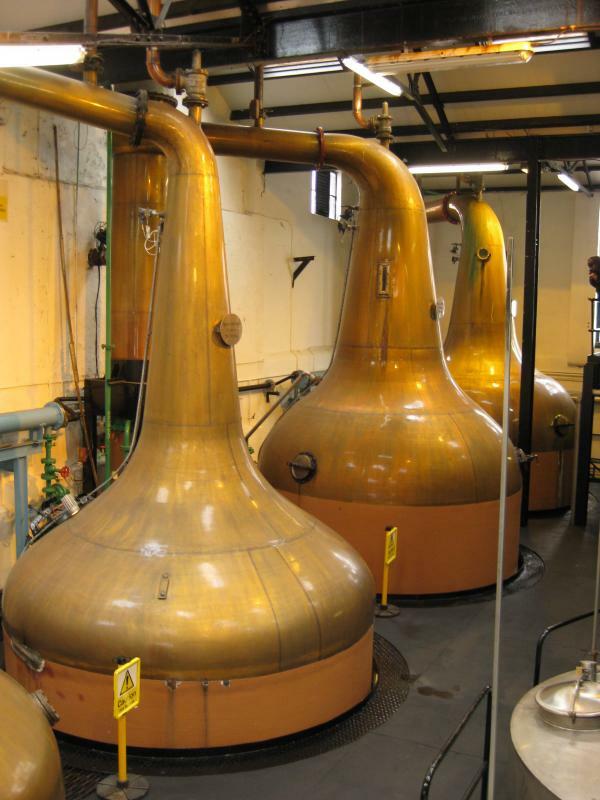 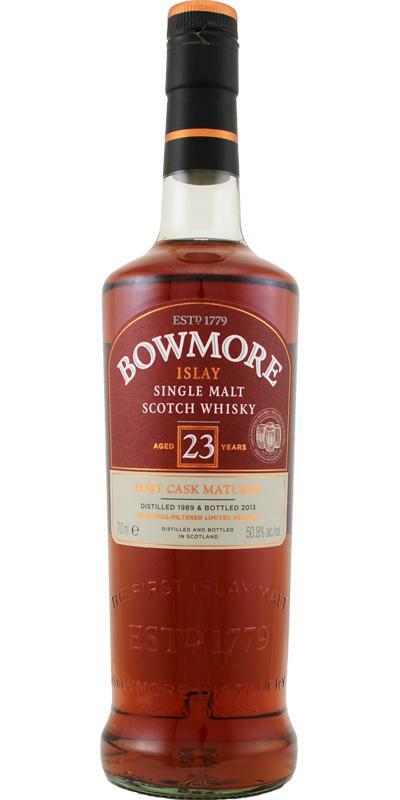 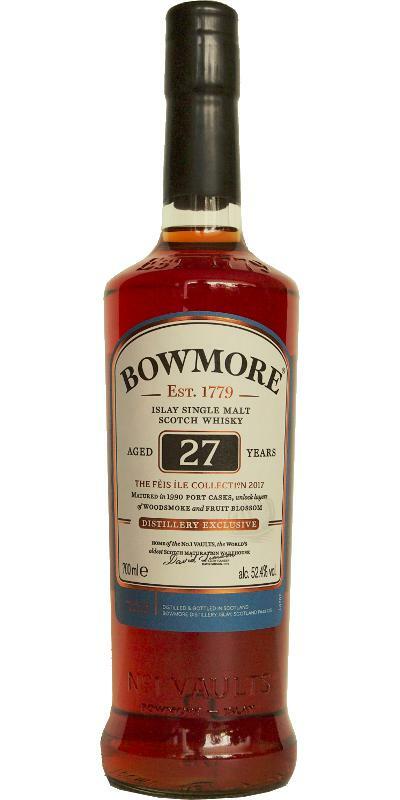 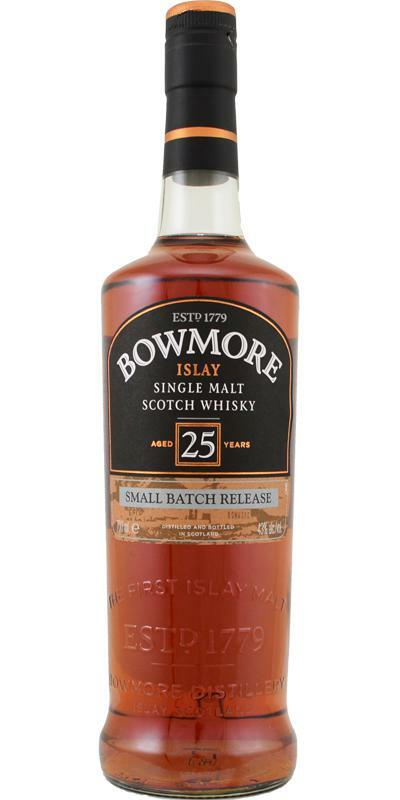 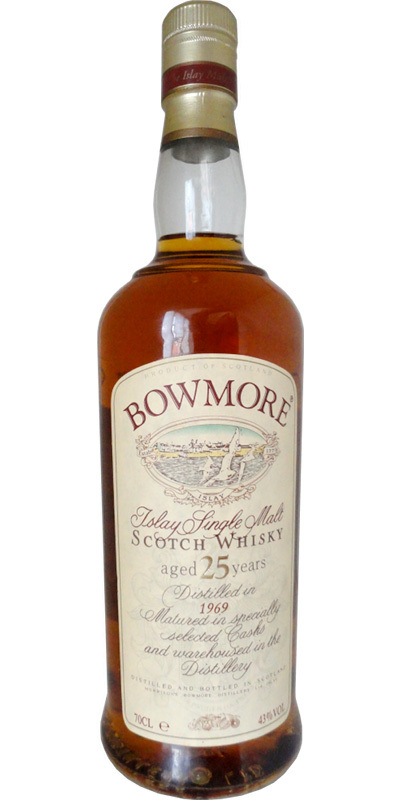 Bowmore 25-year-old 25 Years Dedicated Service 25 43.0 % Vol. 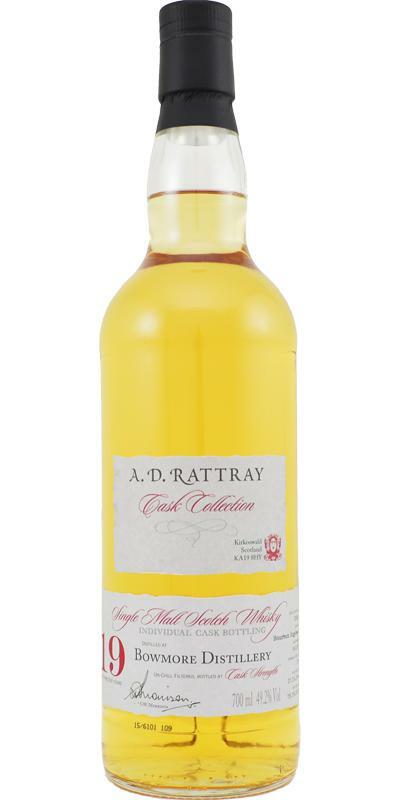 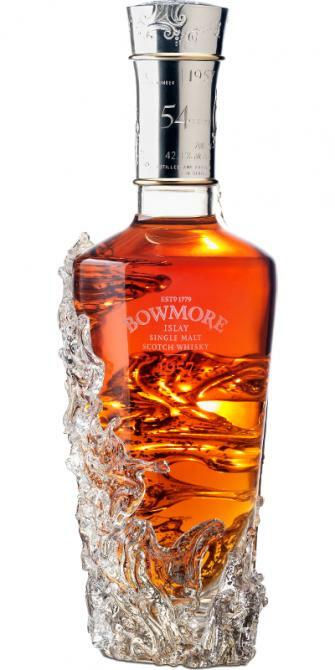 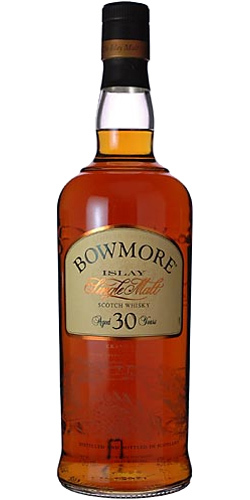 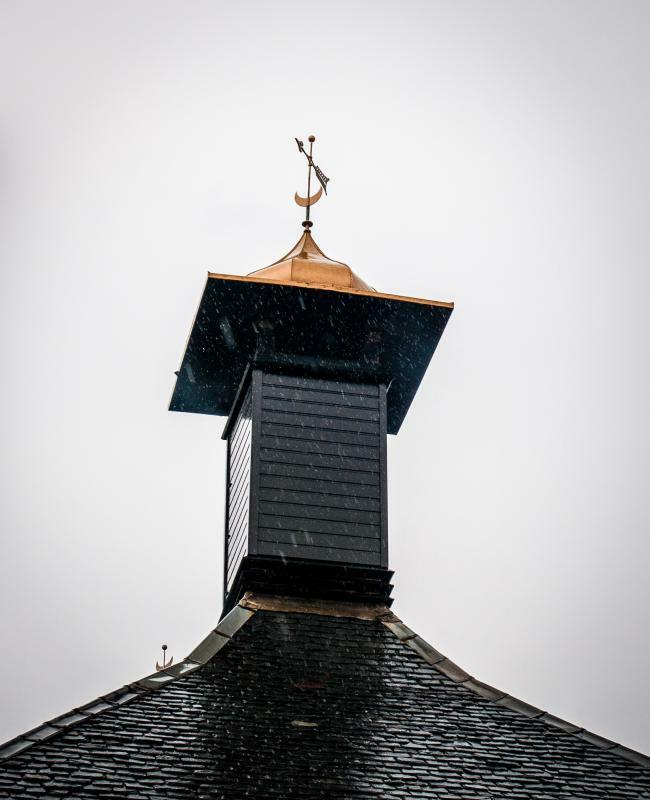 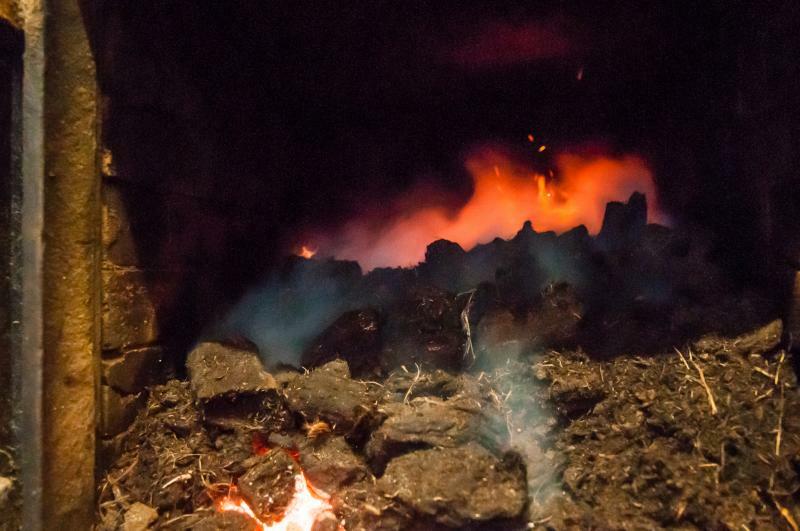 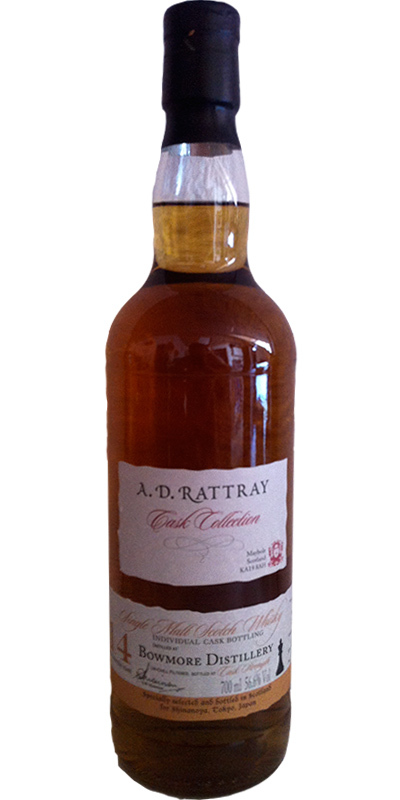 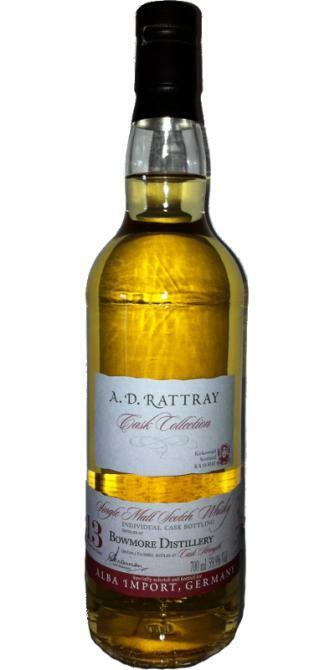 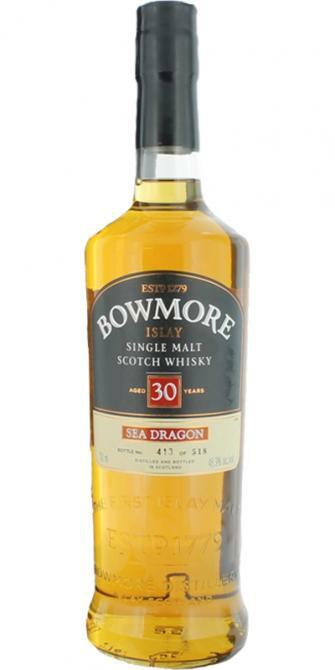 Bowmore 30-year-old Sea Dragon 30 43.0 % Vol. 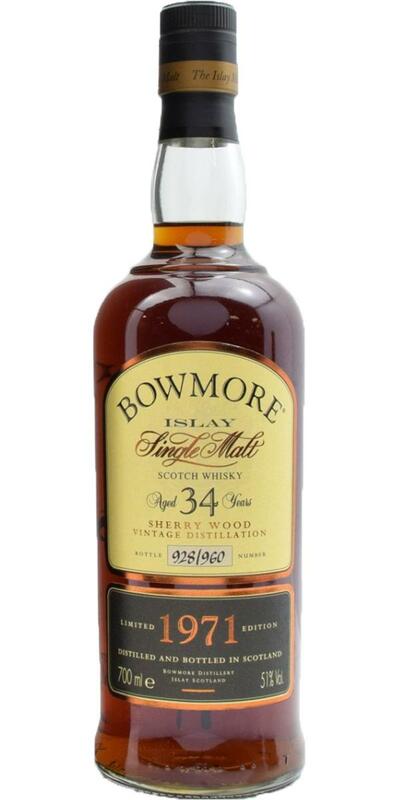 Bowmore 43-year-old 43 43.2 % Vol. 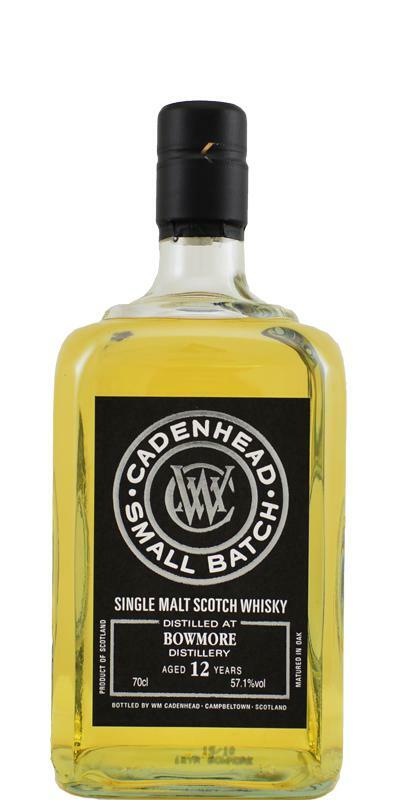 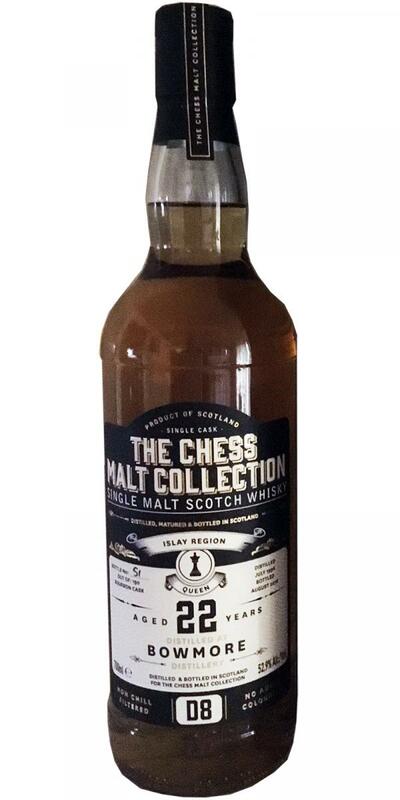 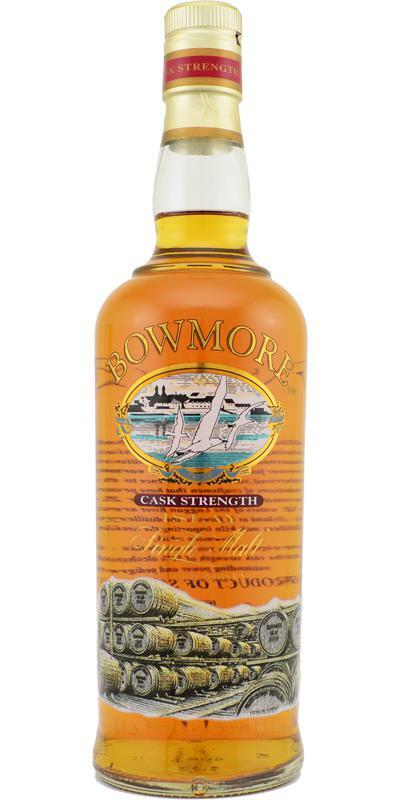 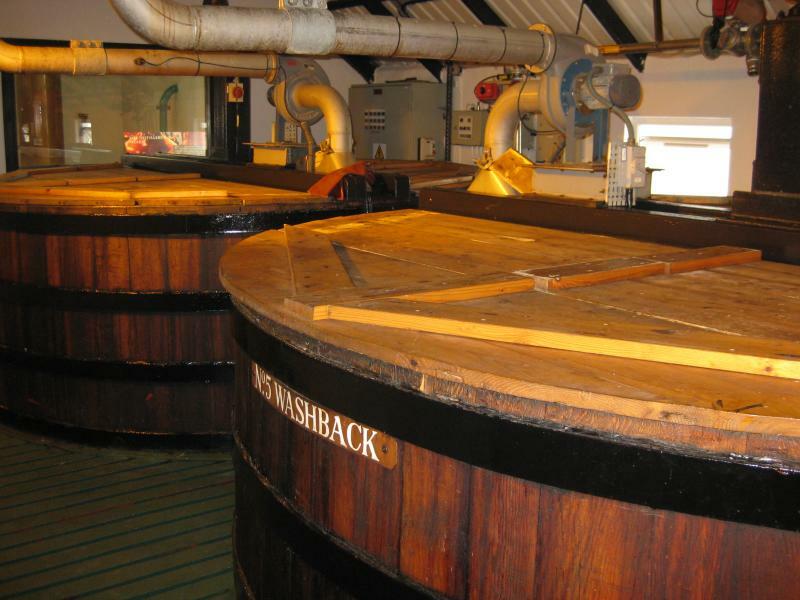 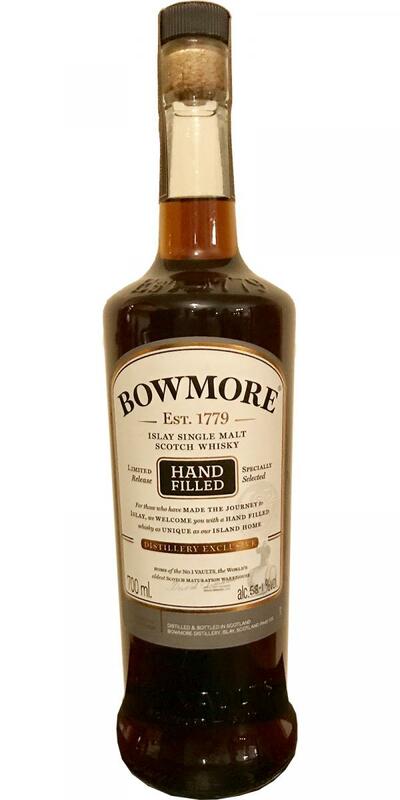 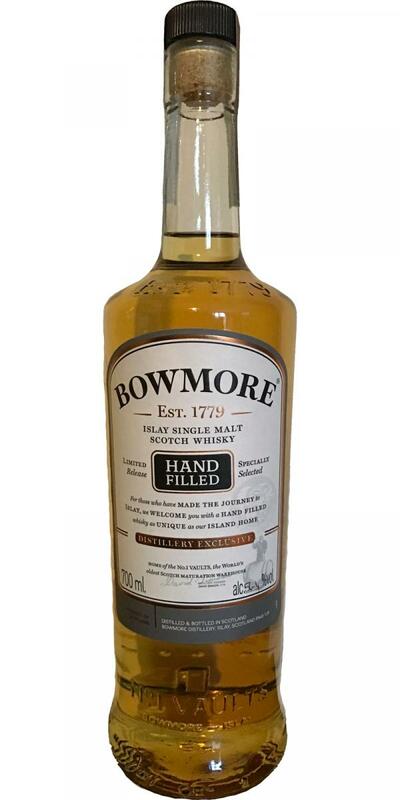 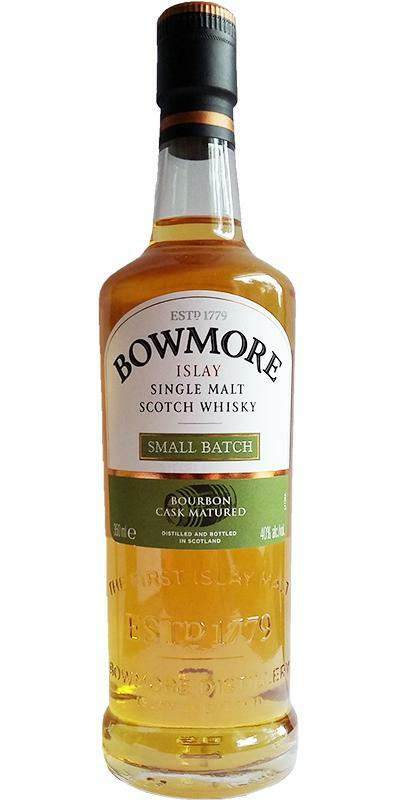 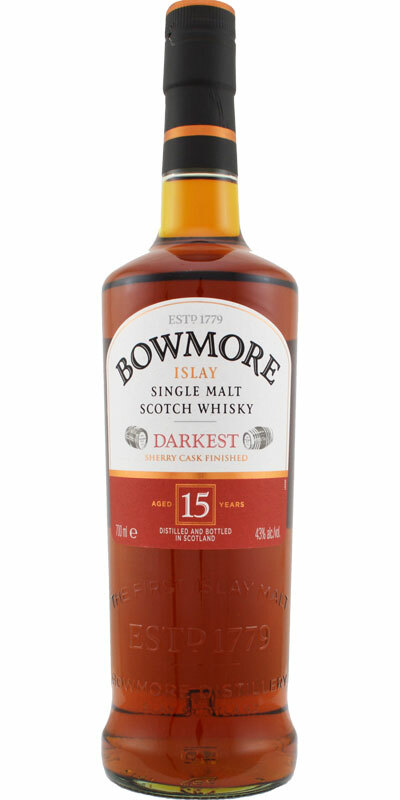 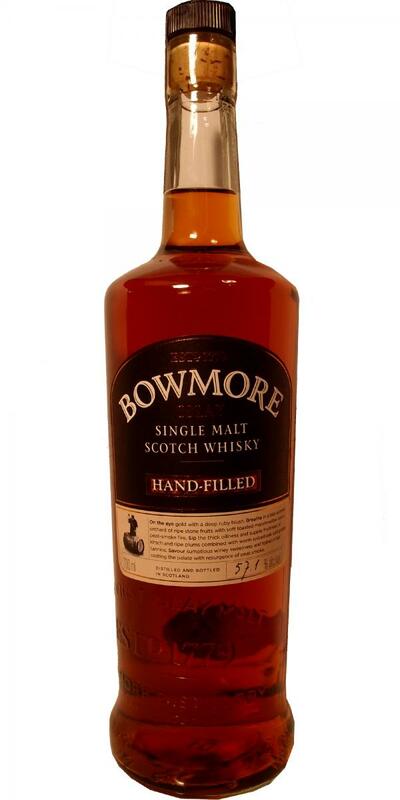 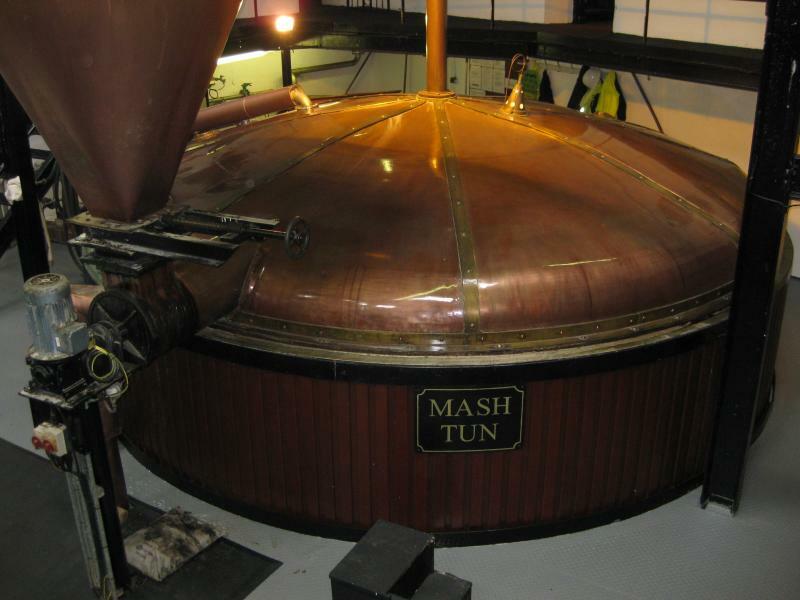 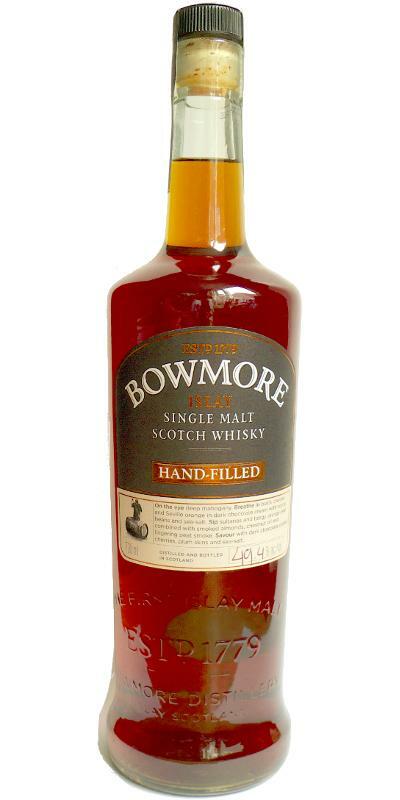 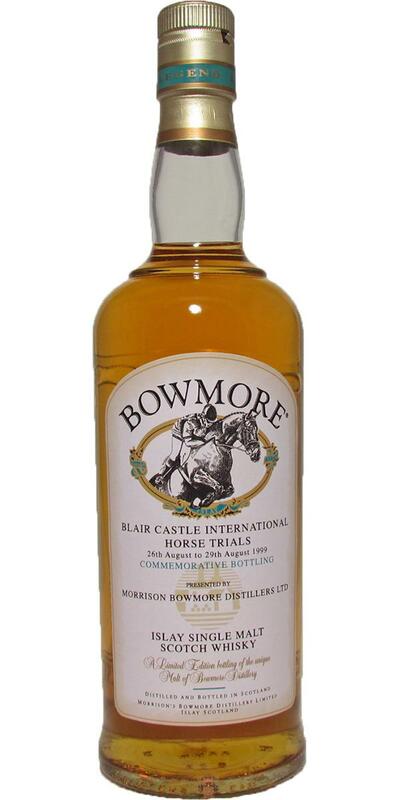 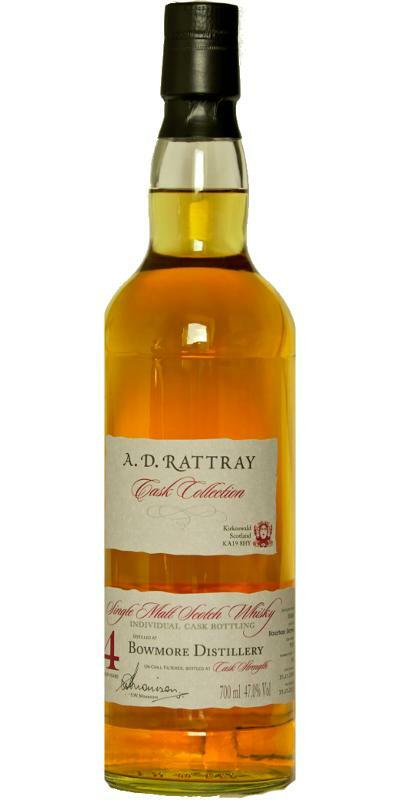 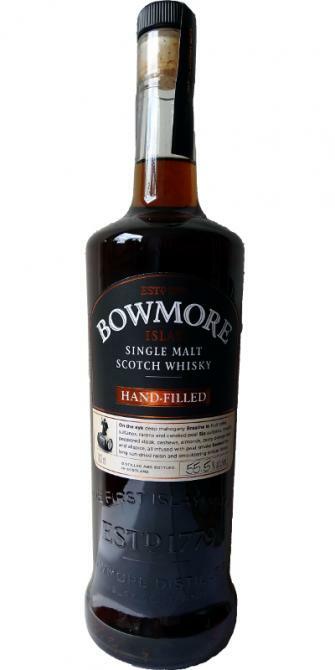 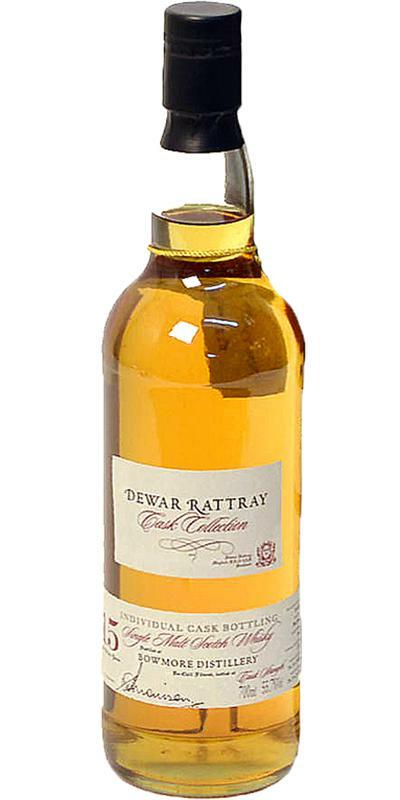 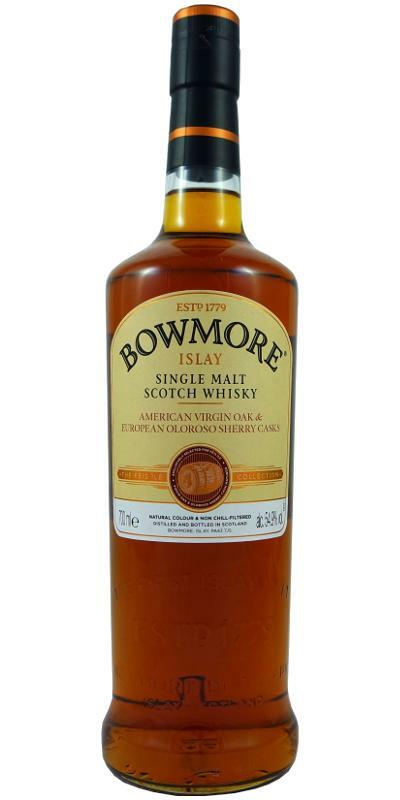 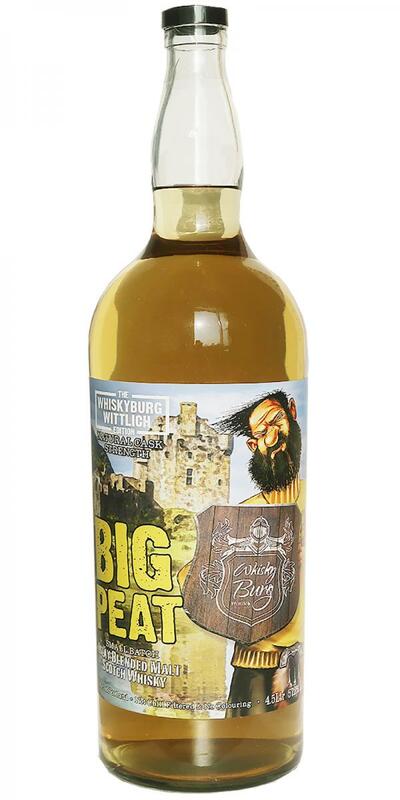 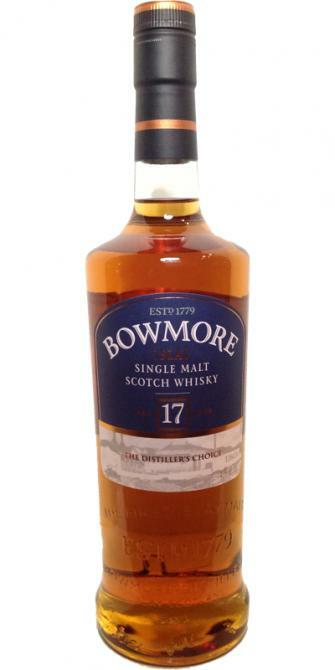 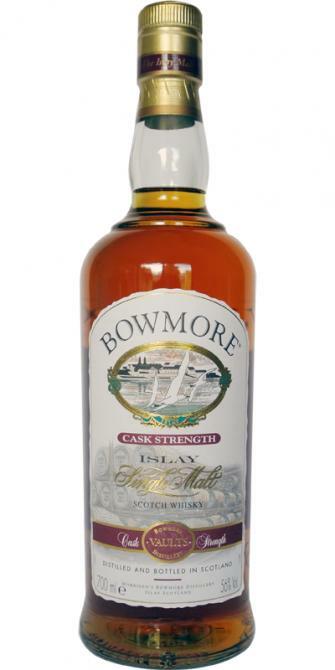 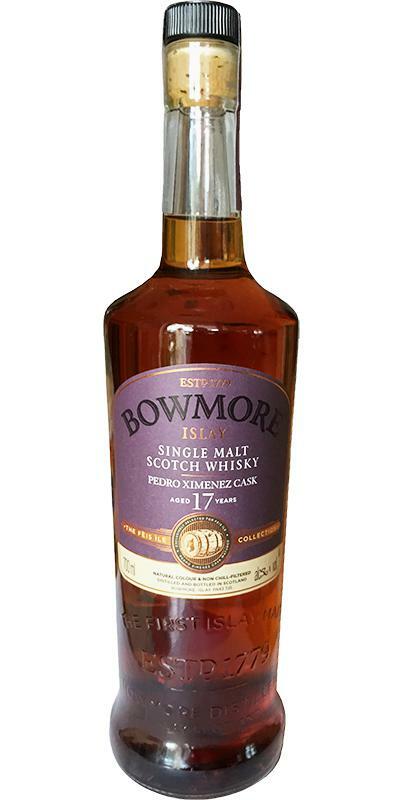 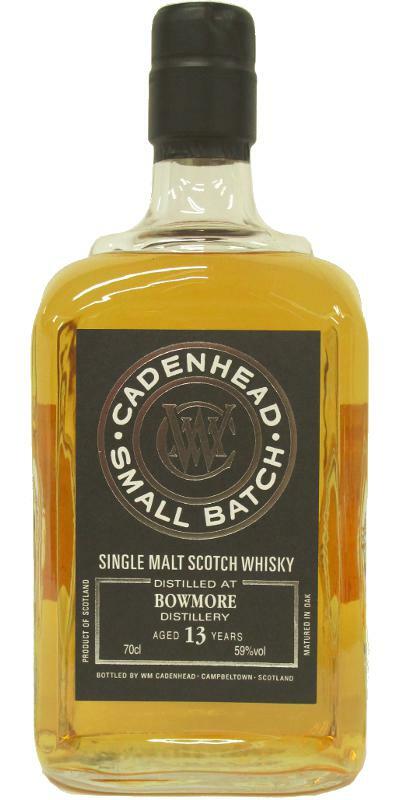 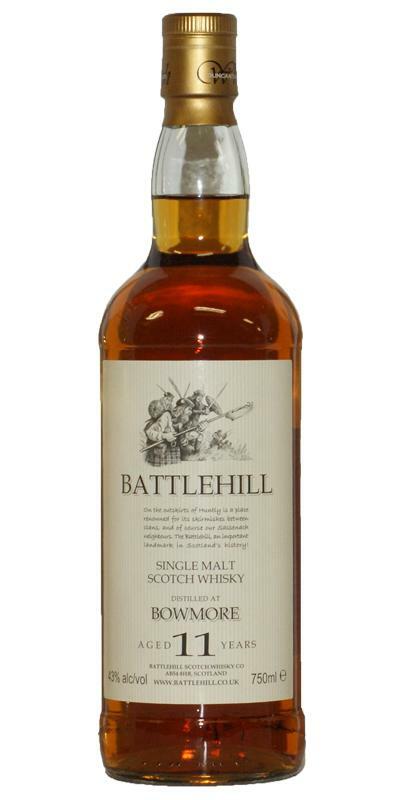 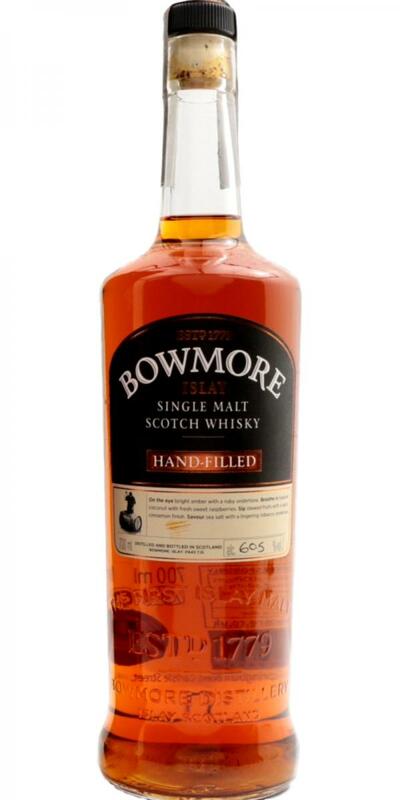 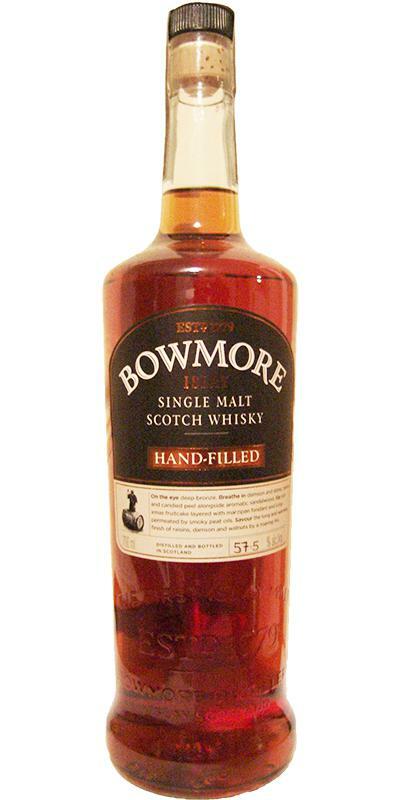 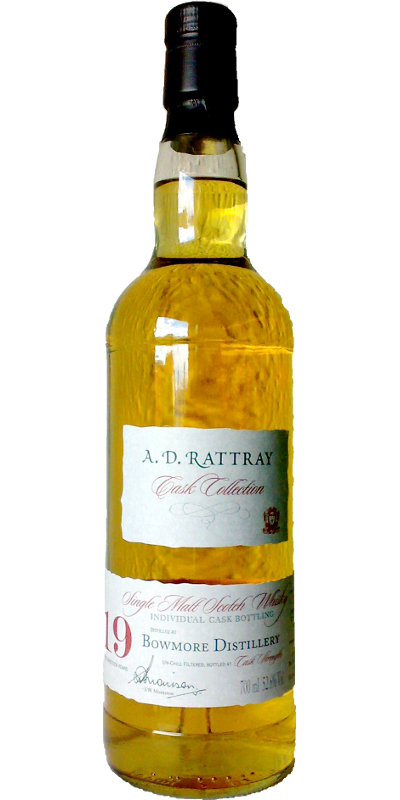 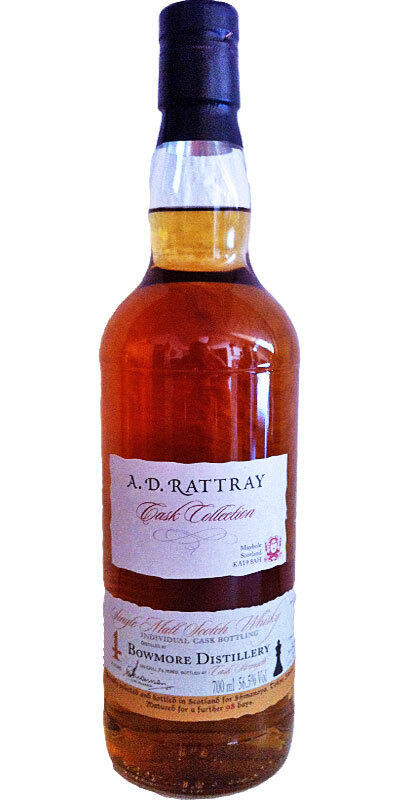 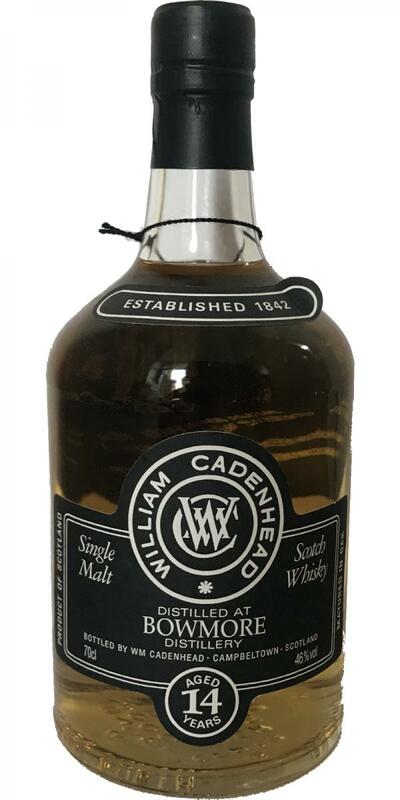 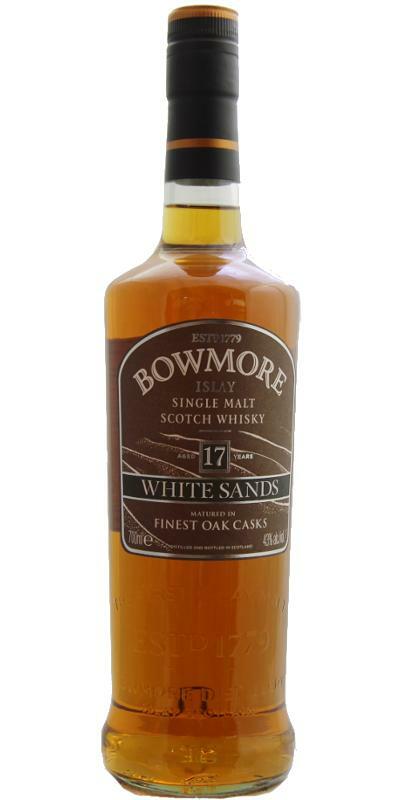 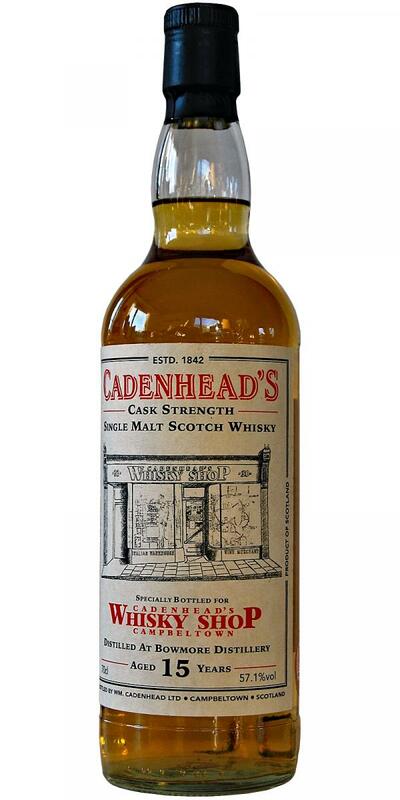 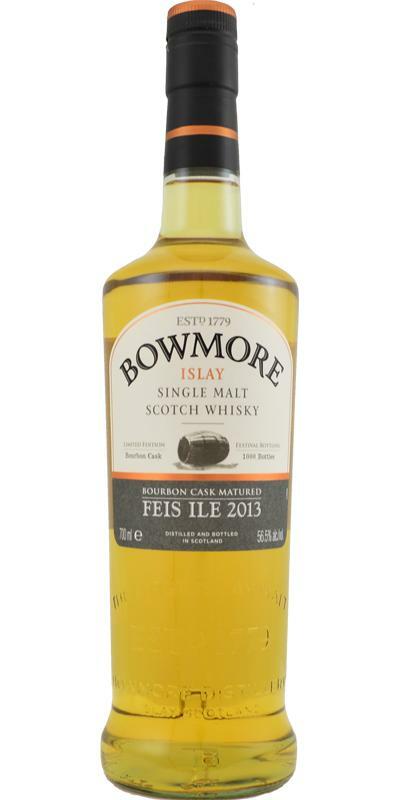 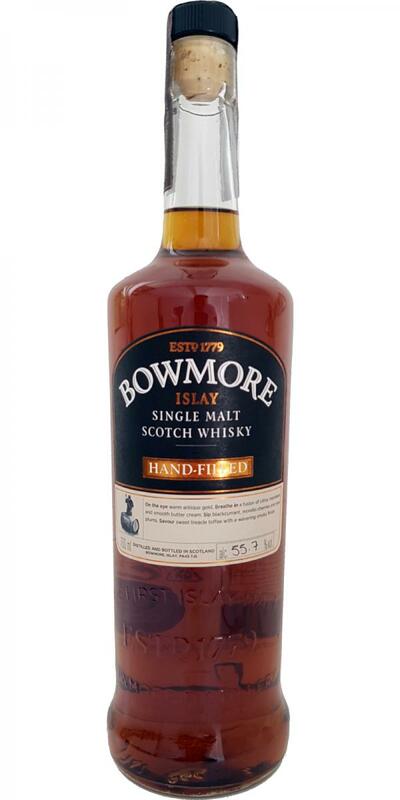 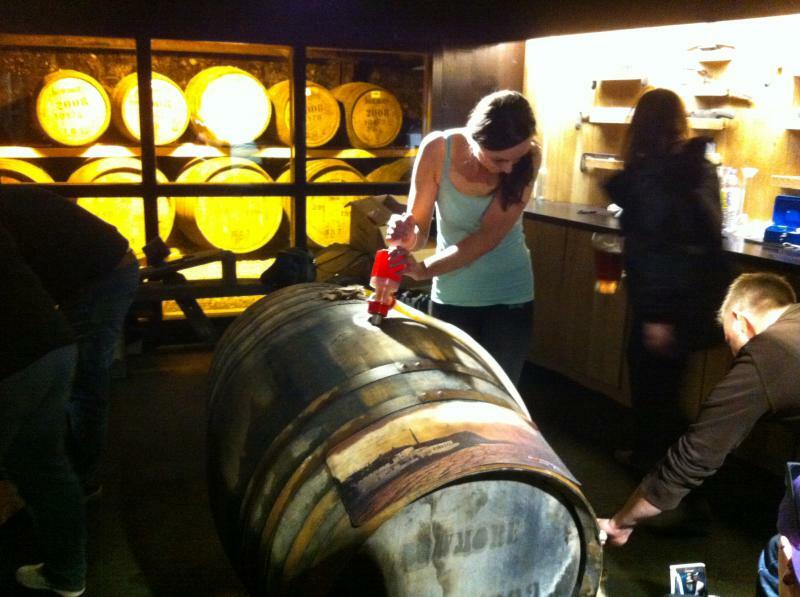 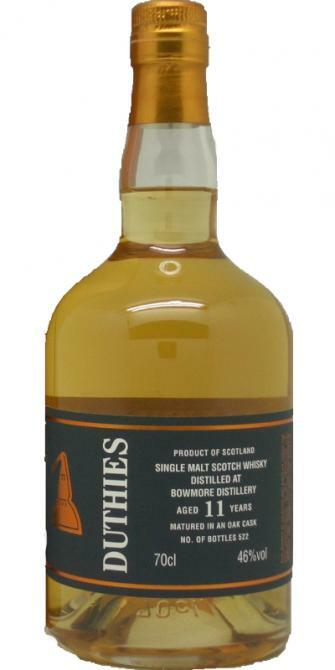 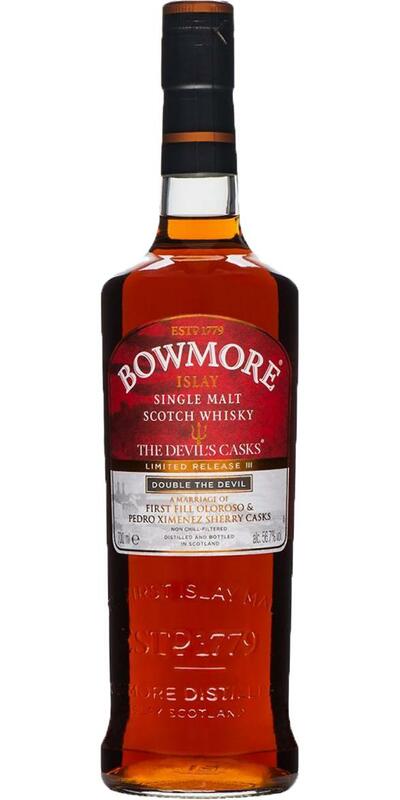 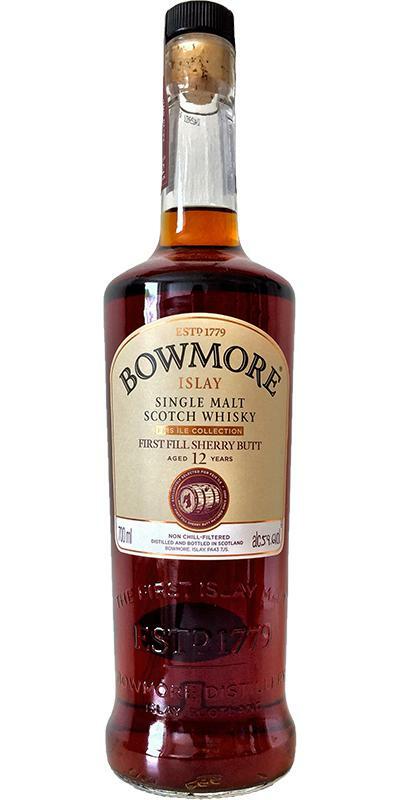 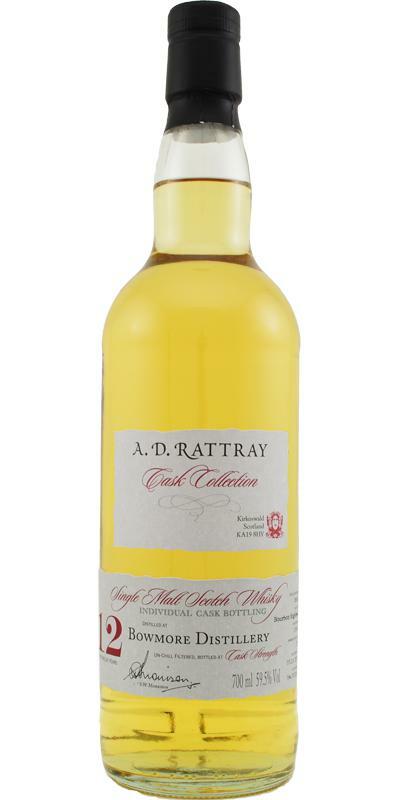 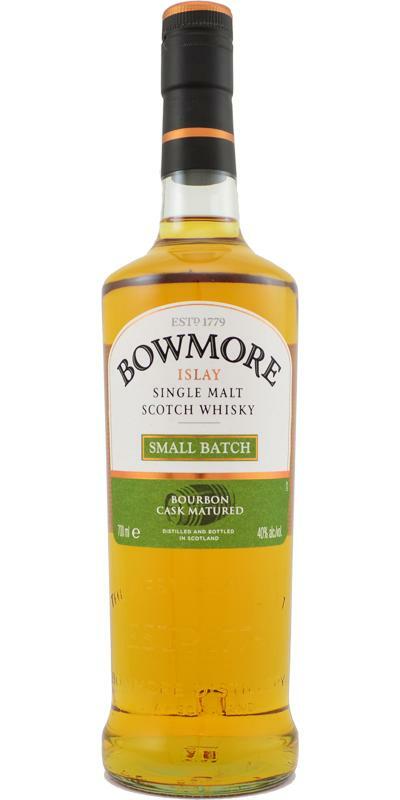 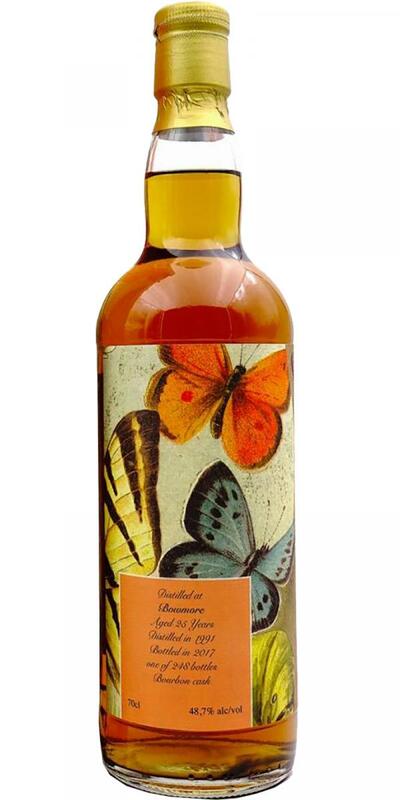 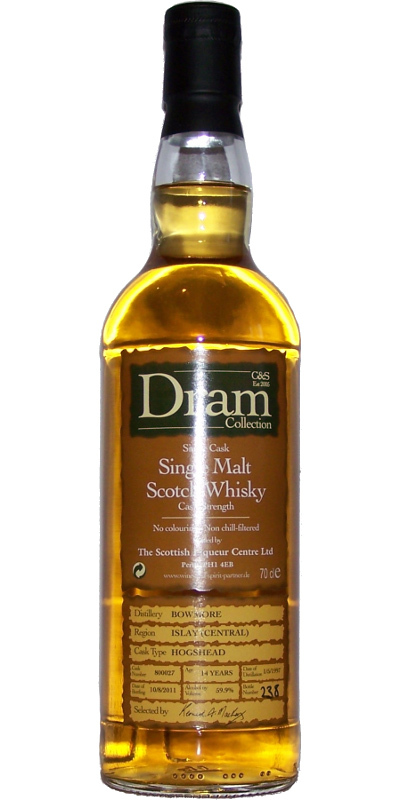 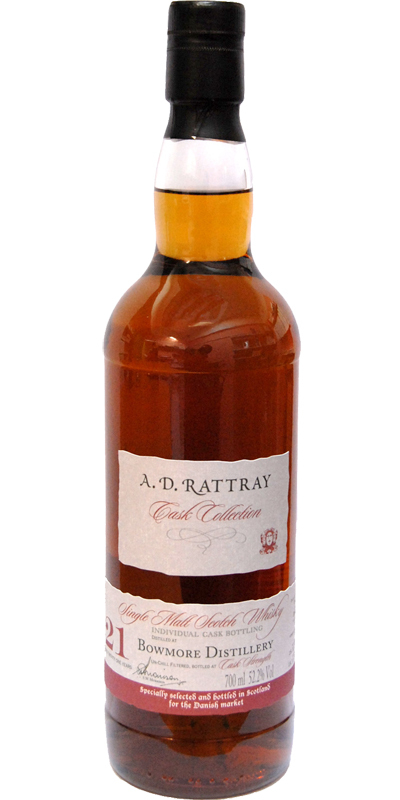 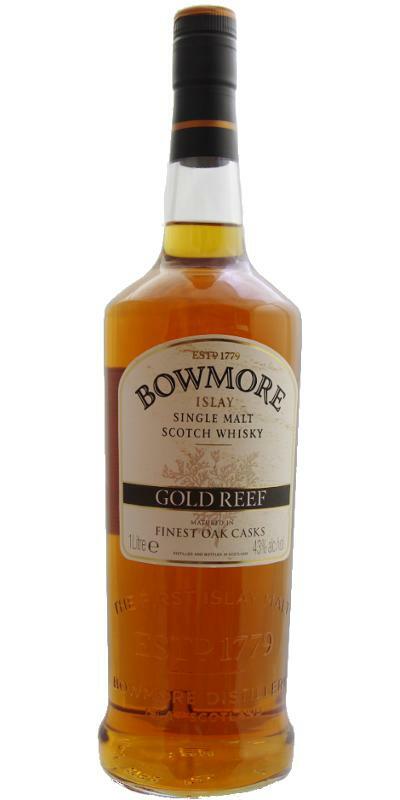 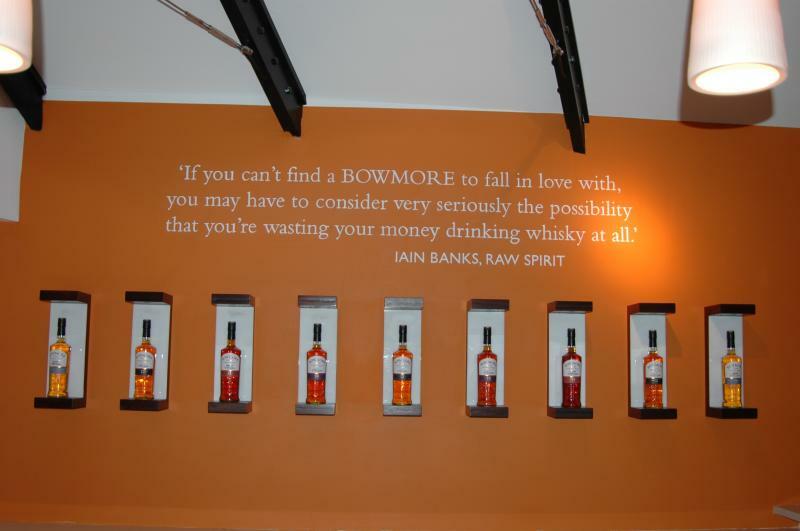 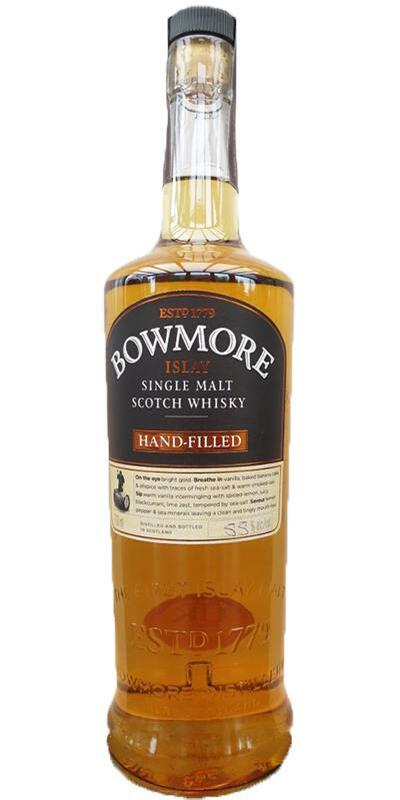 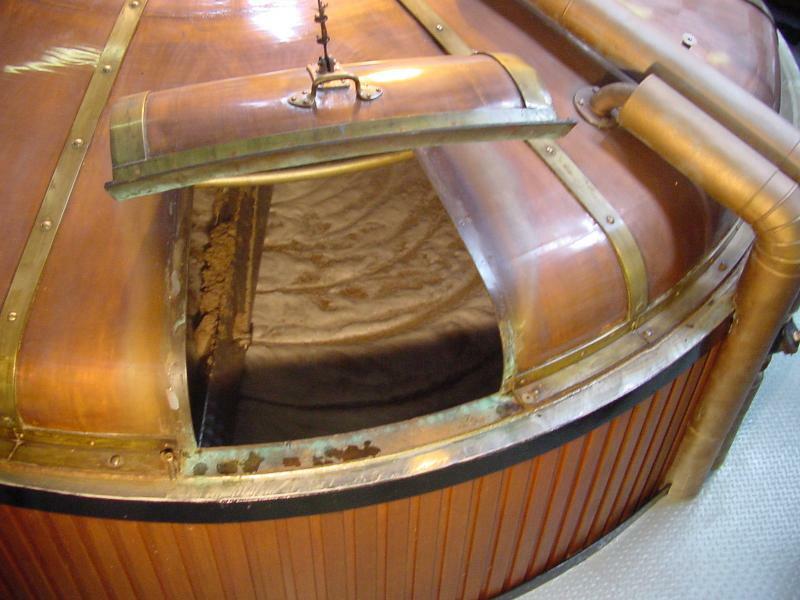 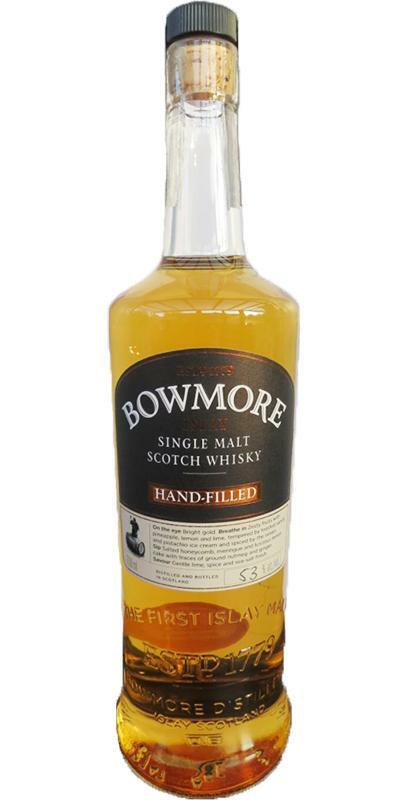 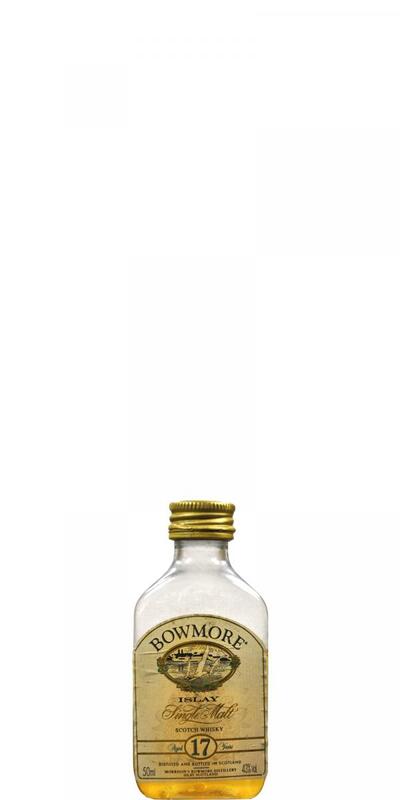 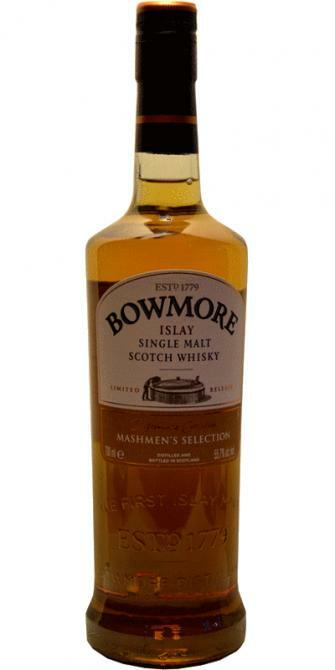 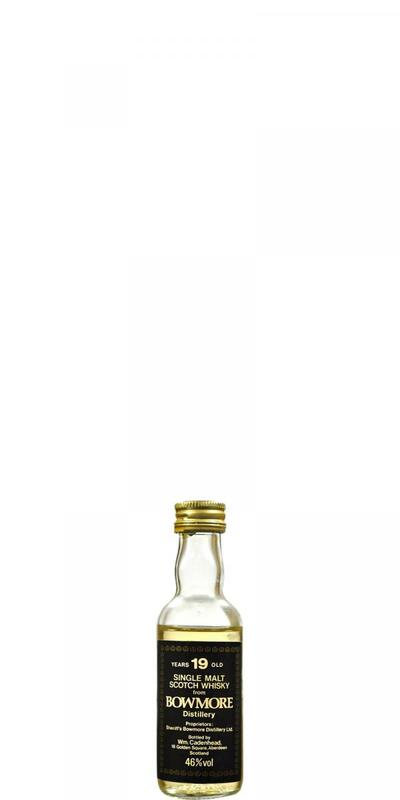 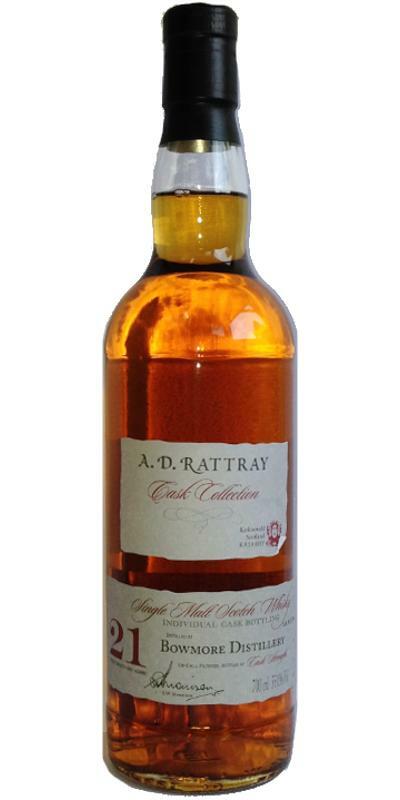 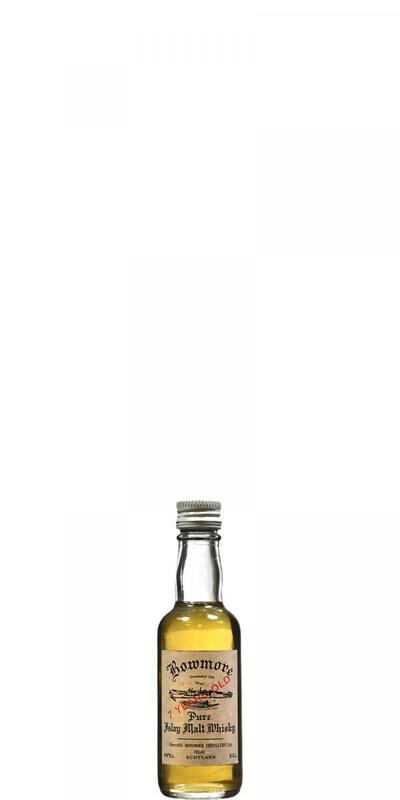 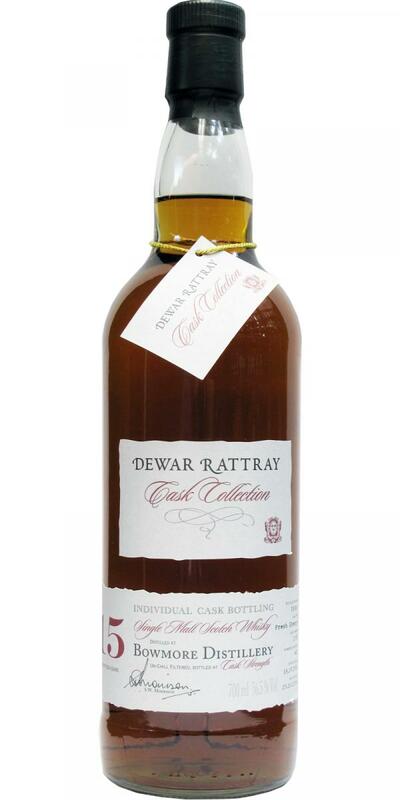 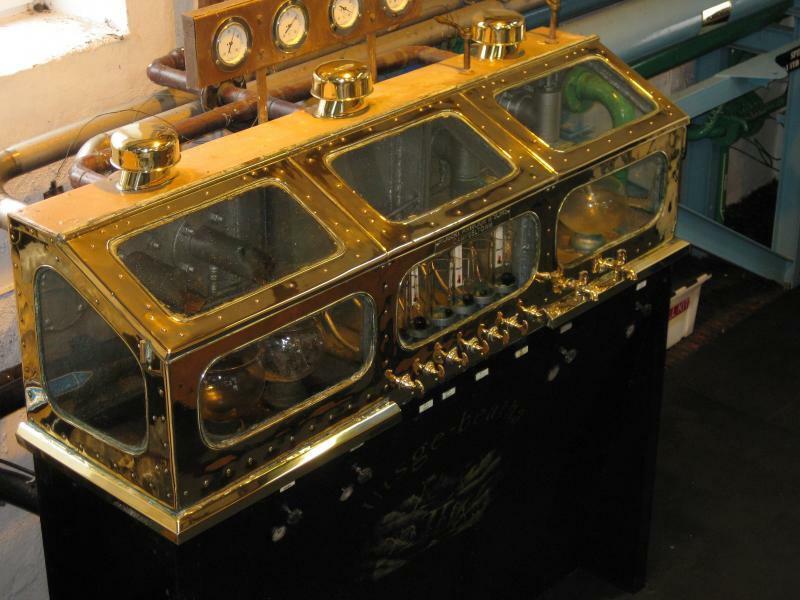 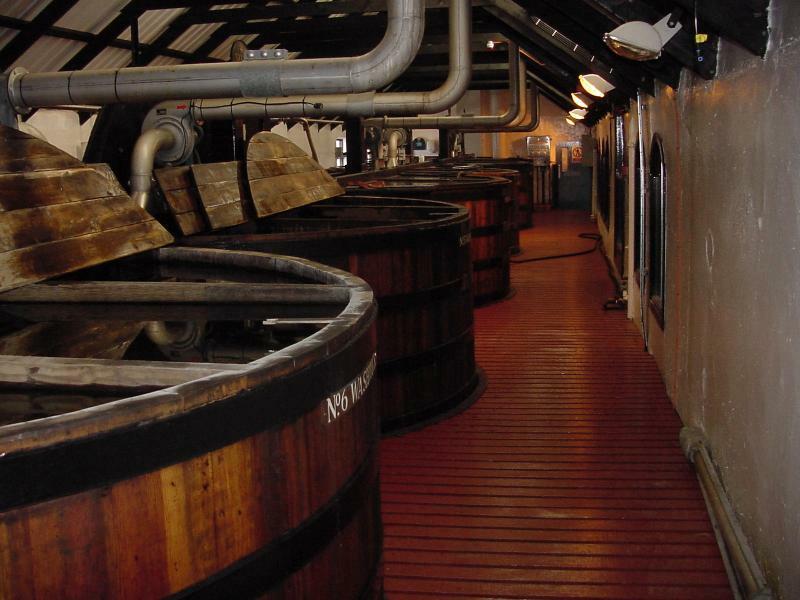 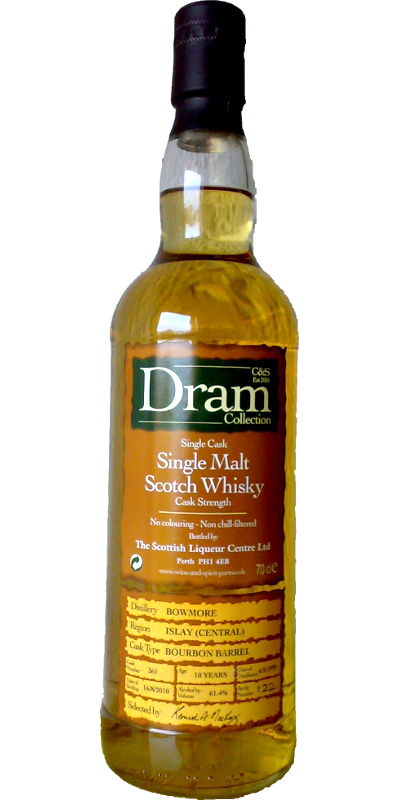 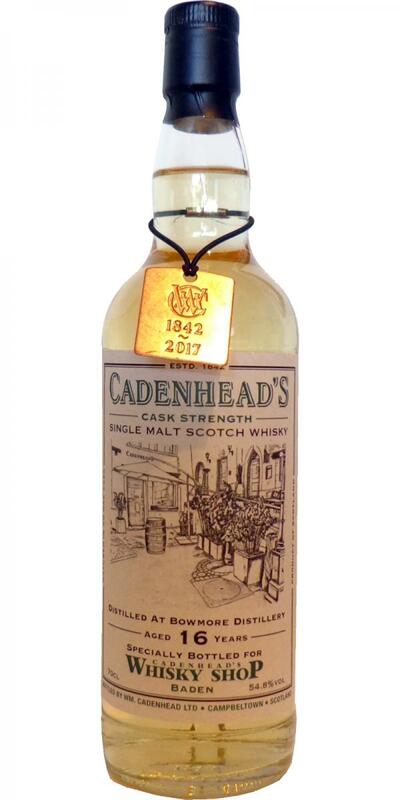 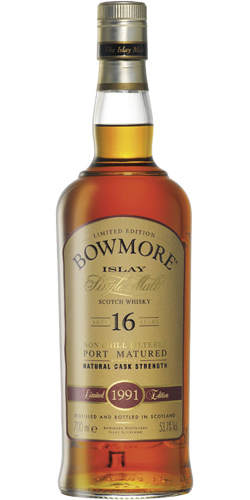 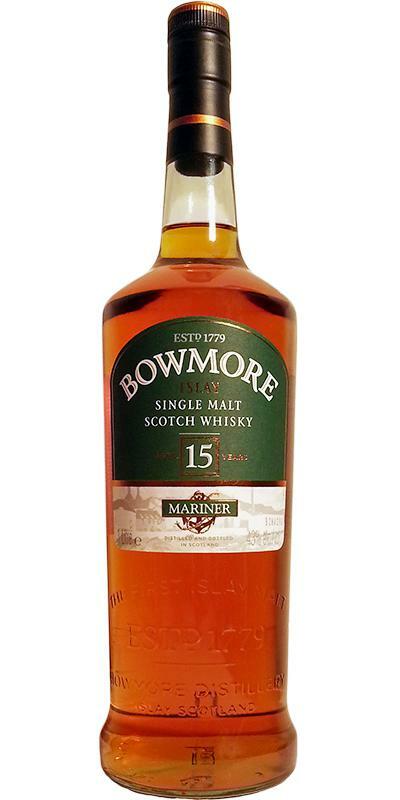 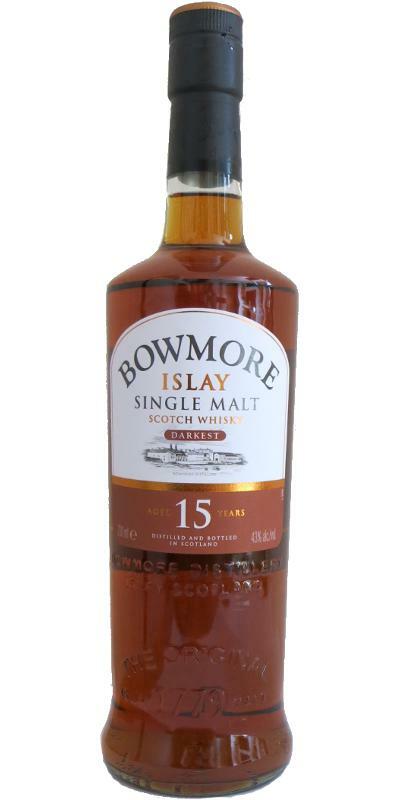 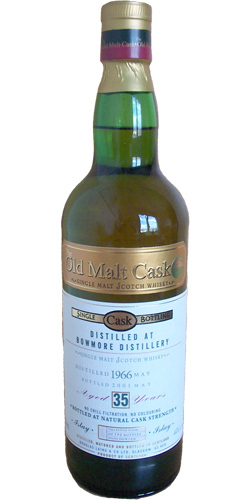 Bowmore Cask Strength for Scotch Malt Sales 56.0 % Vol. 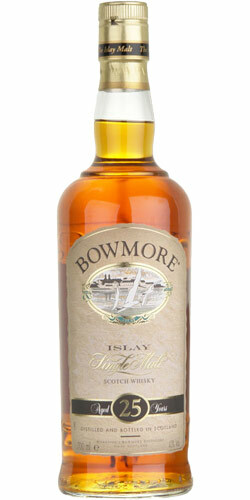 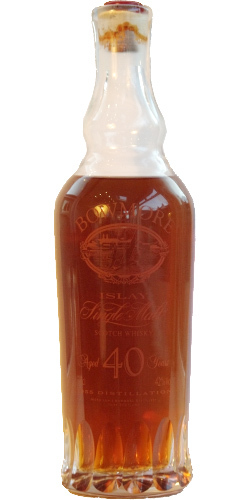 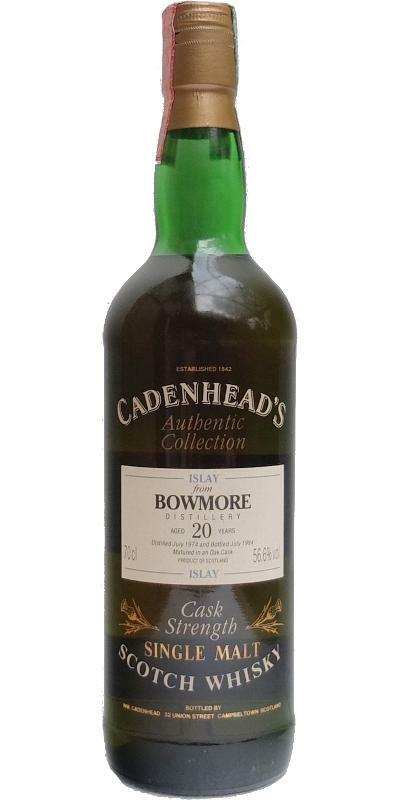 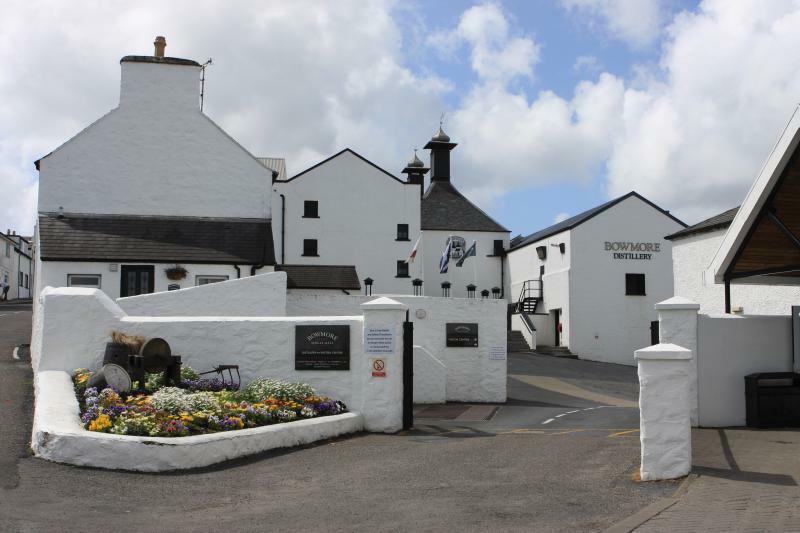 Bowmore Islay Malt Scotch Whisky 40.0 % Vol. 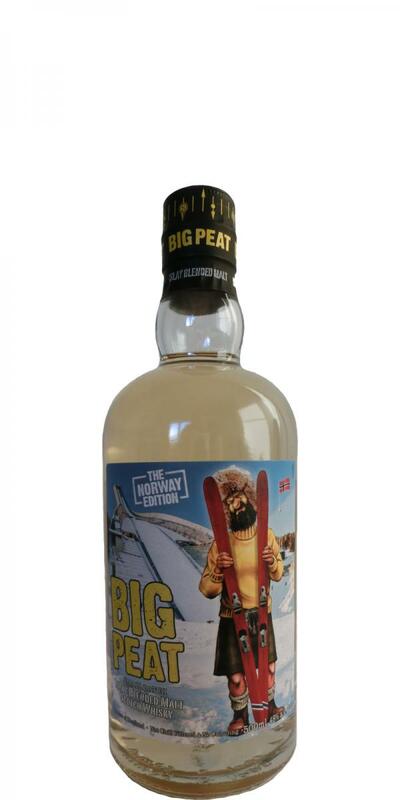 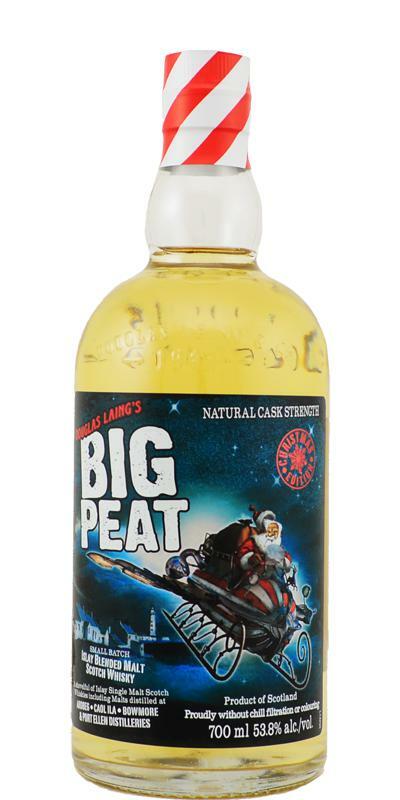 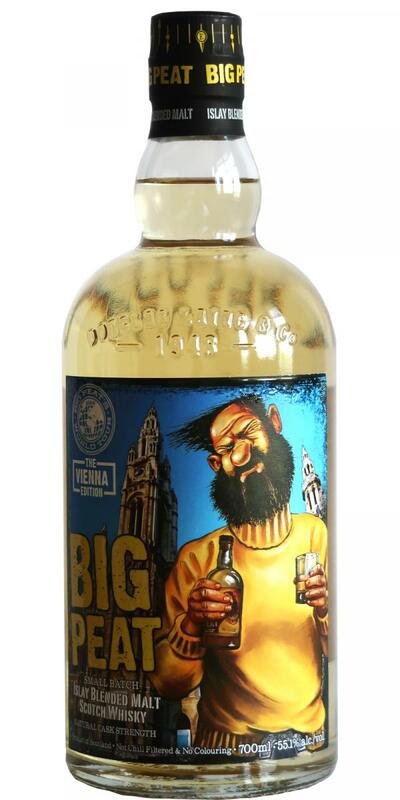 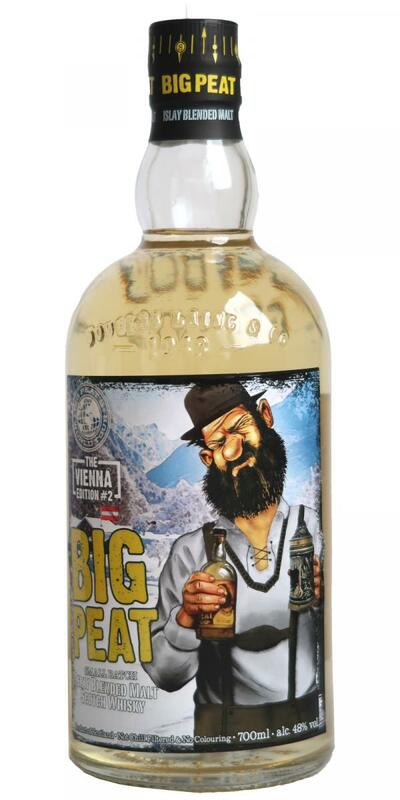 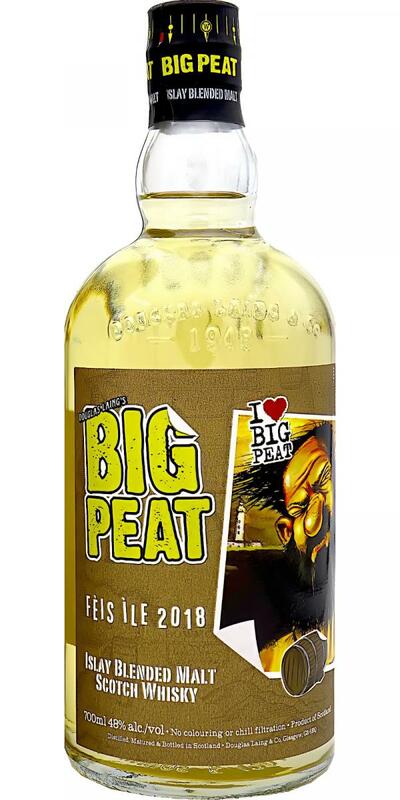 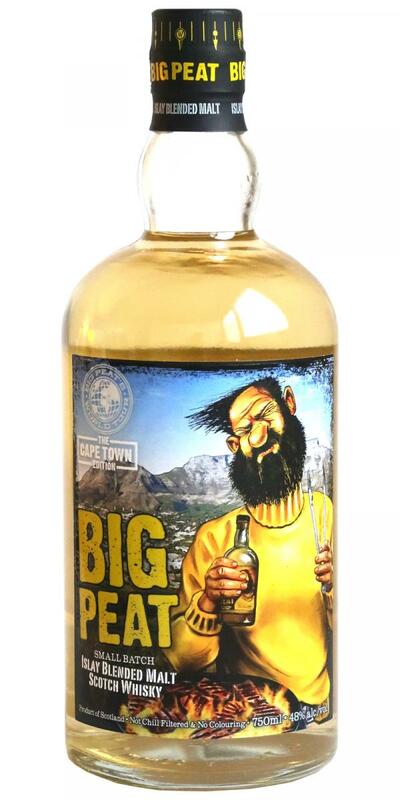 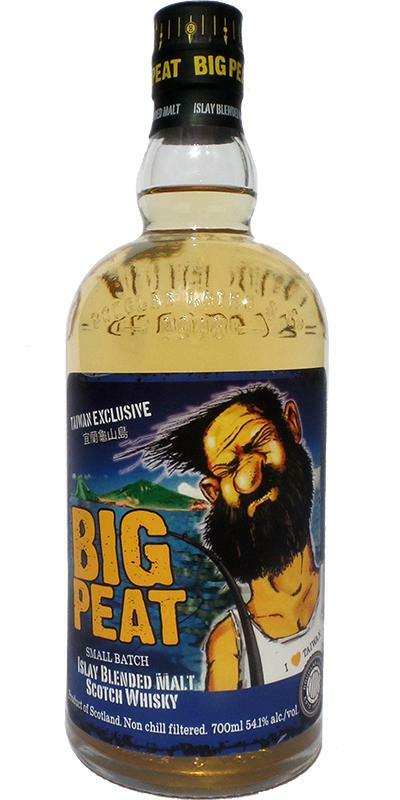 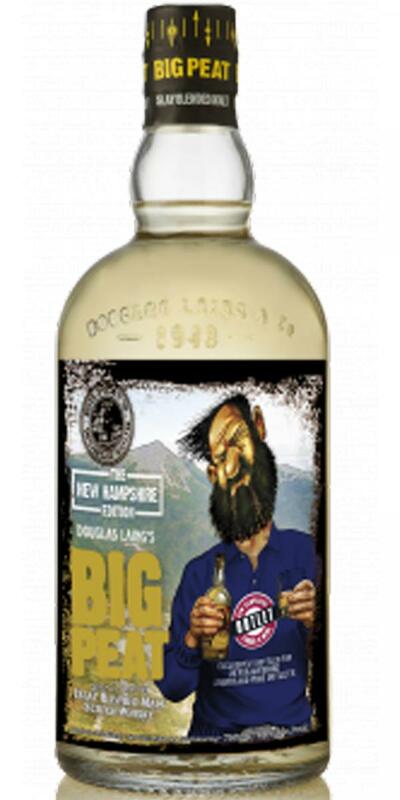 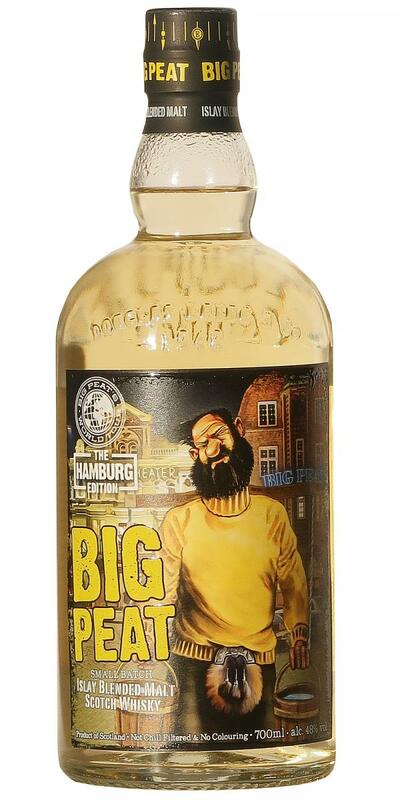 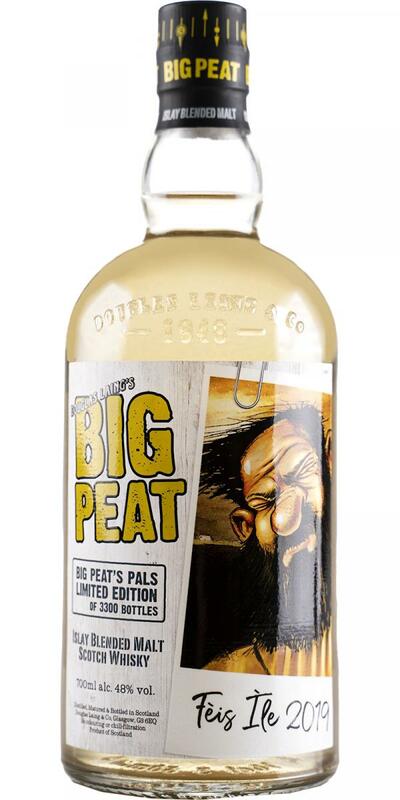 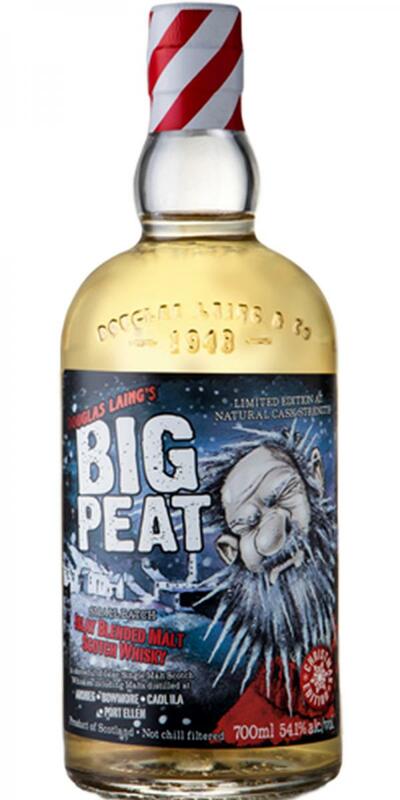 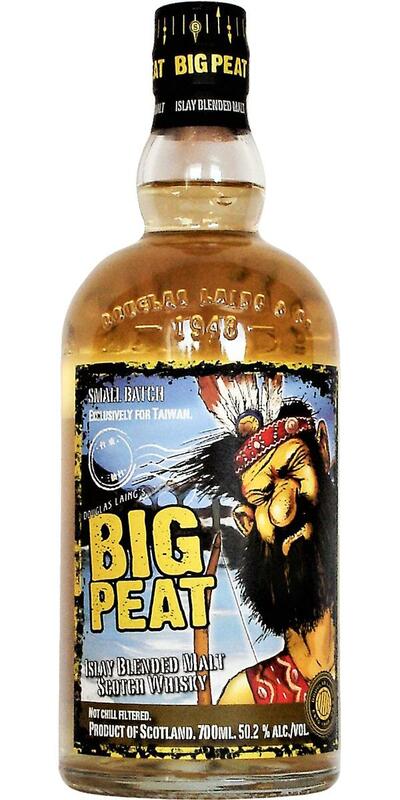 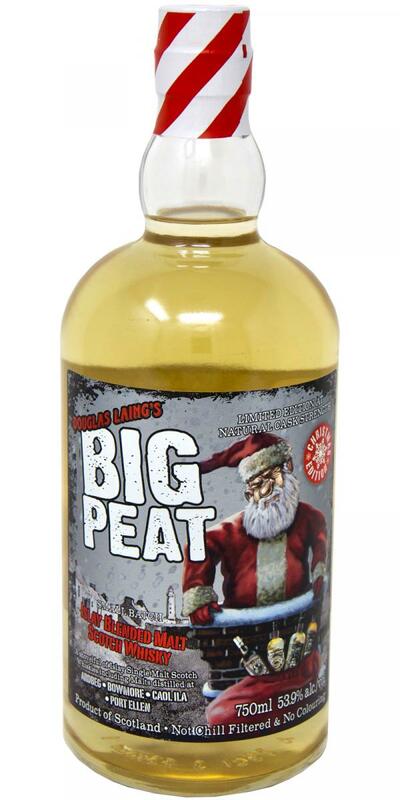 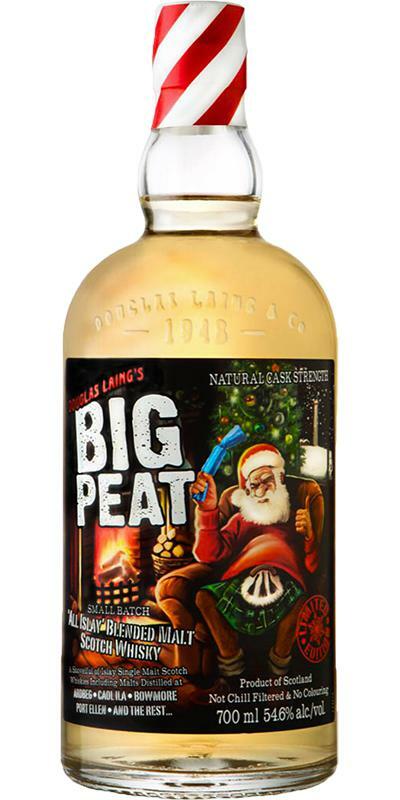 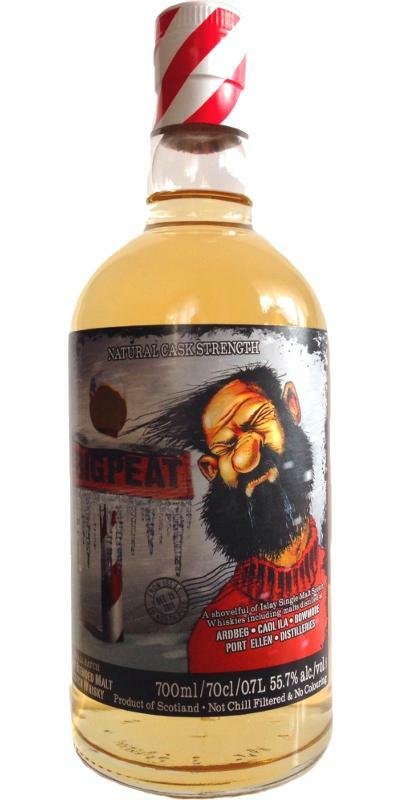 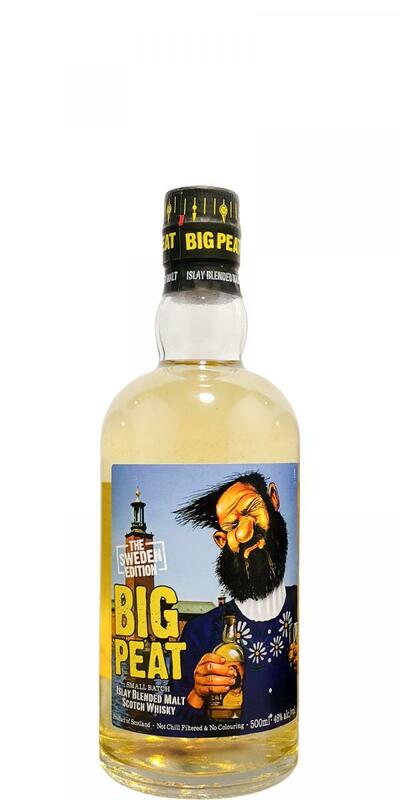 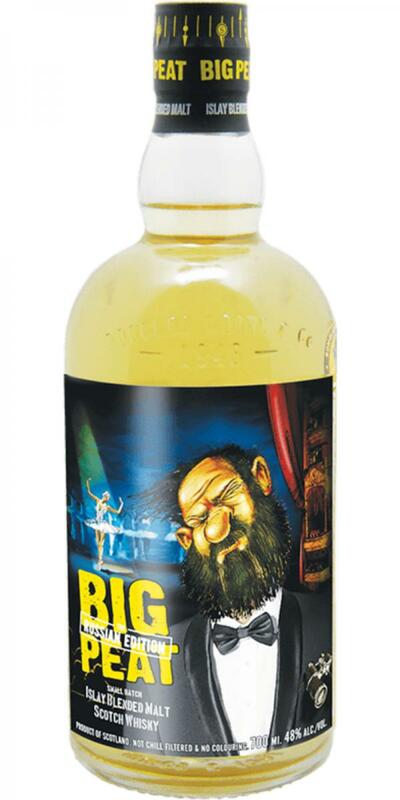 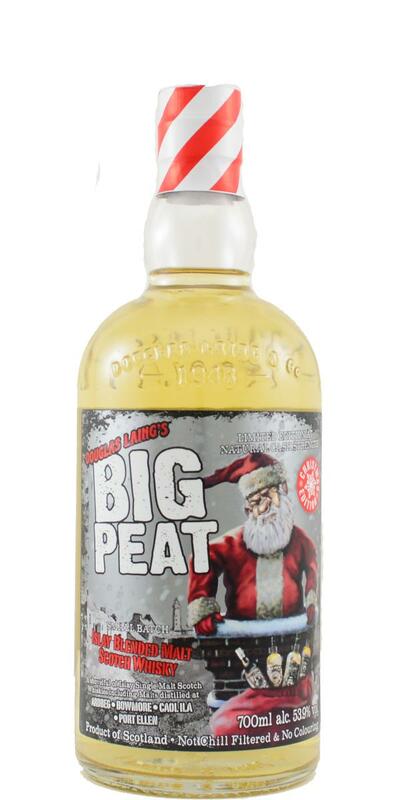 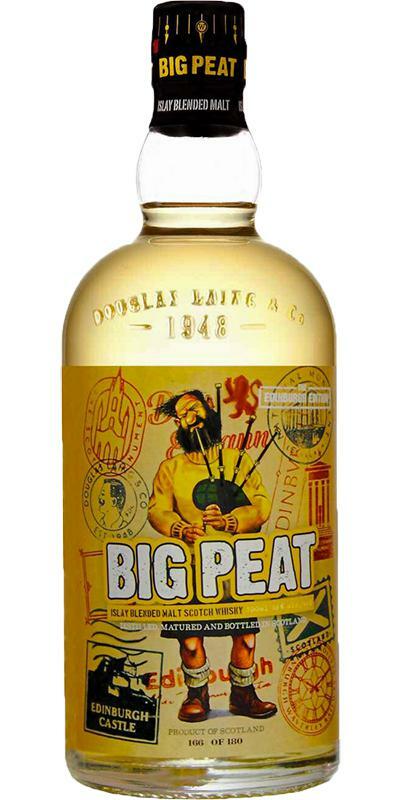 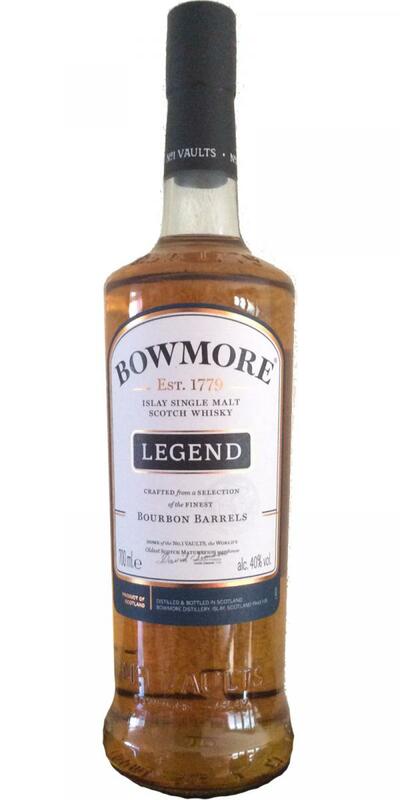 Bowmore Legend 40.0 % Vol. 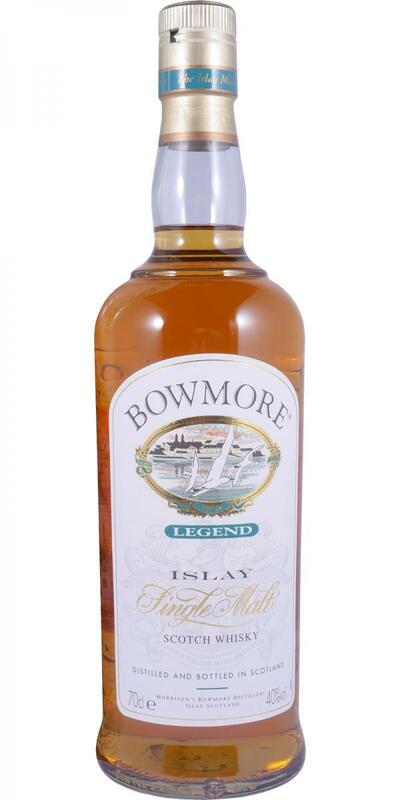 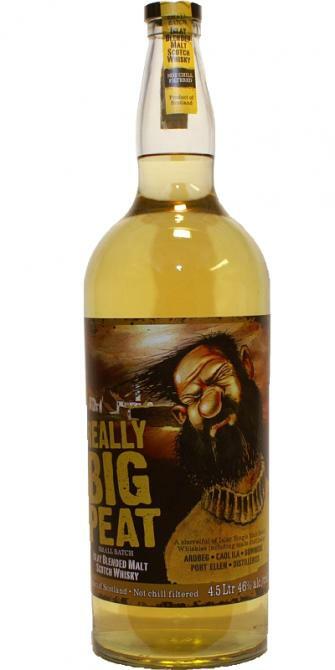 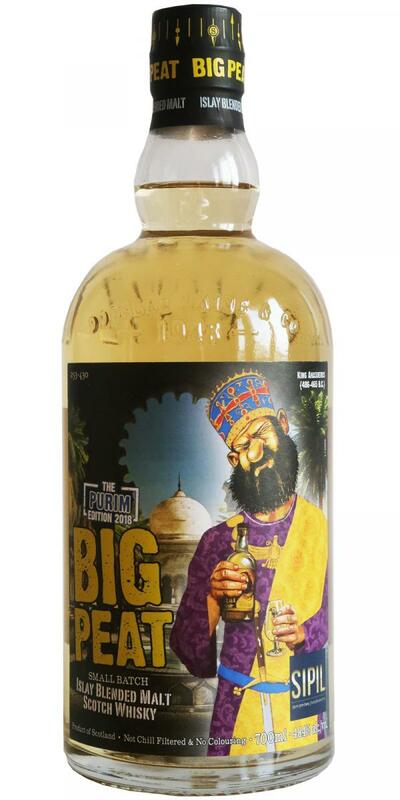 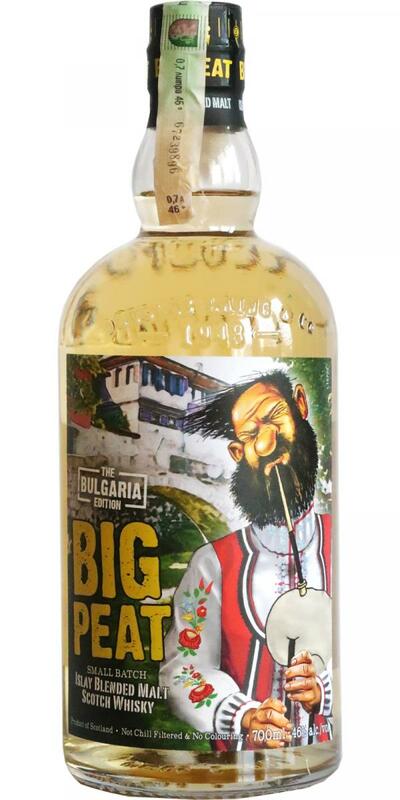 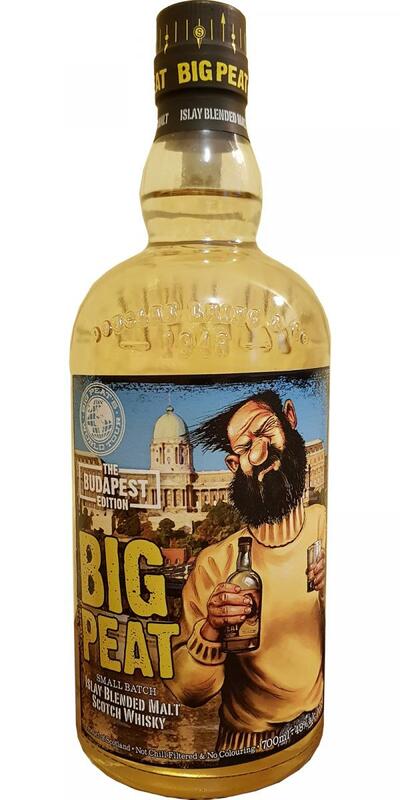 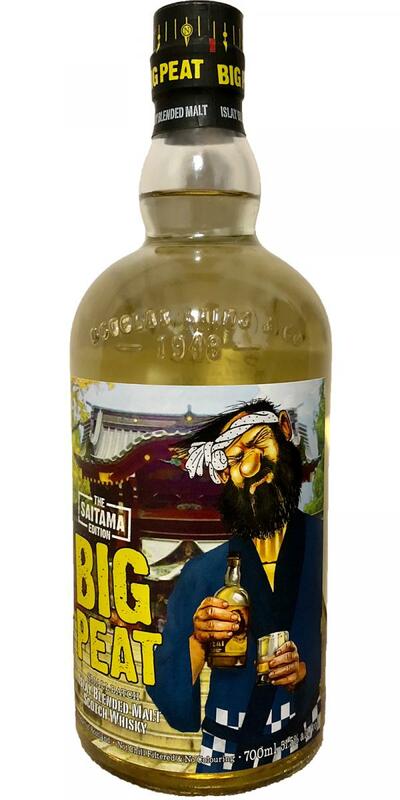 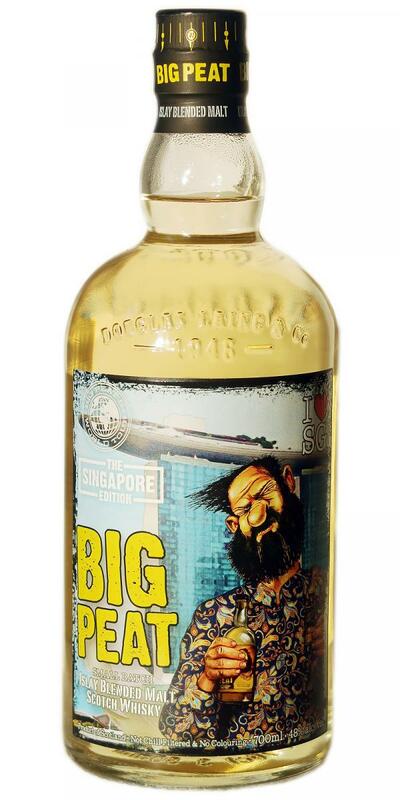 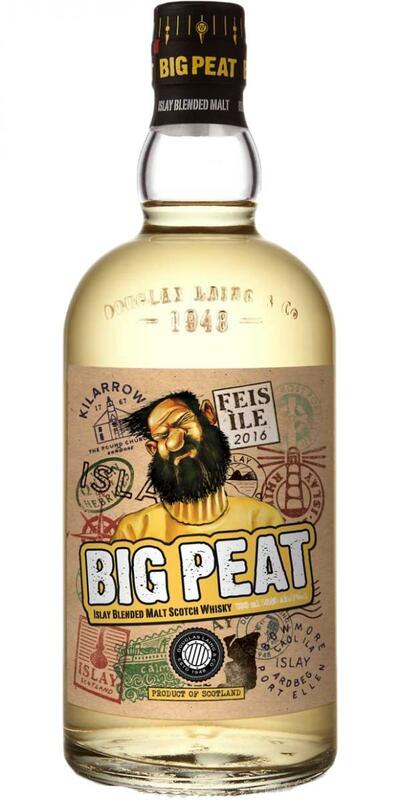 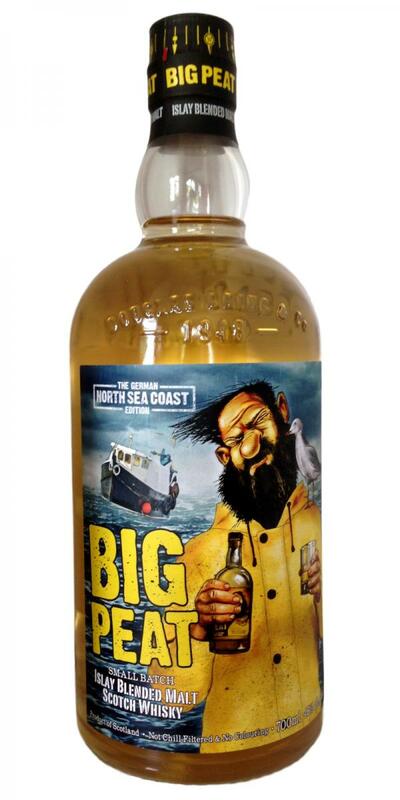 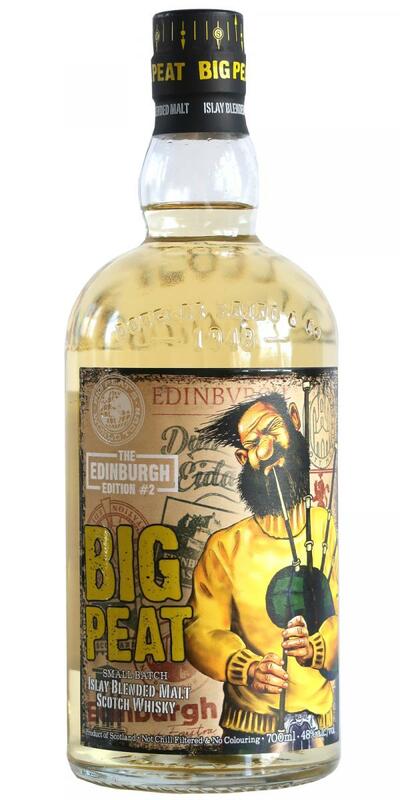 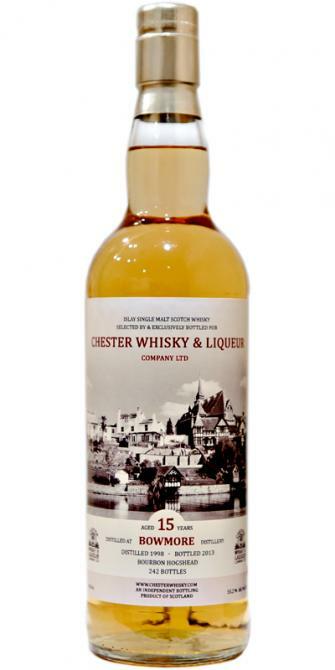 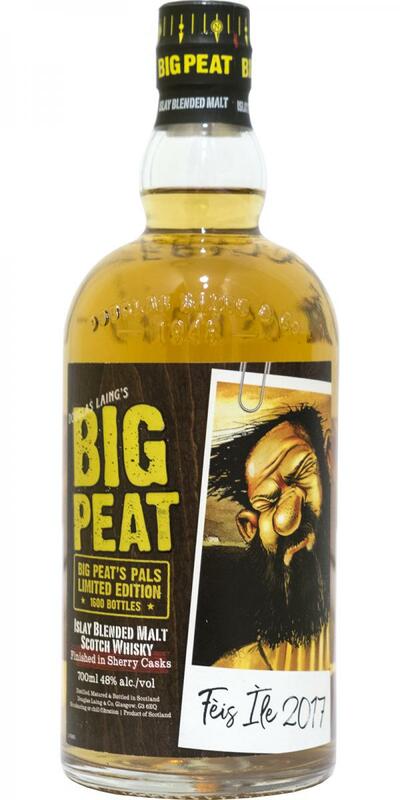 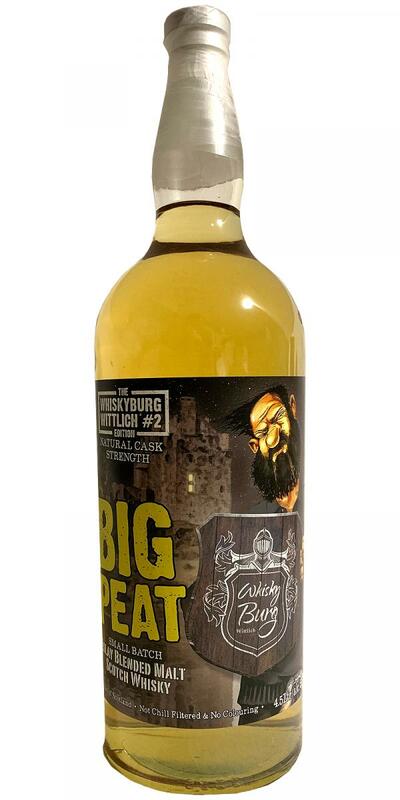 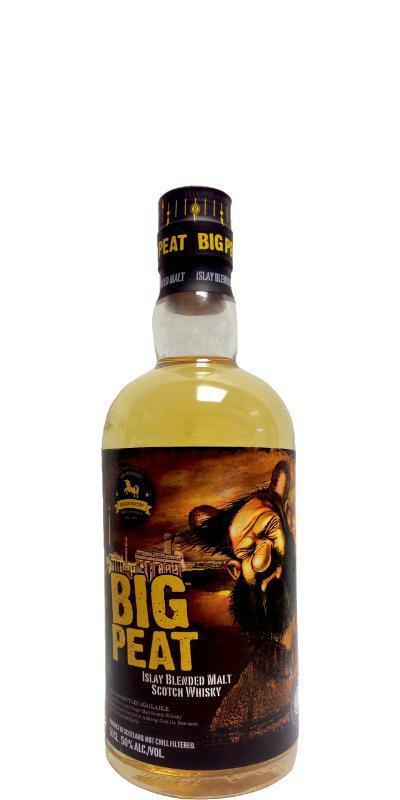 Bowmore Legend The Bowmore Family Gift Pack 43.0 % Vol. 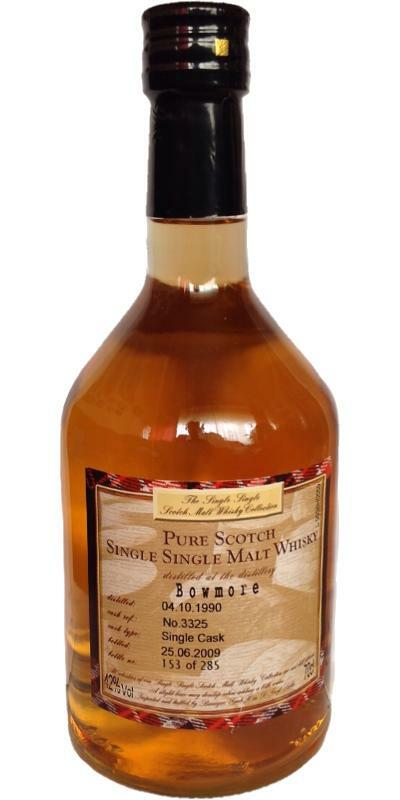 Bowmore Single Select 40.0 % Vol. 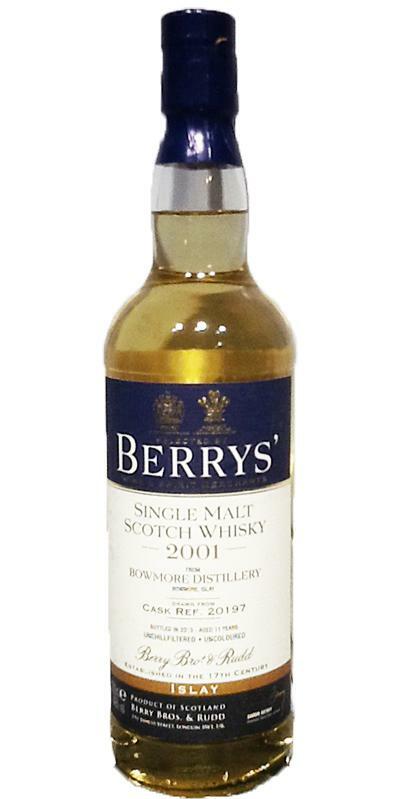 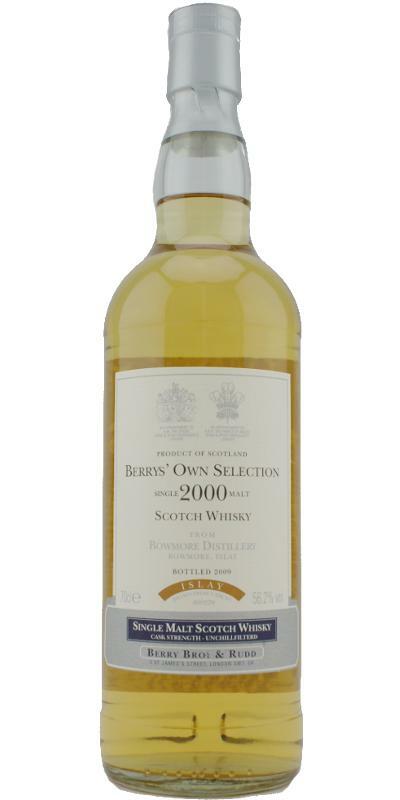 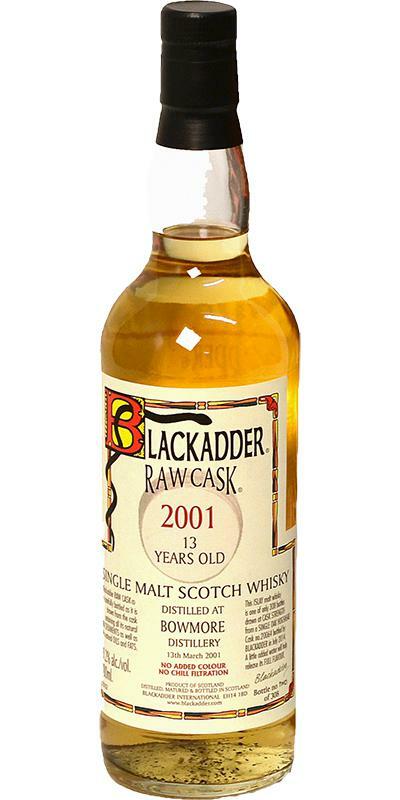 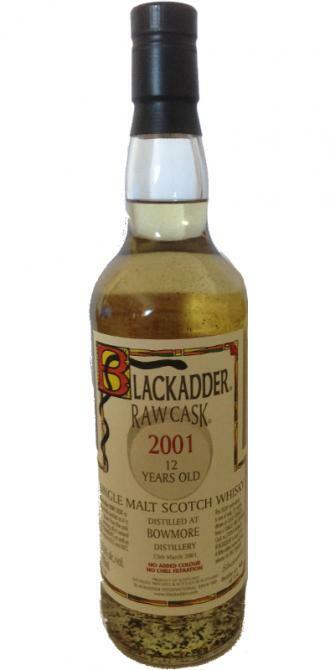 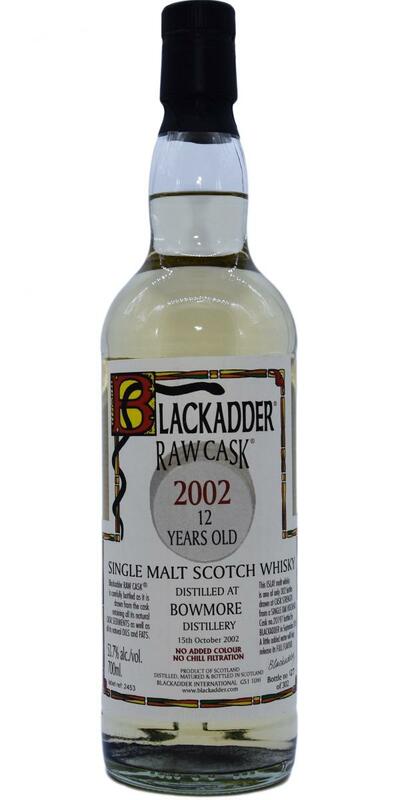 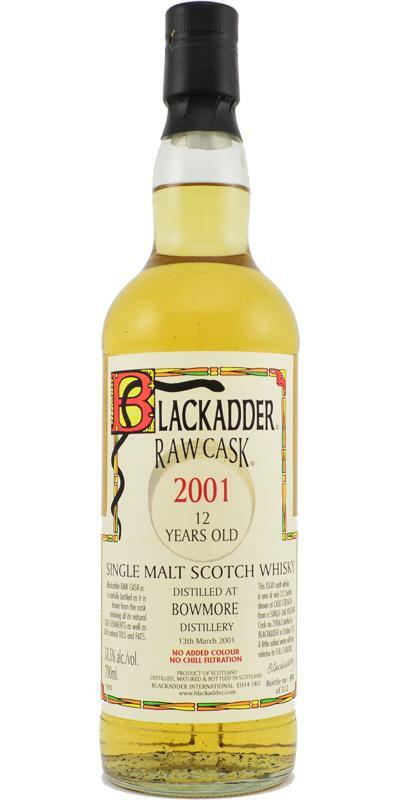 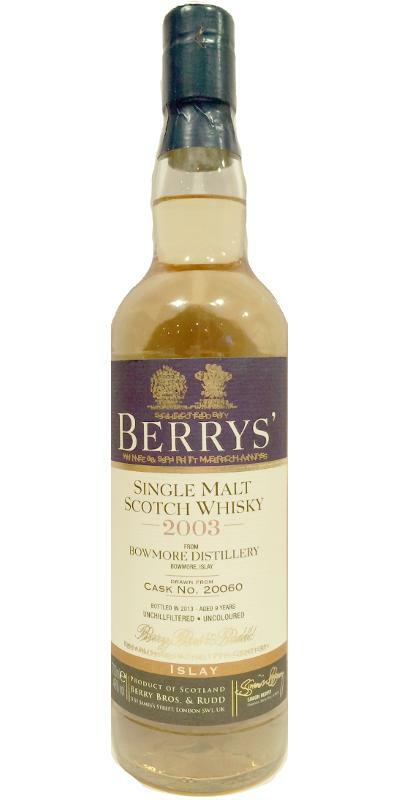 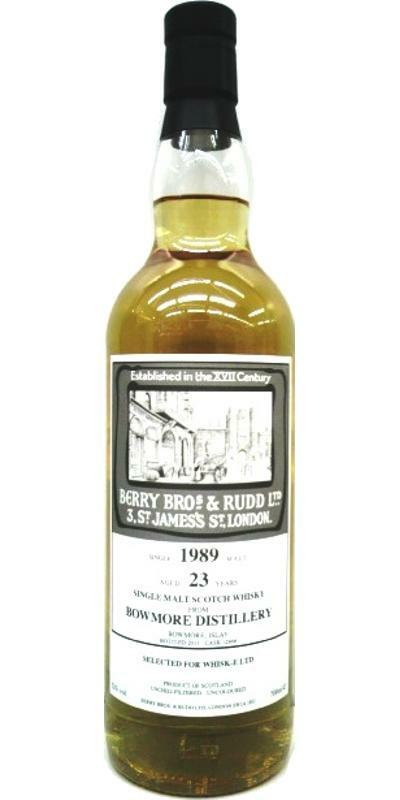 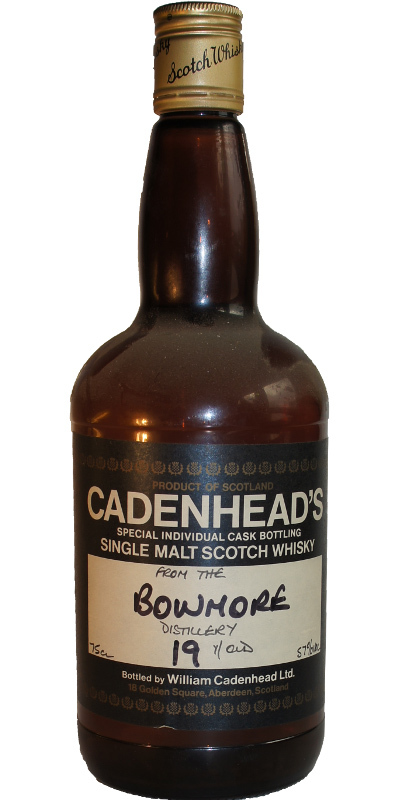 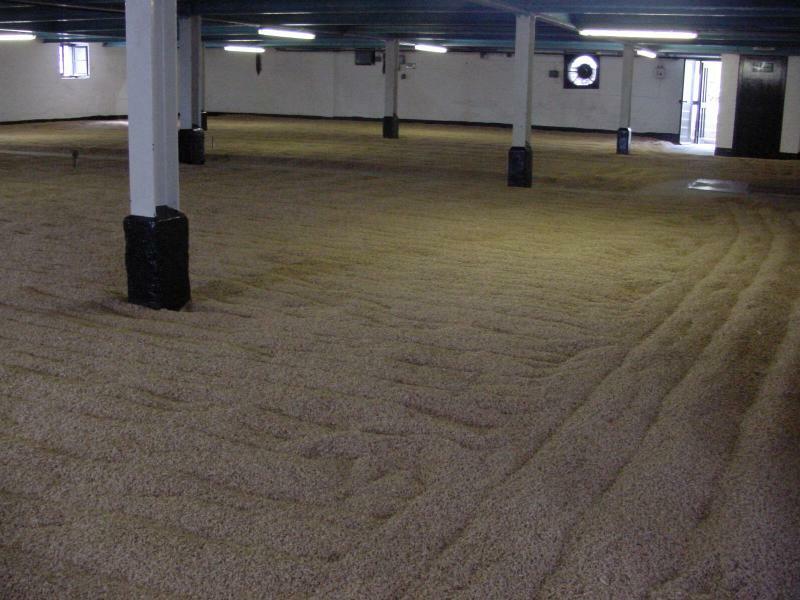 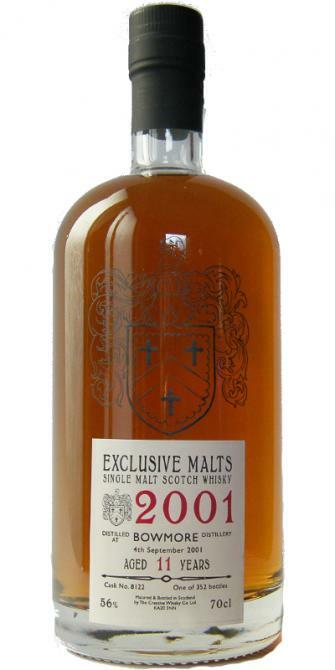 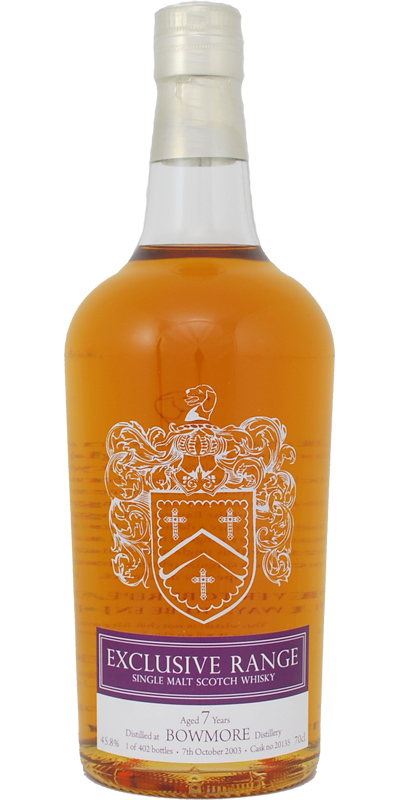 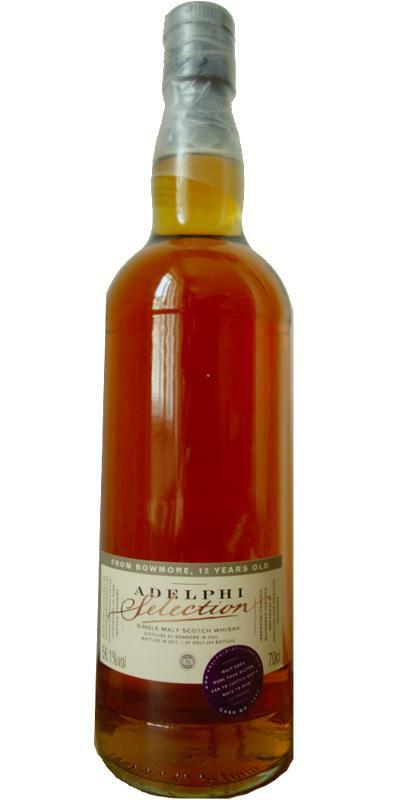 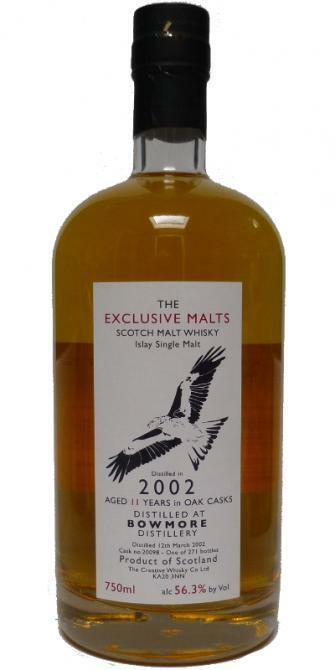 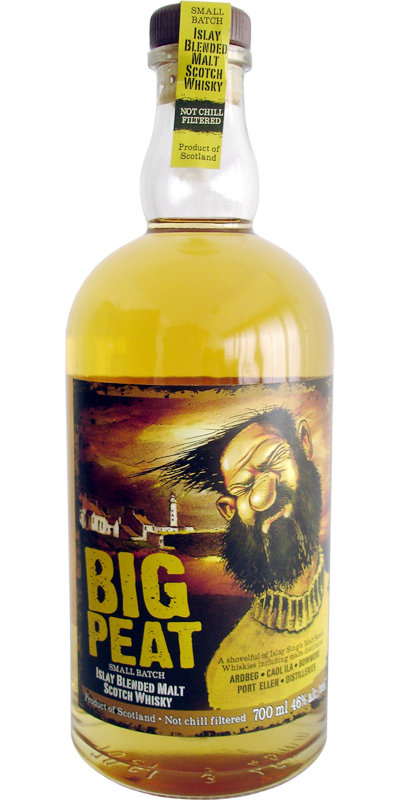 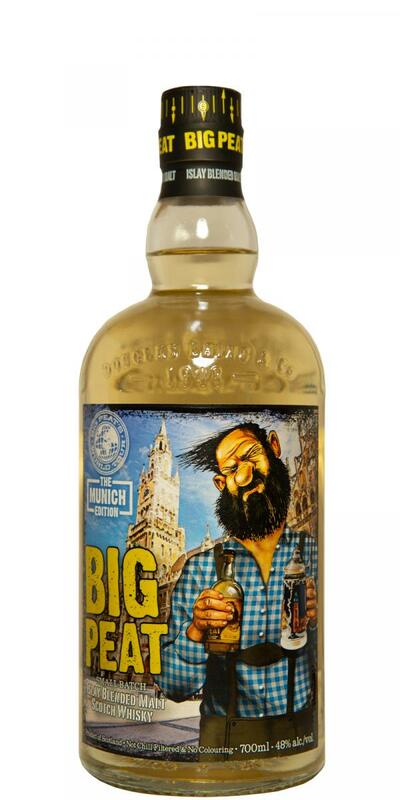 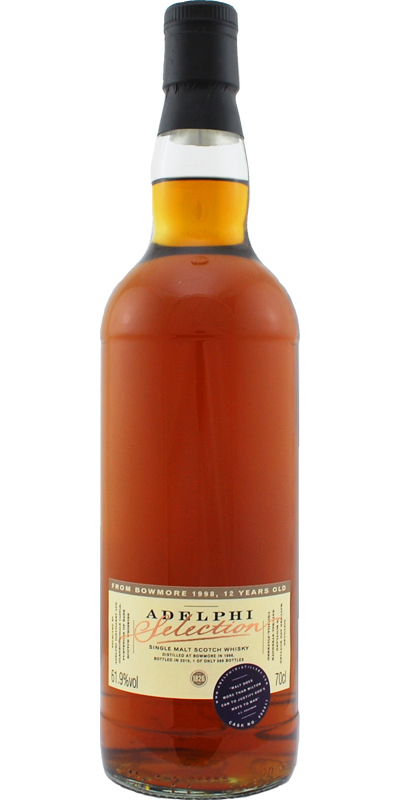 Bowmore 2003 BRI Highland Laird 10 52.4 % Vol. 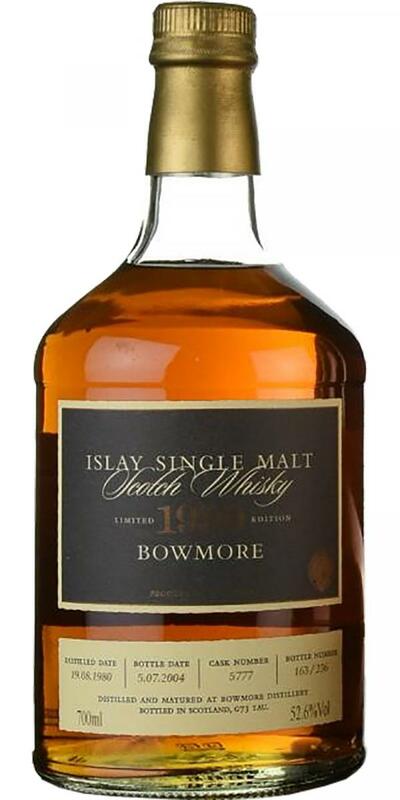 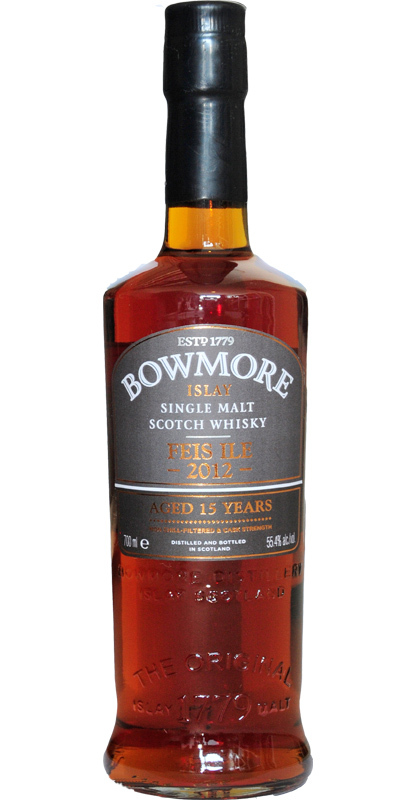 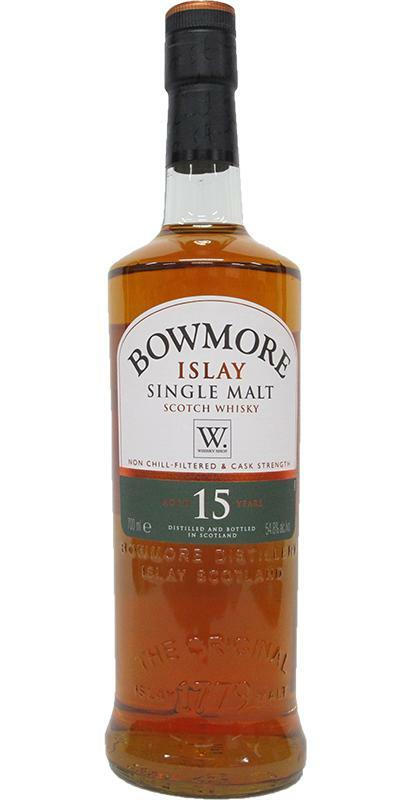 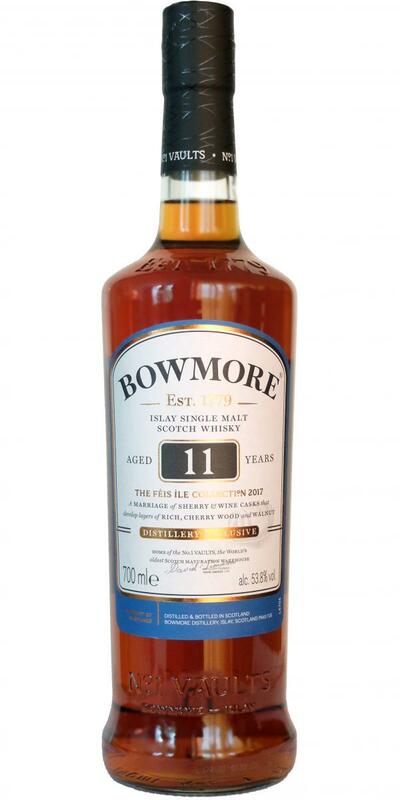 Bowmore 11-year-old BSW 11 43.0 % Vol. 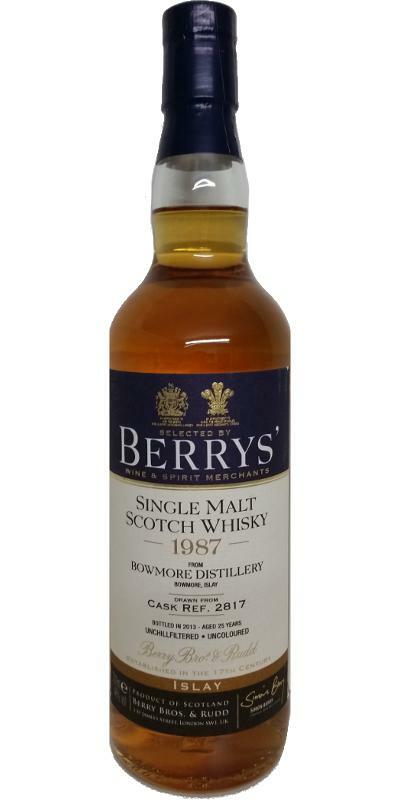 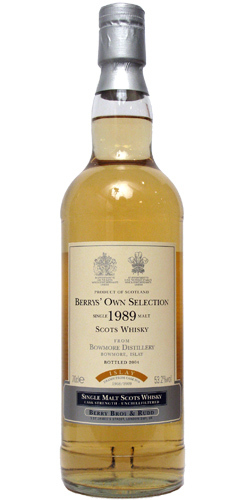 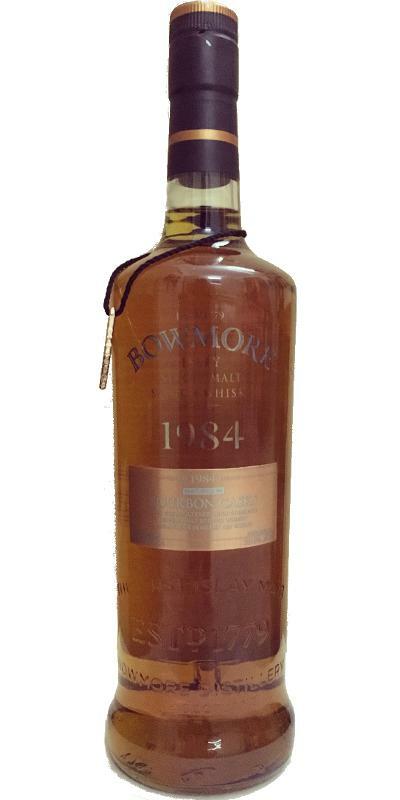 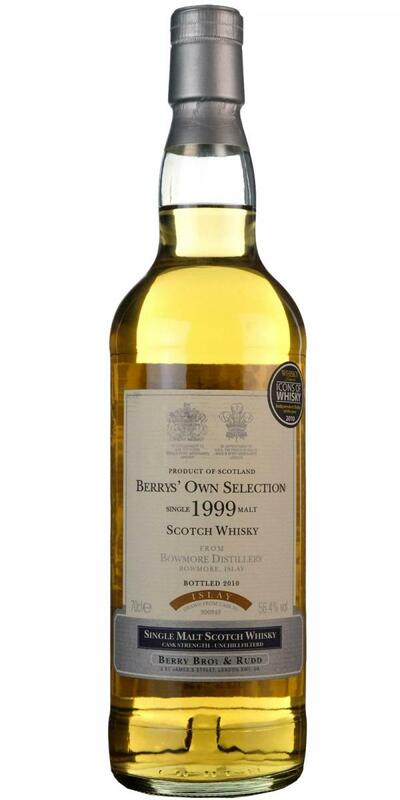 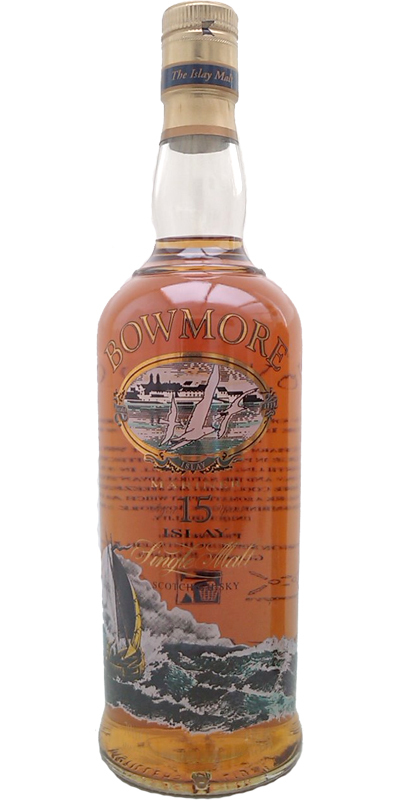 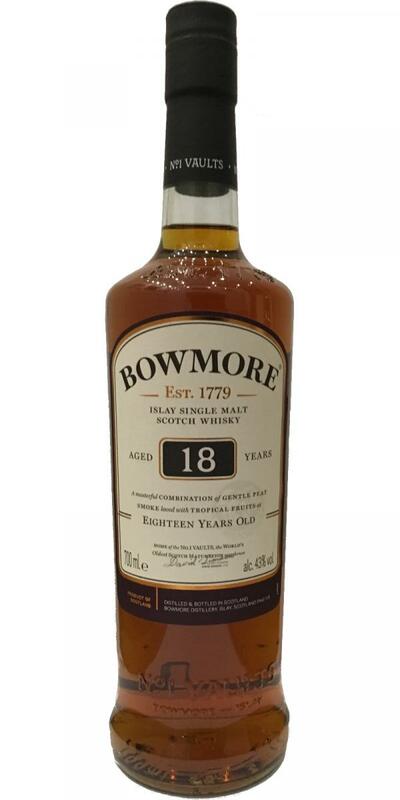 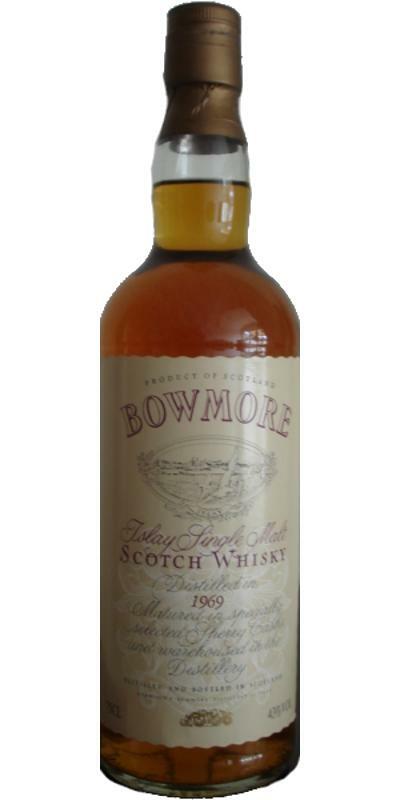 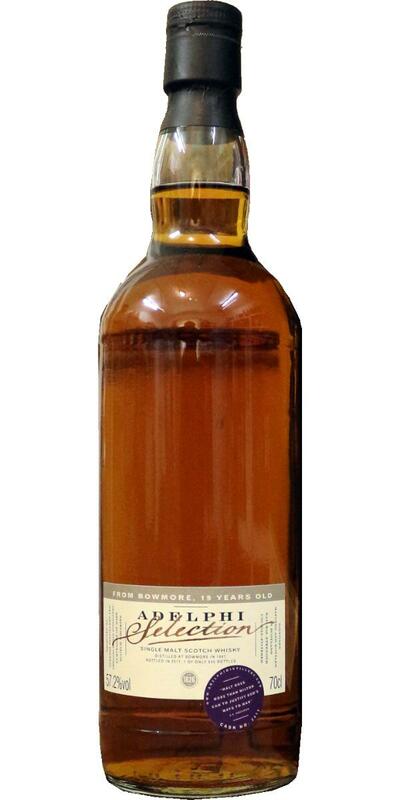 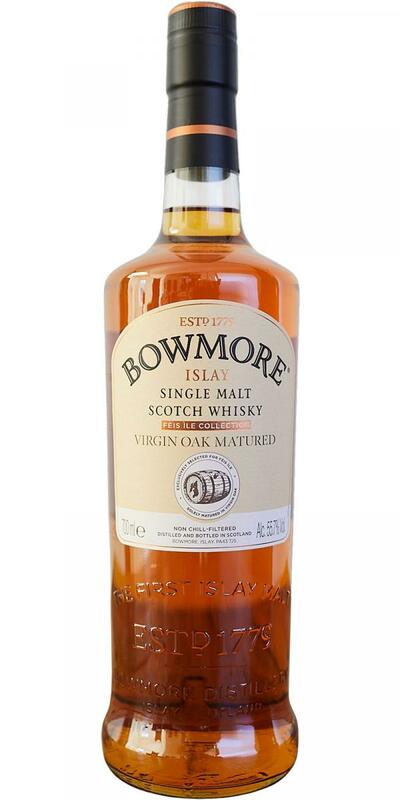 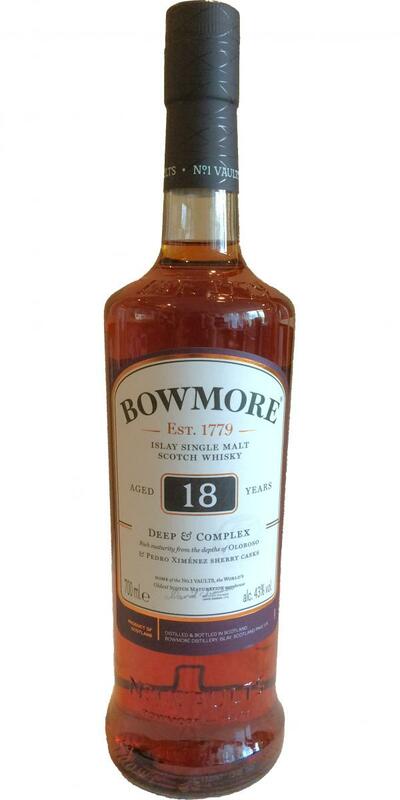 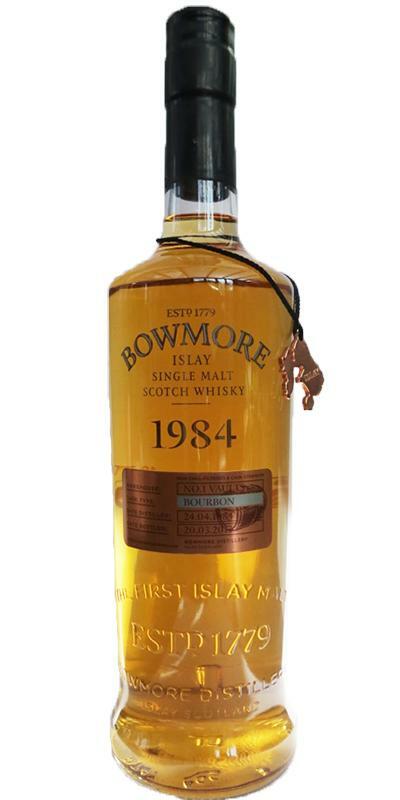 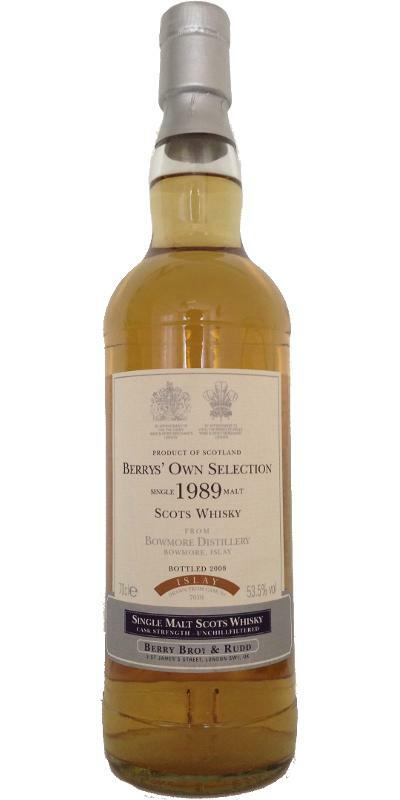 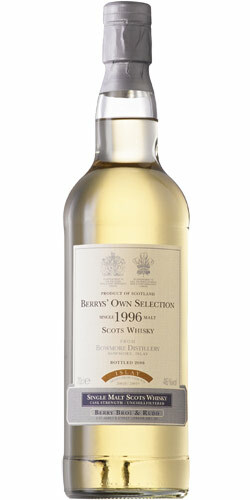 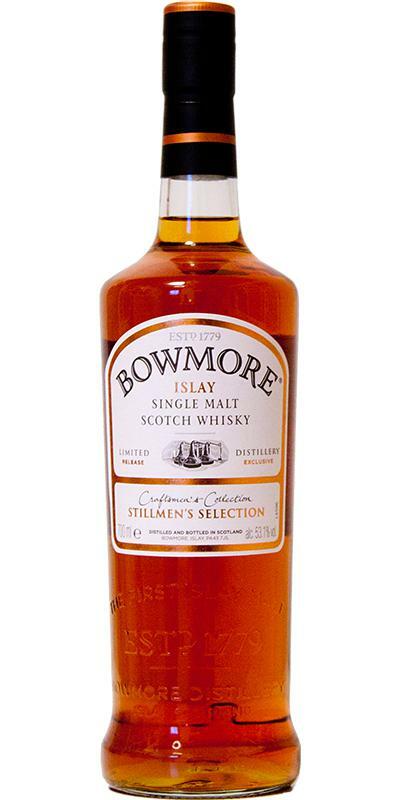 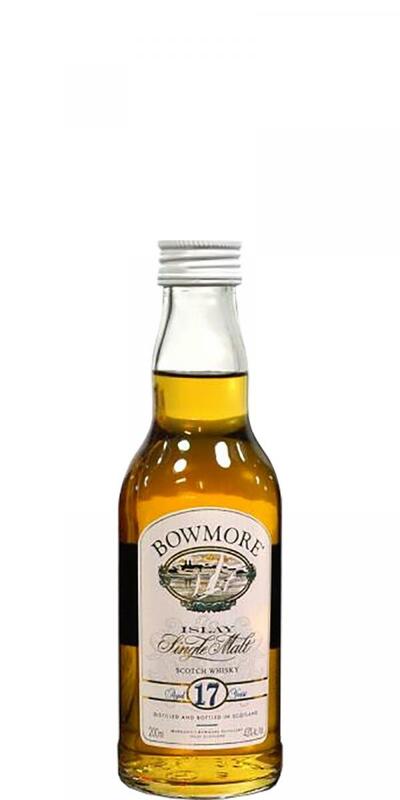 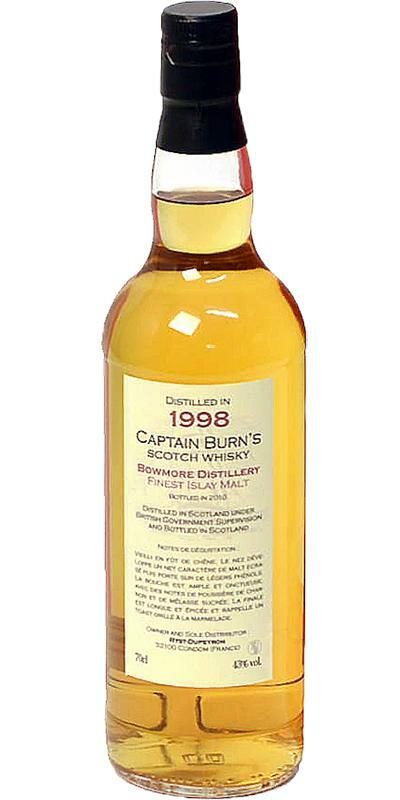 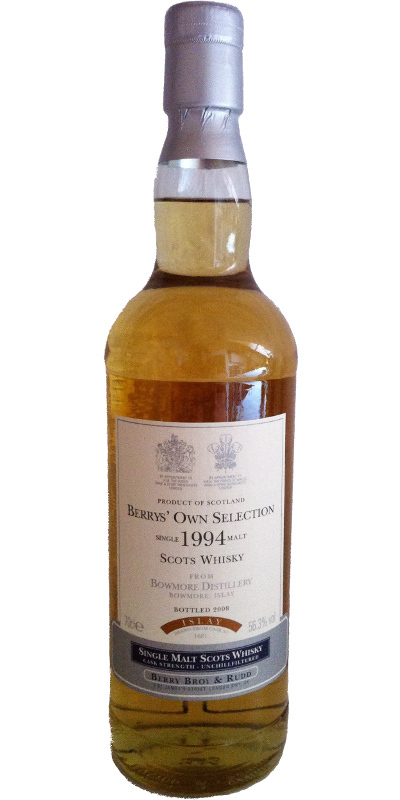 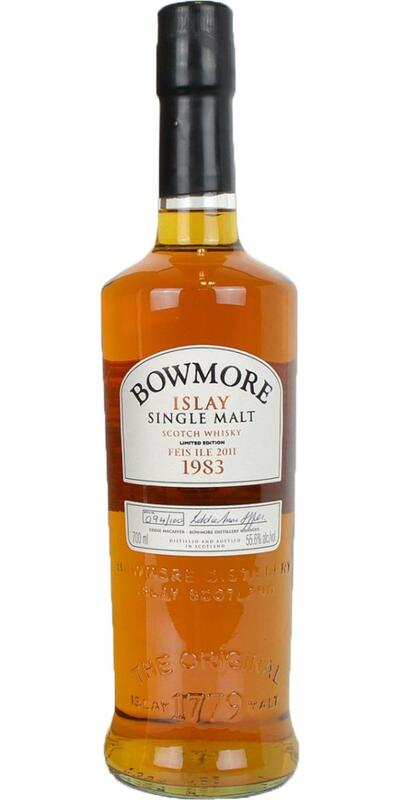 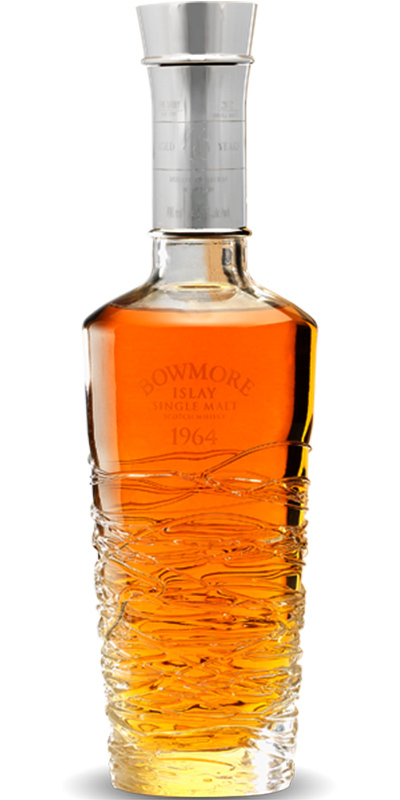 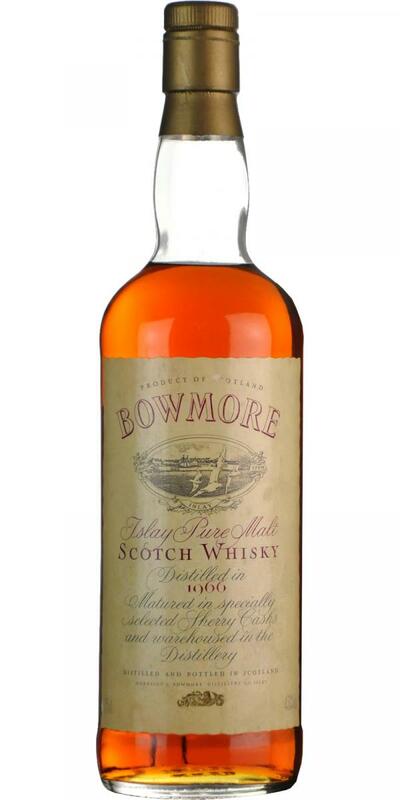 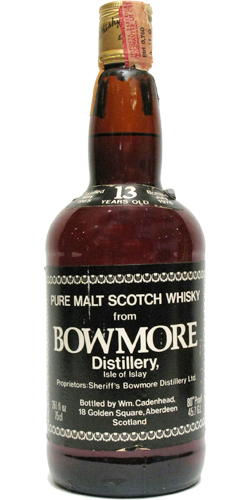 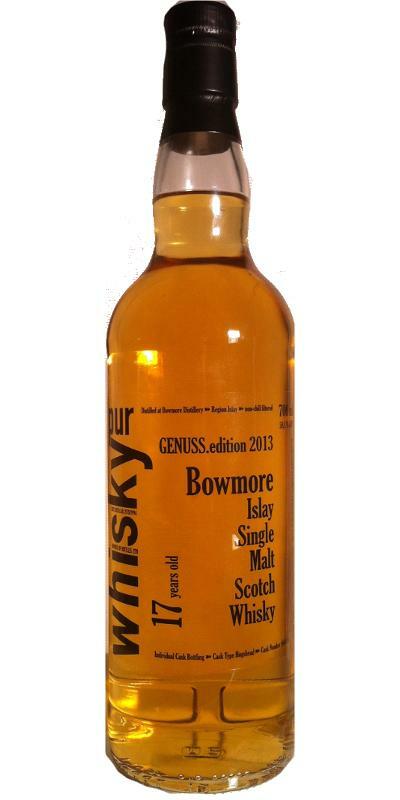 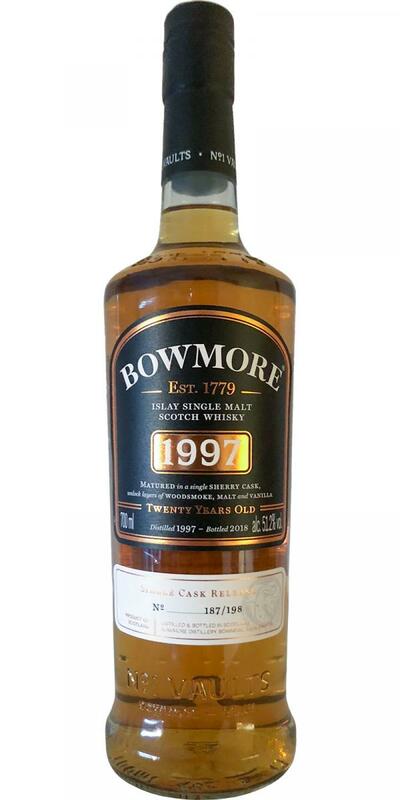 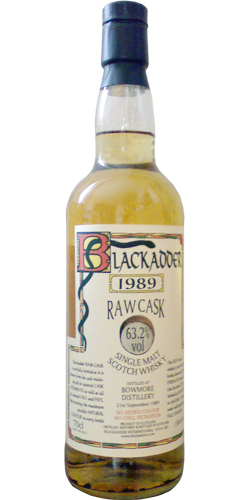 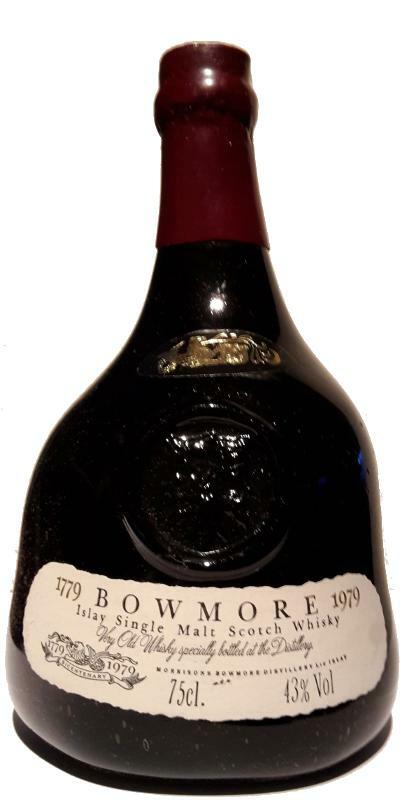 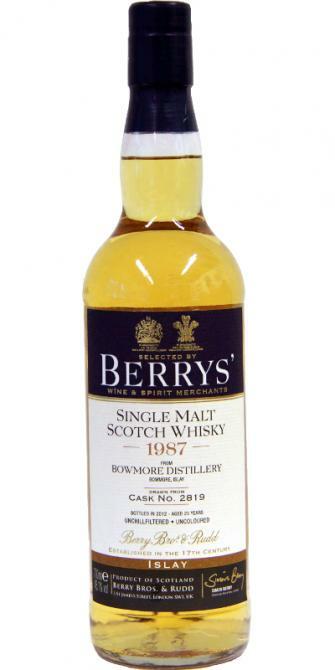 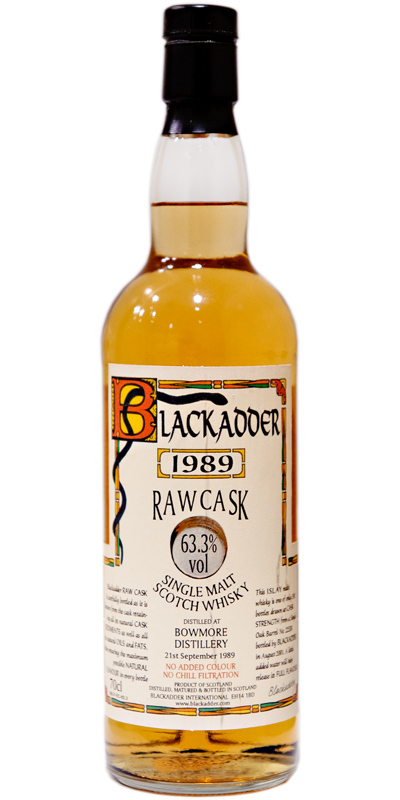 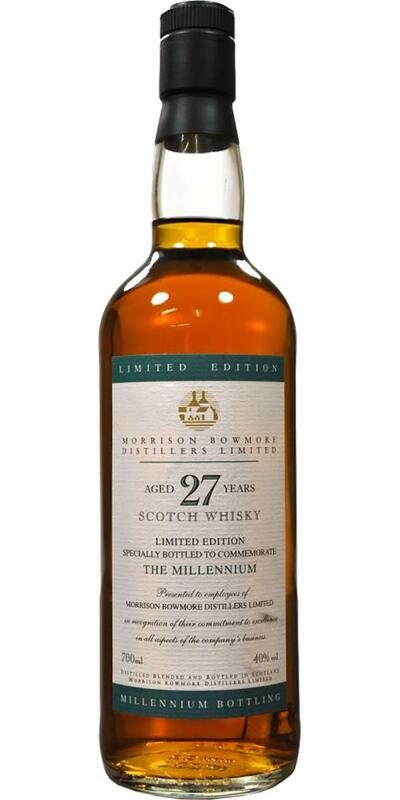 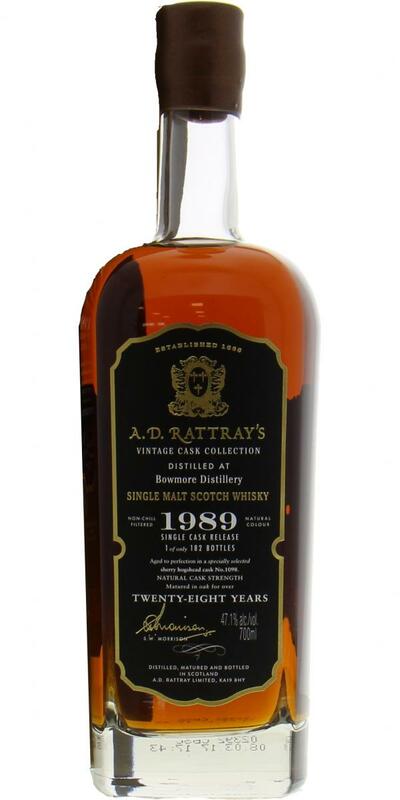 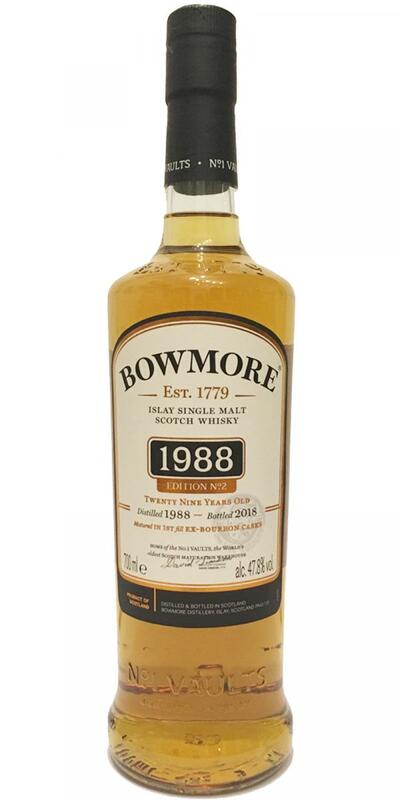 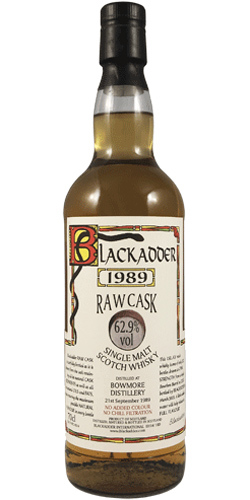 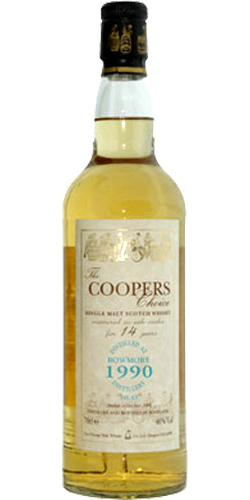 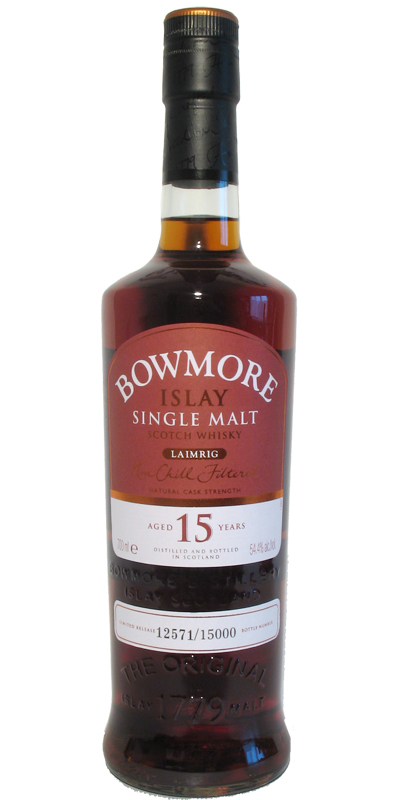 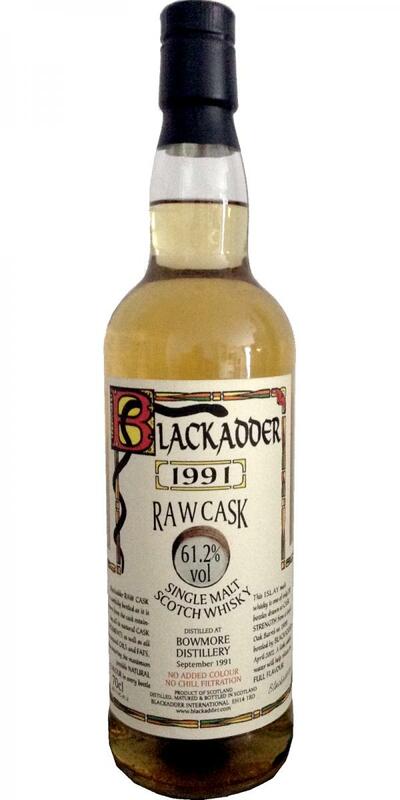 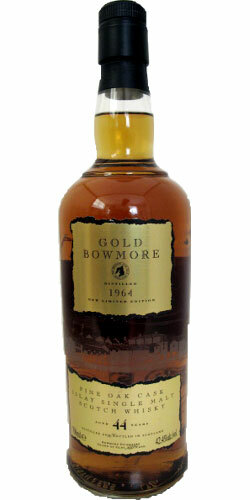 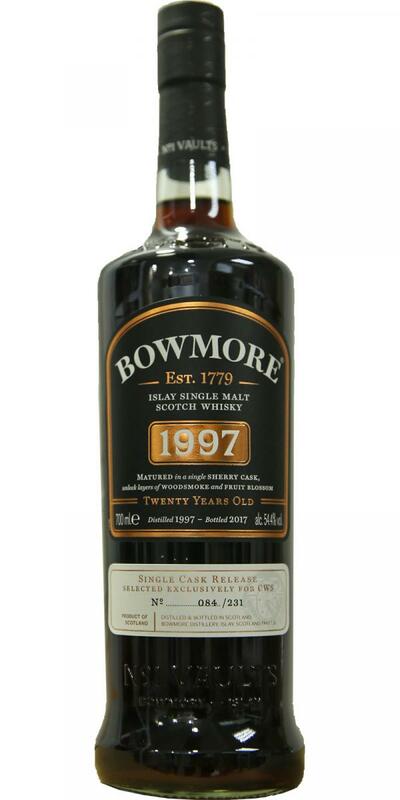 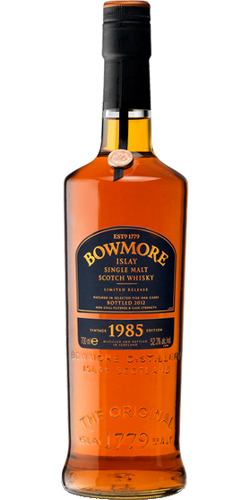 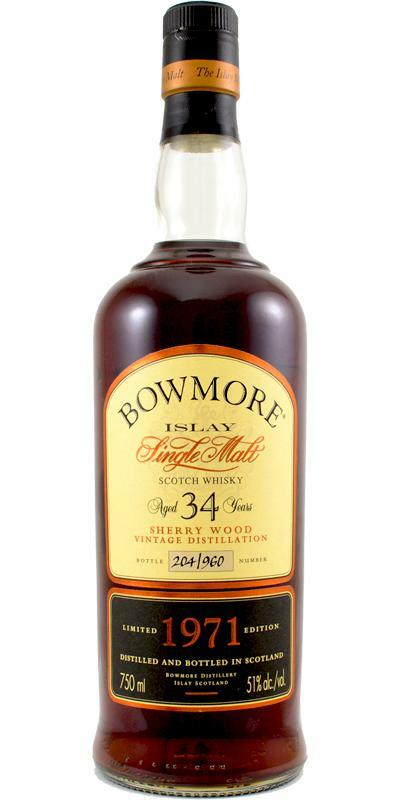 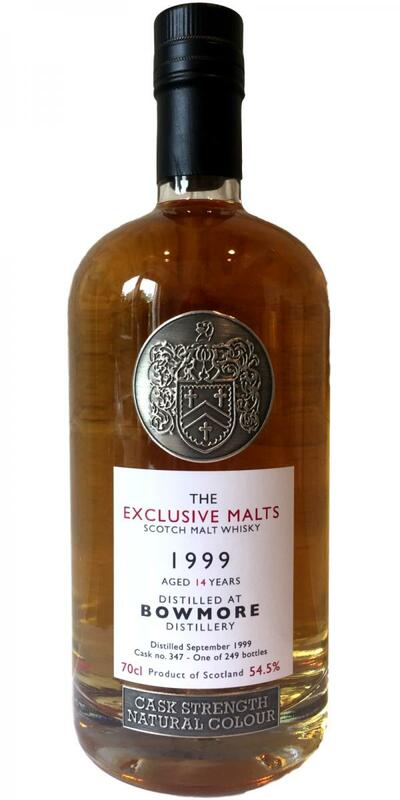 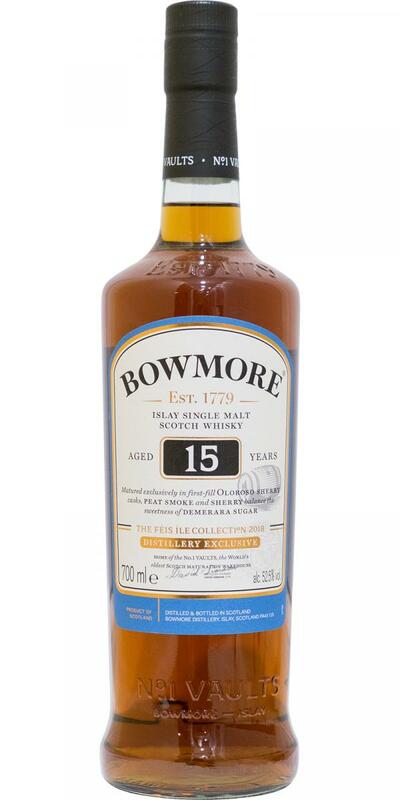 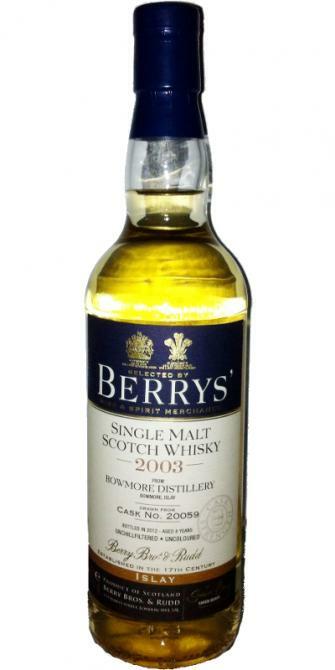 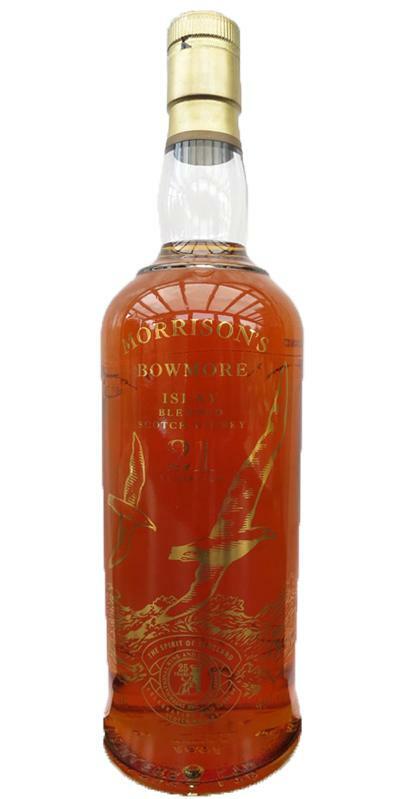 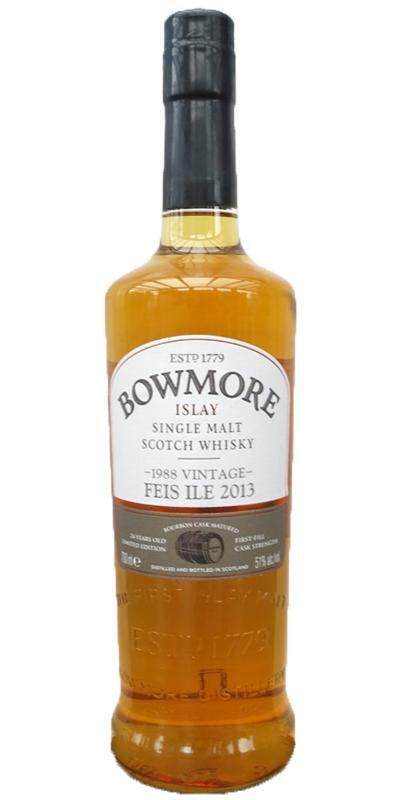 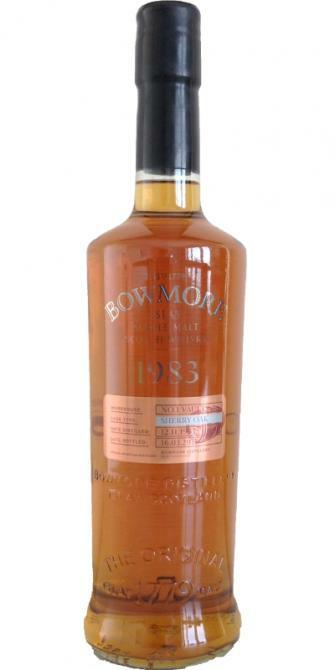 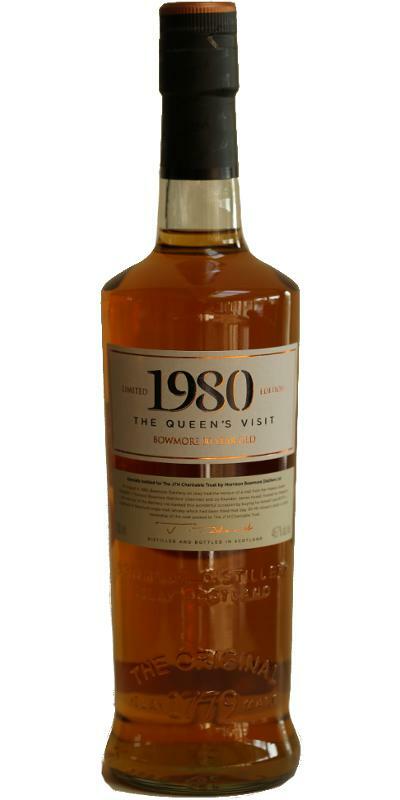 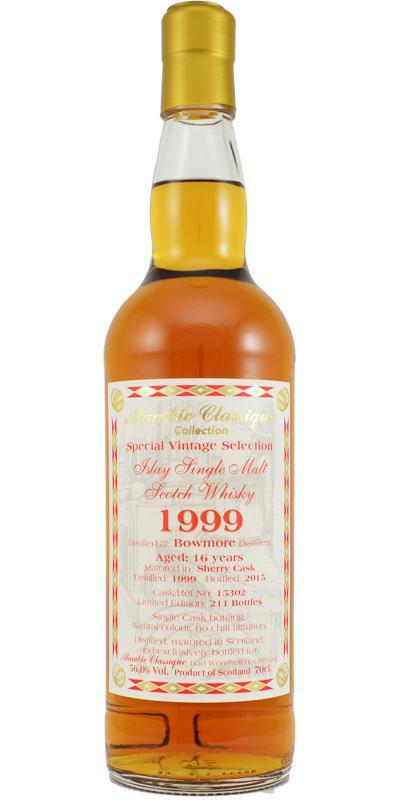 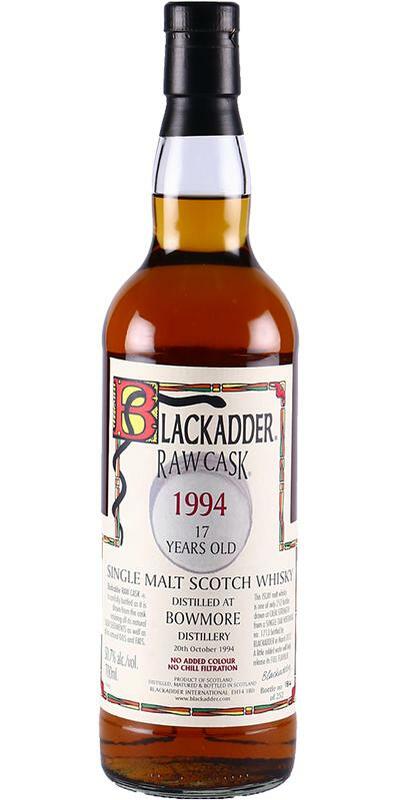 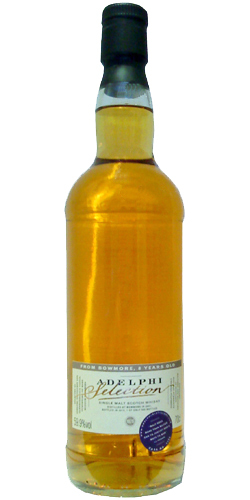 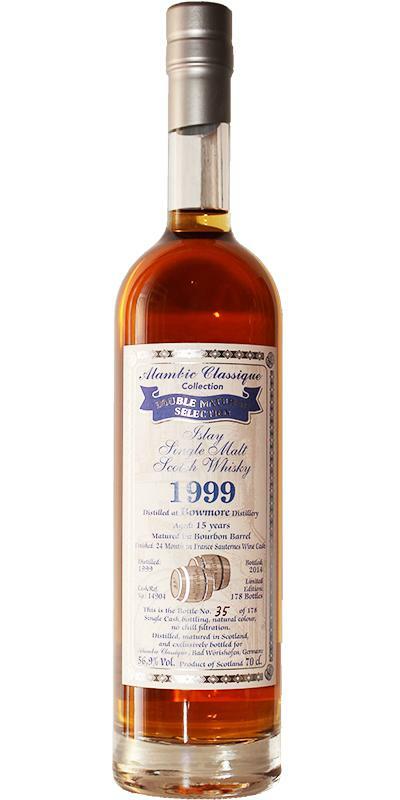 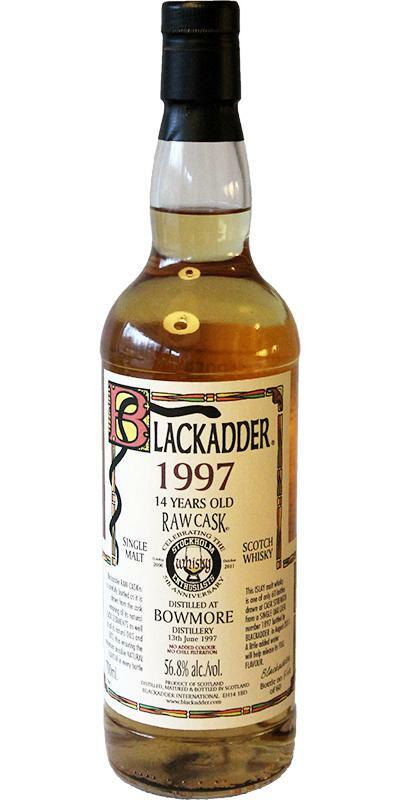 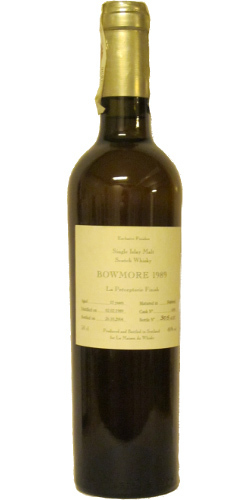 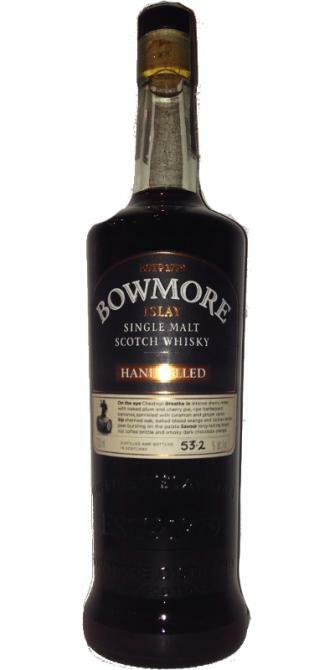 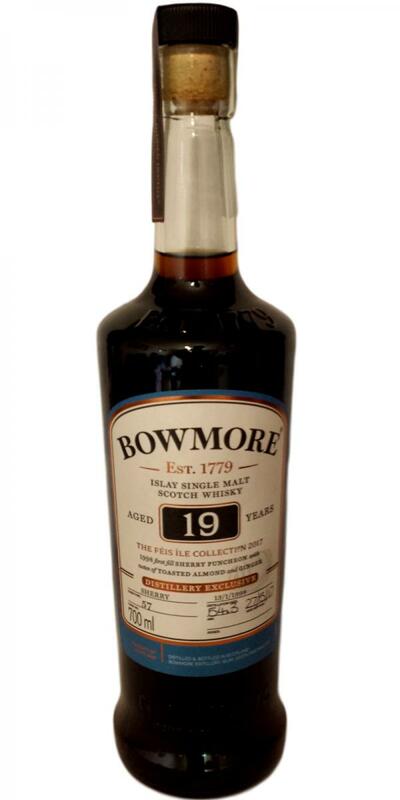 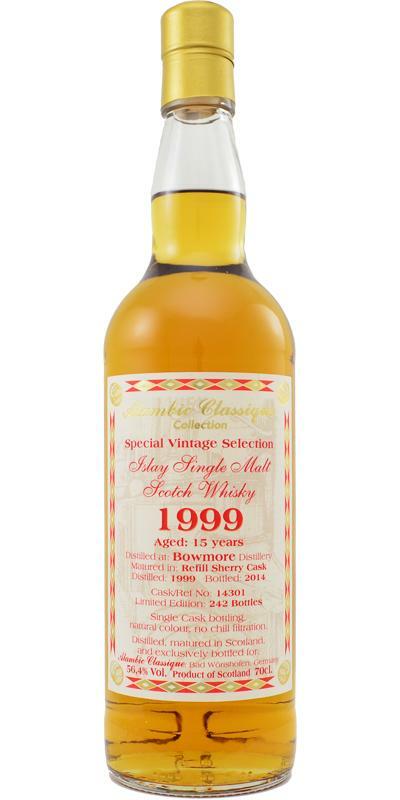 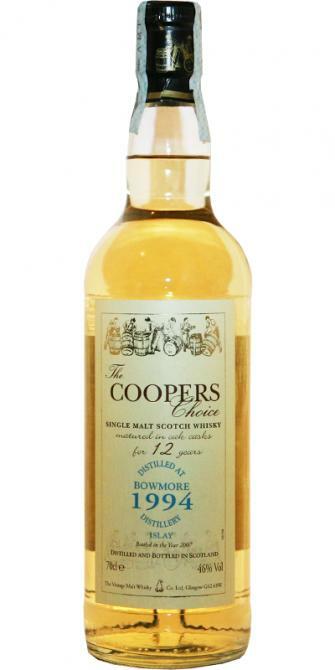 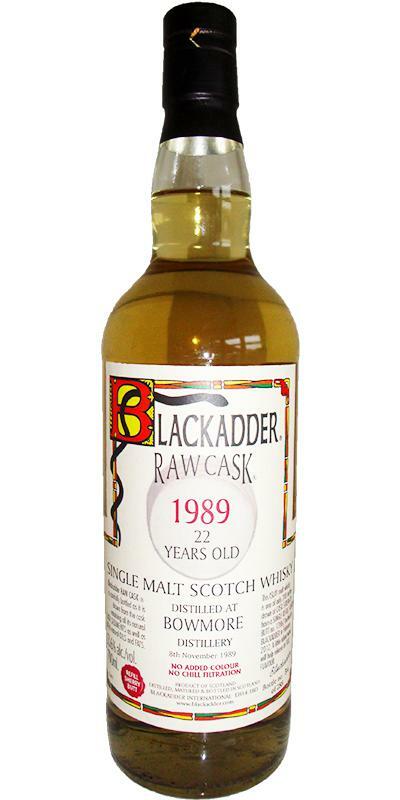 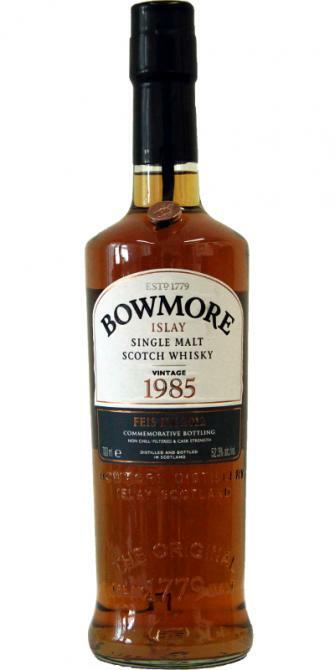 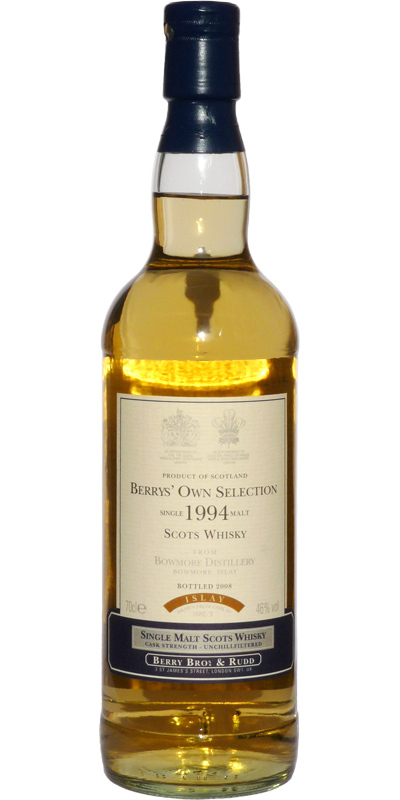 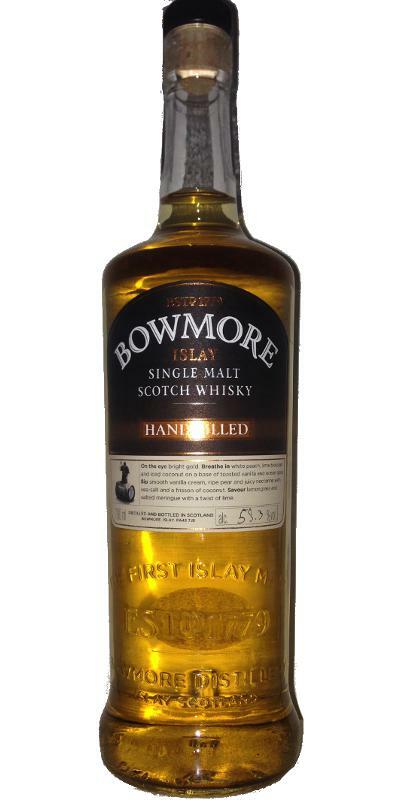 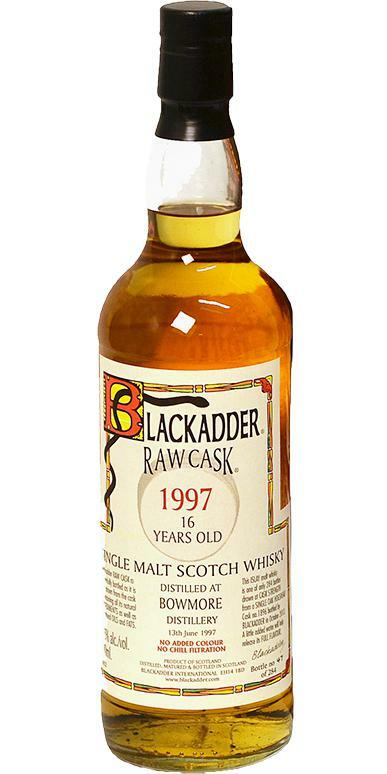 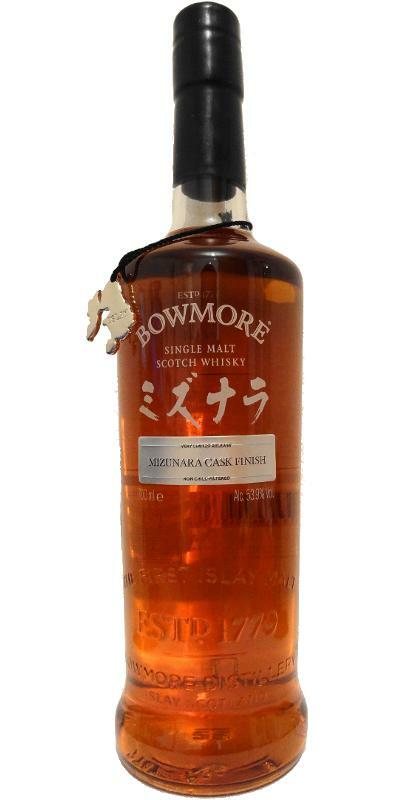 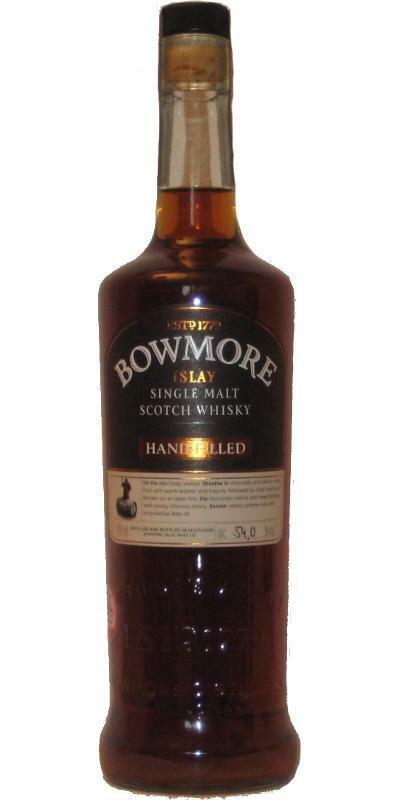 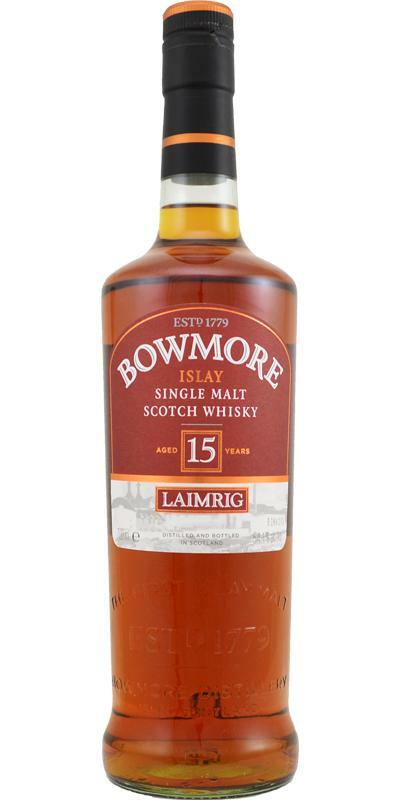 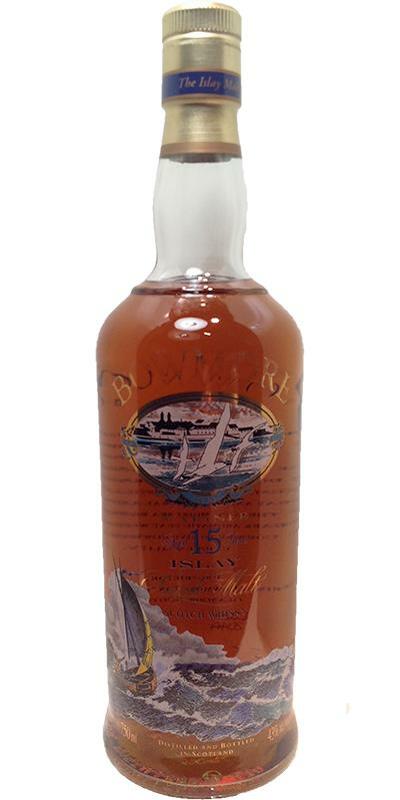 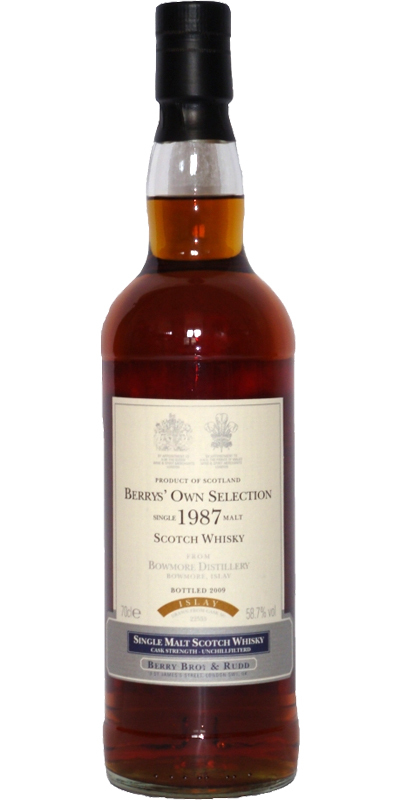 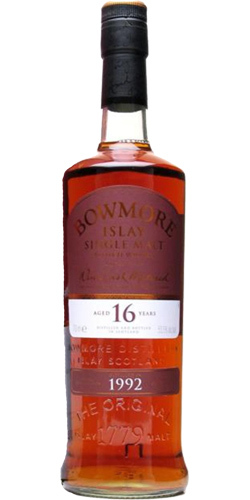 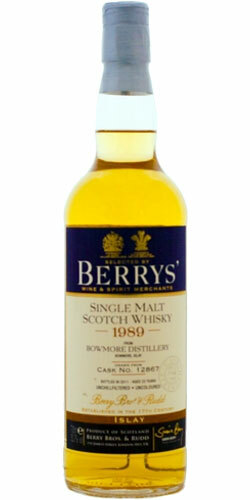 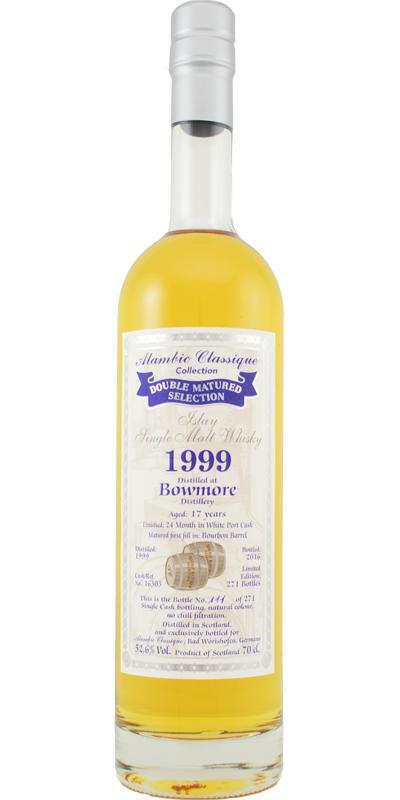 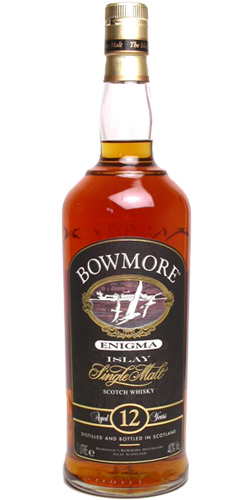 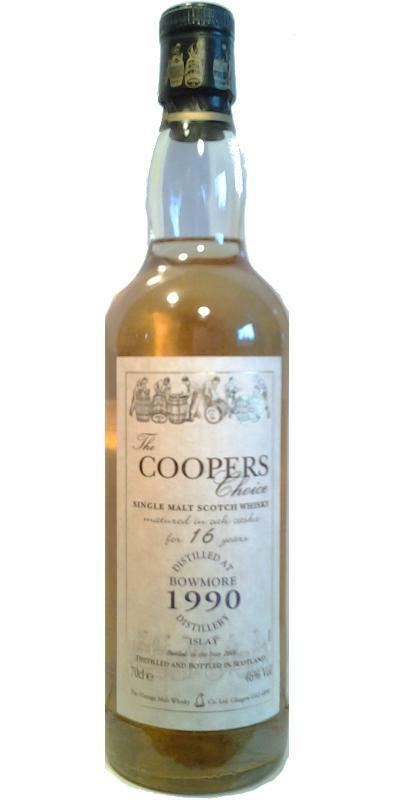 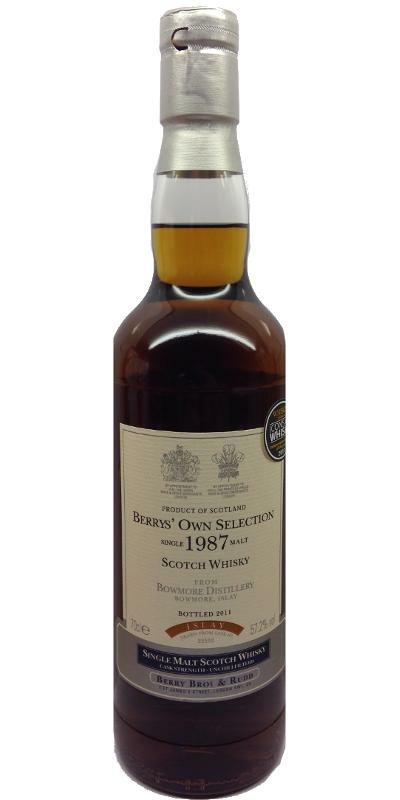 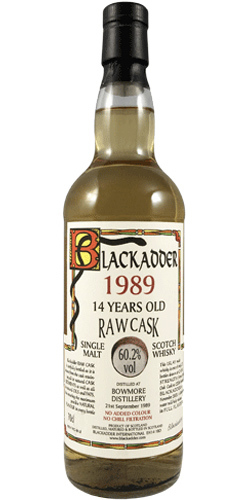 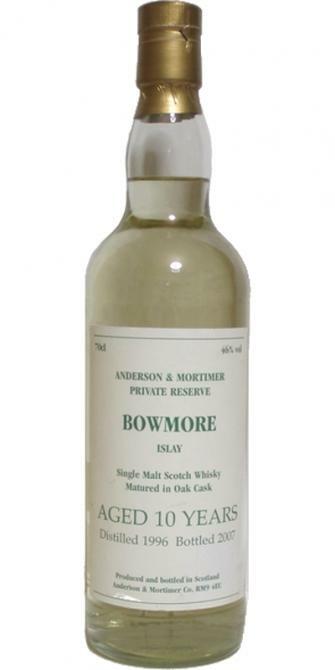 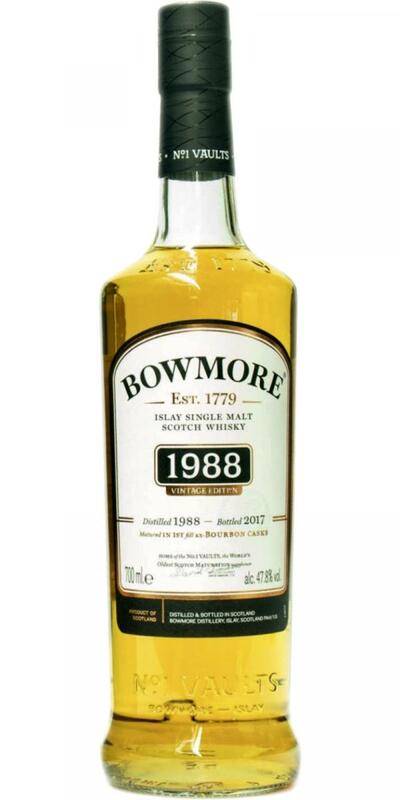 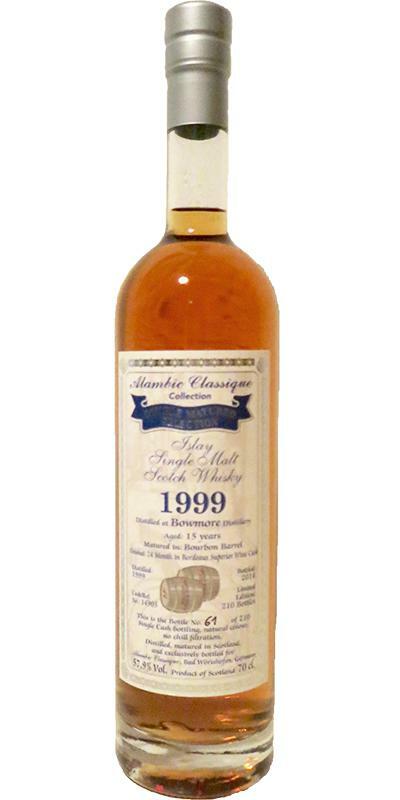 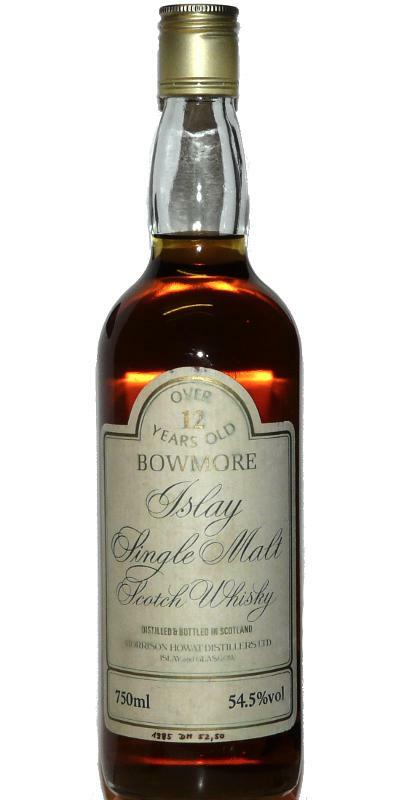 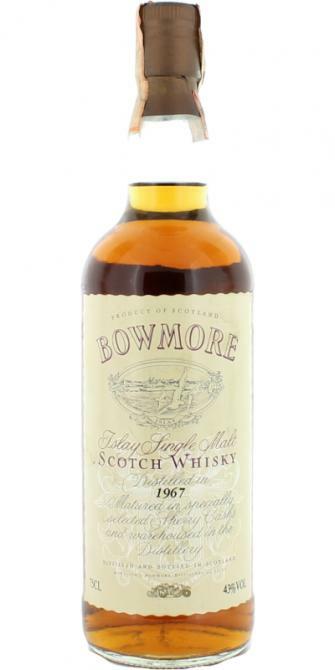 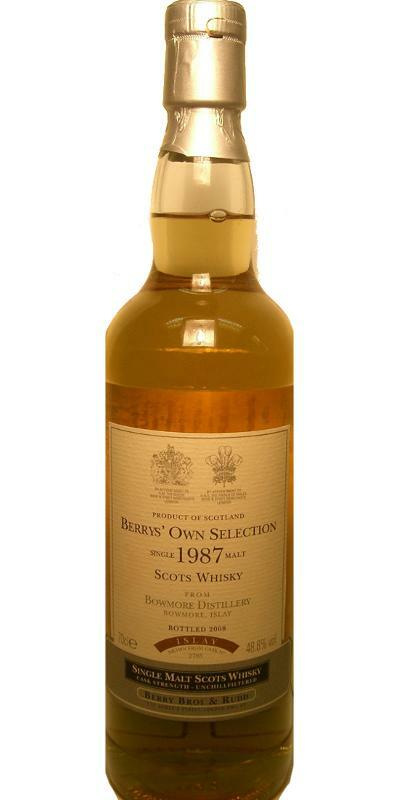 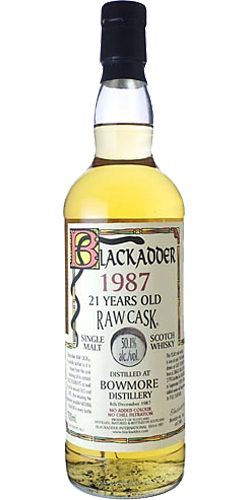 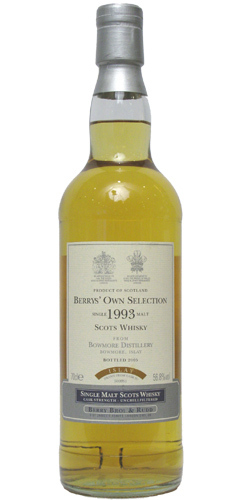 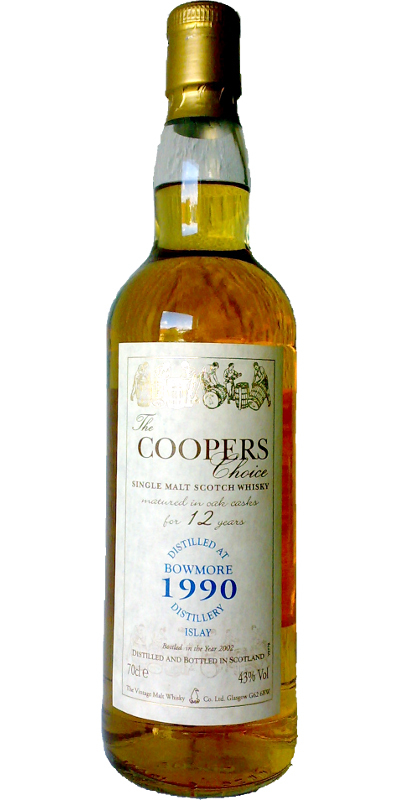 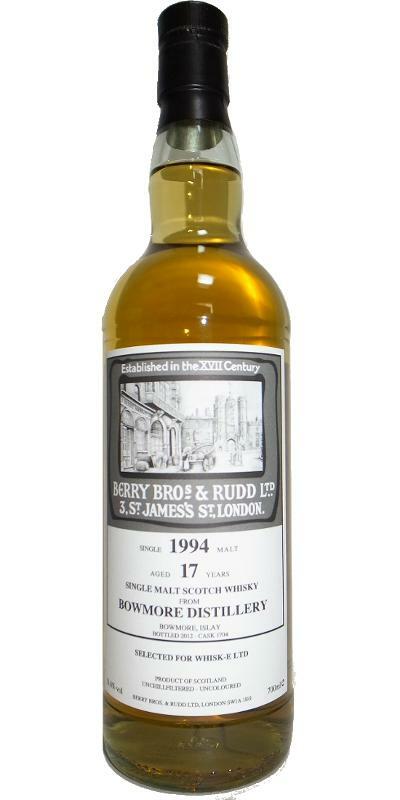 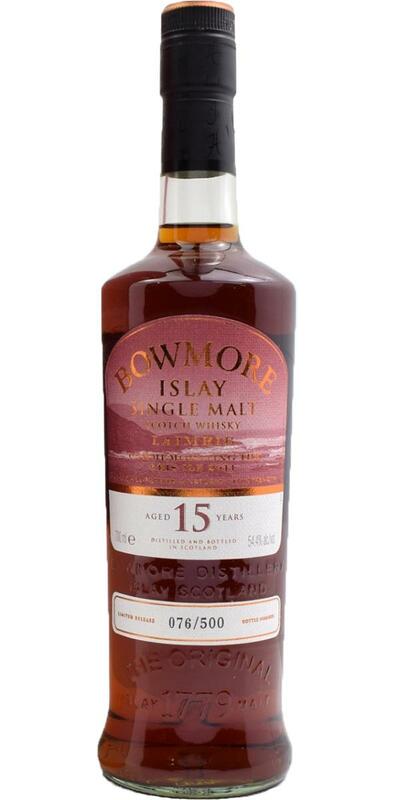 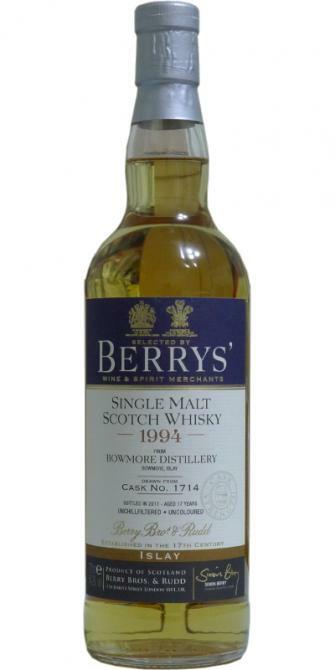 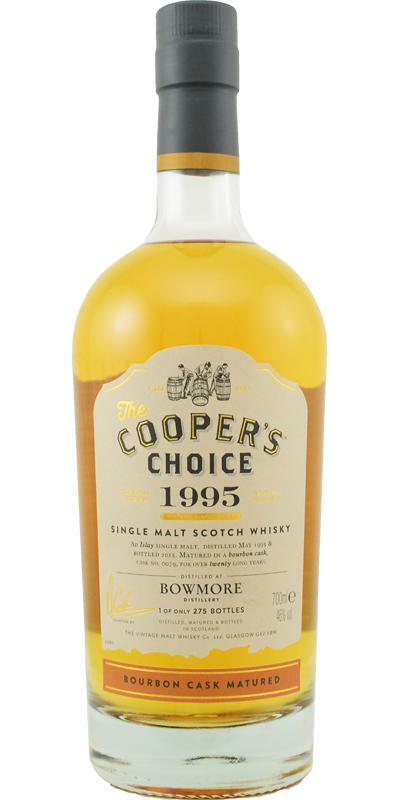 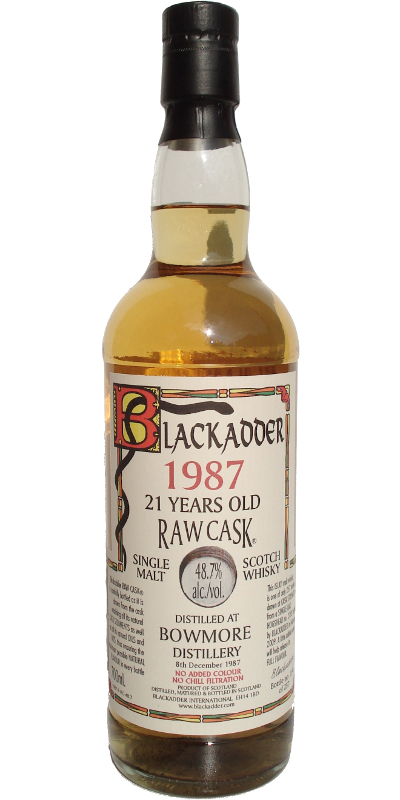 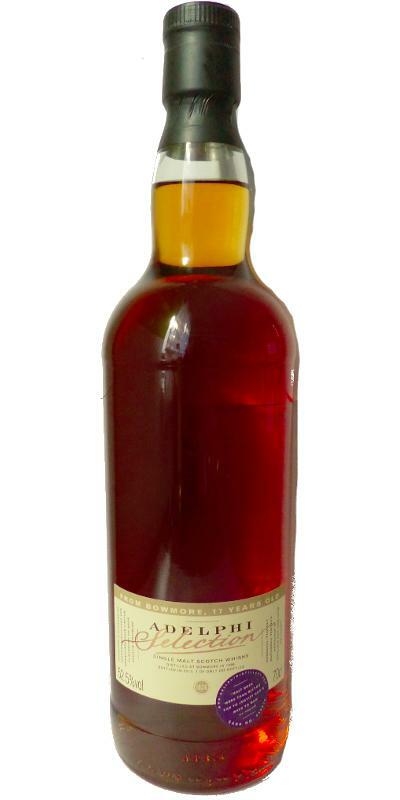 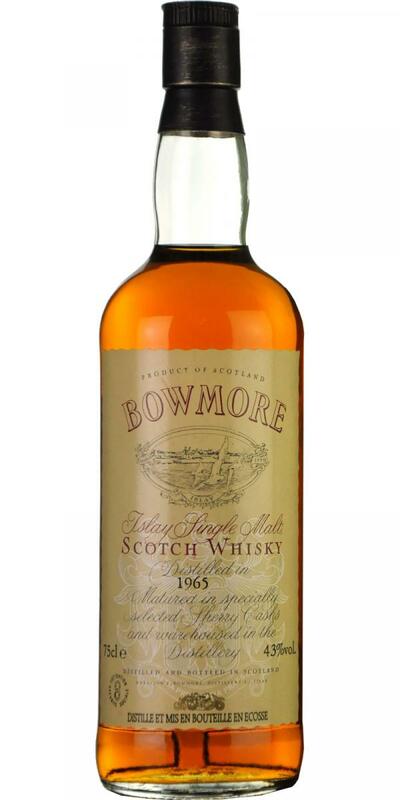 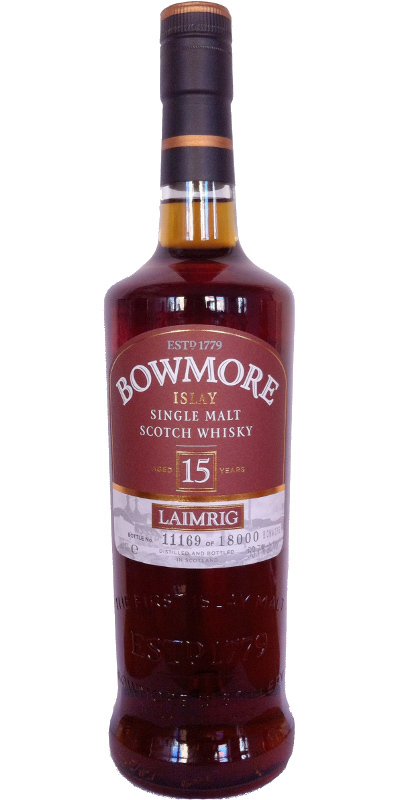 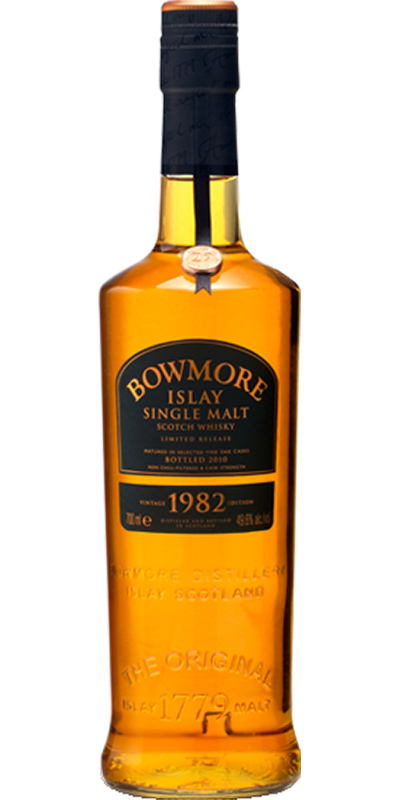 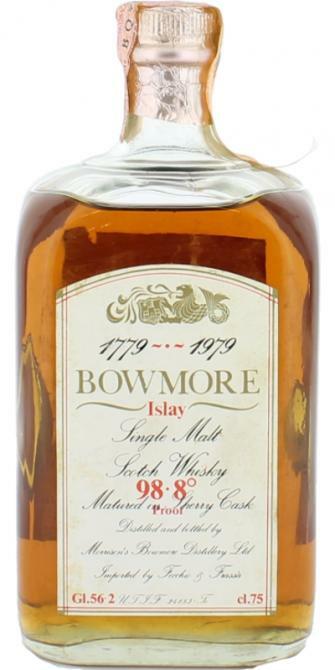 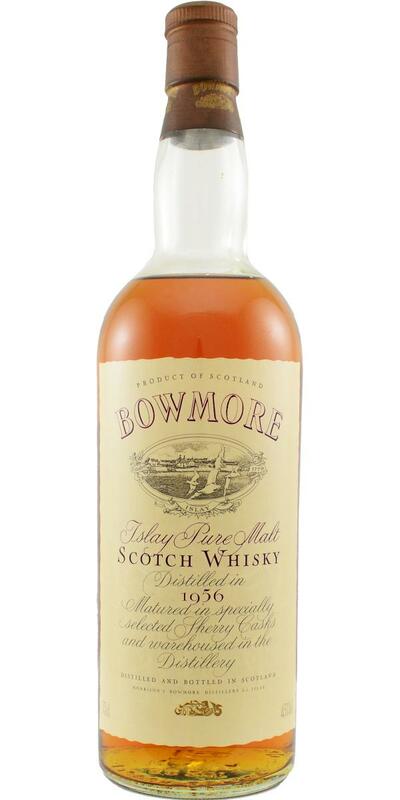 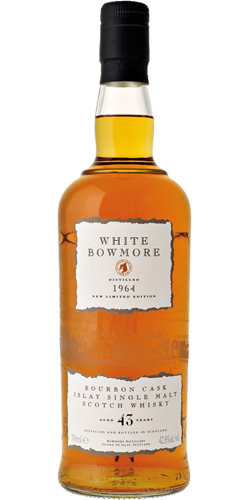 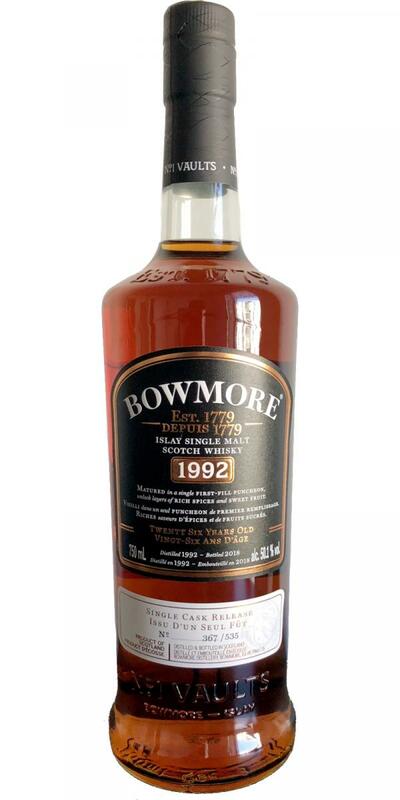 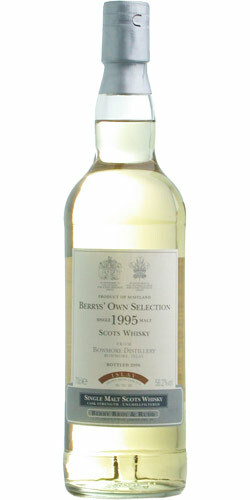 Bowmore 1996 BR 14 58.5 % Vol. 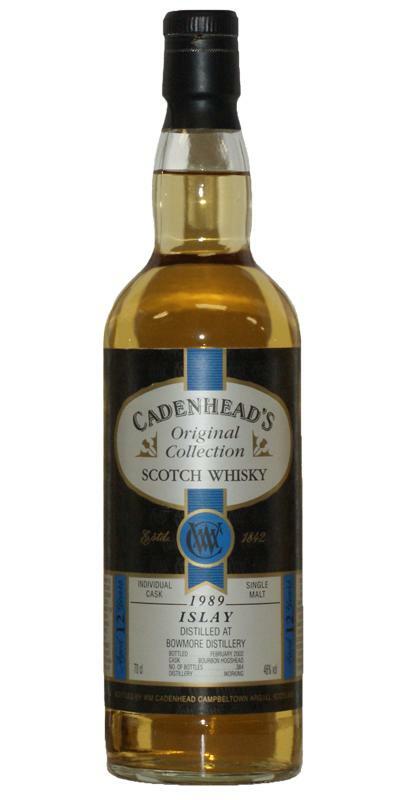 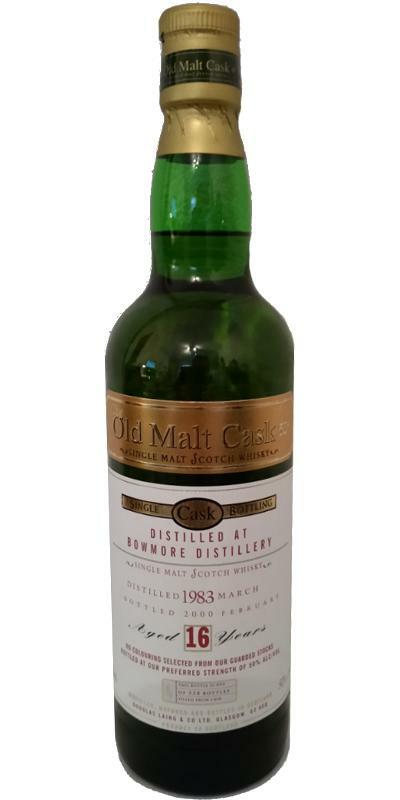 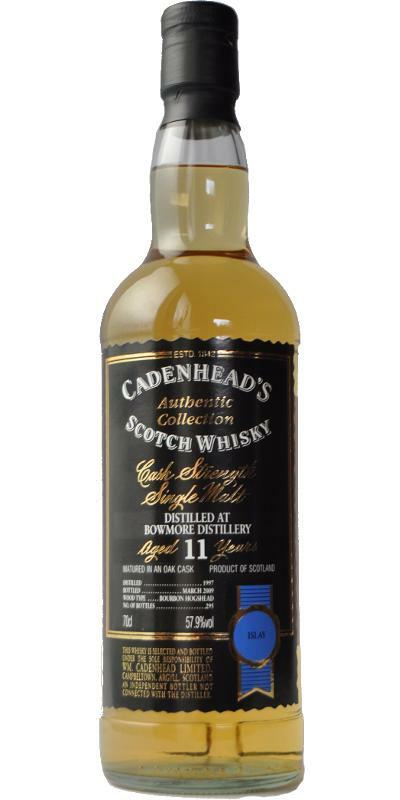 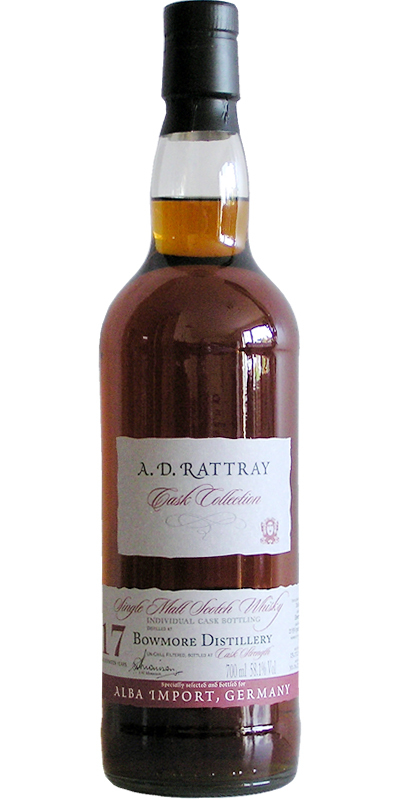 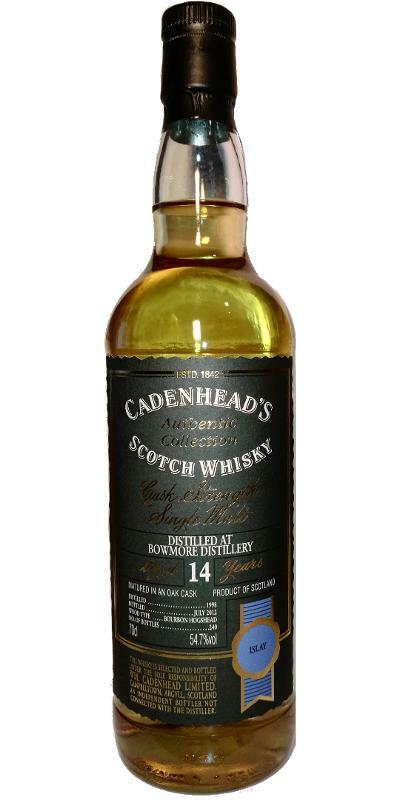 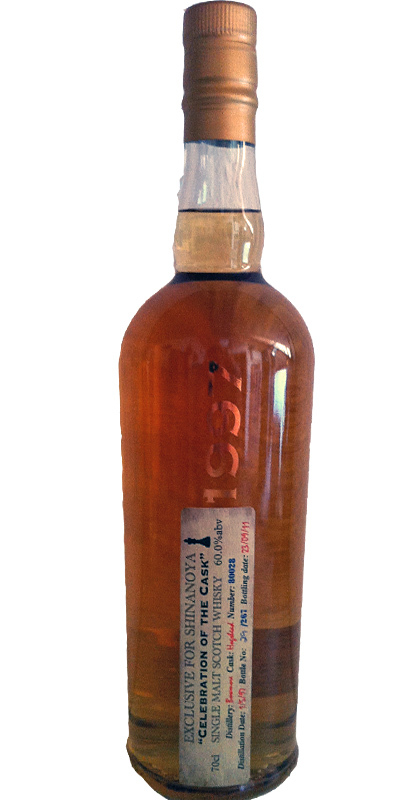 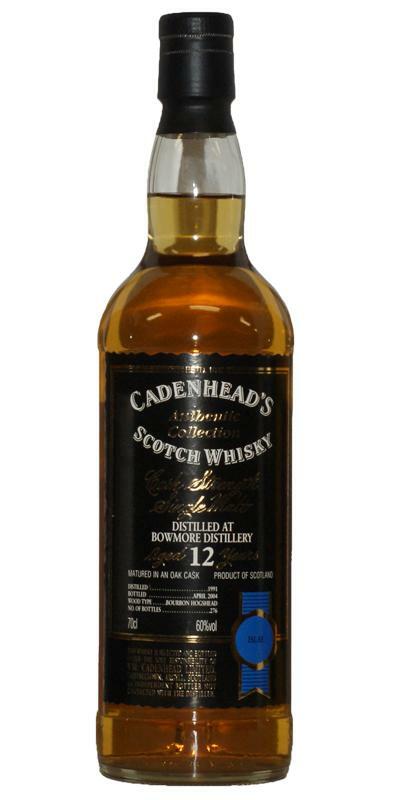 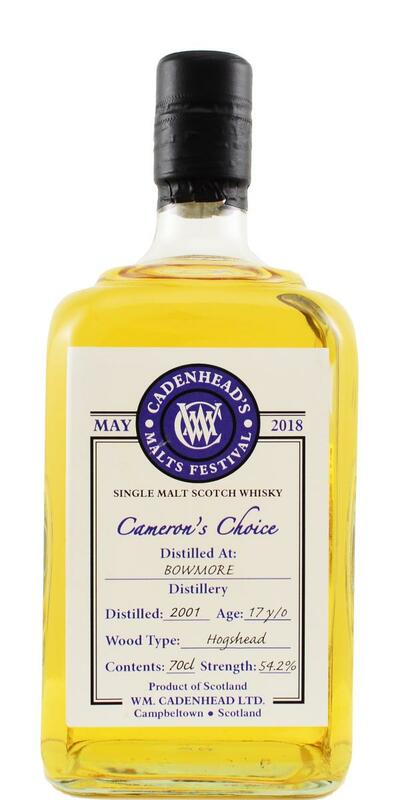 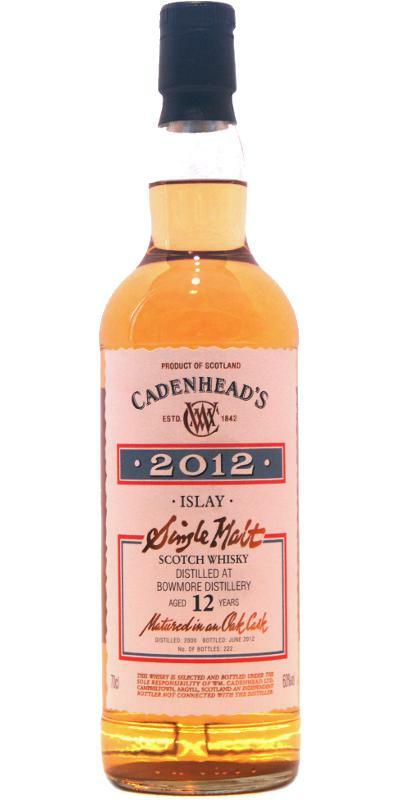 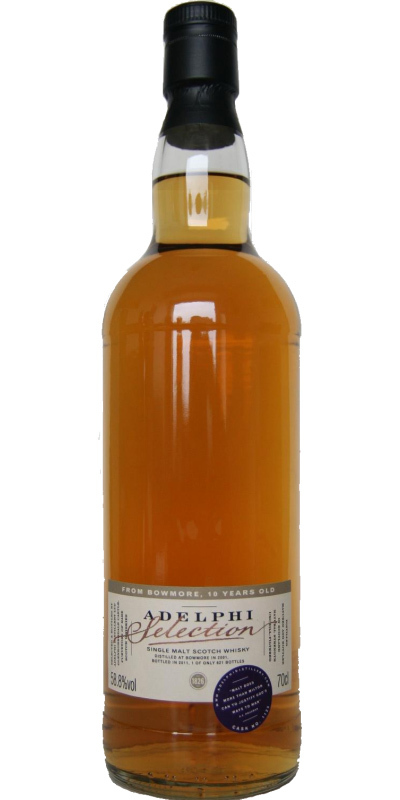 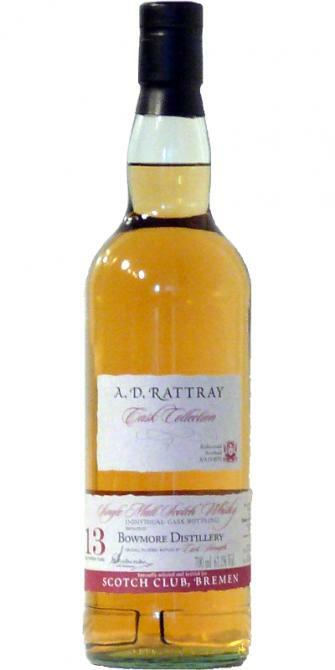 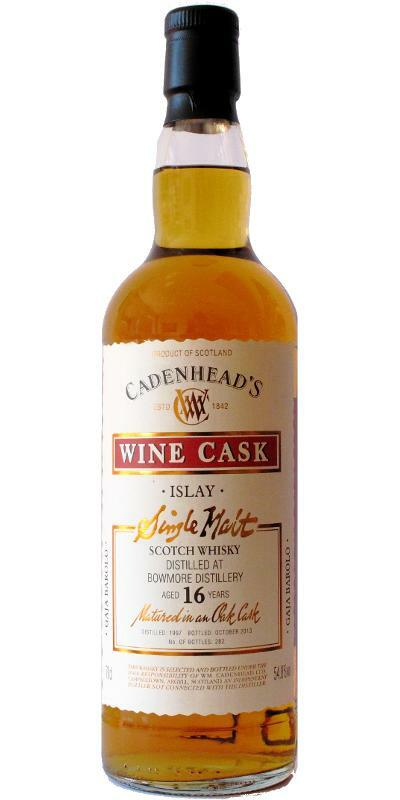 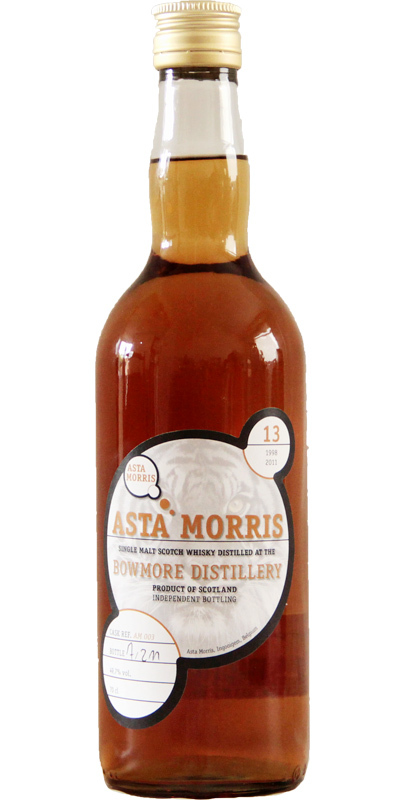 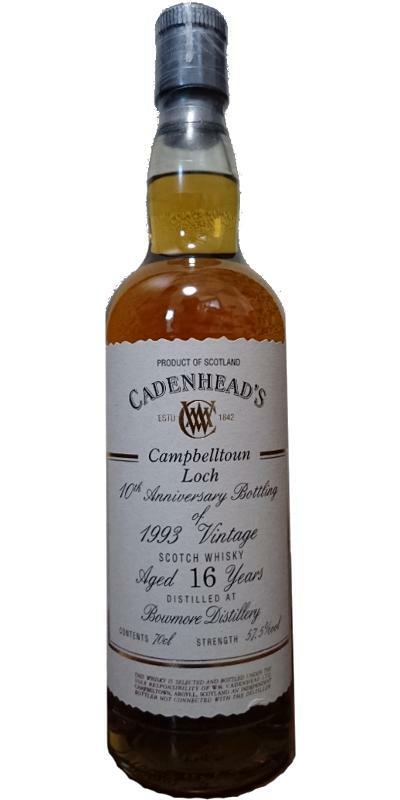 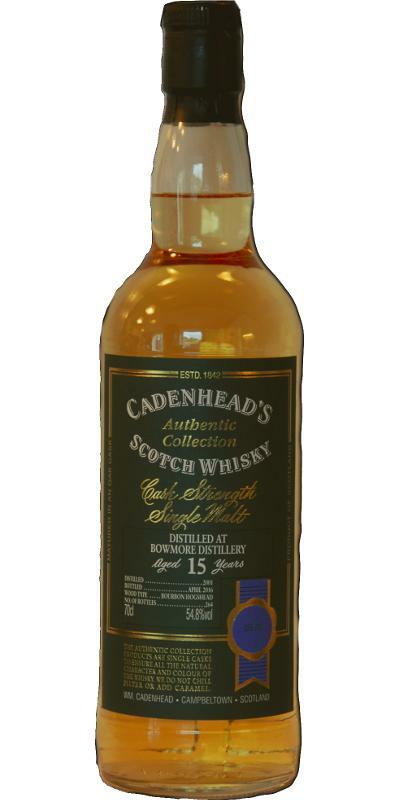 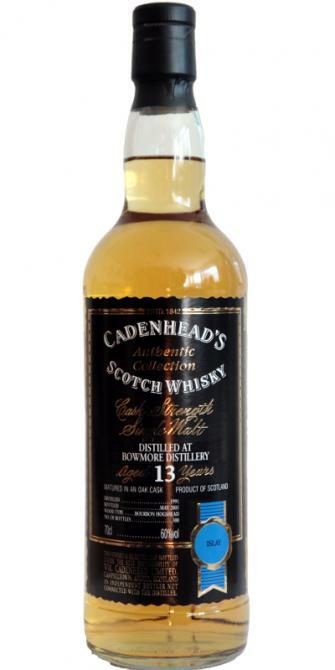 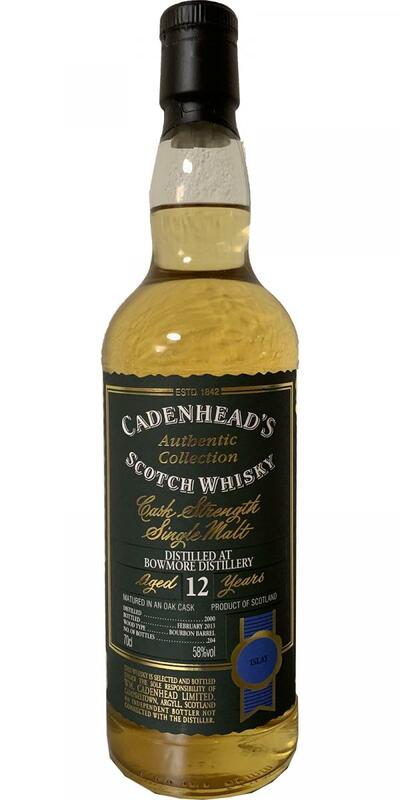 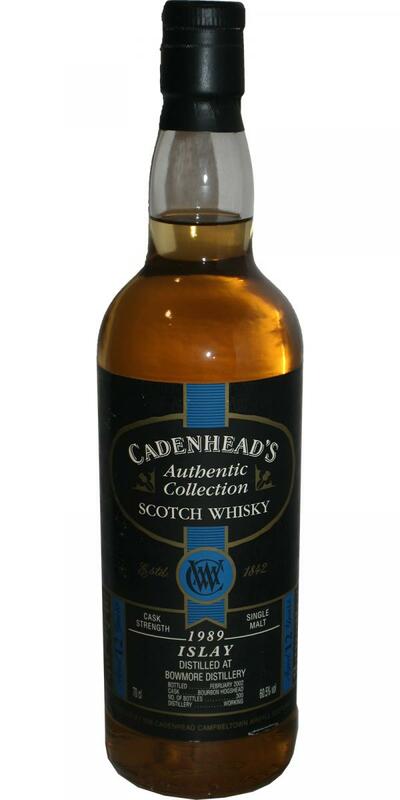 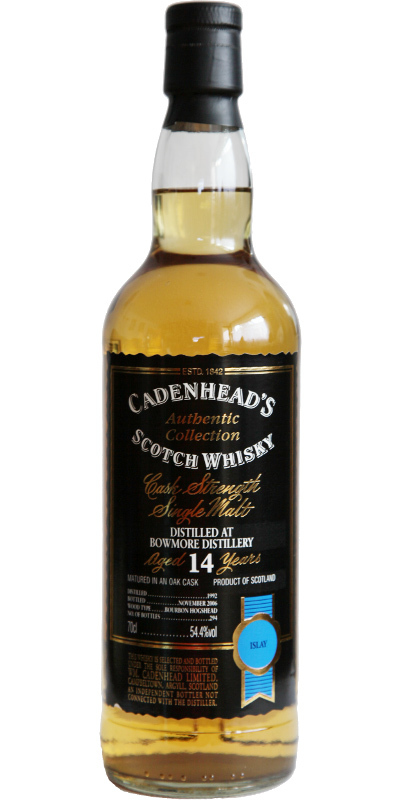 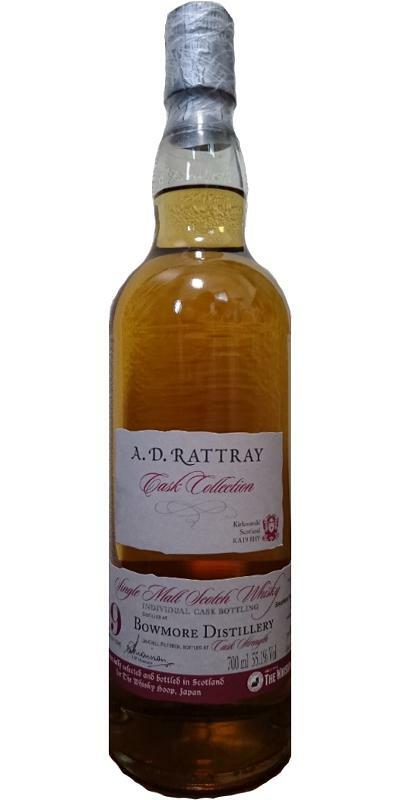 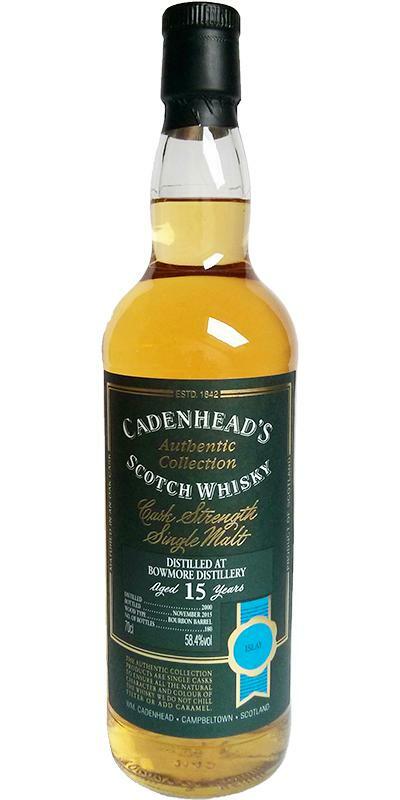 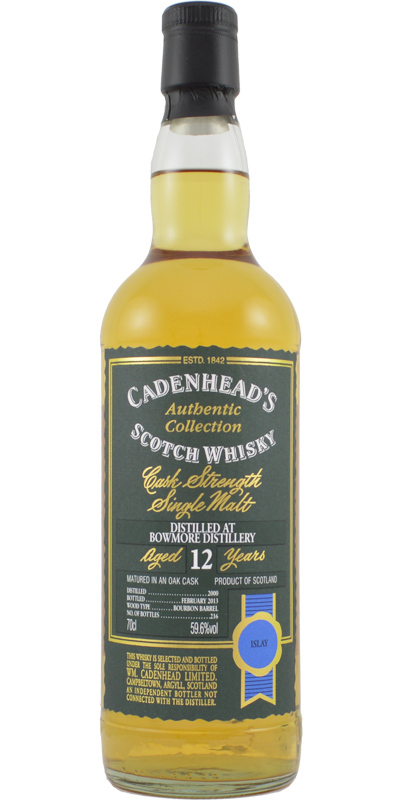 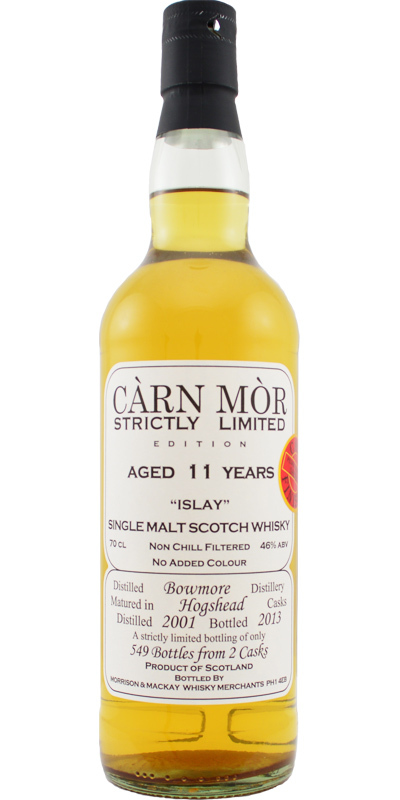 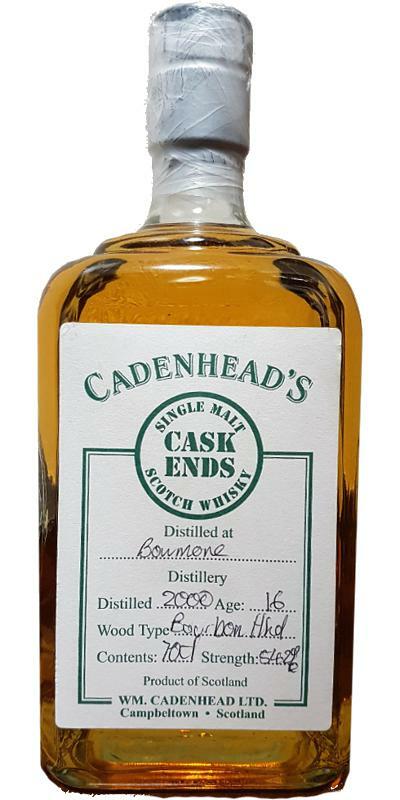 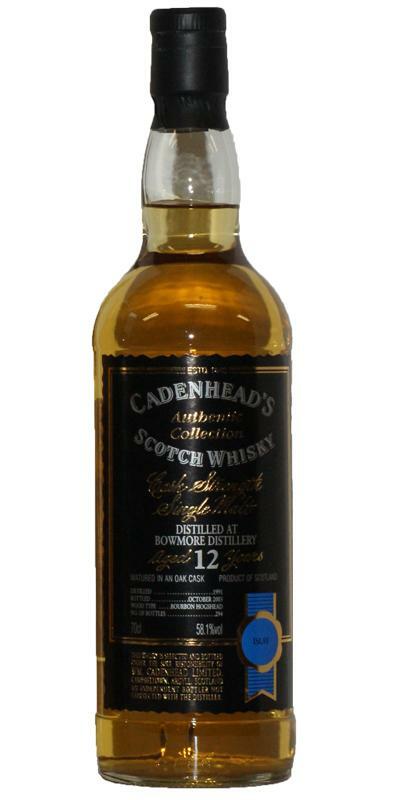 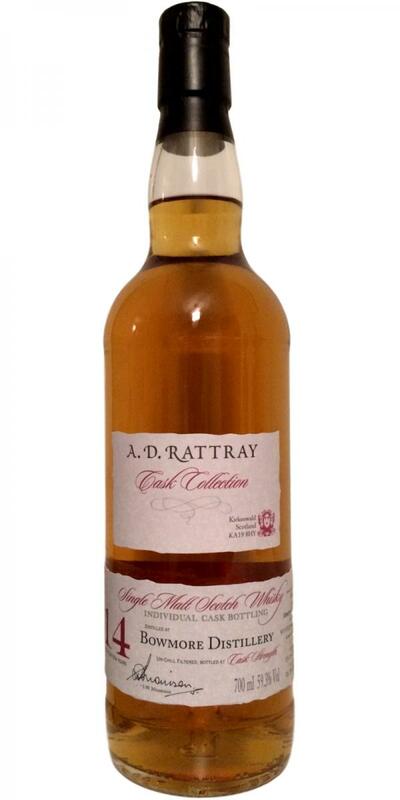 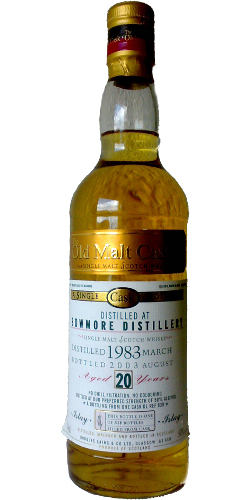 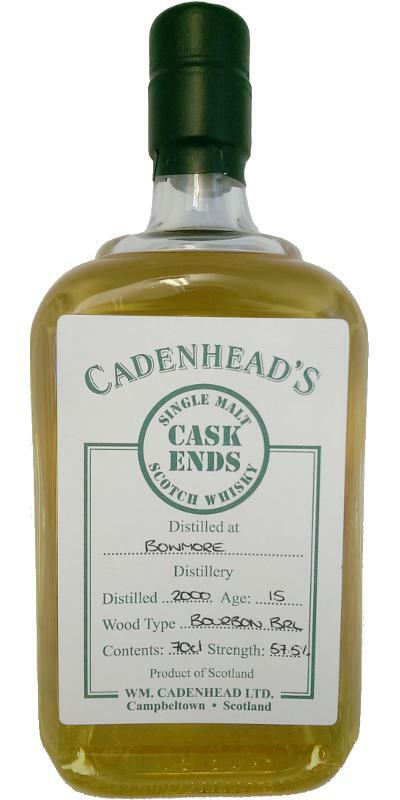 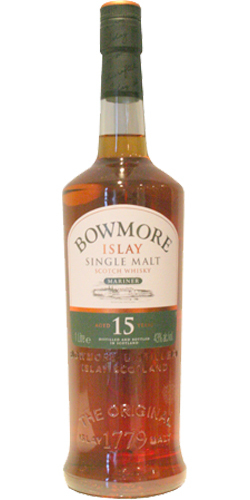 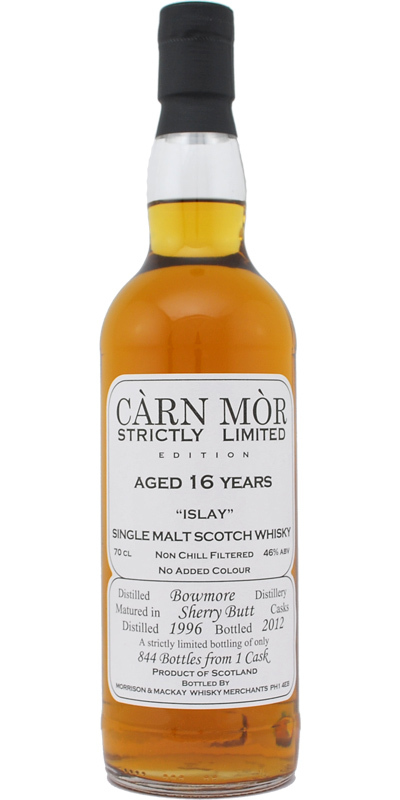 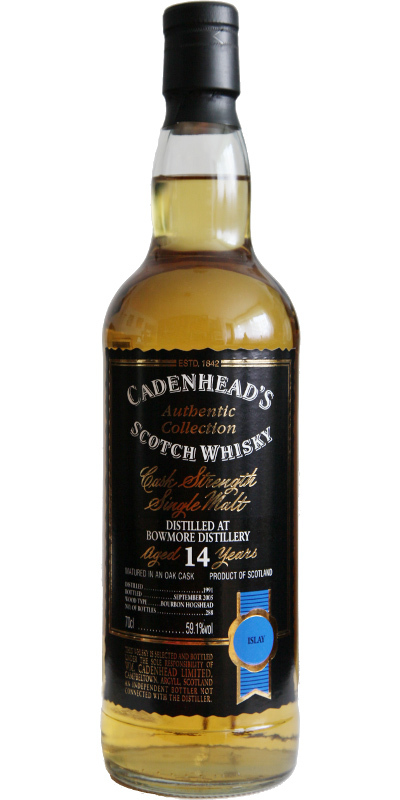 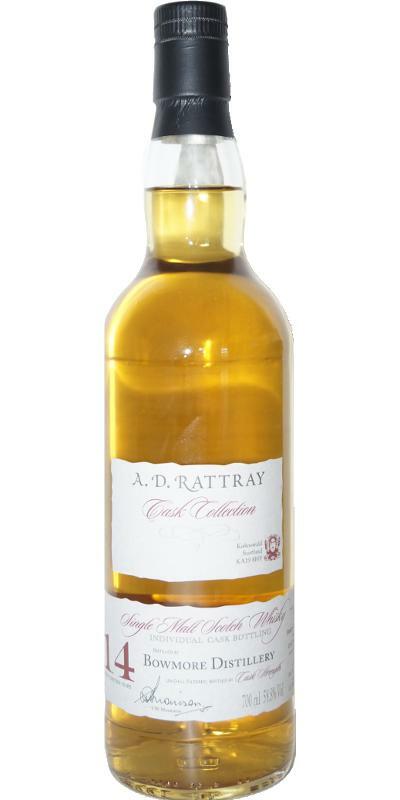 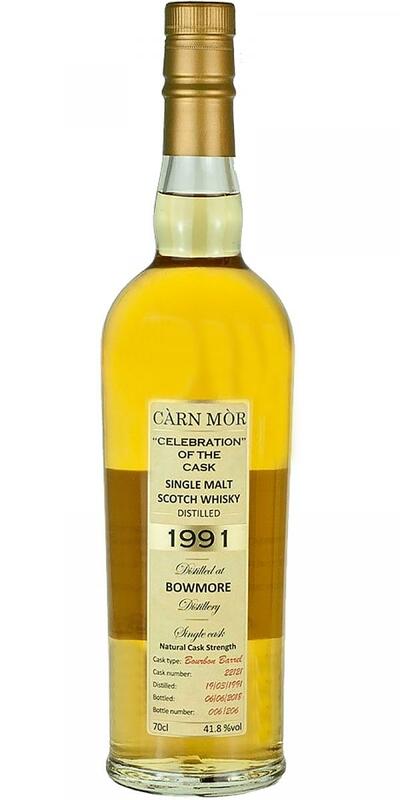 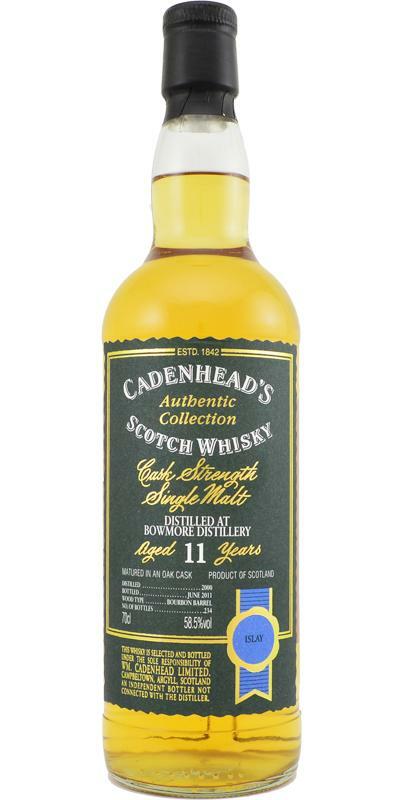 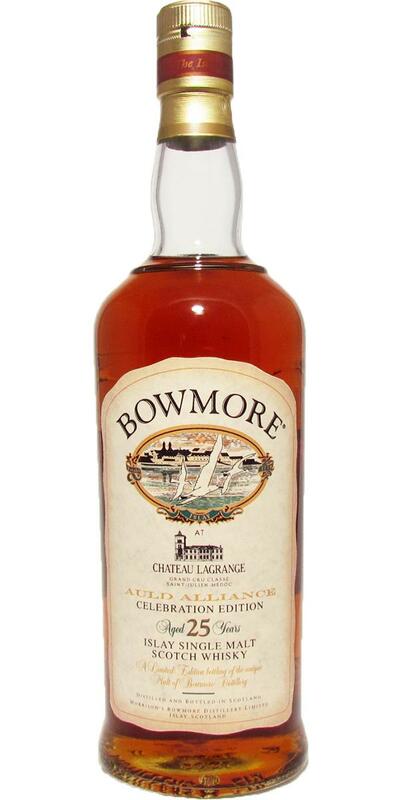 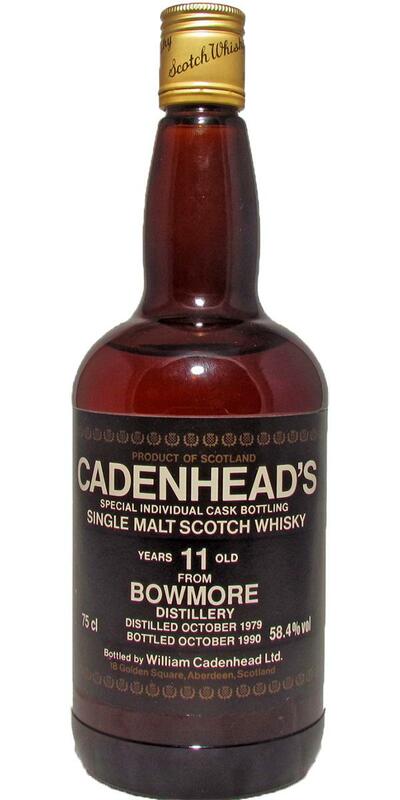 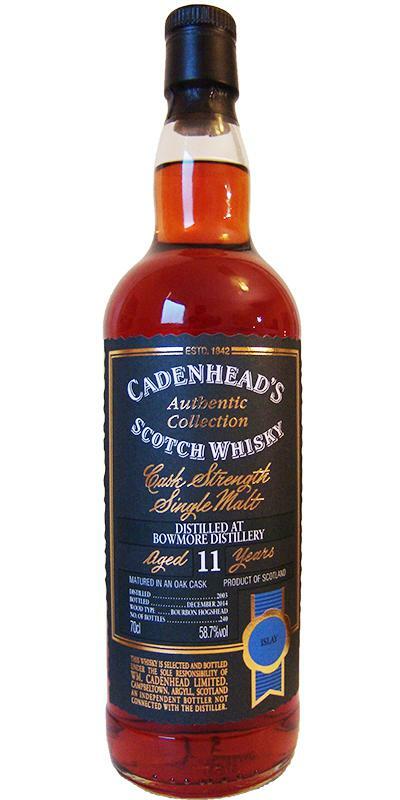 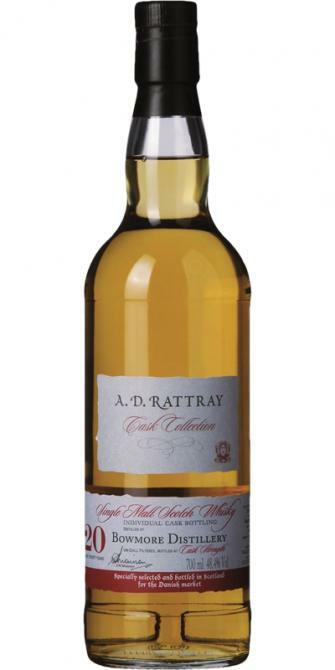 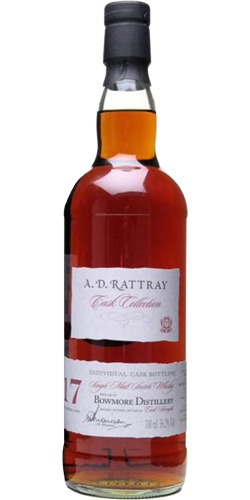 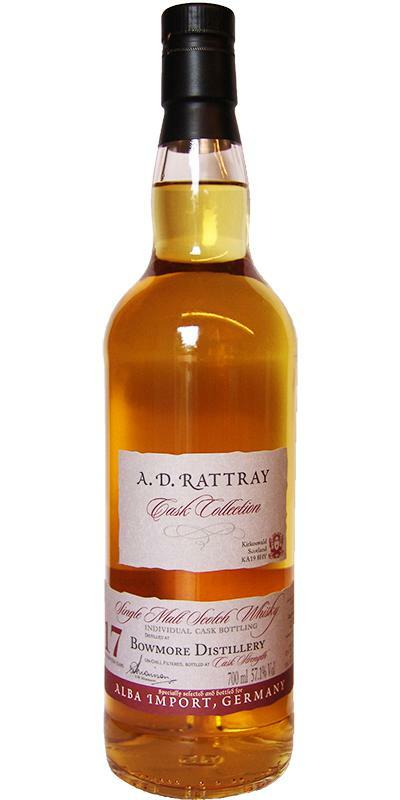 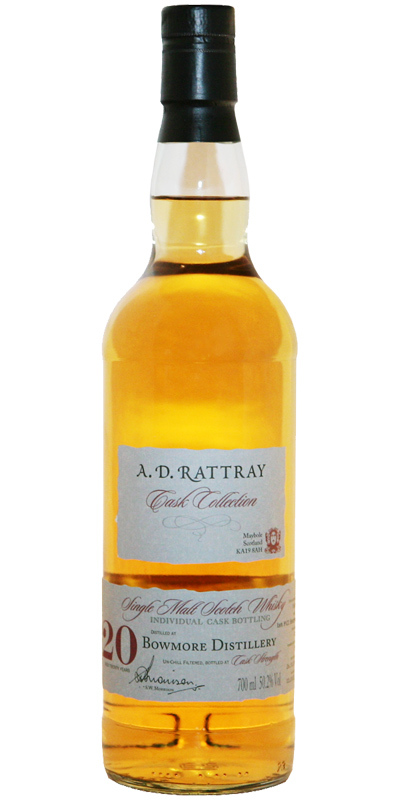 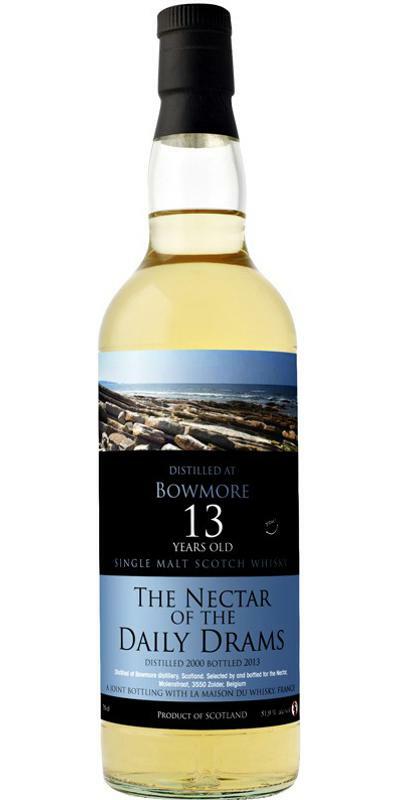 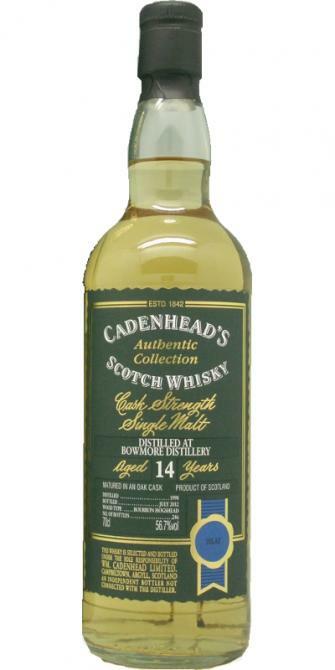 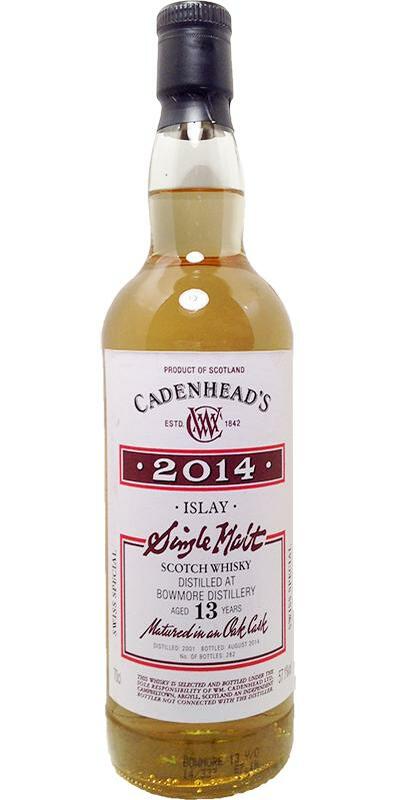 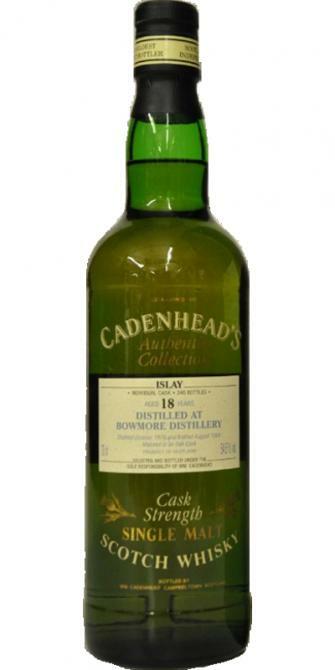 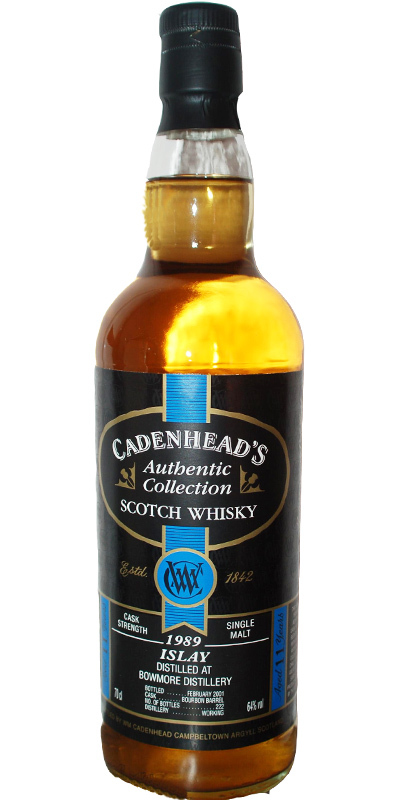 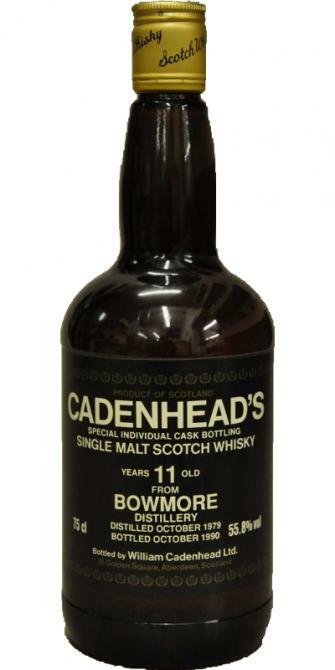 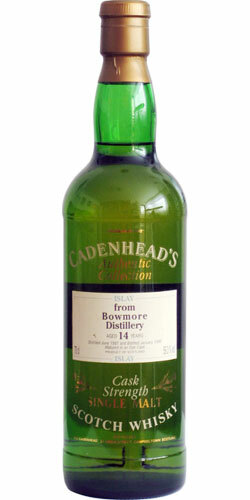 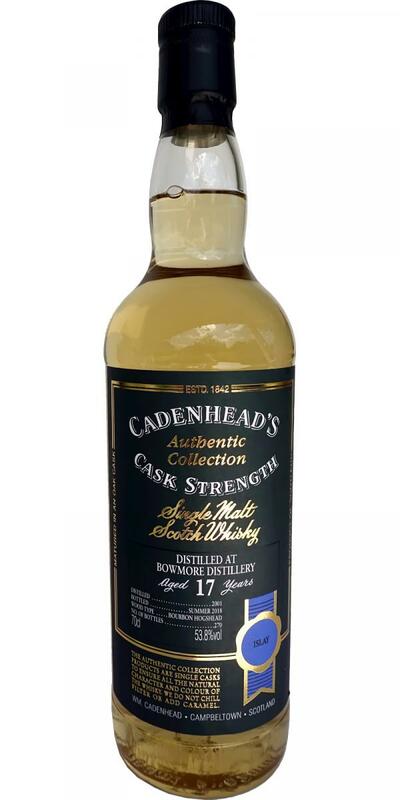 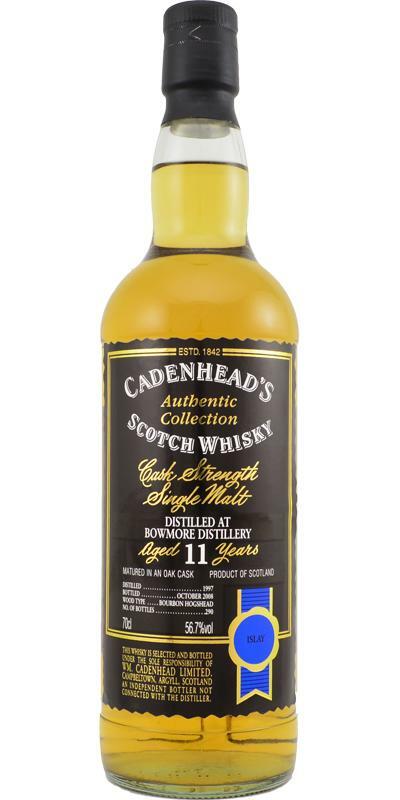 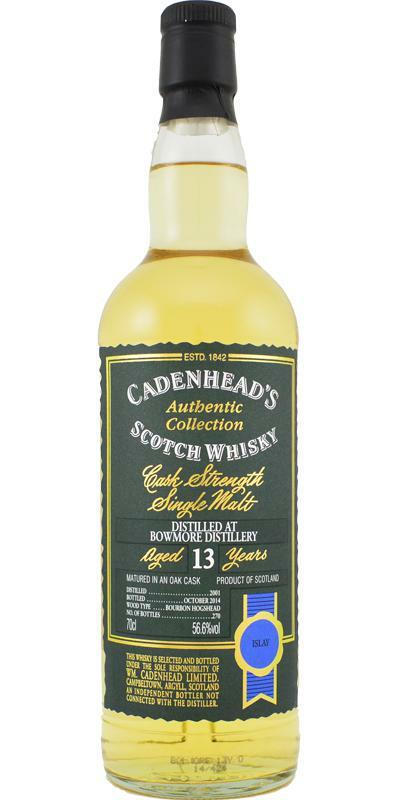 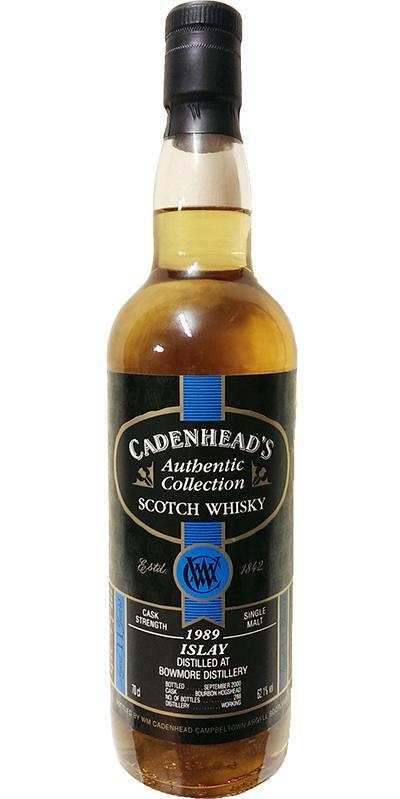 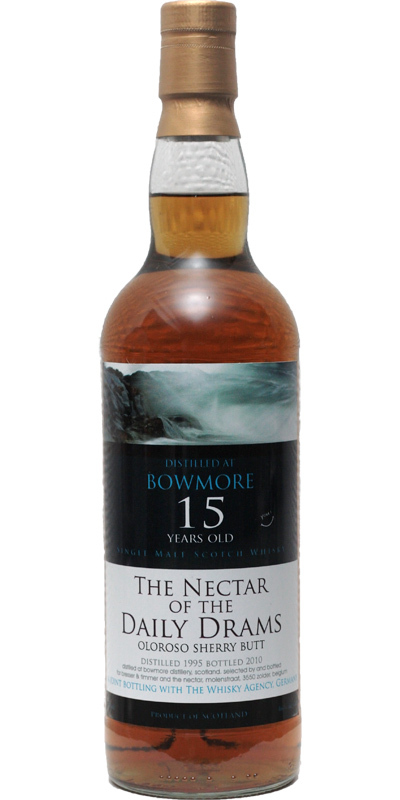 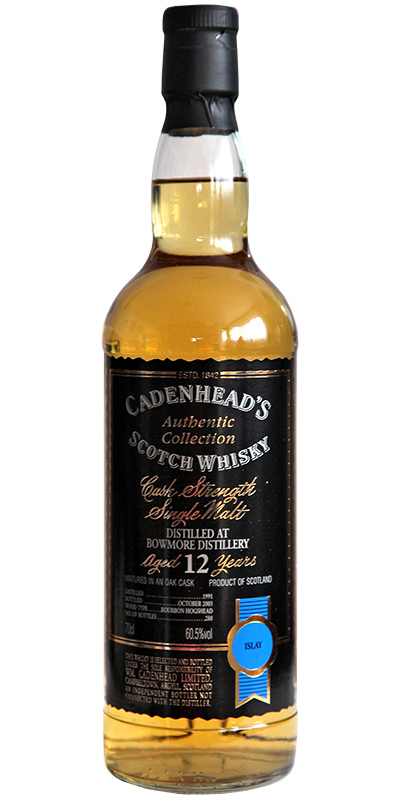 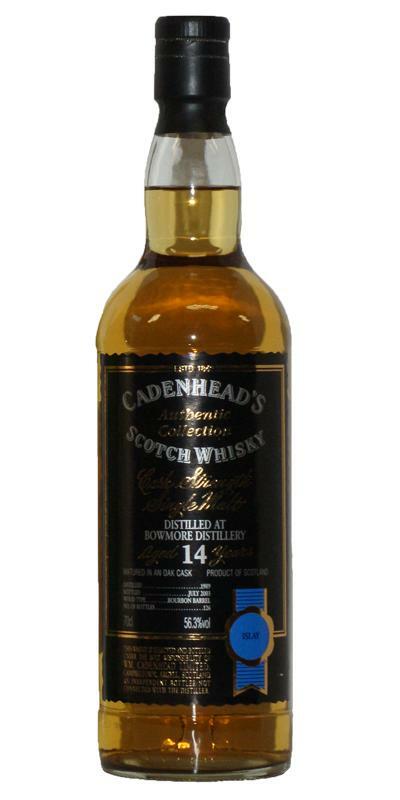 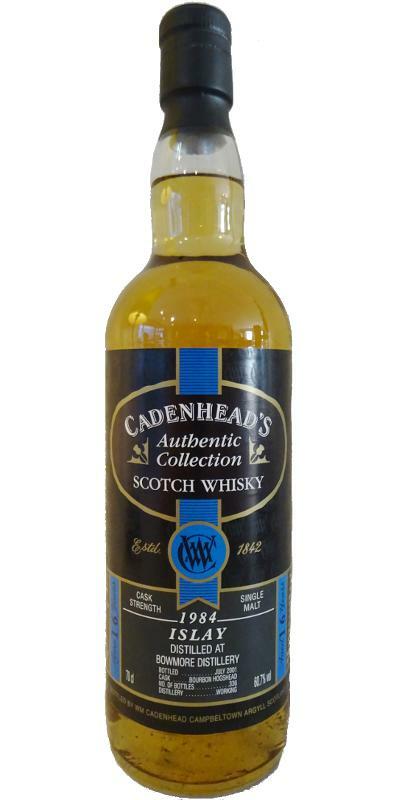 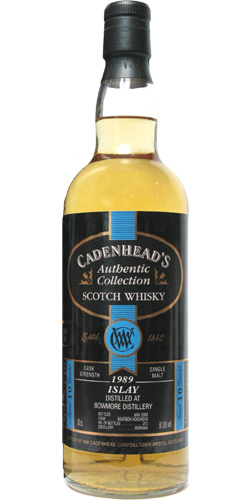 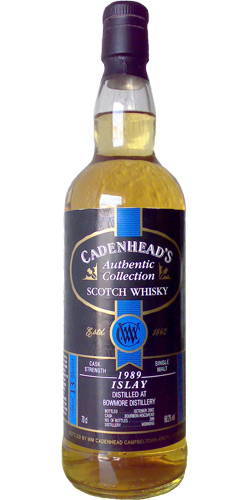 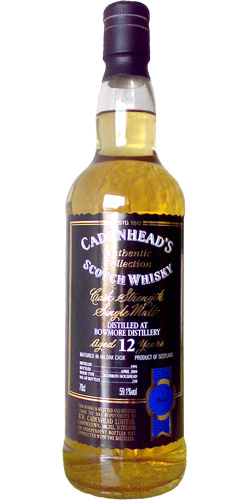 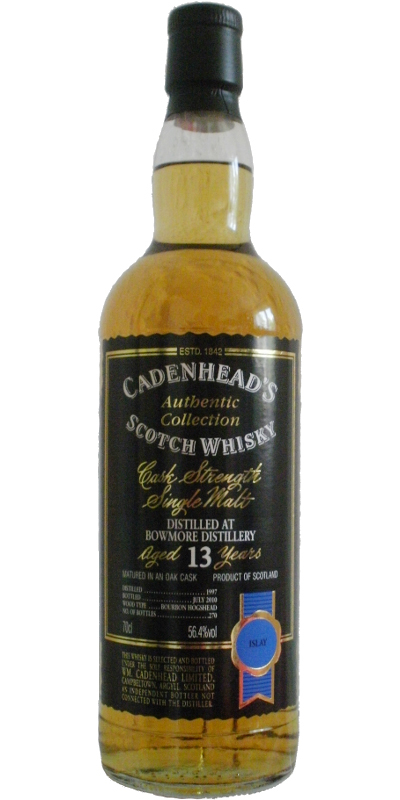 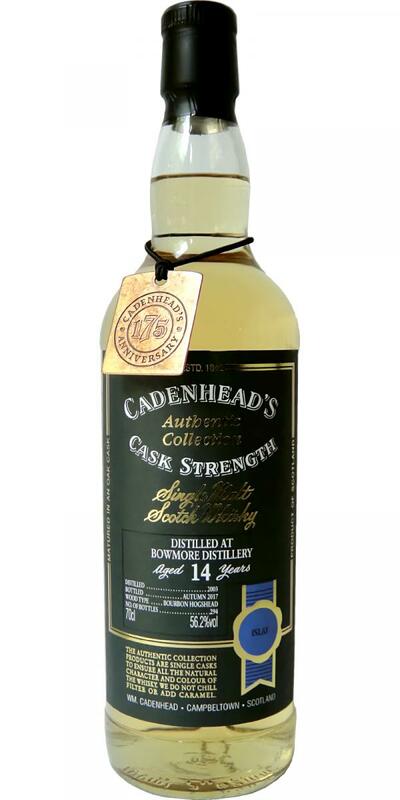 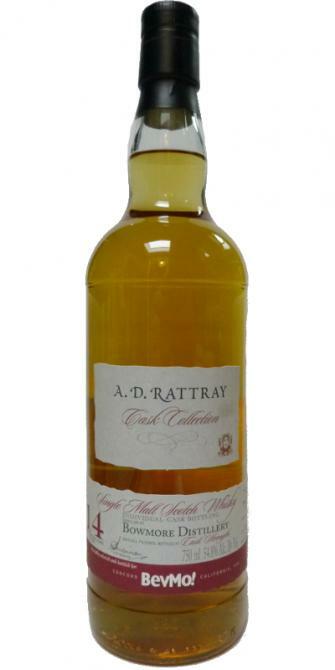 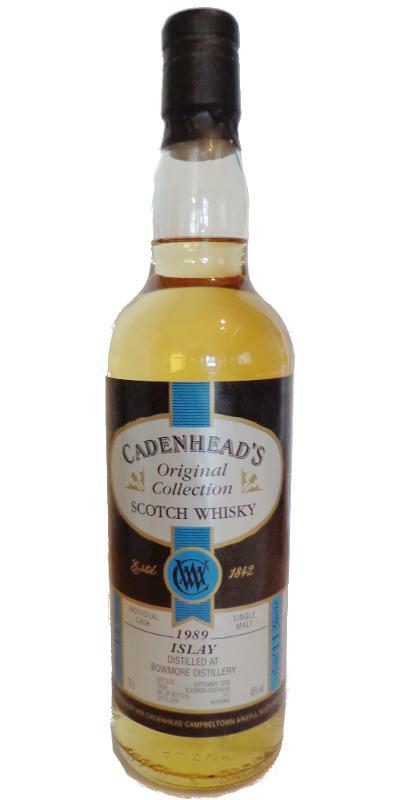 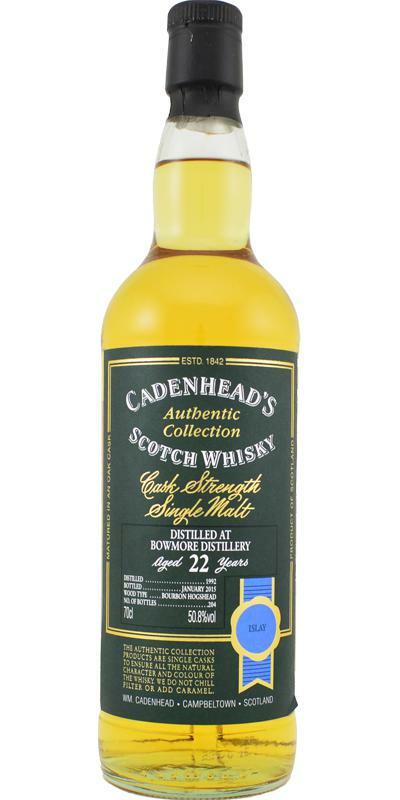 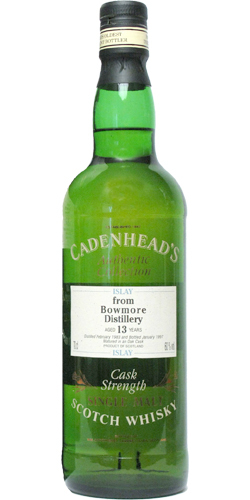 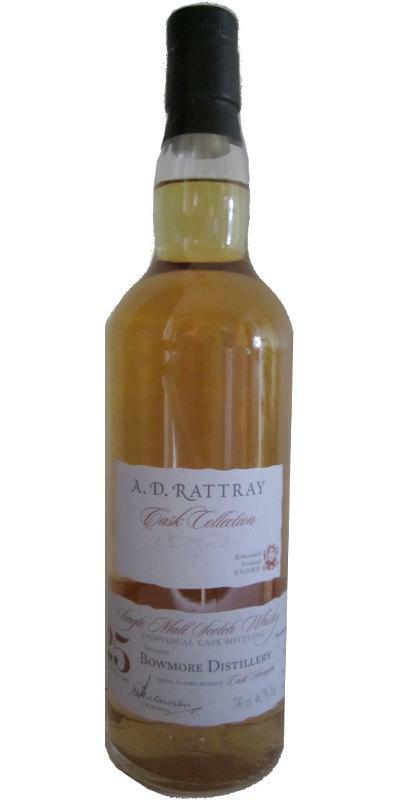 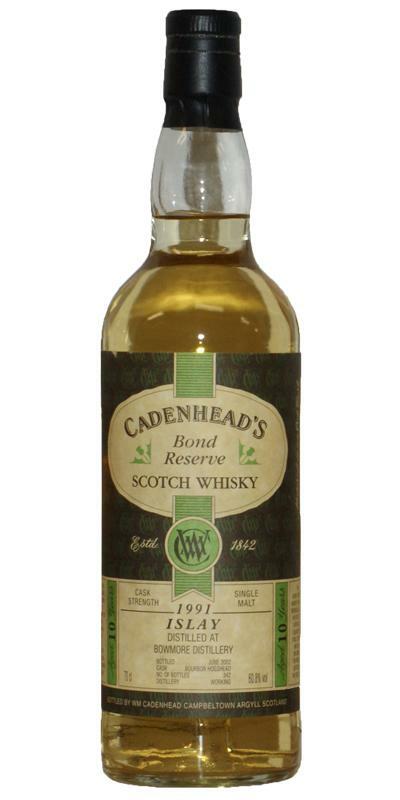 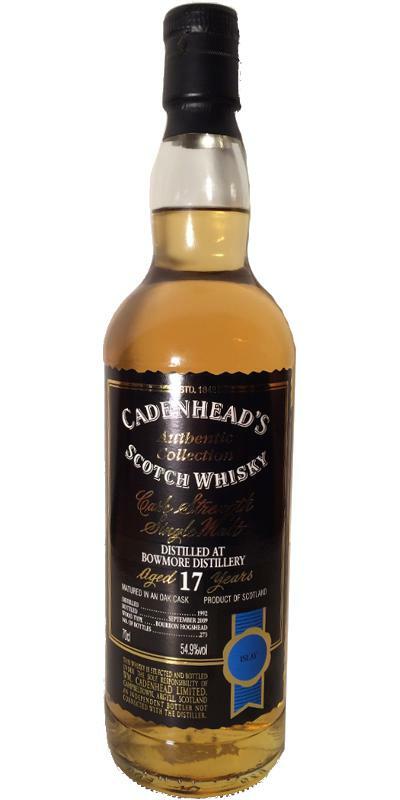 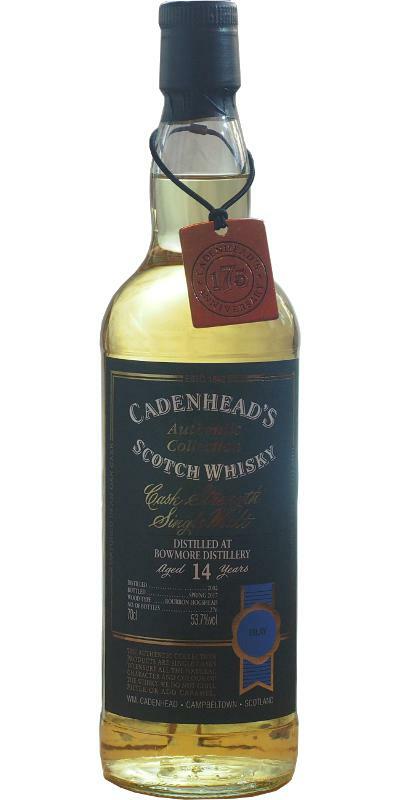 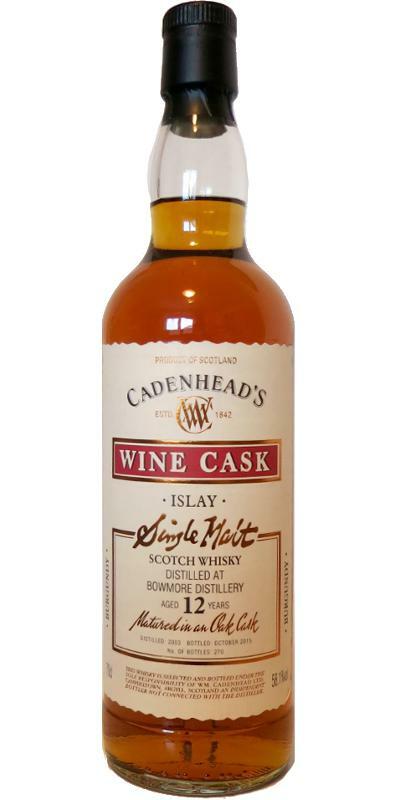 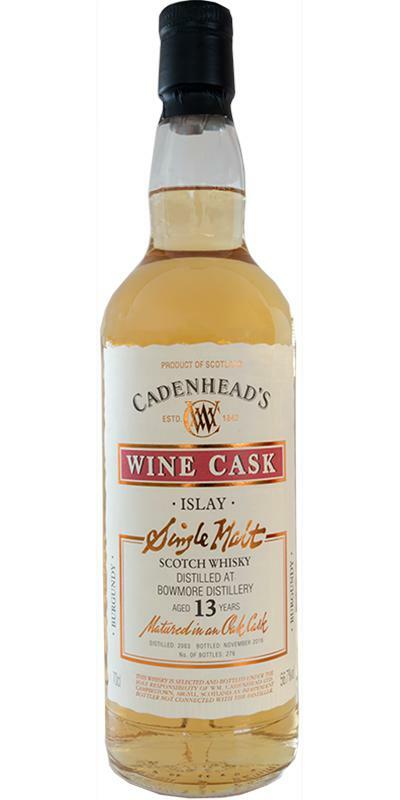 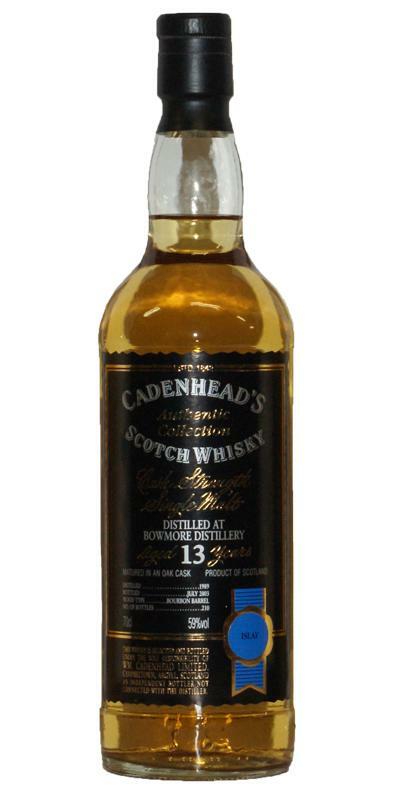 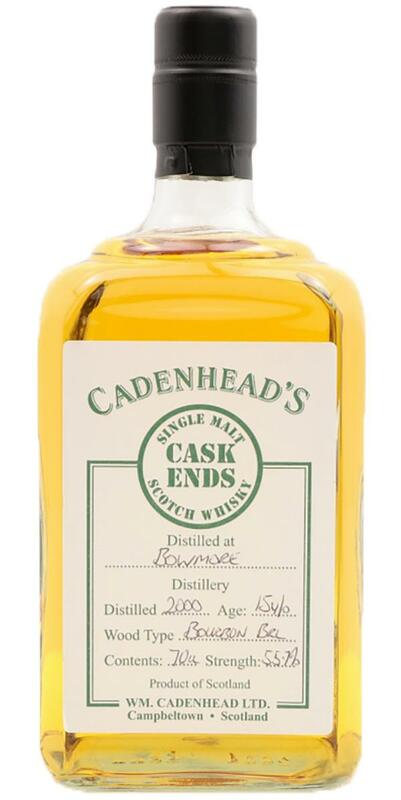 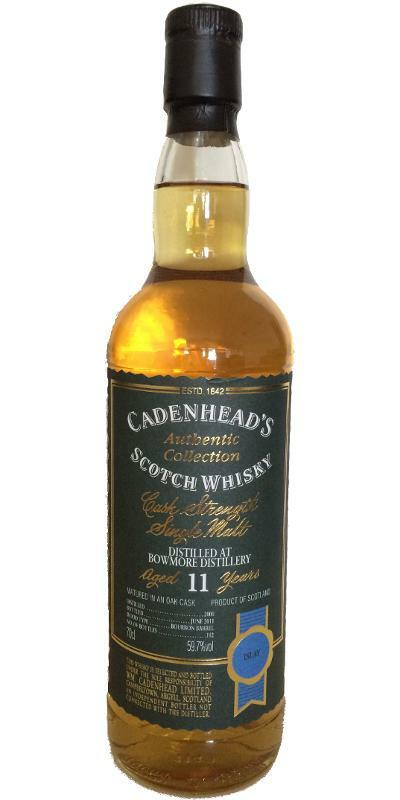 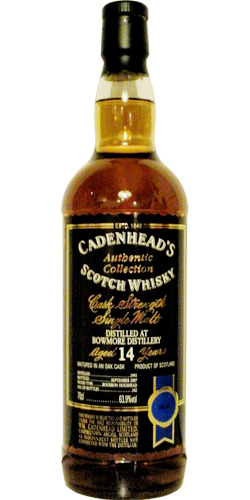 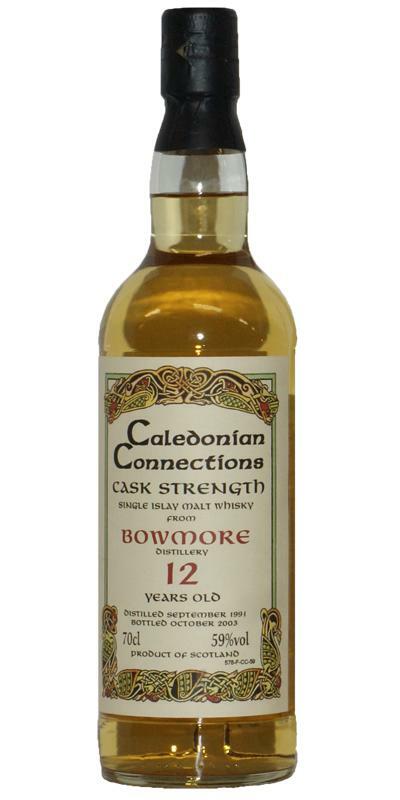 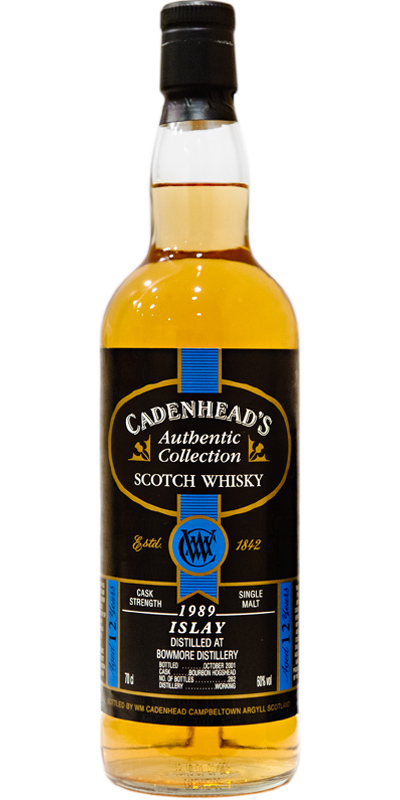 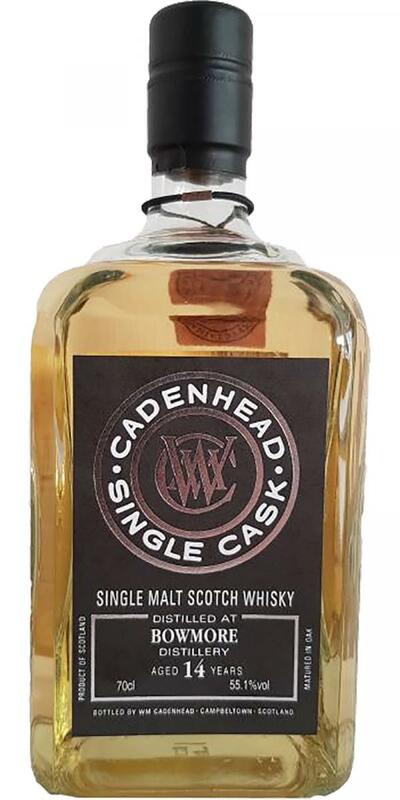 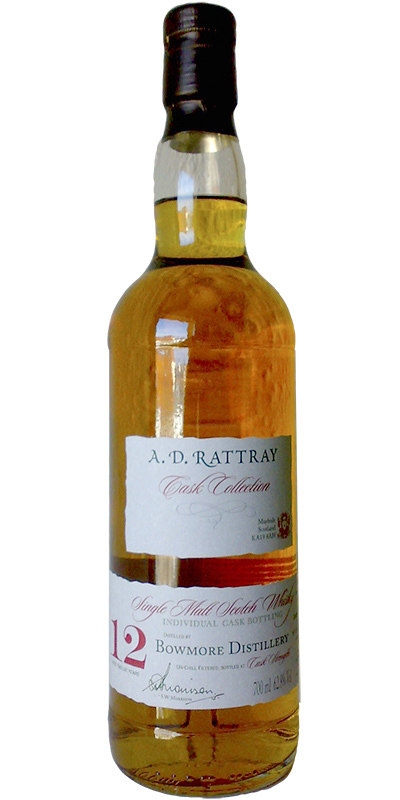 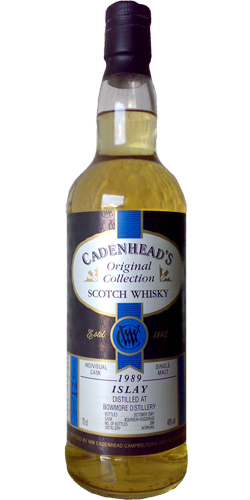 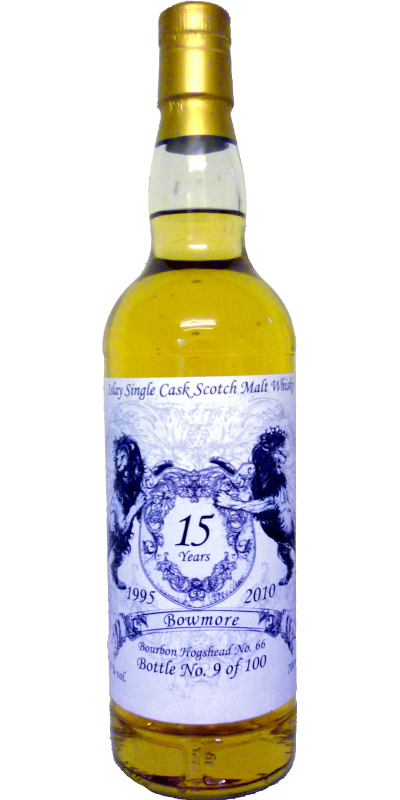 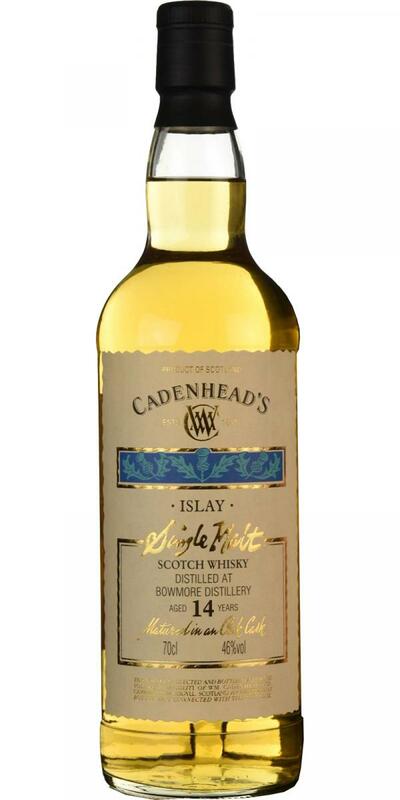 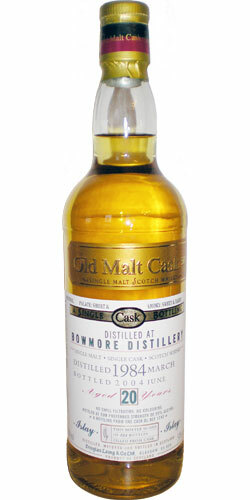 Bowmore 13-year-old CA Single Malt Scotch Whisky 13 56.4 % Vol. 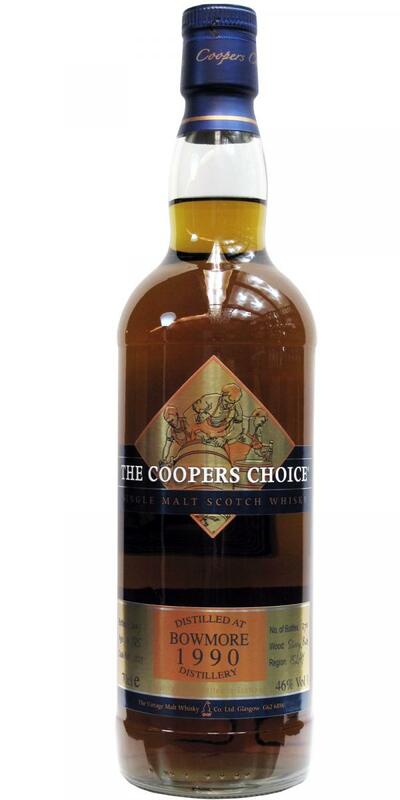 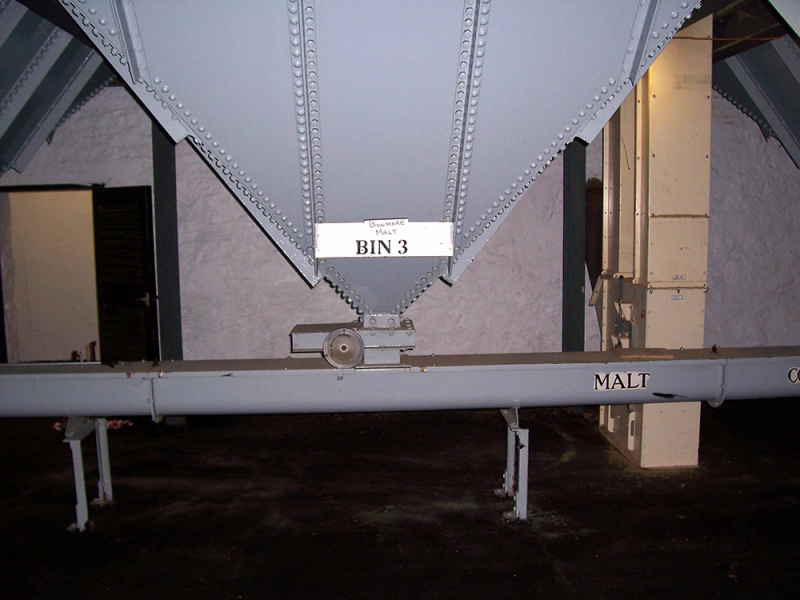 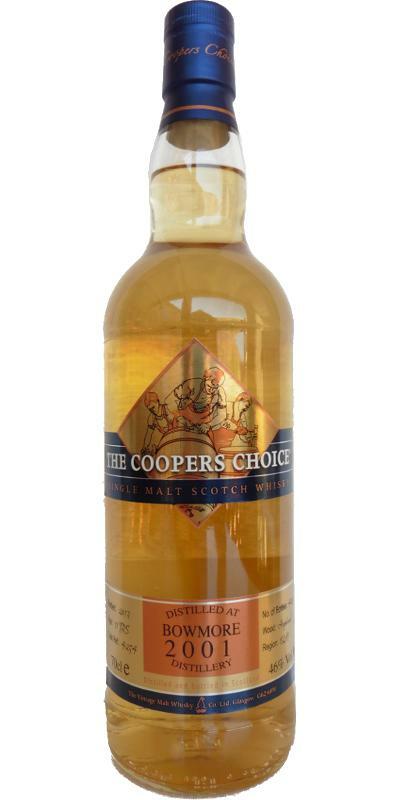 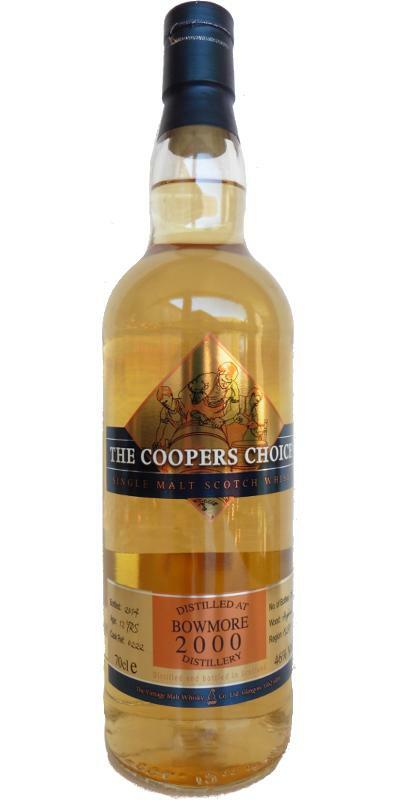 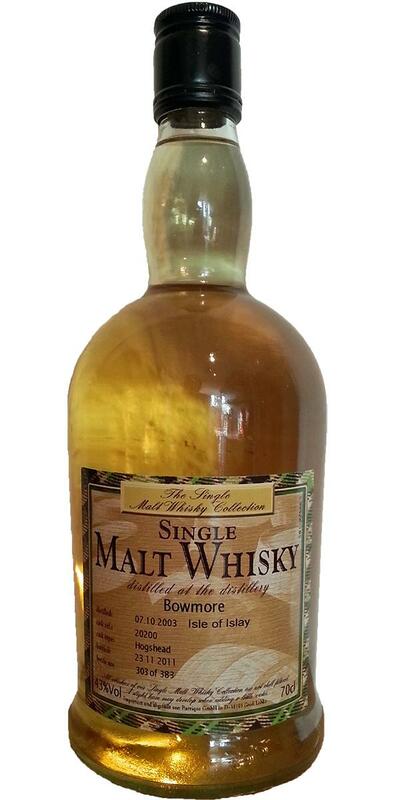 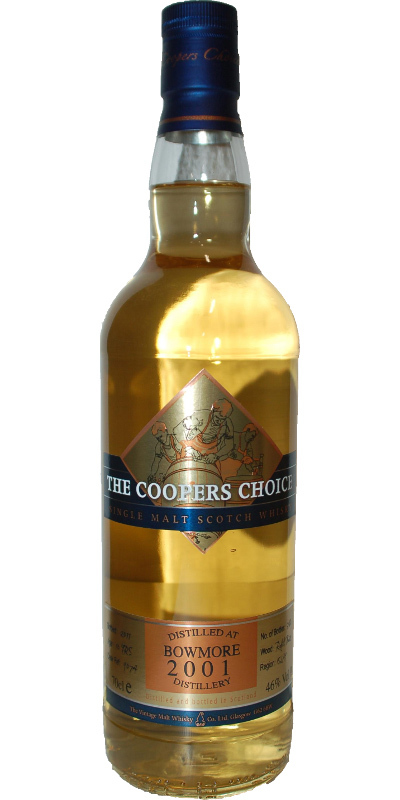 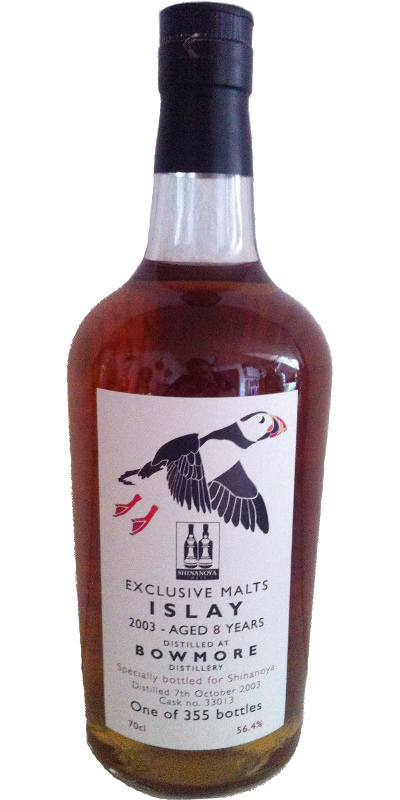 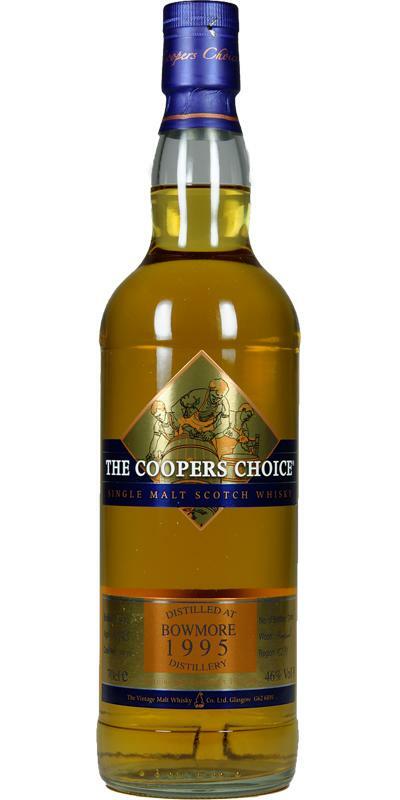 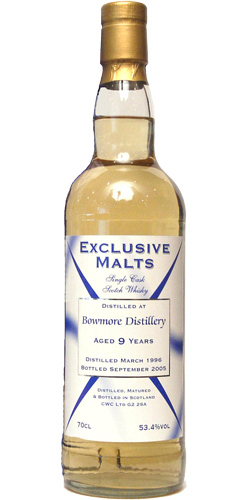 Bowmore 2002 CWC Exclusive Malts 12 56.6 % Vol. 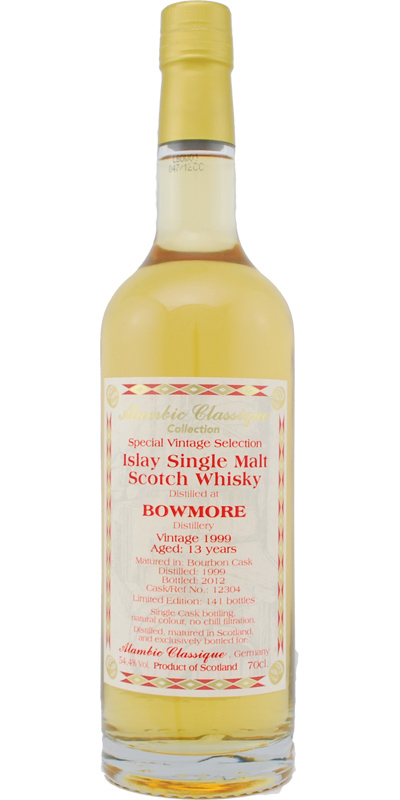 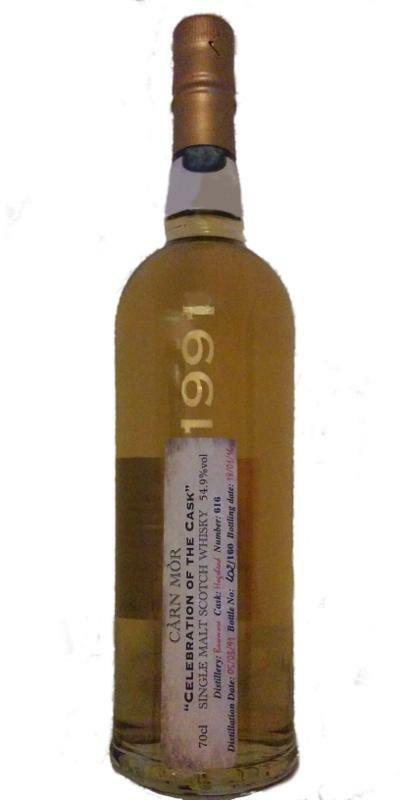 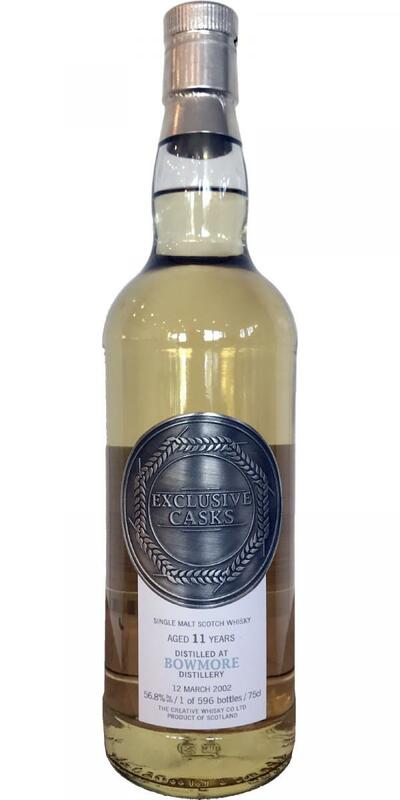 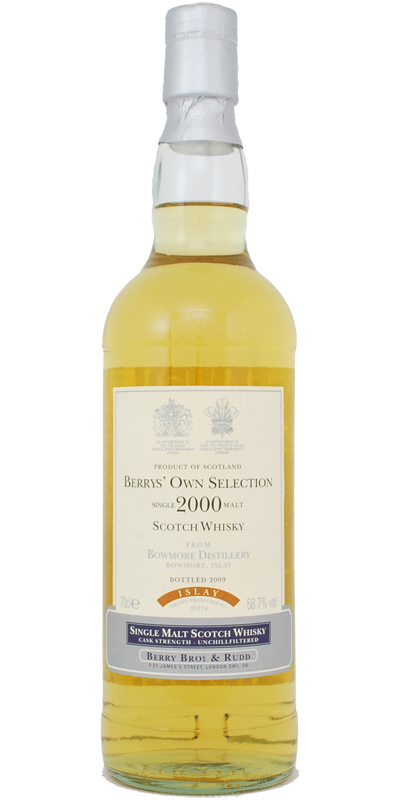 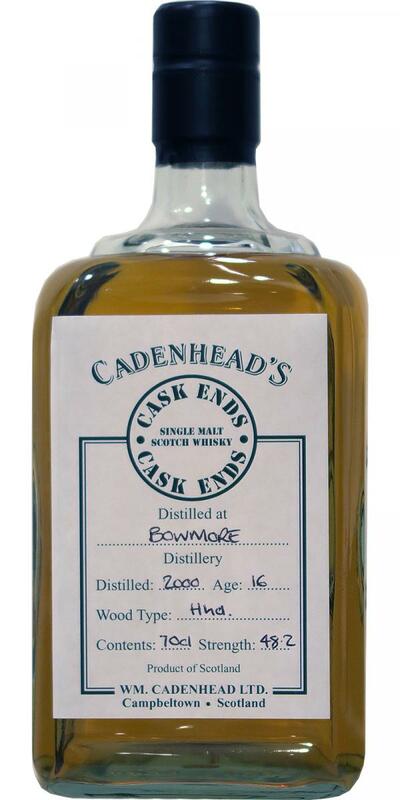 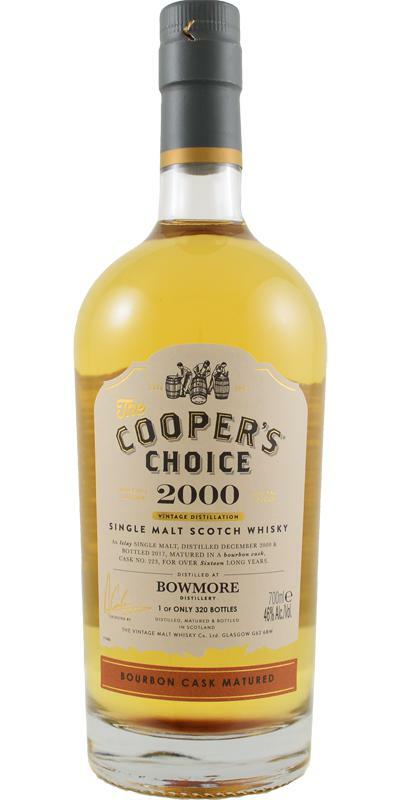 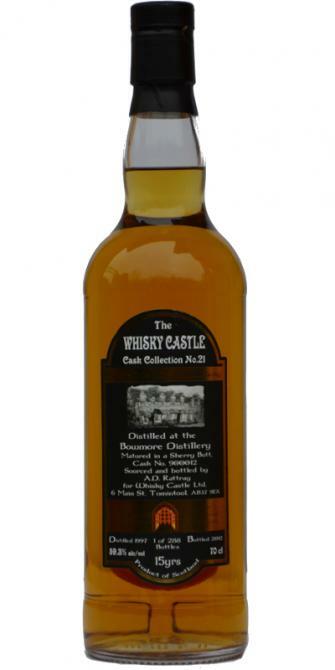 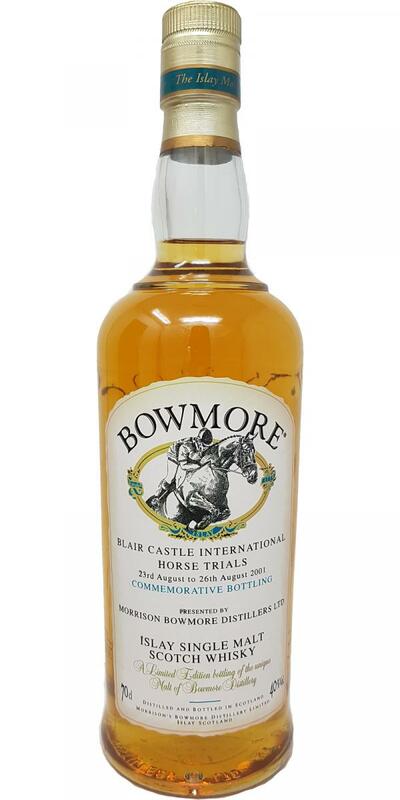 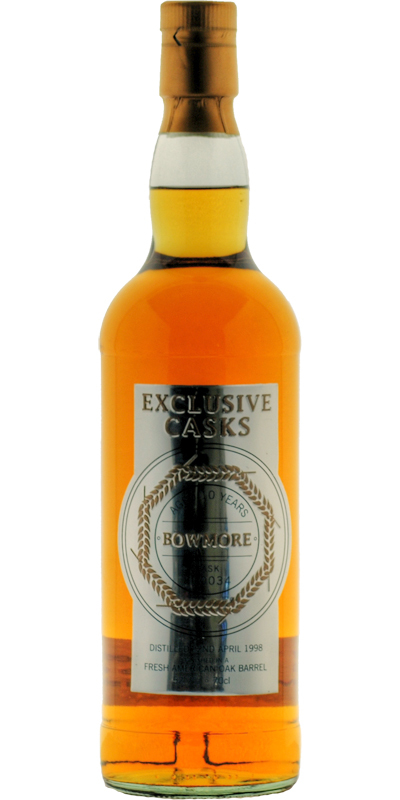 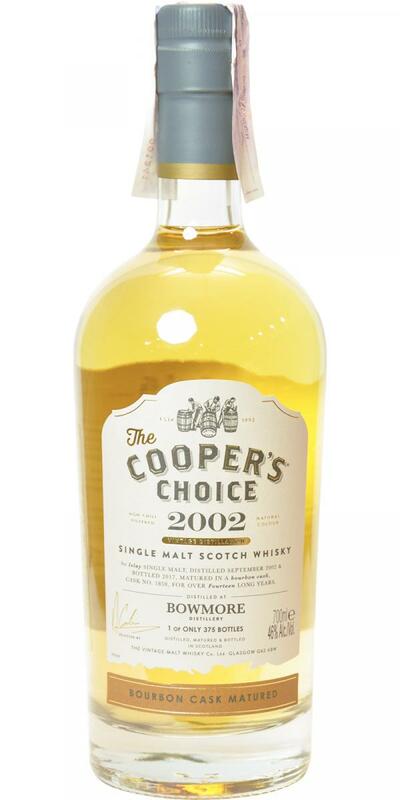 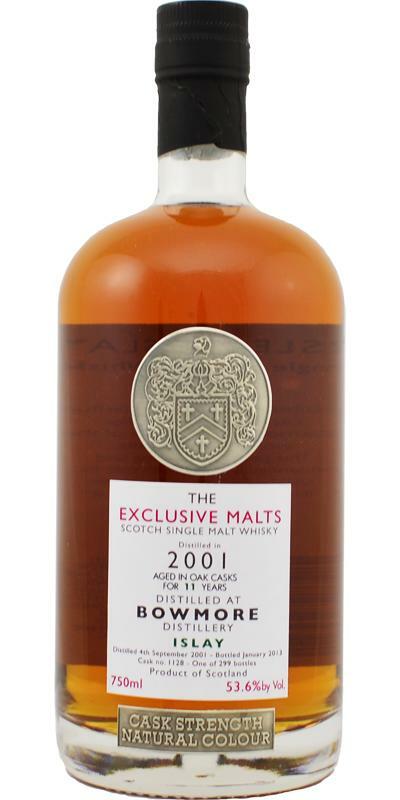 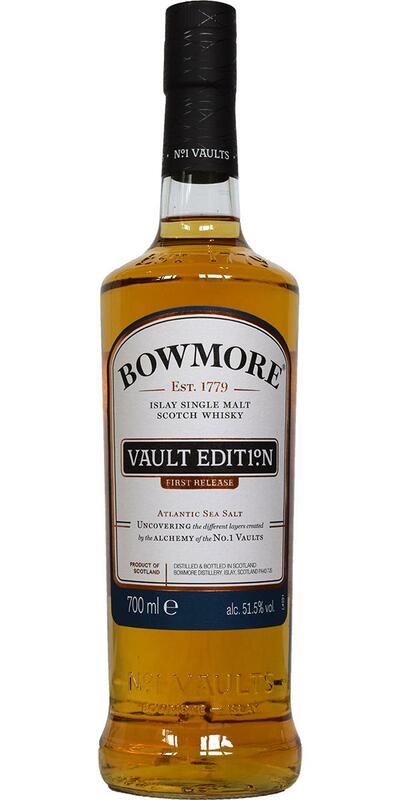 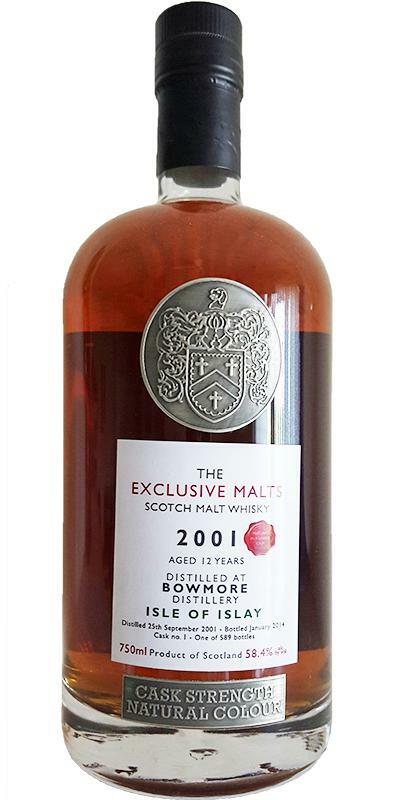 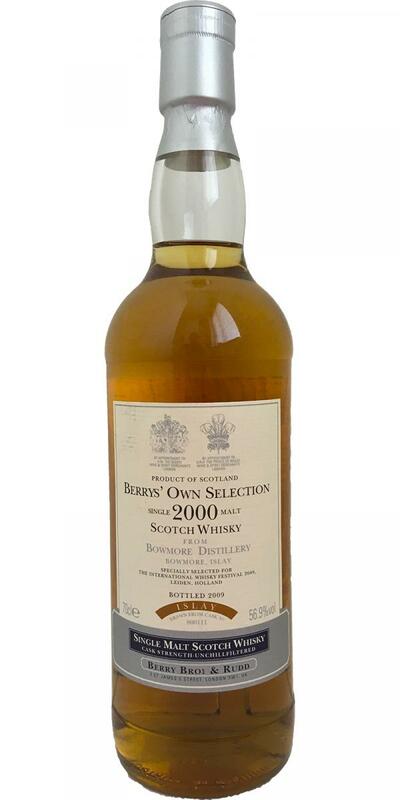 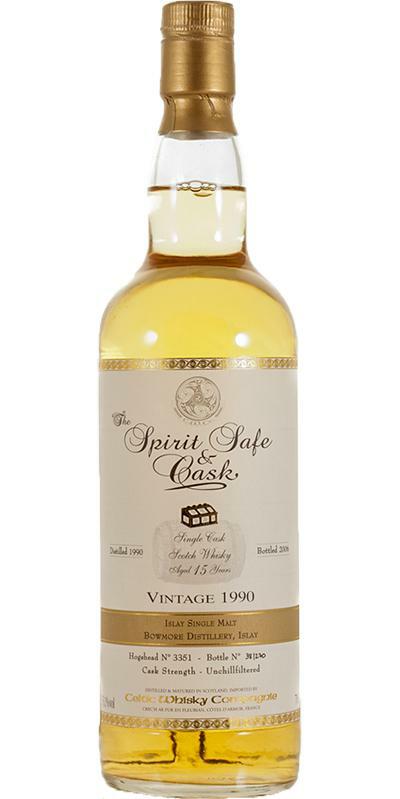 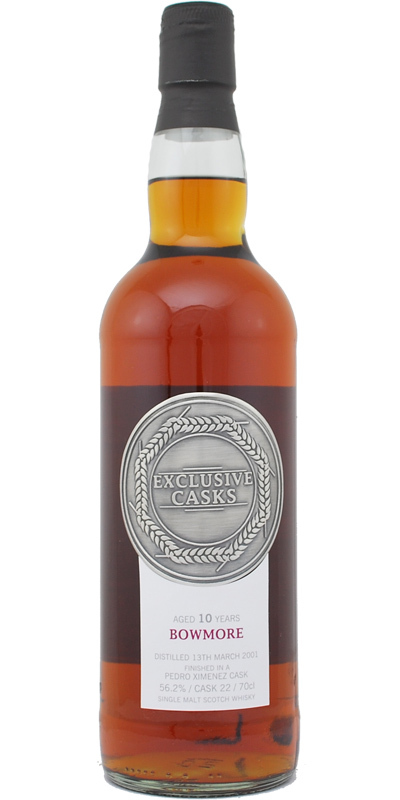 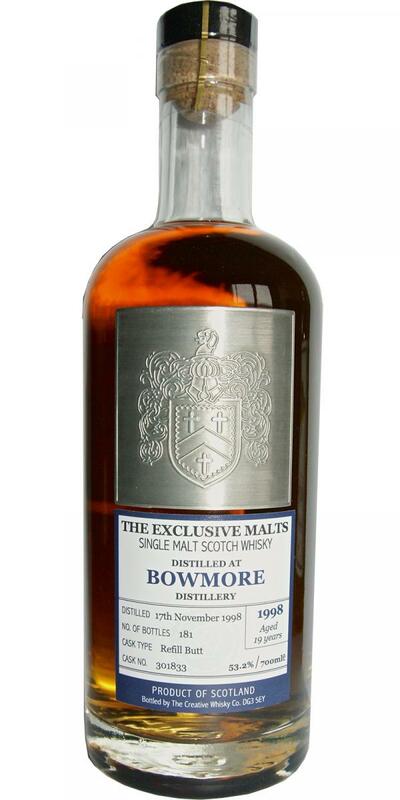 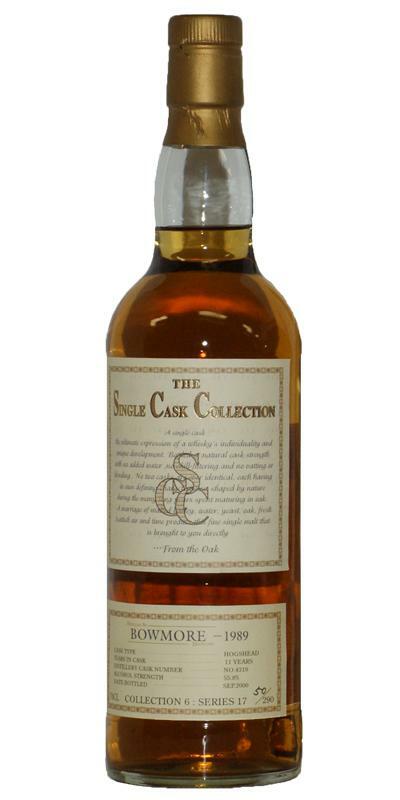 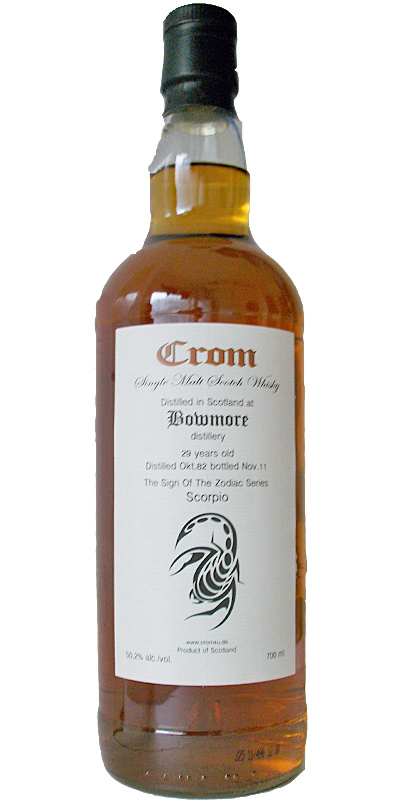 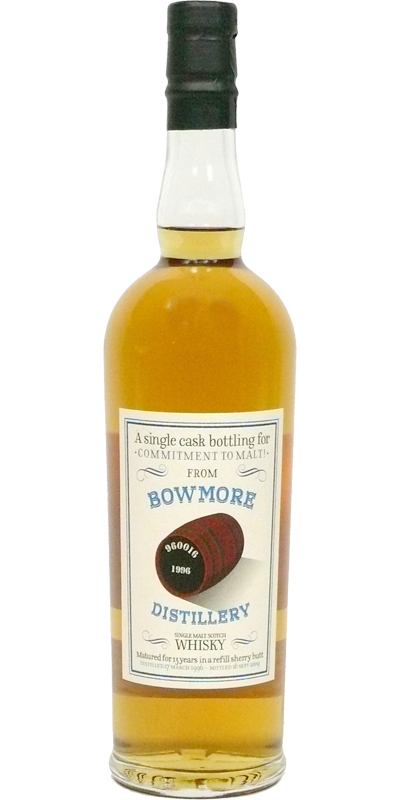 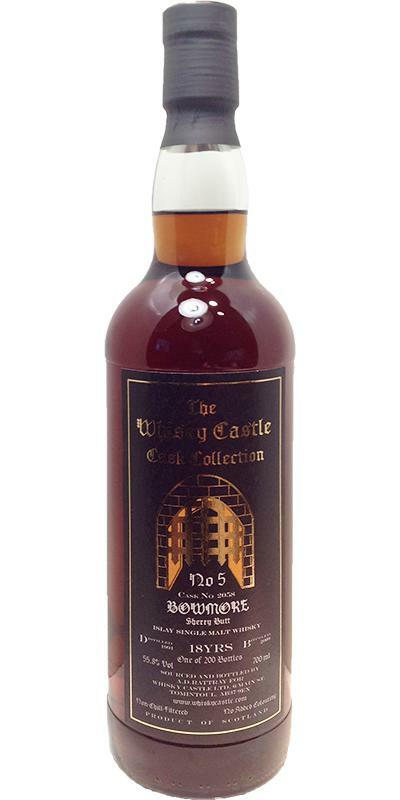 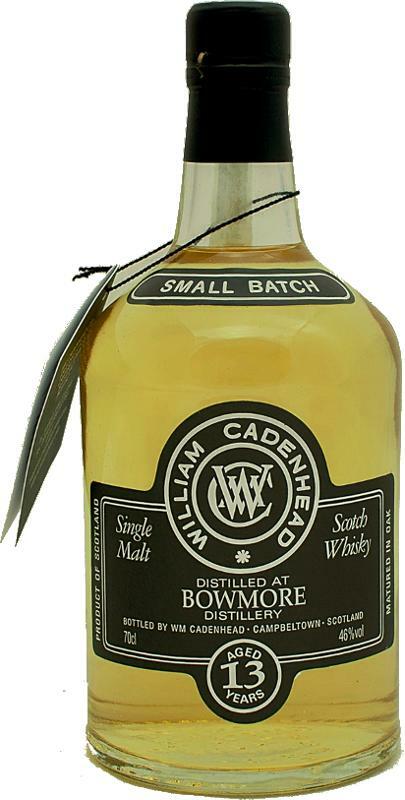 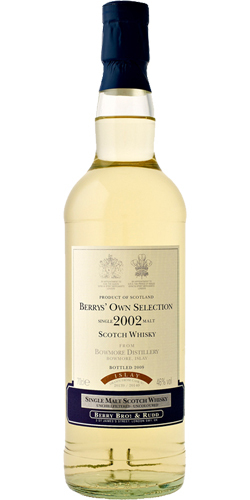 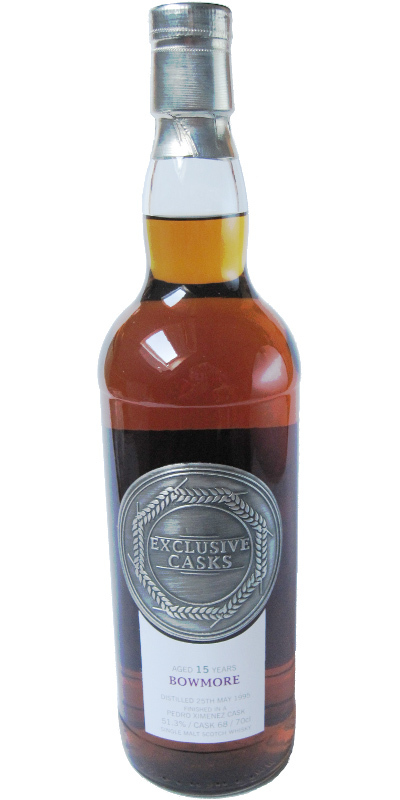 Bowmore 2002 CWC Exclusive Casks 11 56.8 % Vol. 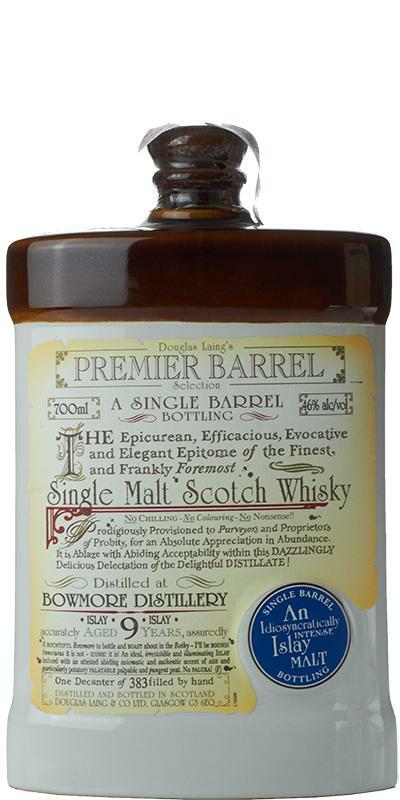 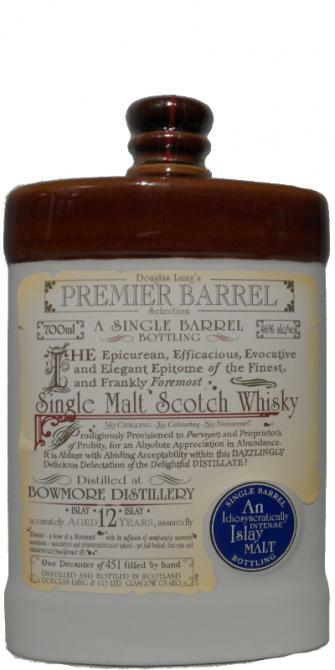 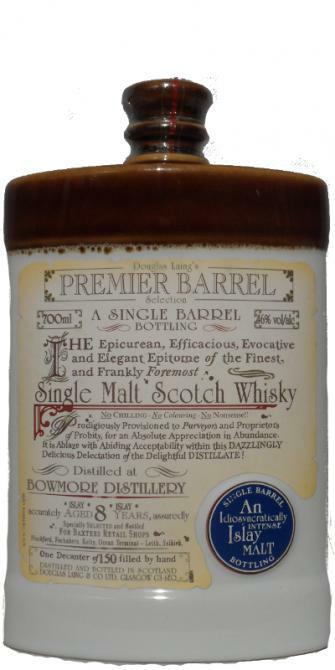 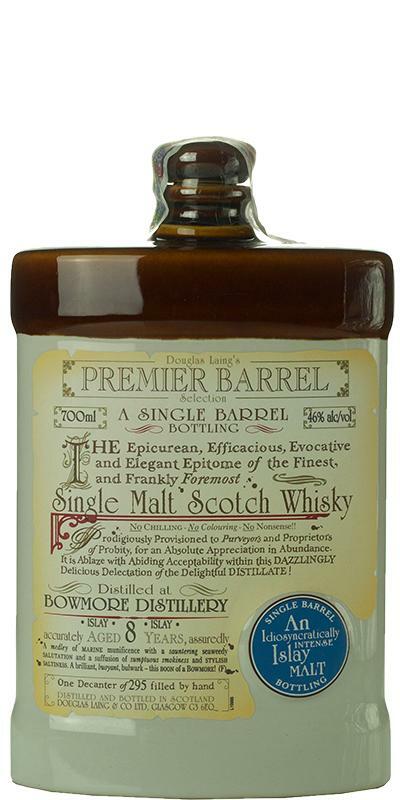 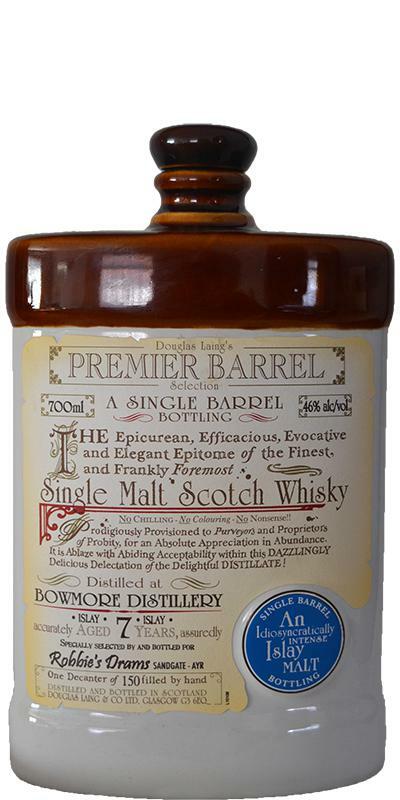 Bowmore 08-year-old DL Premier Barrel Selection 08 46.0 % Vol. 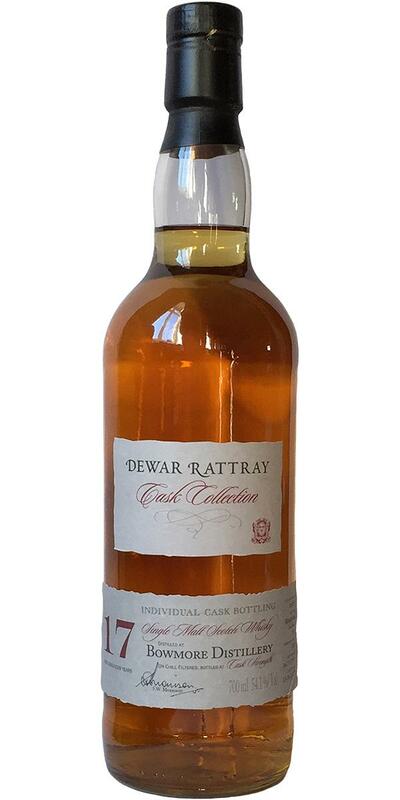 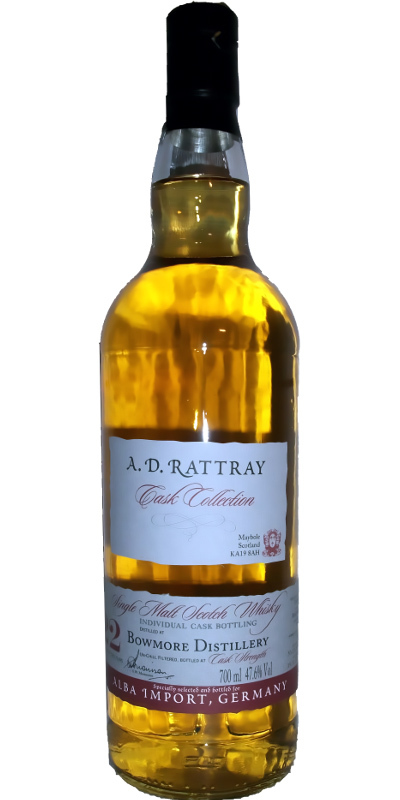 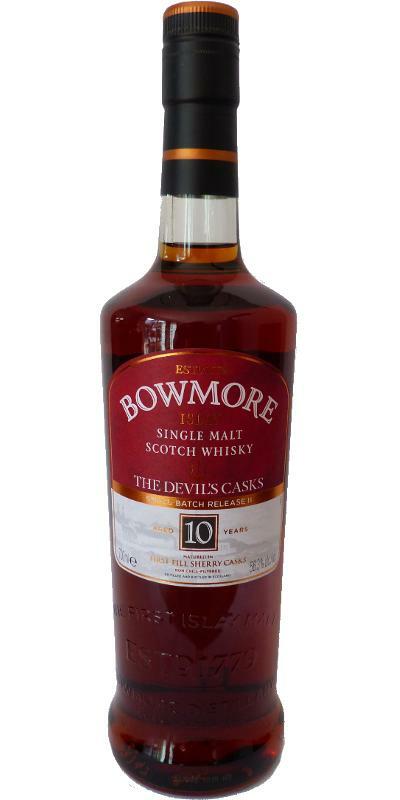 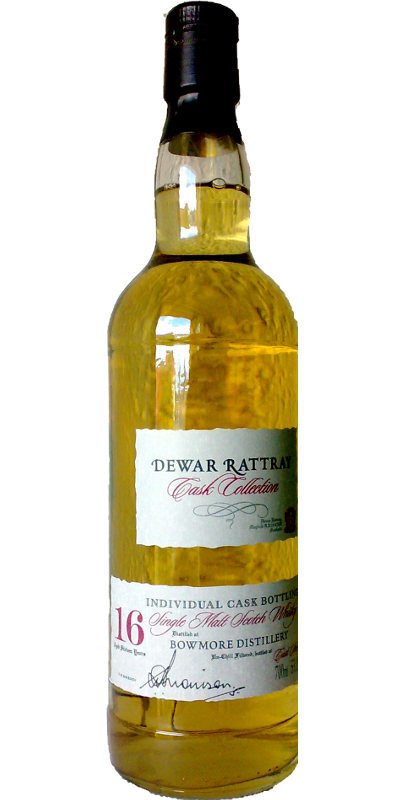 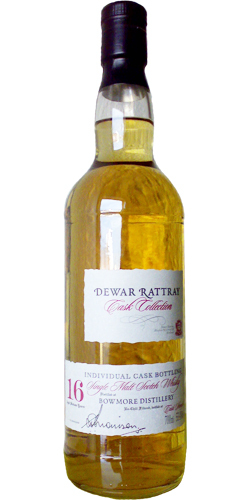 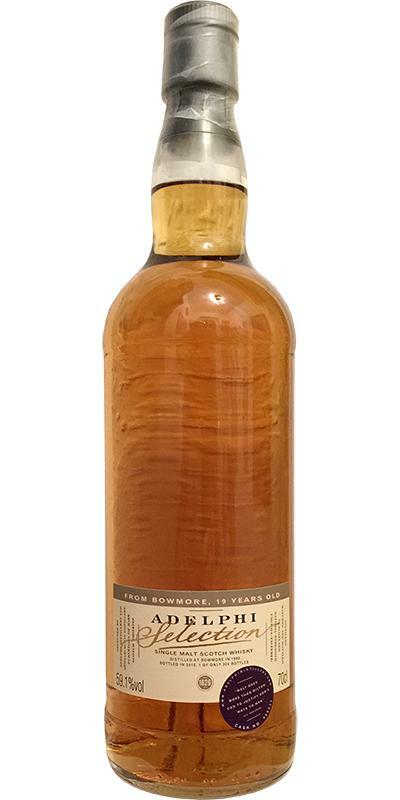 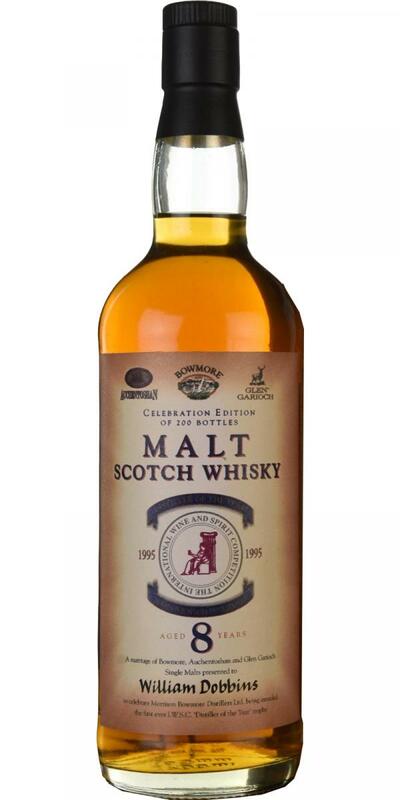 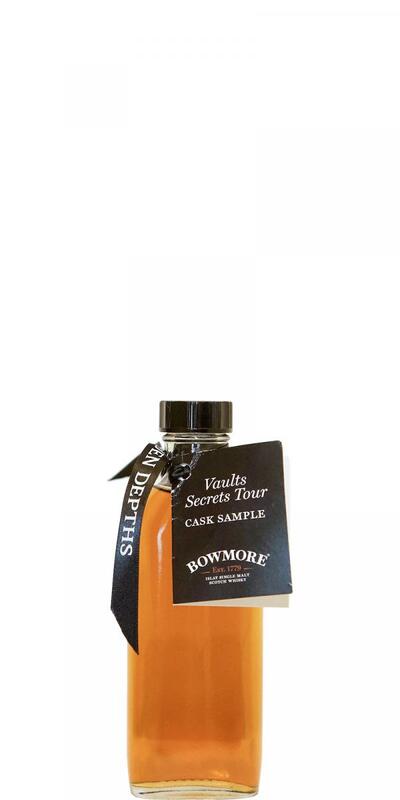 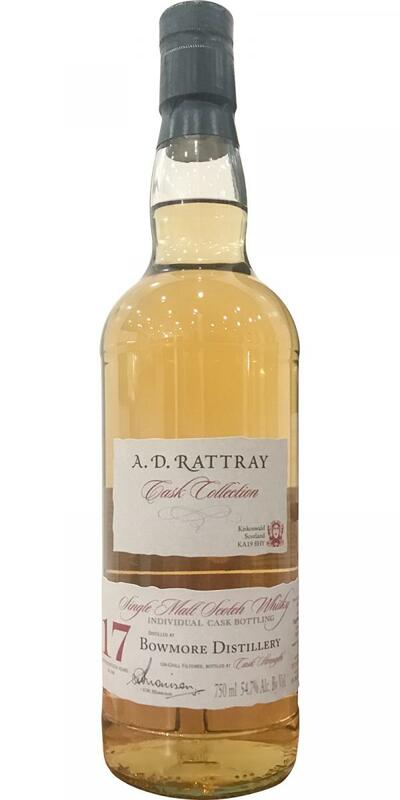 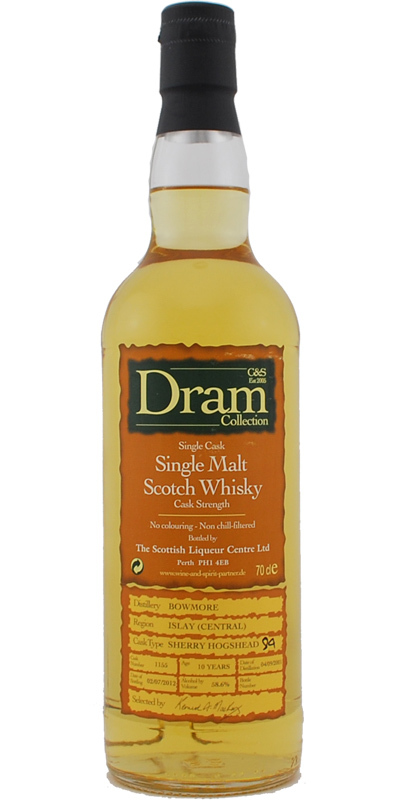 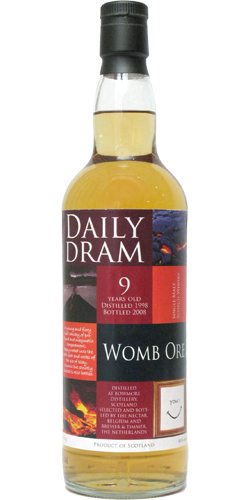 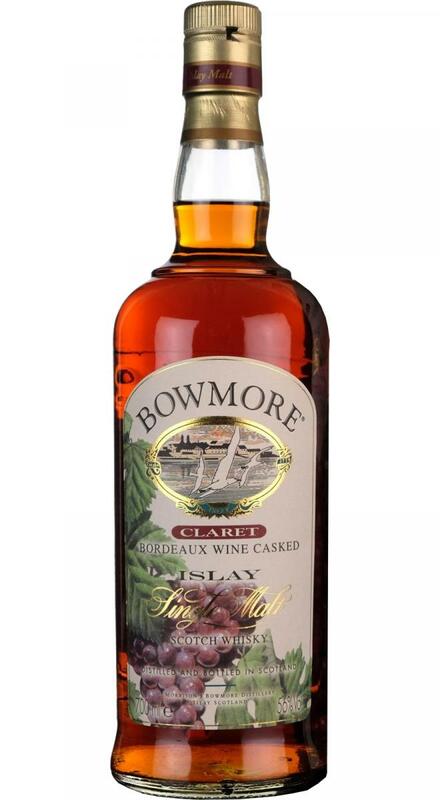 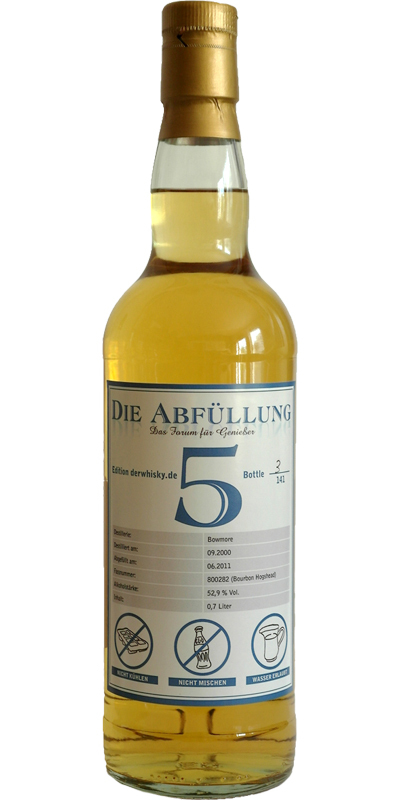 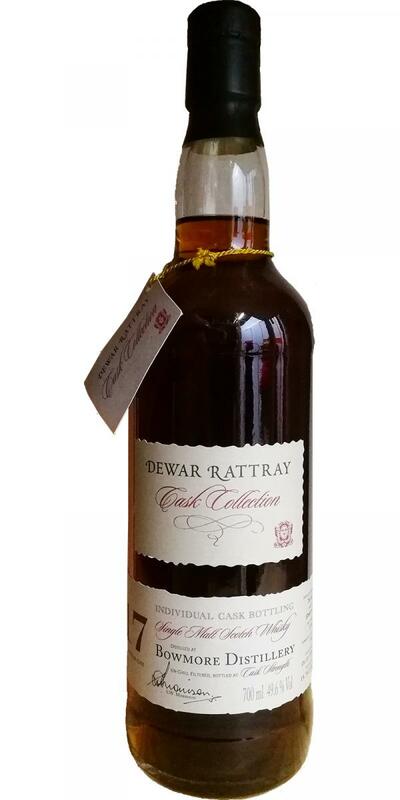 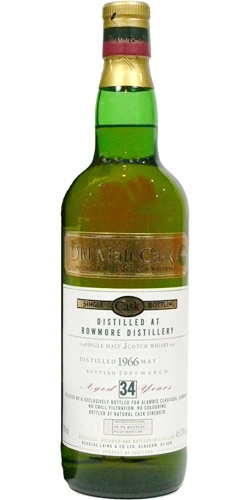 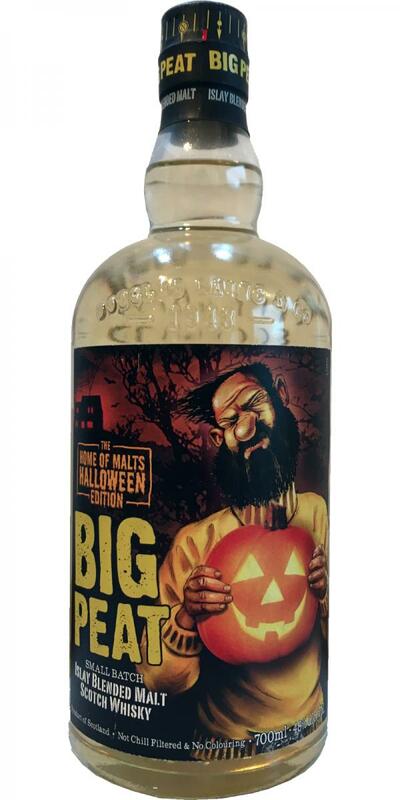 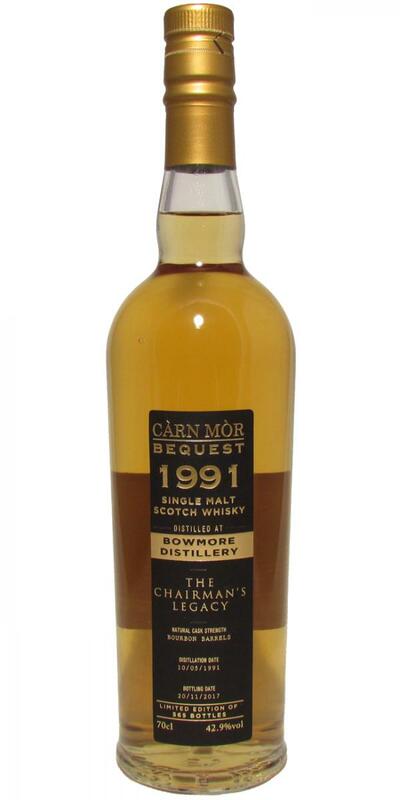 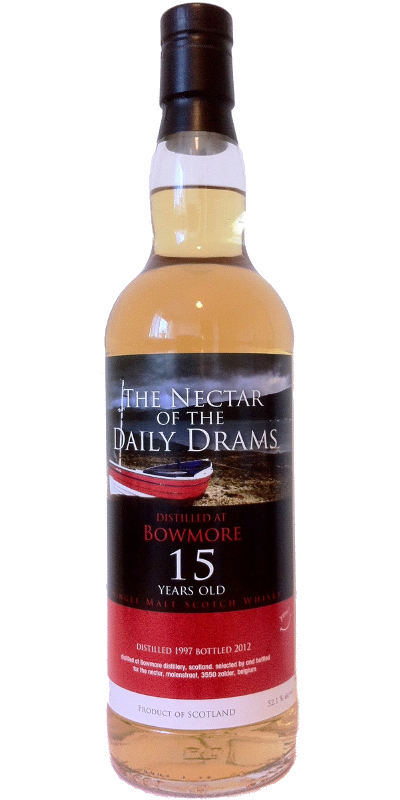 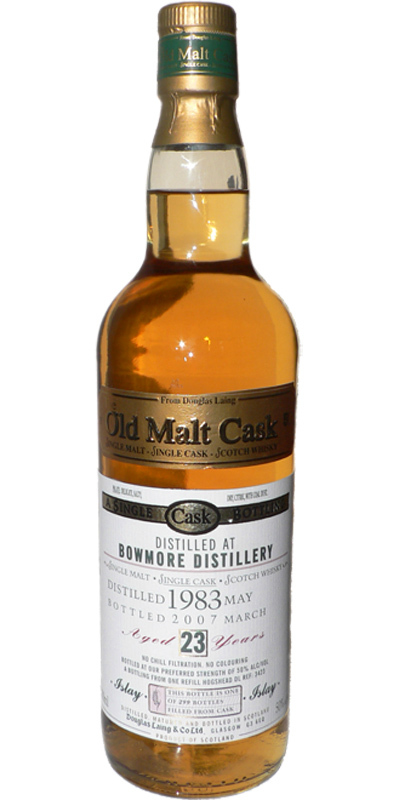 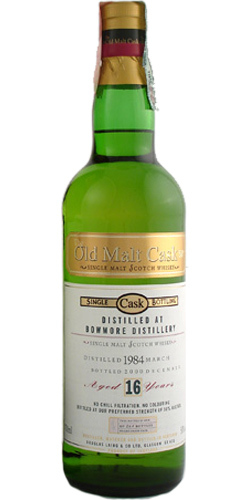 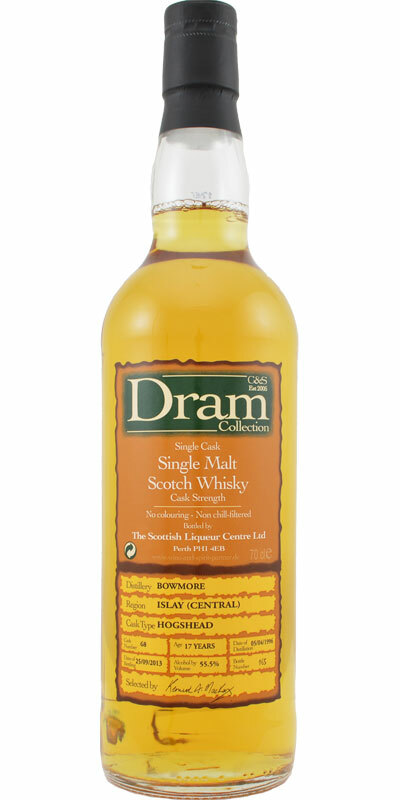 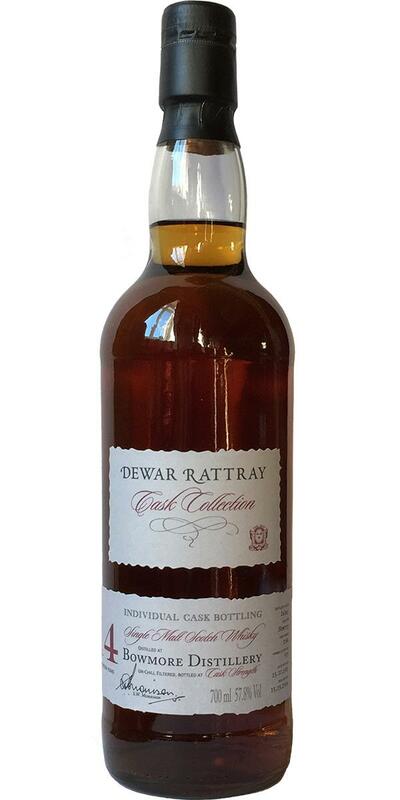 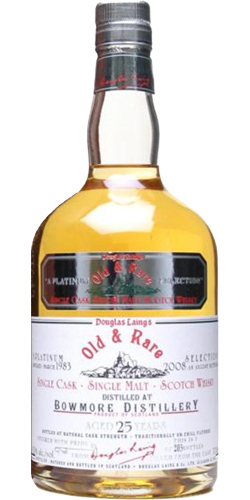 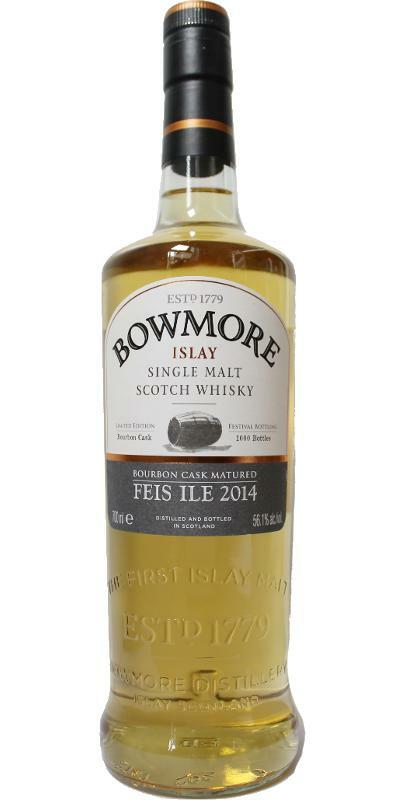 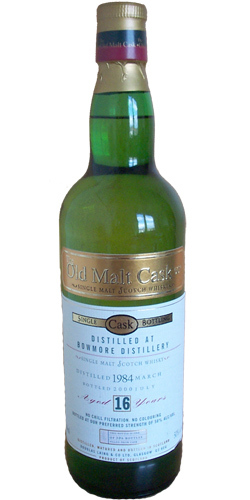 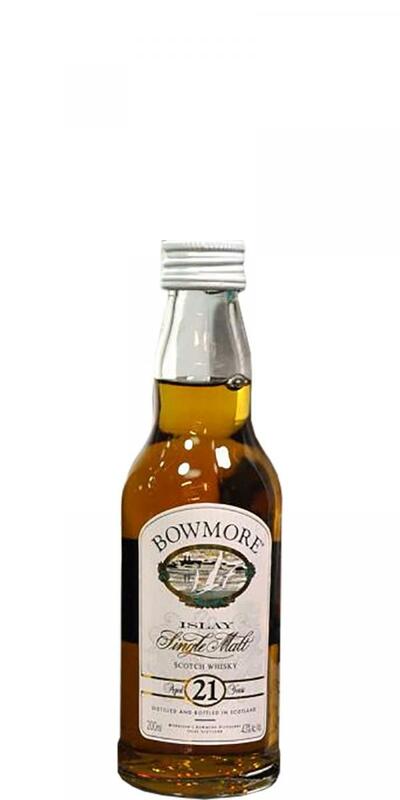 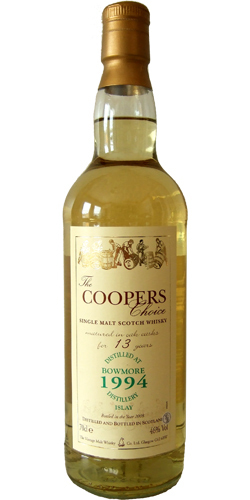 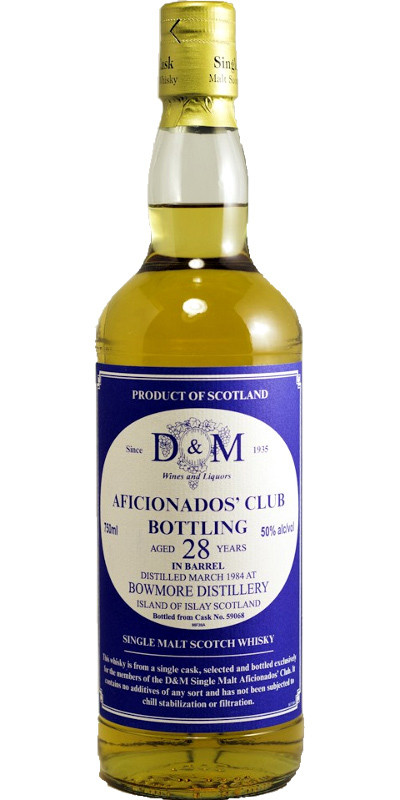 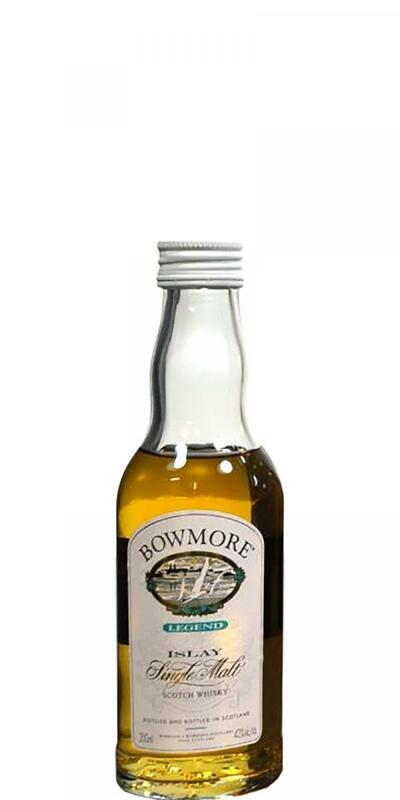 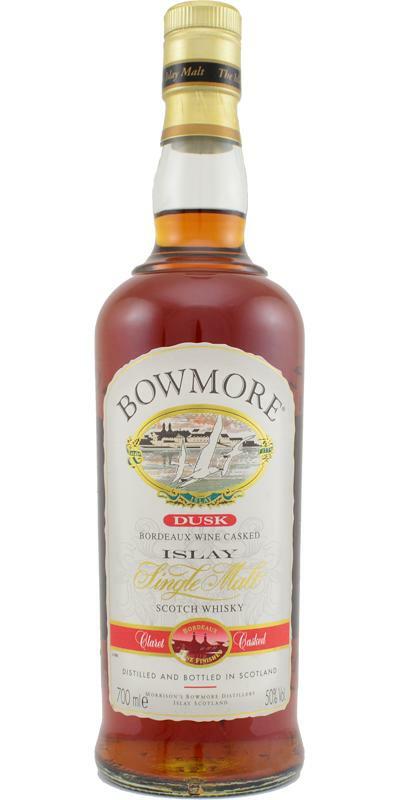 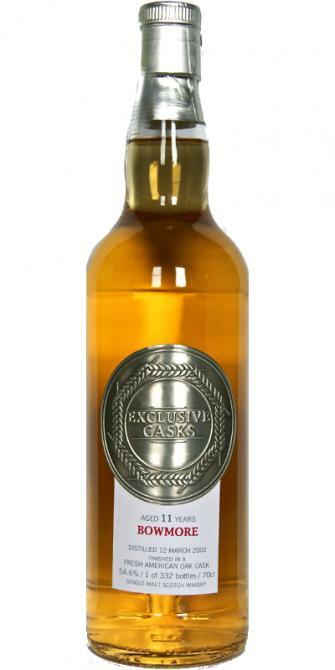 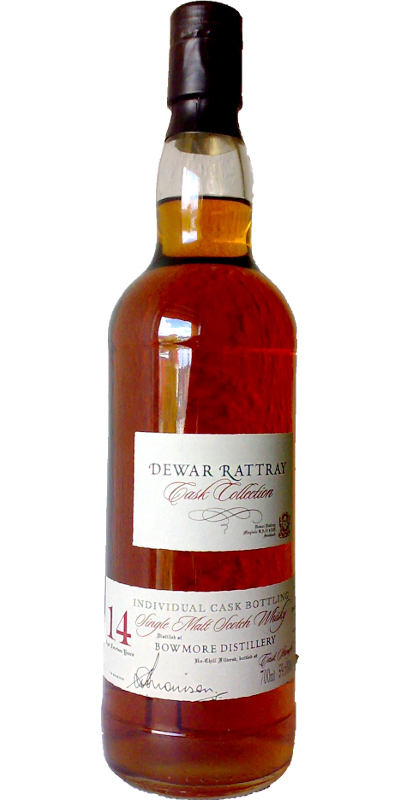 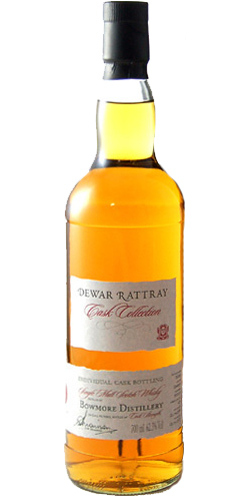 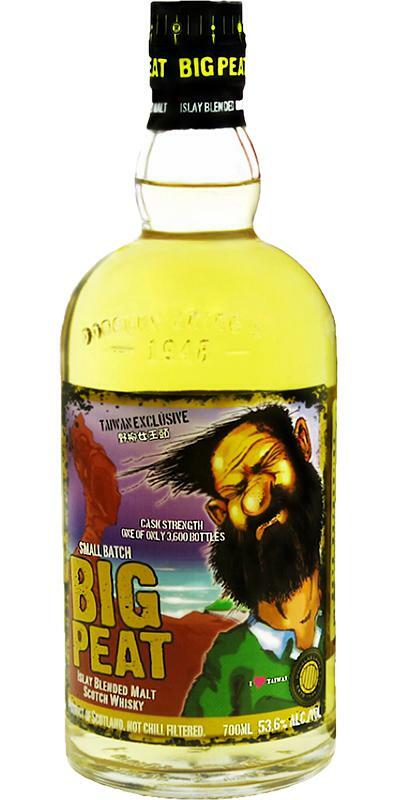 Bowmore 09-year-old DL Old Malt Cask 09 50.0 % Vol. 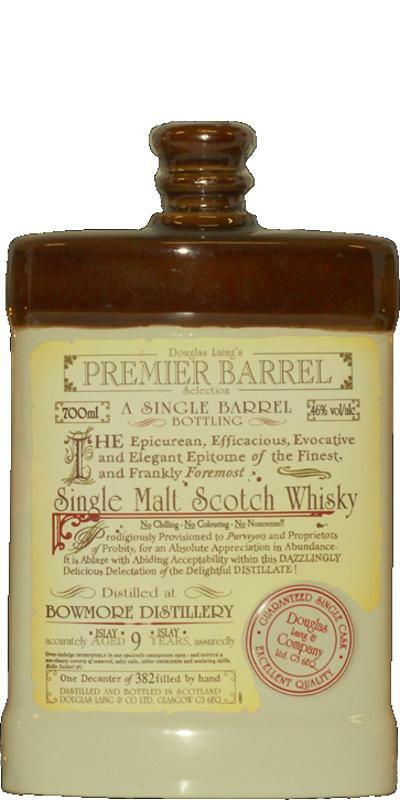 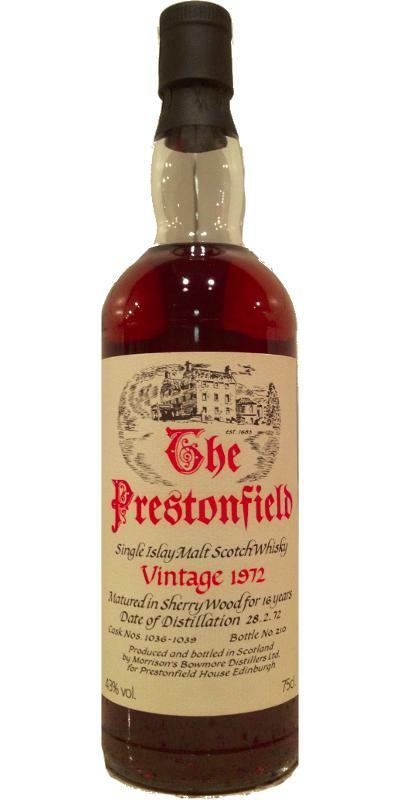 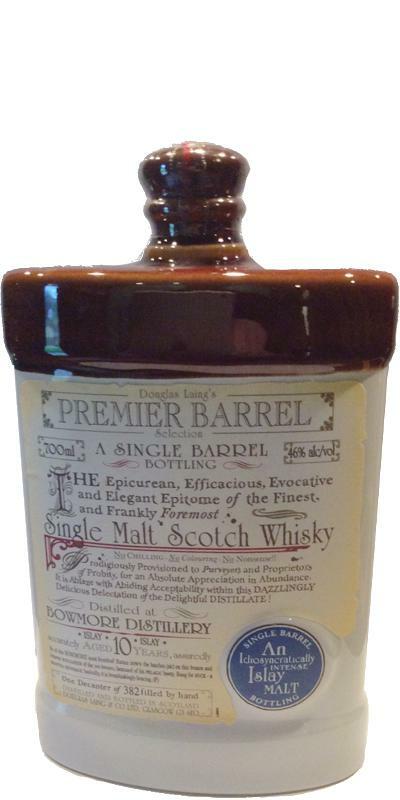 Bowmore 13-year-old DL Premier Barrel Selection 13 46.0 % Vol.